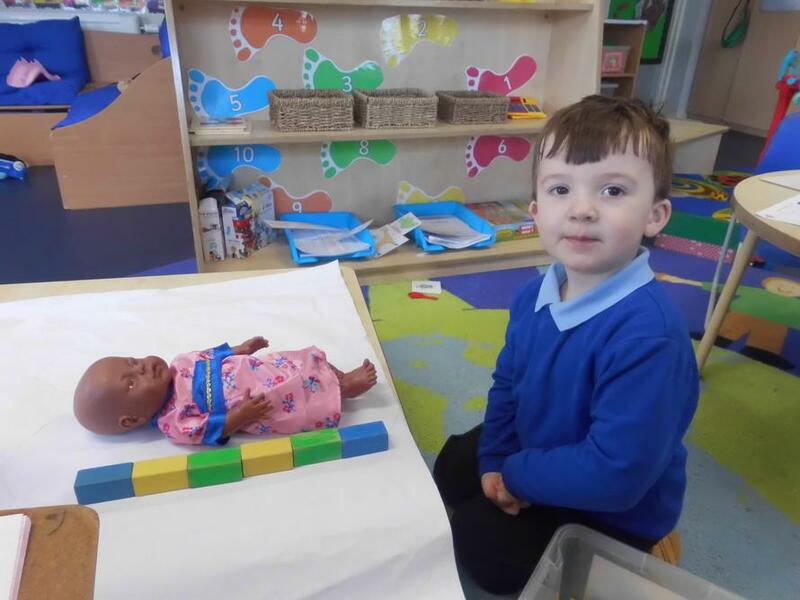 Welcome to the Nursery class page! 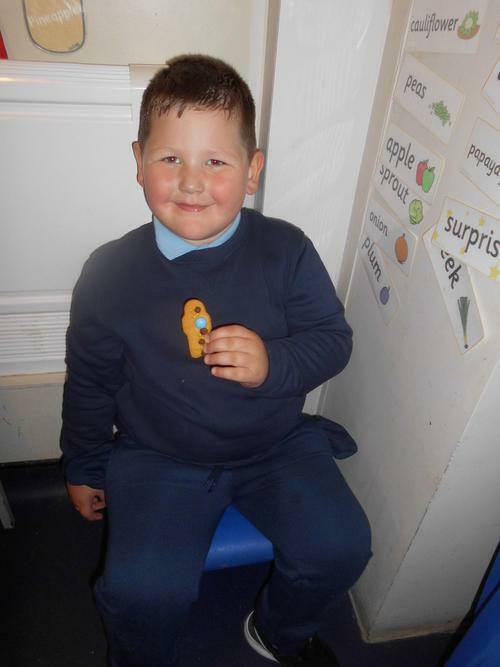 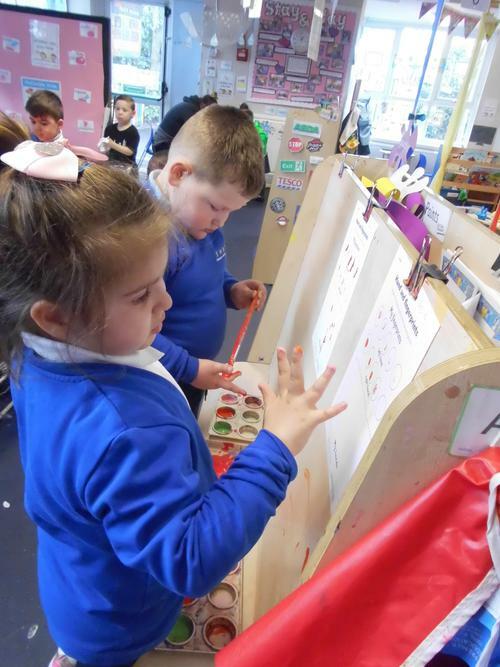 We are delighted that you have come to visit our class page where we hope to give you an insight into the fantastic range of learning that takes place each day. 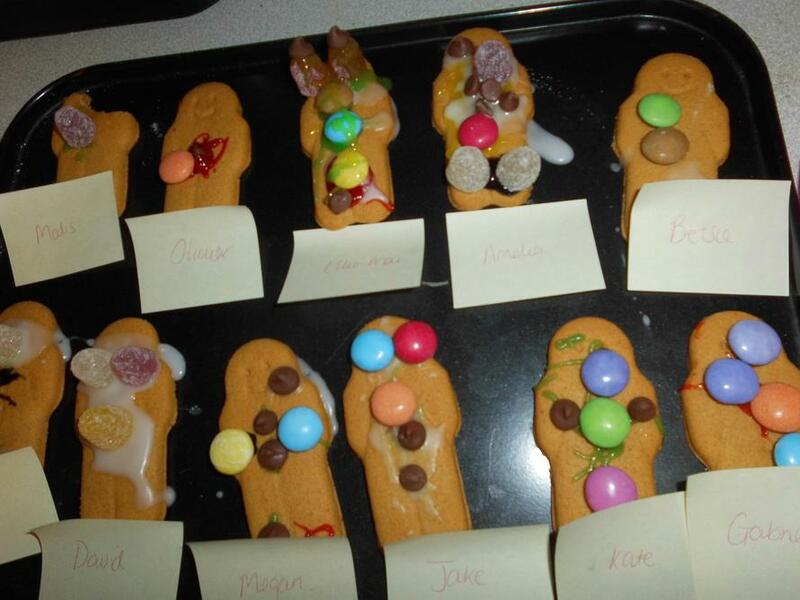 Our topic this half term is 'Marvellous me'.We will be discussing our families, homes and our likes and dislikes. 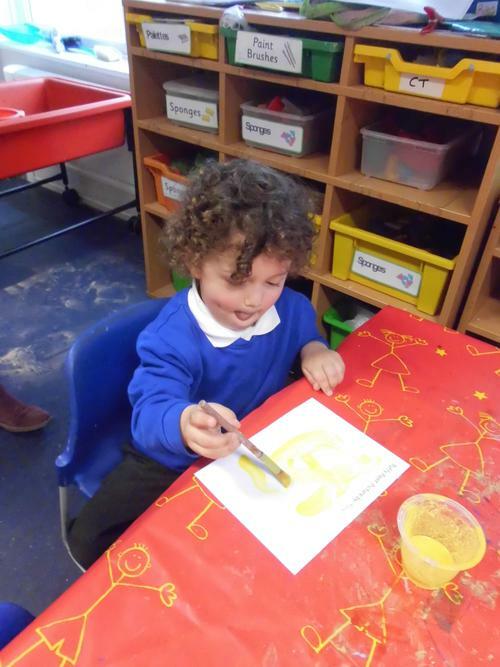 In order for us to get to know the children a little better they have been given an ‘All about me’ activity sheet to complete with you on which they can draw pictures, cut or stick photographs of family and then bring back into school to show and use for our learning. 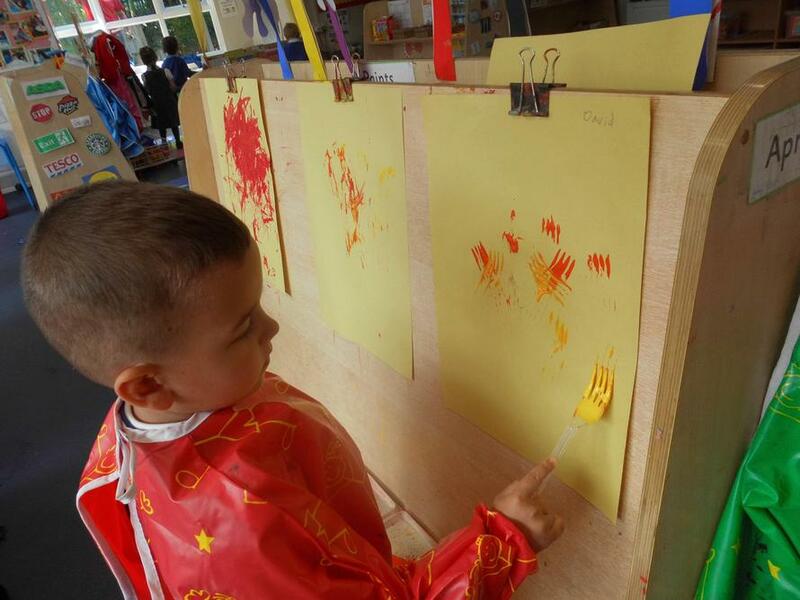 Please hand completed sheets to a member of the nursery staff when finished. 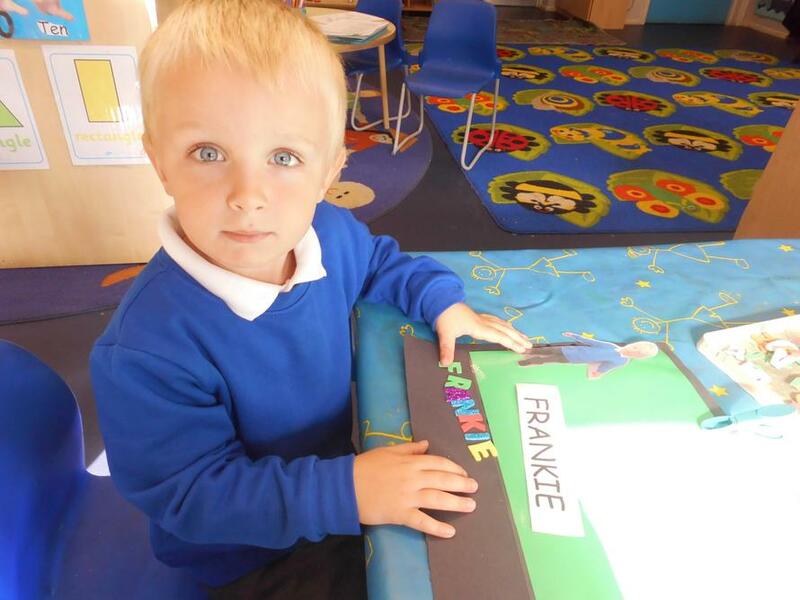 Please ensure that your child's belongings are labelled with their name. 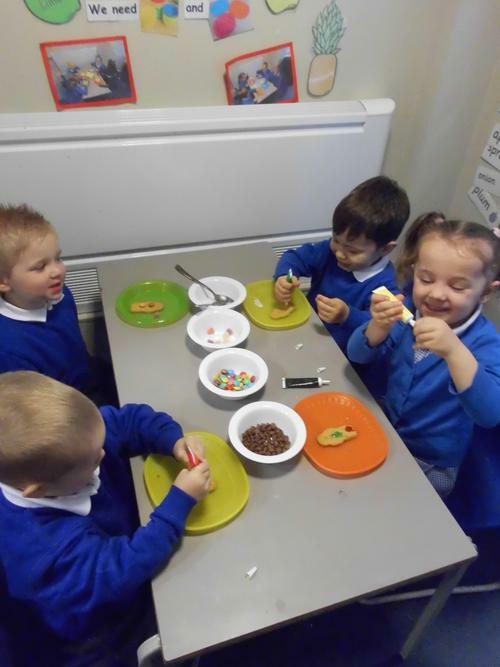 Snack is available through the session and is usually fruit or vegetables but on occasion we do have yoghurts, crackers or biscuits. 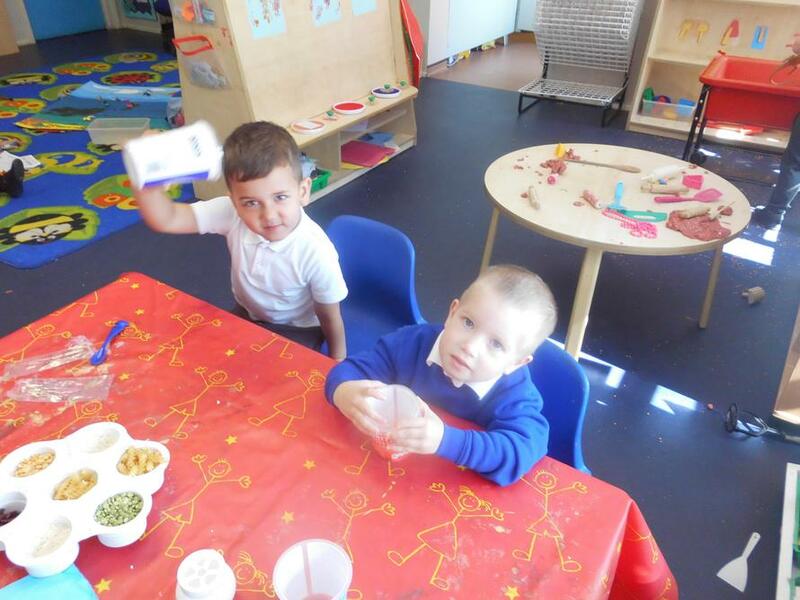 milk and water are available to drink but if your child wishes to bring their own water bottle with water/fruit water in (no juice), this is fine. 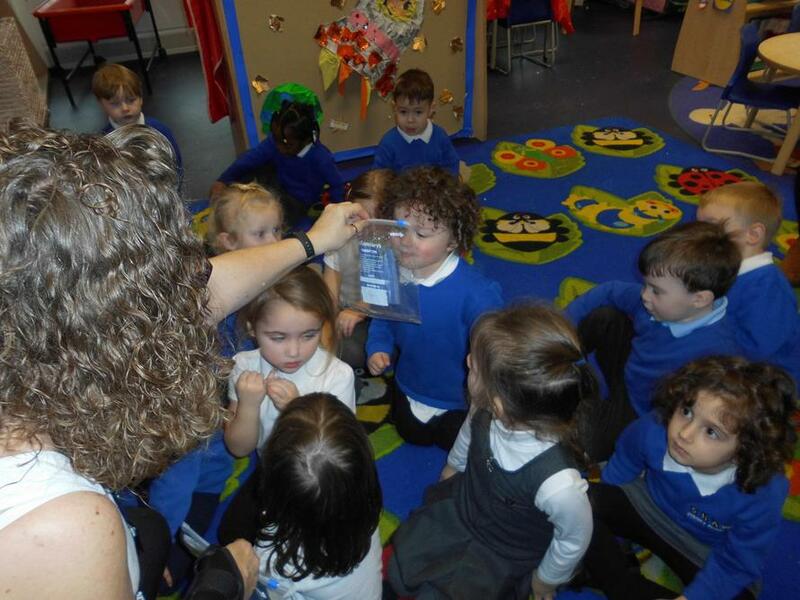 PLEASE LABEL YOUR CHILDS WATER BOTTLE WIT HTHEIR NAME for hygiene reasons and to prevent them getting lost. 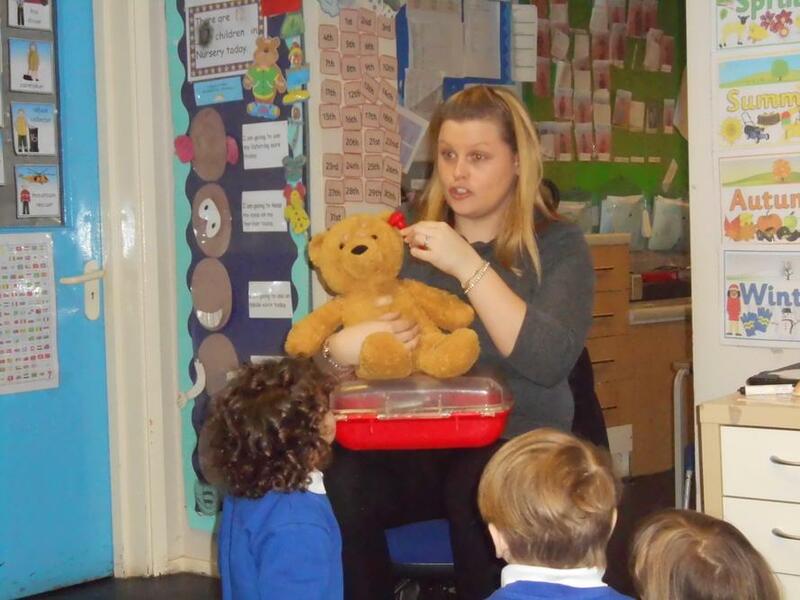 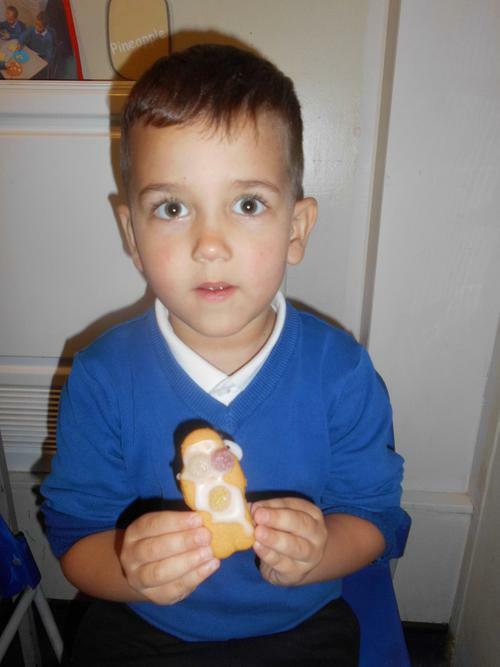 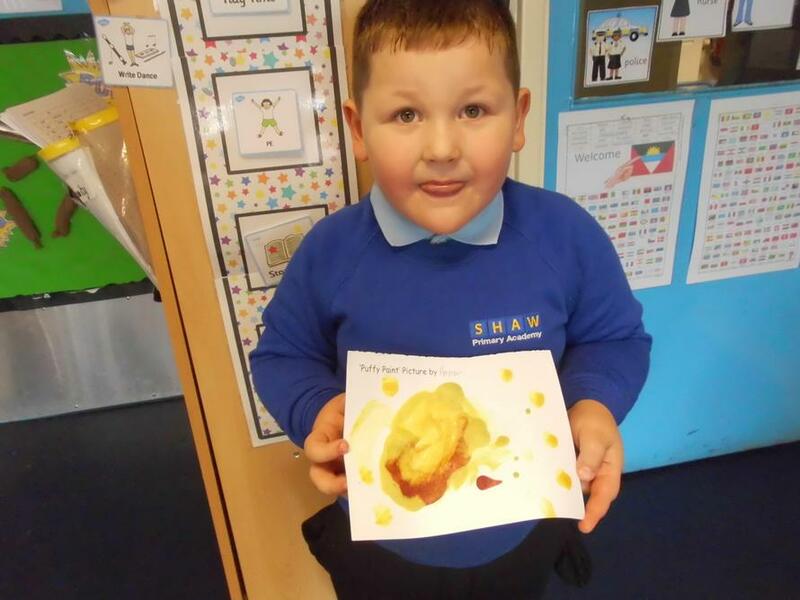 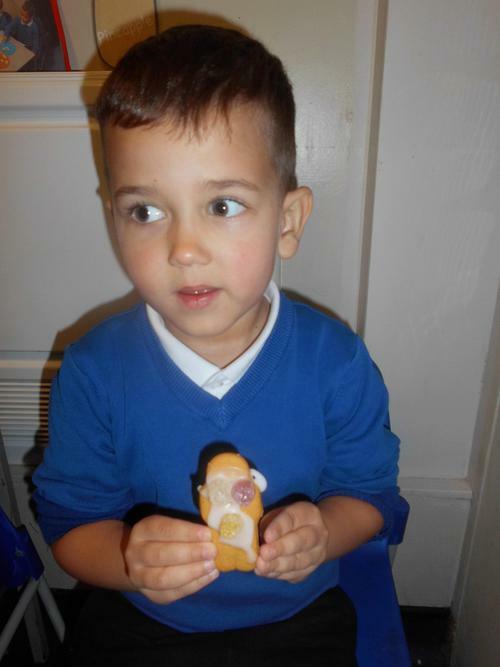 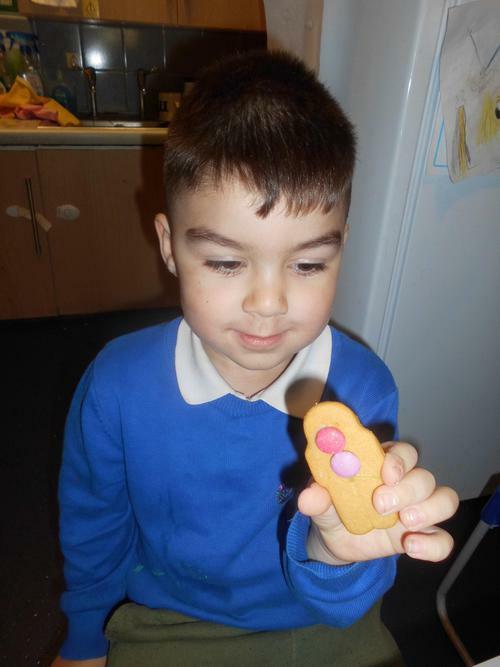 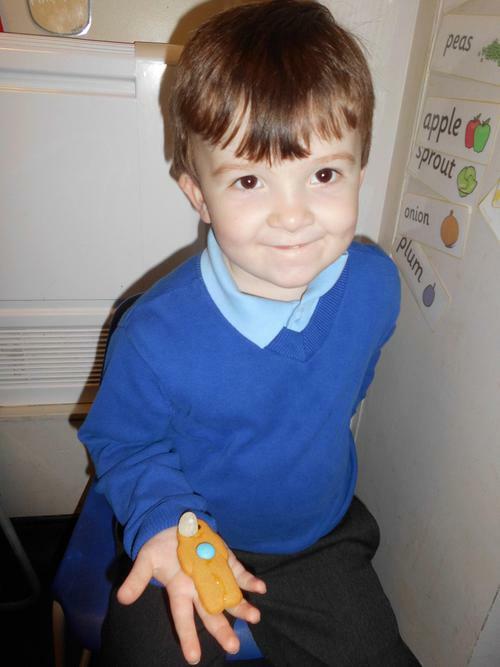 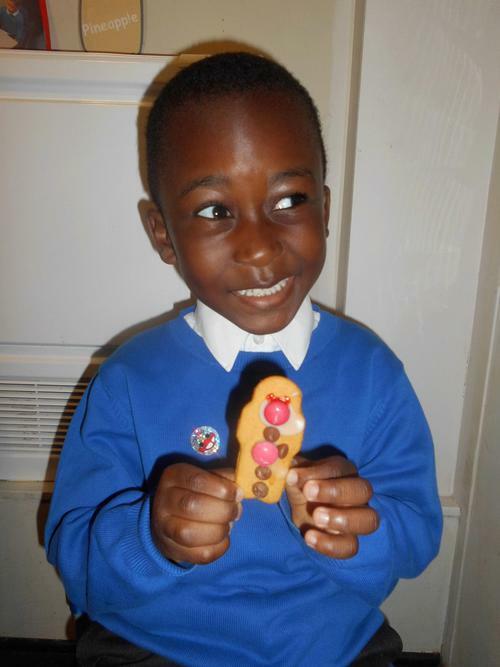 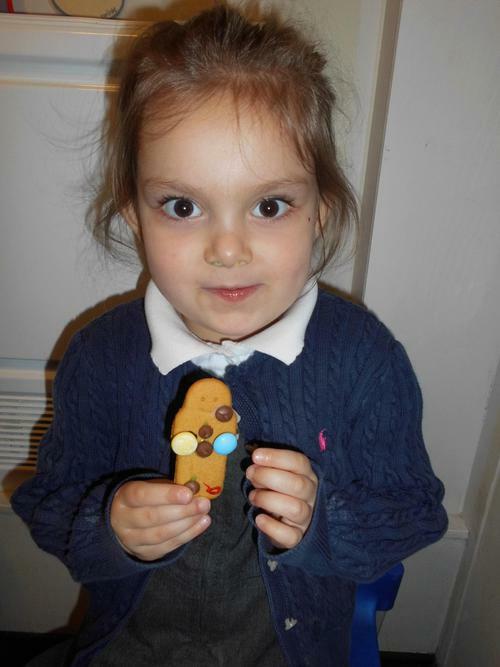 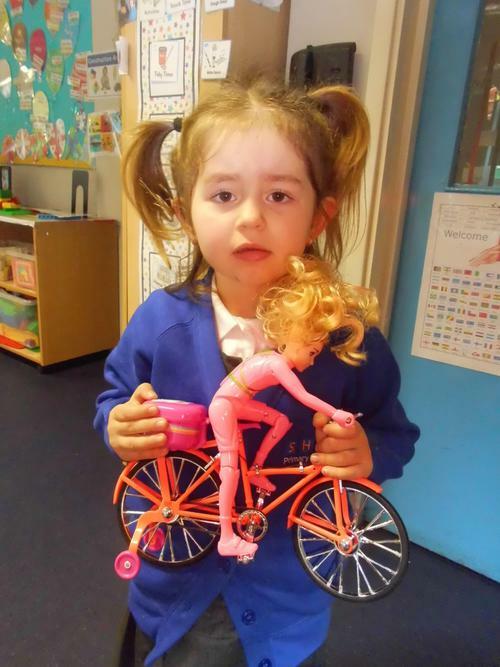 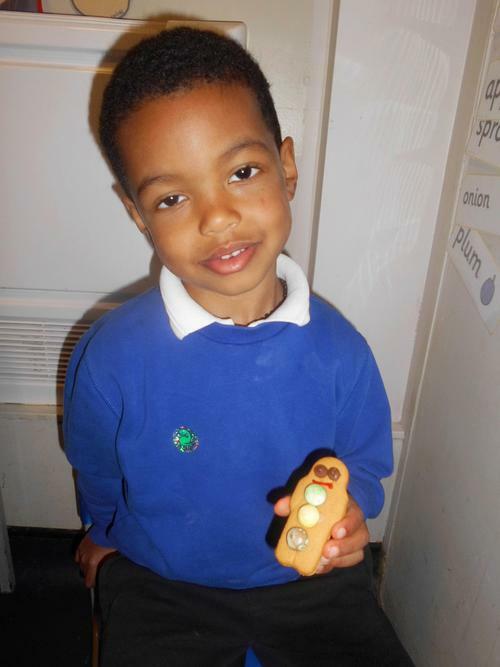 Show and tell is an opportunity for the children to bring something of their choice into school to talk about. 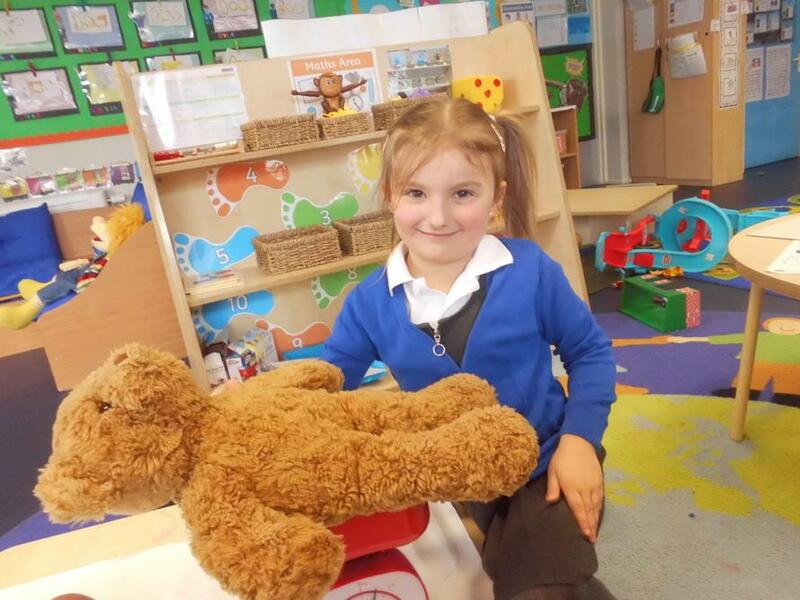 Whether it be a map of a place they have visited, a postcard, a drawing or photograph or their favourite toy, all items need to be LABELLED WITH YOUR CHILDS NAME to ensure a safe return at the end of the day. 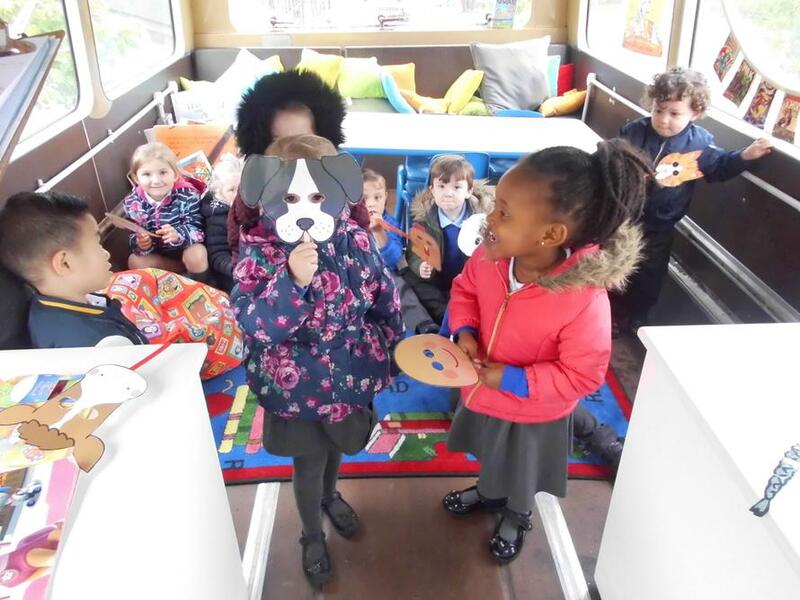 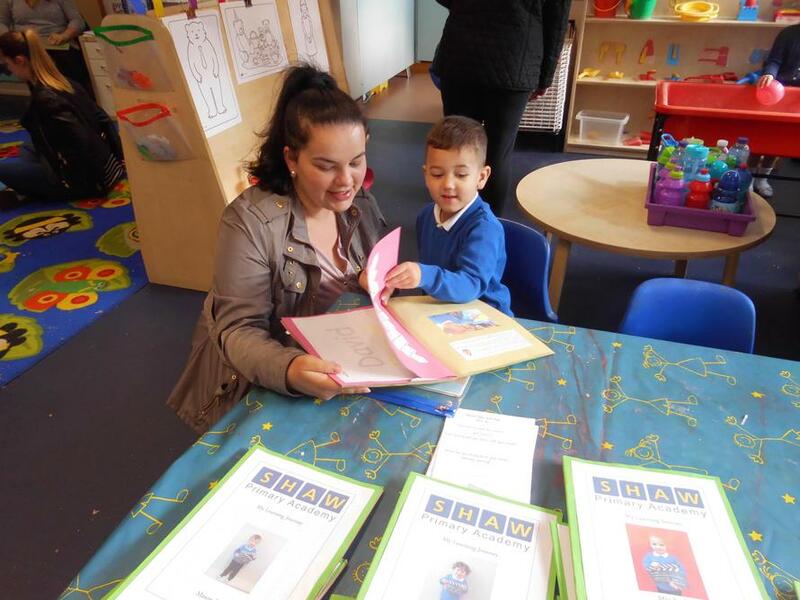 The aim of 'show and tell' is to develop and strengthen the children's communication and language ability and also their self confidence and relationships with others. 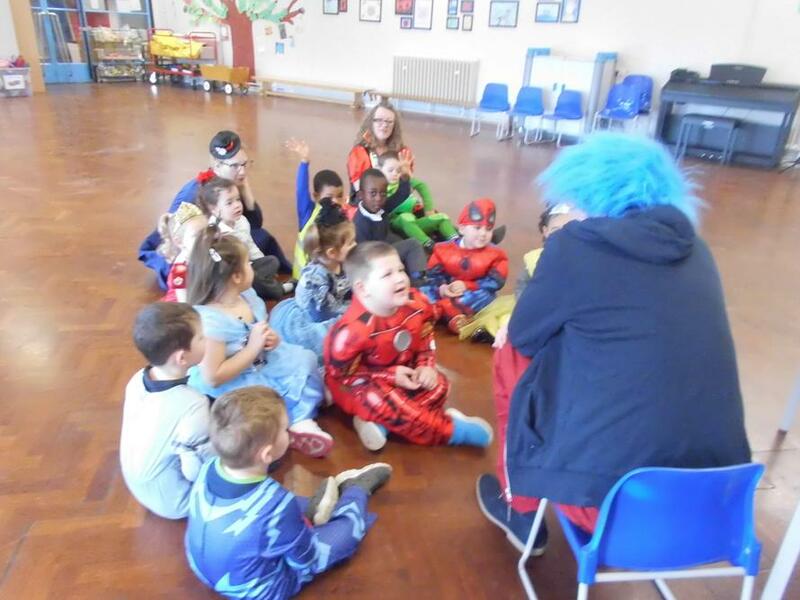 It takes place at the end of the session in small groups on a TUESDAY. 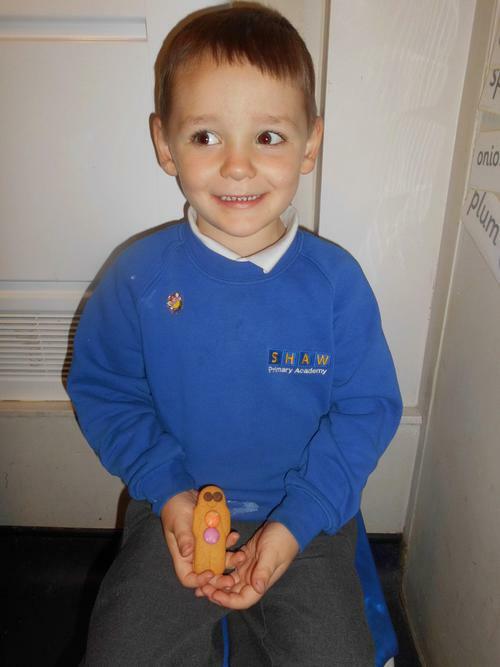 LOOK OUT FOR A START DATE FOR SHOW AND TELL ON THE NOTICE BOARD OR NURSERY CLASS DOOR. 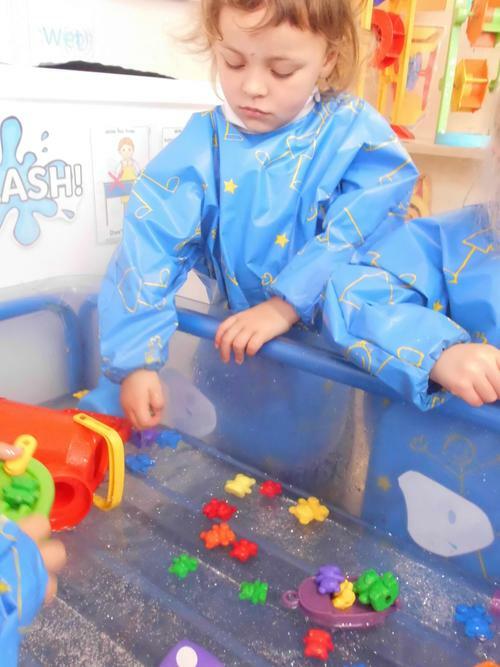 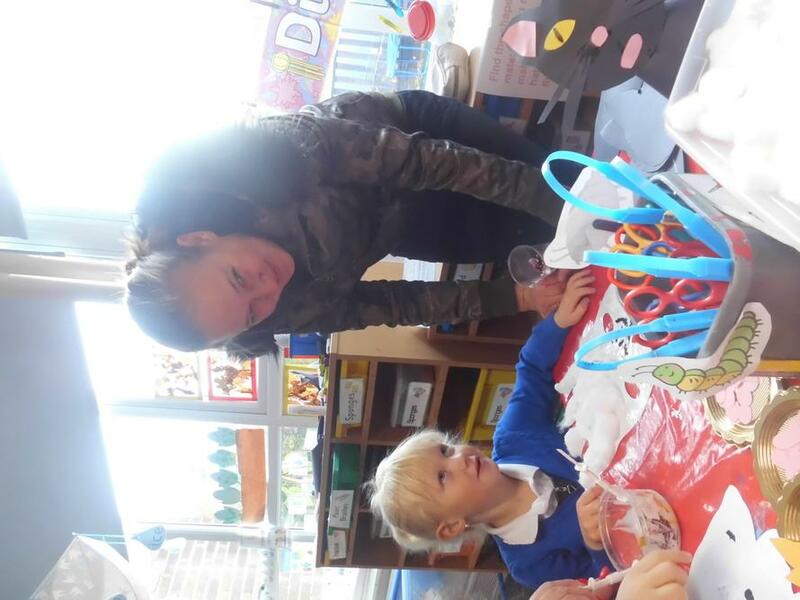 Activity packs are packs with various activities in that aim to strengthen and develop skills that the children will be learning whilst in Nursery. 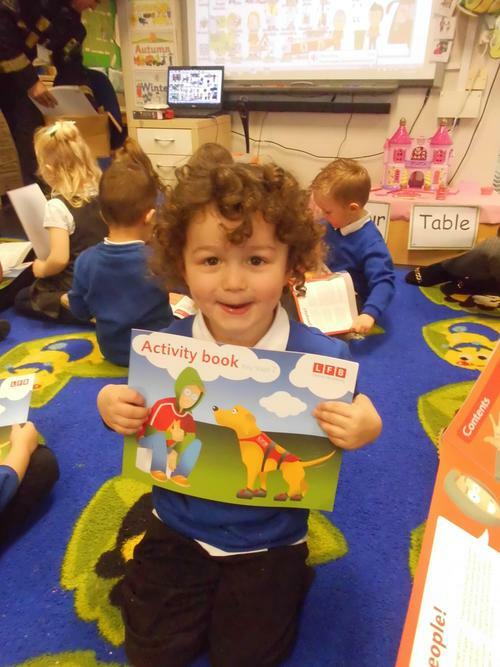 Activity packs are sent out in school book bags on a THURSDAY and can be taken home to engage in with your child and returned on WEDNESDAY. 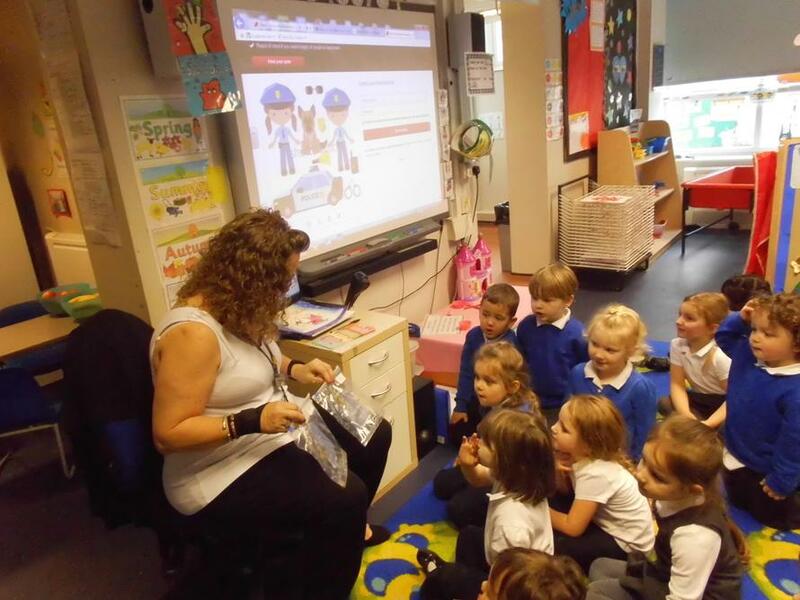 they are sent home in school book bags, which can be ordered from the school office. 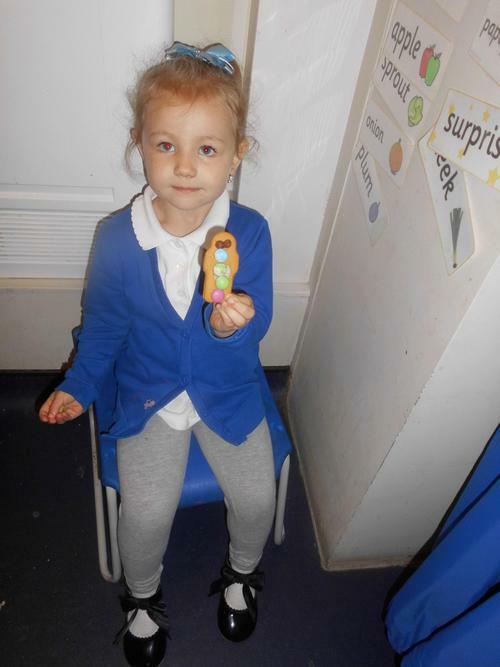 Nursery PE lessons consist of circle games and songs and also action songs or games e.g. 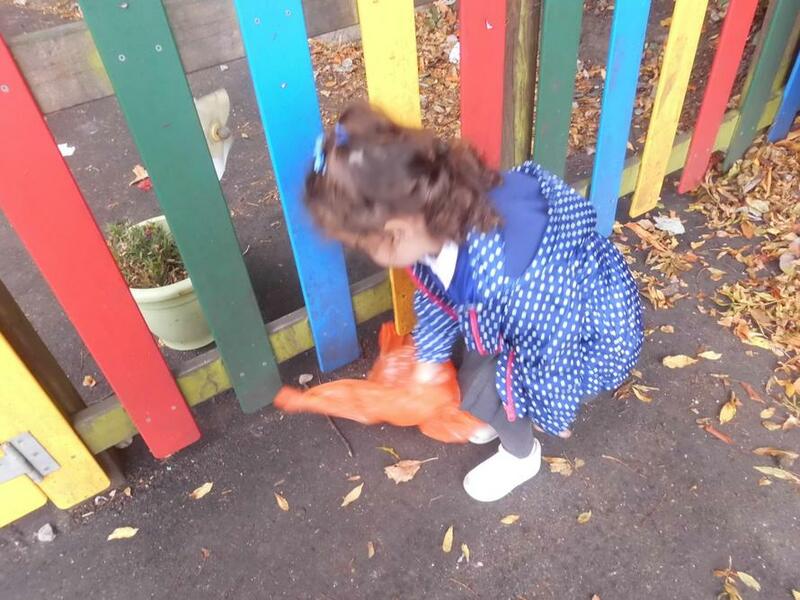 parachute games. 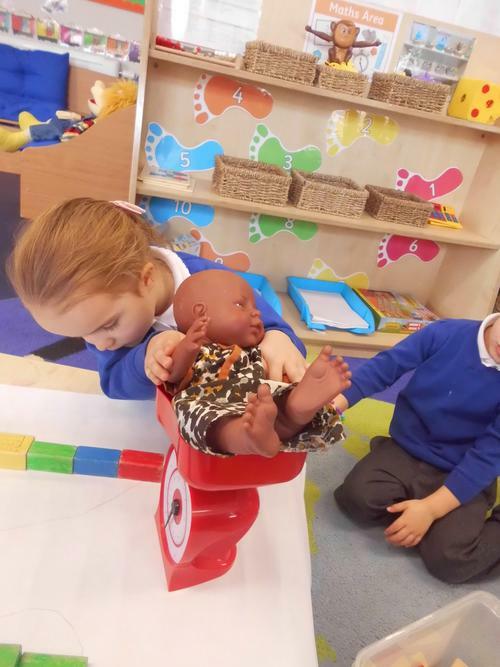 the children are not required to change for PE but they do remove their shoes and socks. 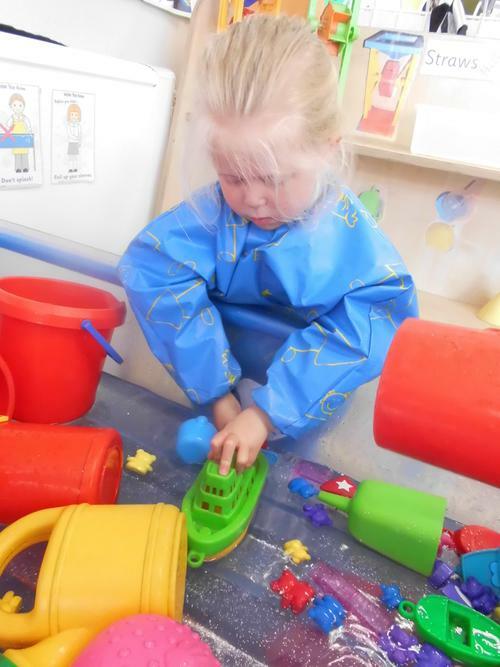 To enable the children to develop their independence with dressing themselves, we recommend sending them in to school with Velcro or slip on shoes everyday or at least on our PE days. 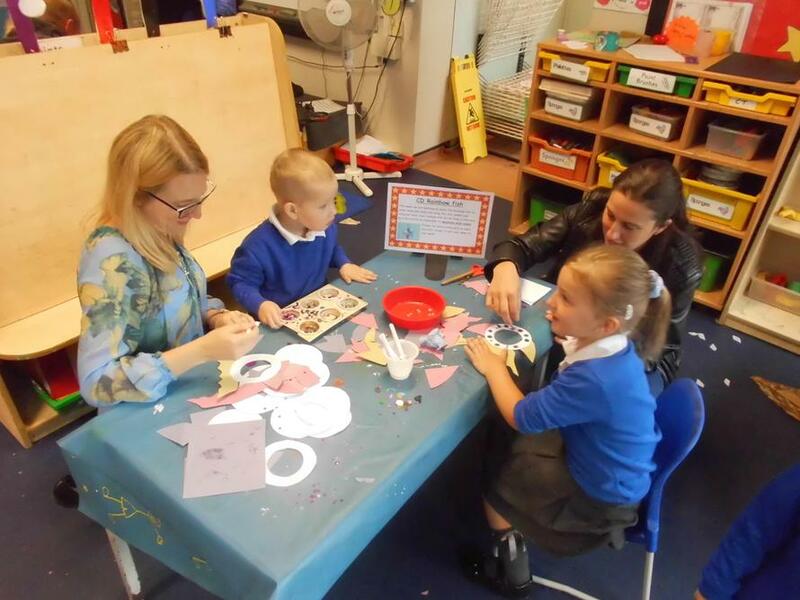 We really enjoy having parents in class to join in with the activities and to also look at their child's learning journal. 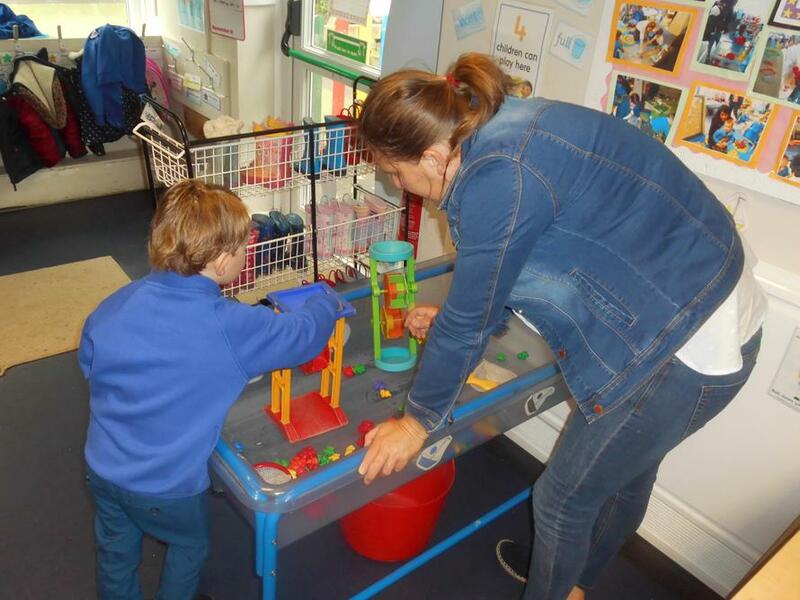 We have a stay and play session planned for each half term, where parents come along, chat to staff, join in with activities with their child and look at their child's learning journal. 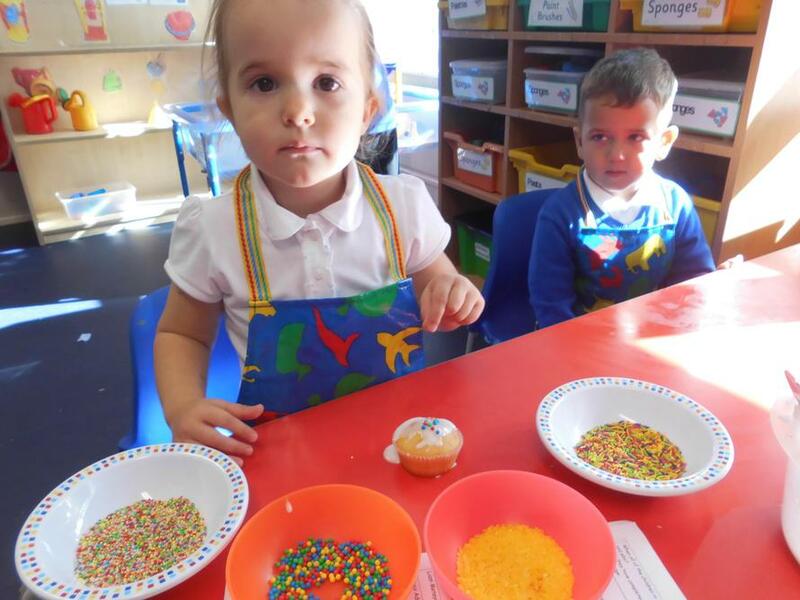 Dates for these sessions are to be arranged but will be posted on class webpages and set out in a letter. 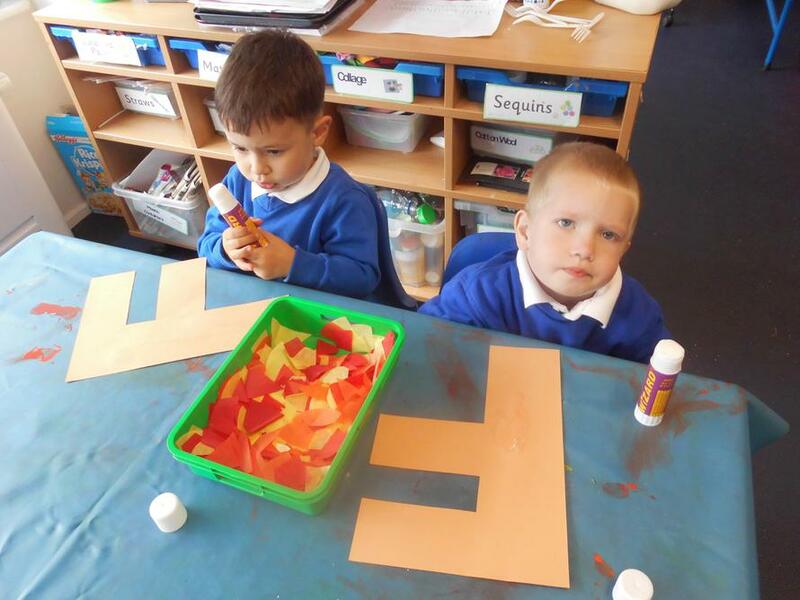 This half term, our topic has been 'Marvellous me' and we have been discussing our families, homes and our likes and dislikes. 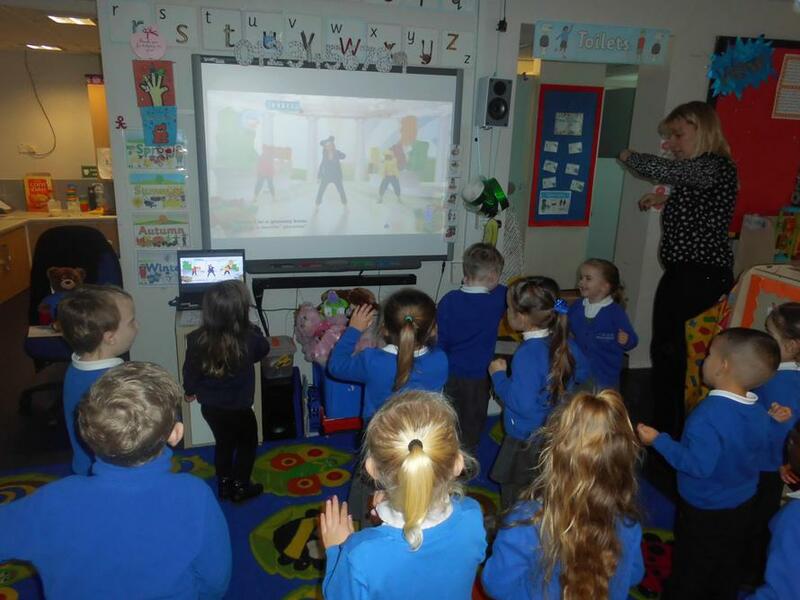 We will be learning all of the class routines and lots of fun songs to help us remember them! 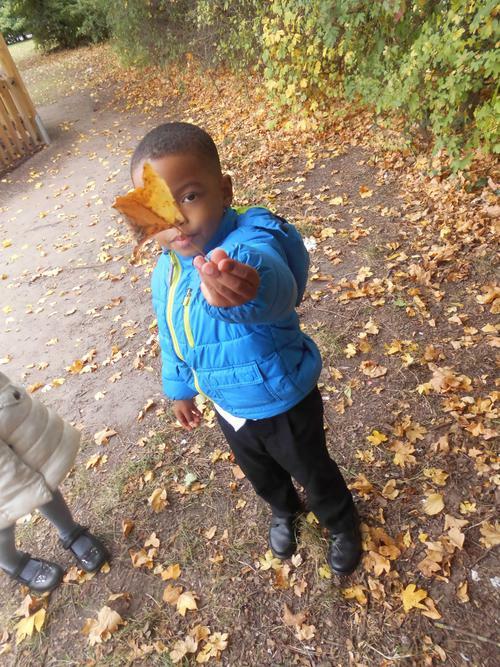 We have also talked about the seasons and the changes we have seen around us with the trees and the weather. 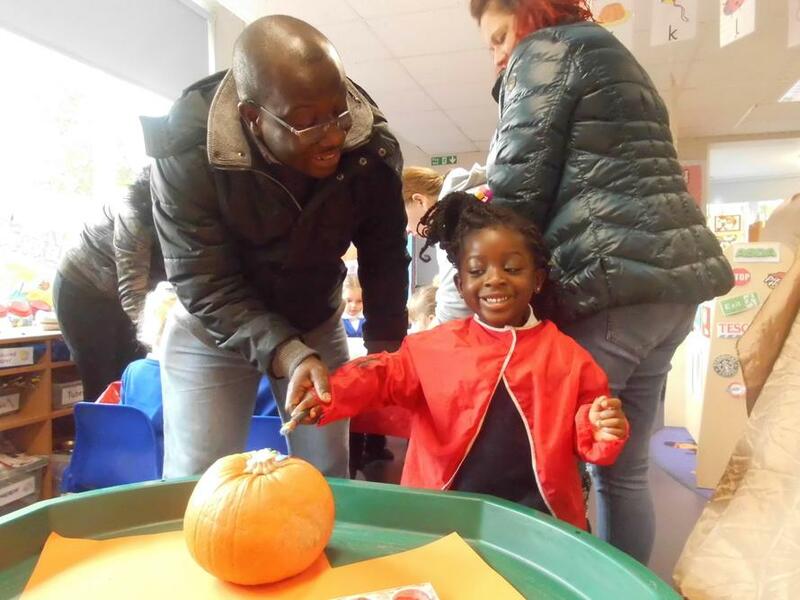 Below are some pictures of the activities we have done during this half term. 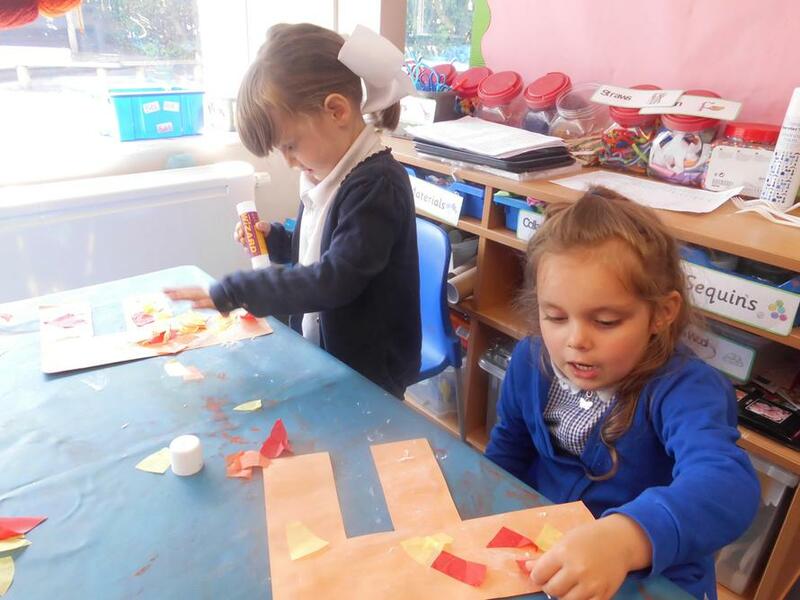 Autumn Term1 Activities including, making our names with stickers, number cookies, an autumn walk, rangoli patterns & diwas for Divali!! 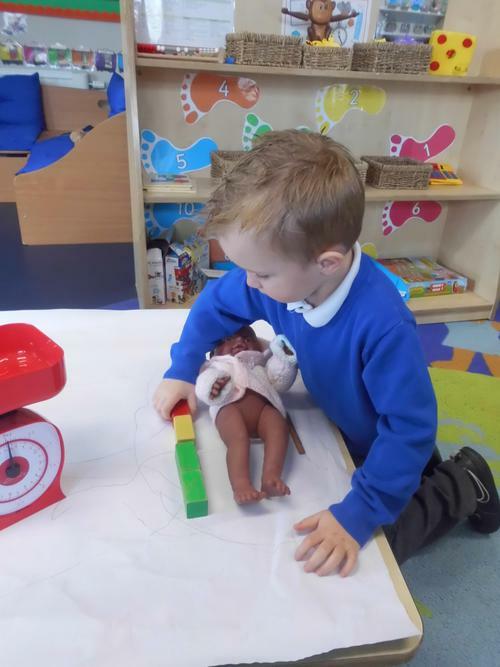 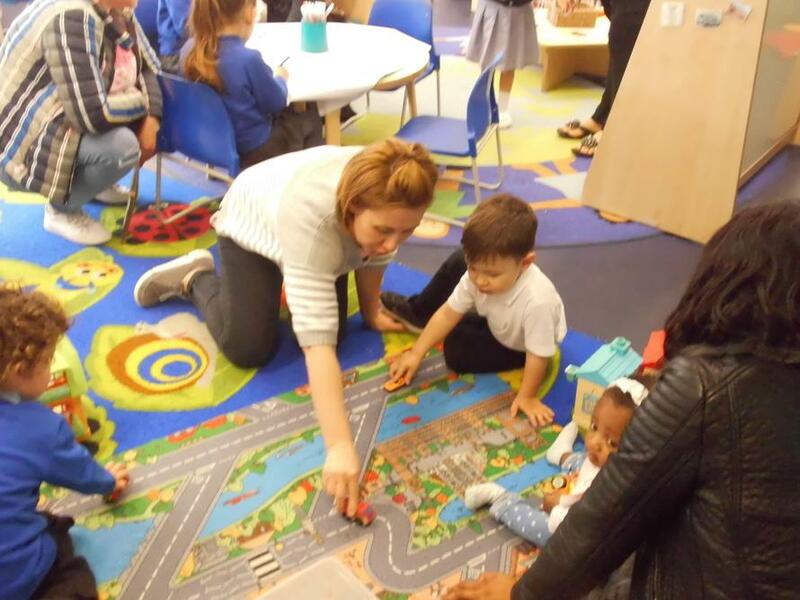 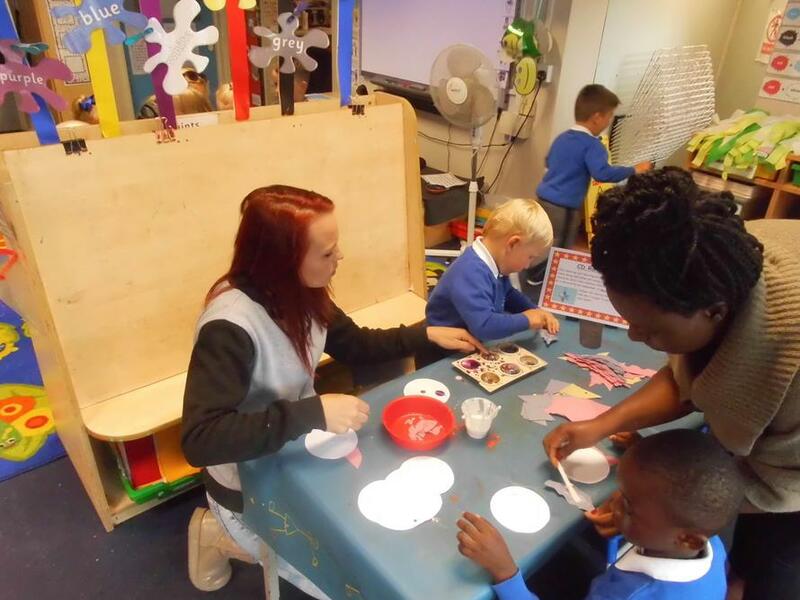 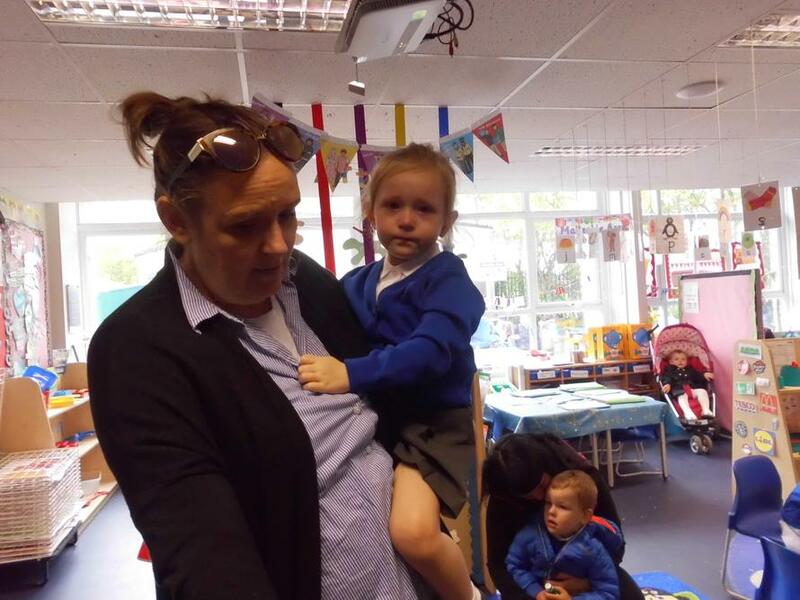 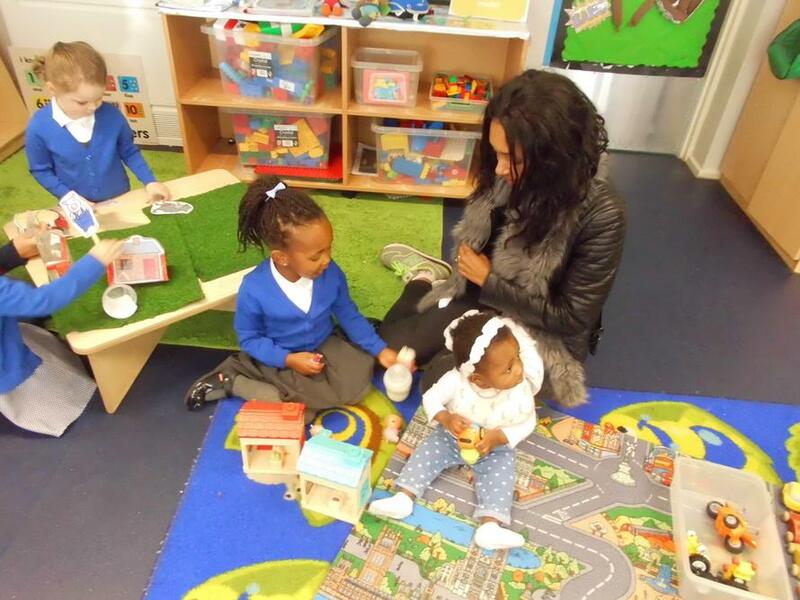 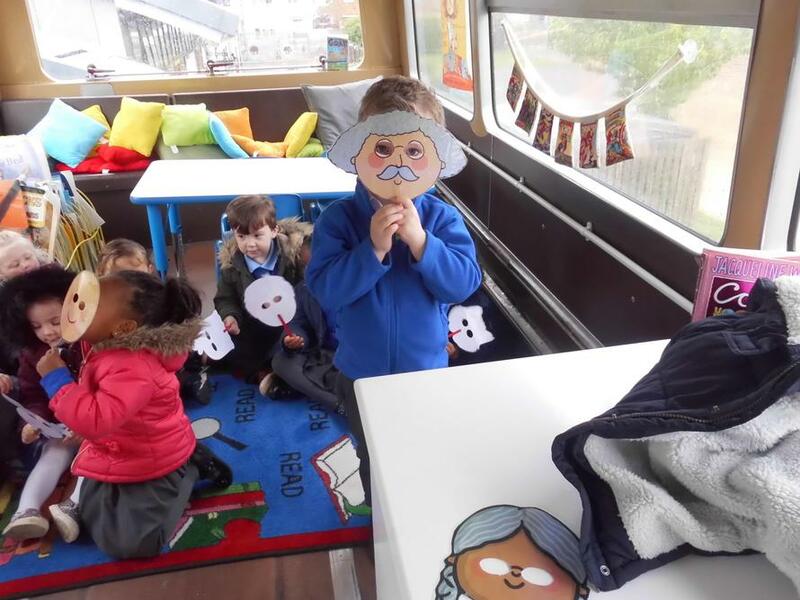 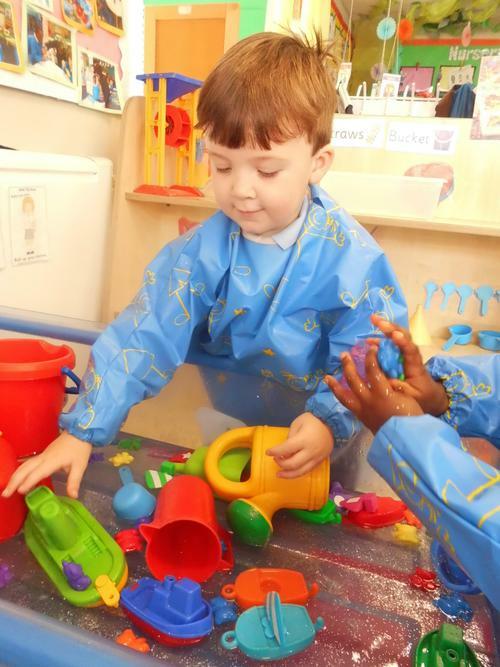 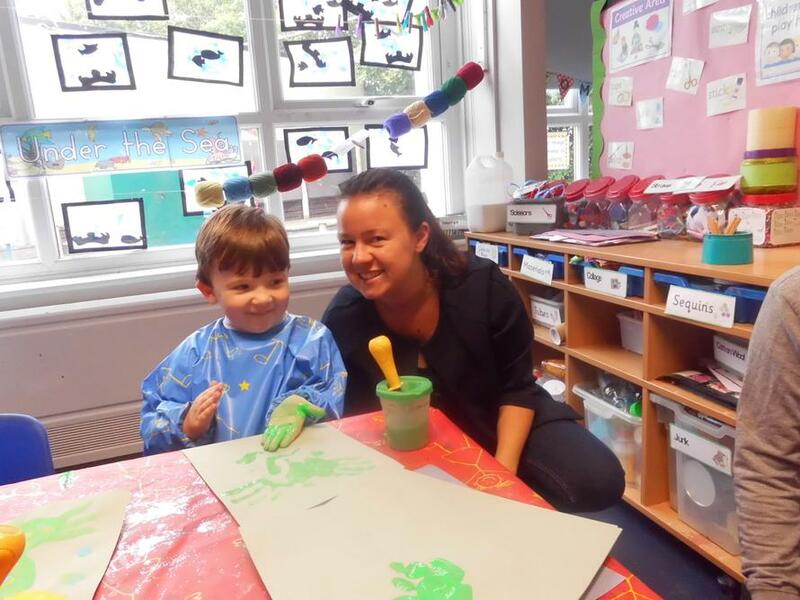 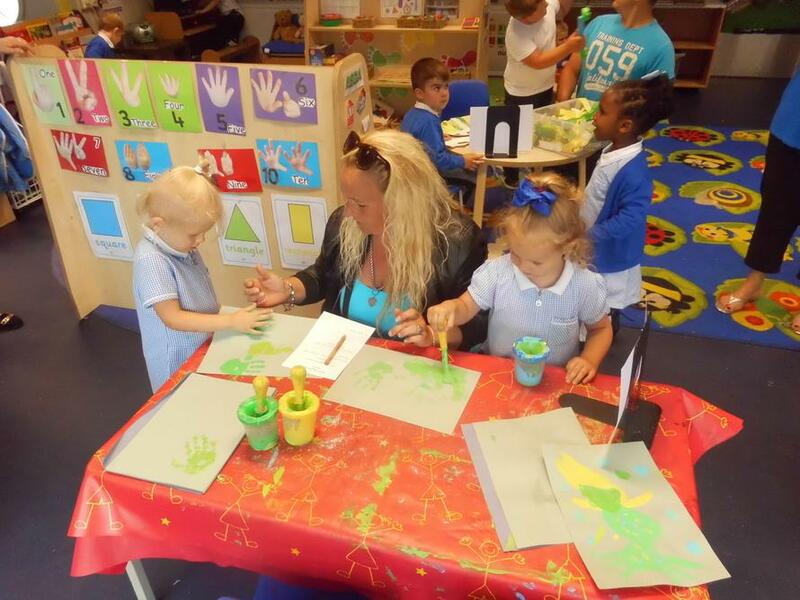 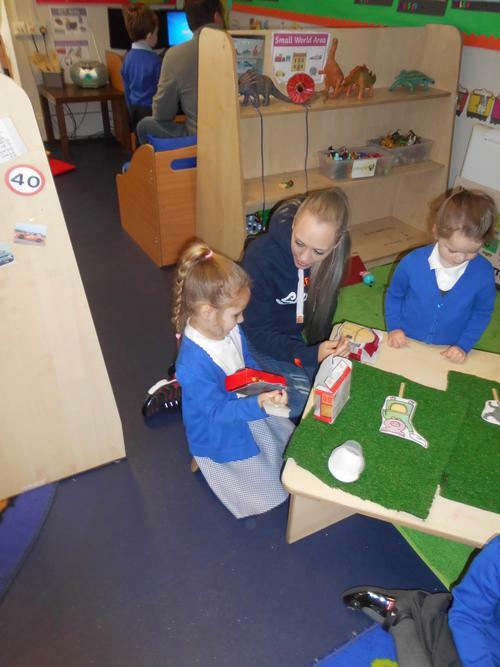 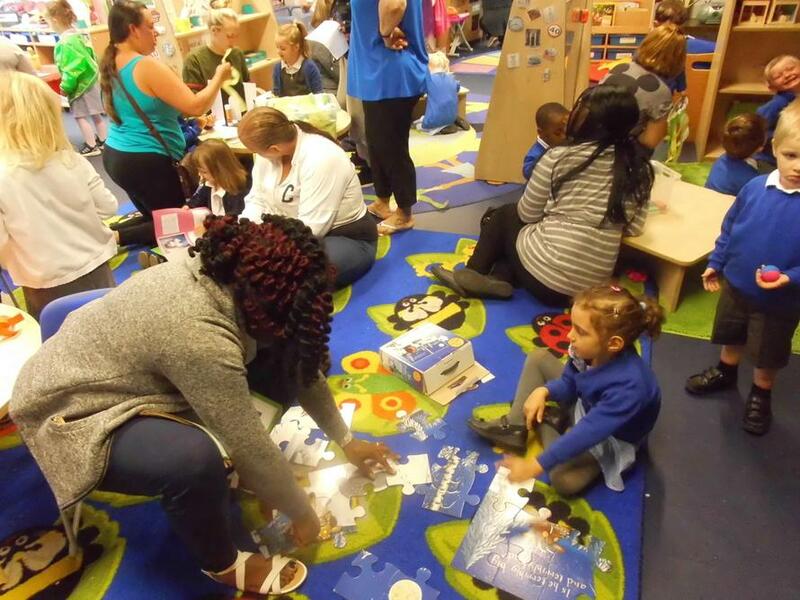 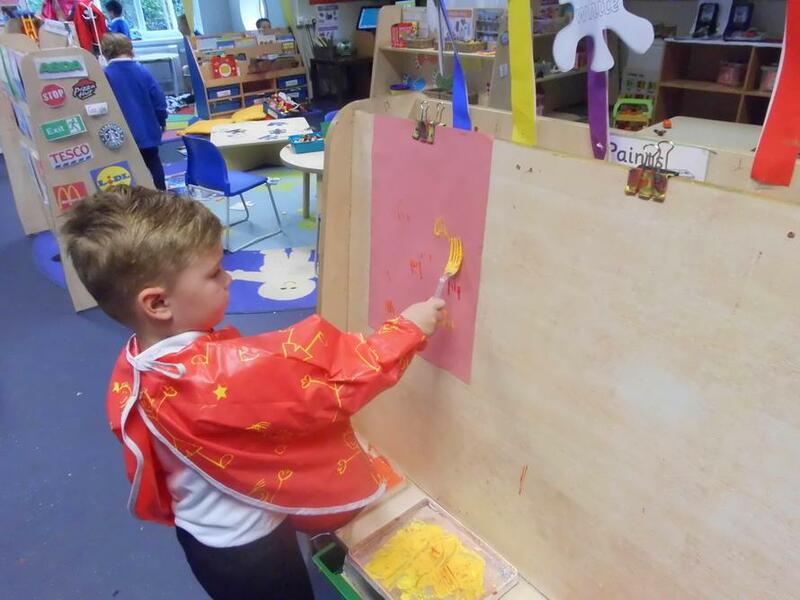 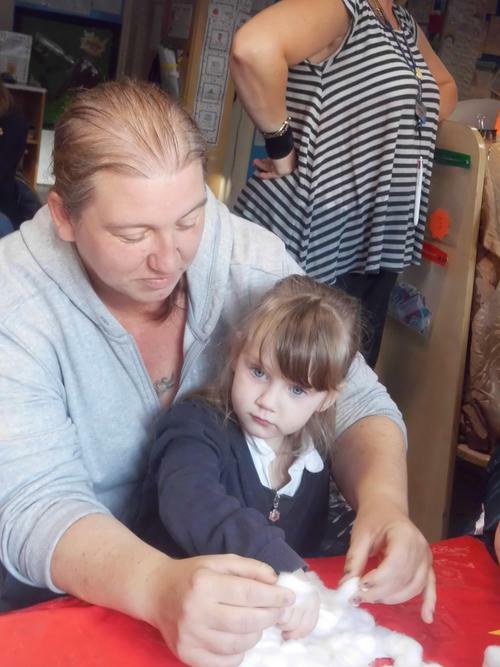 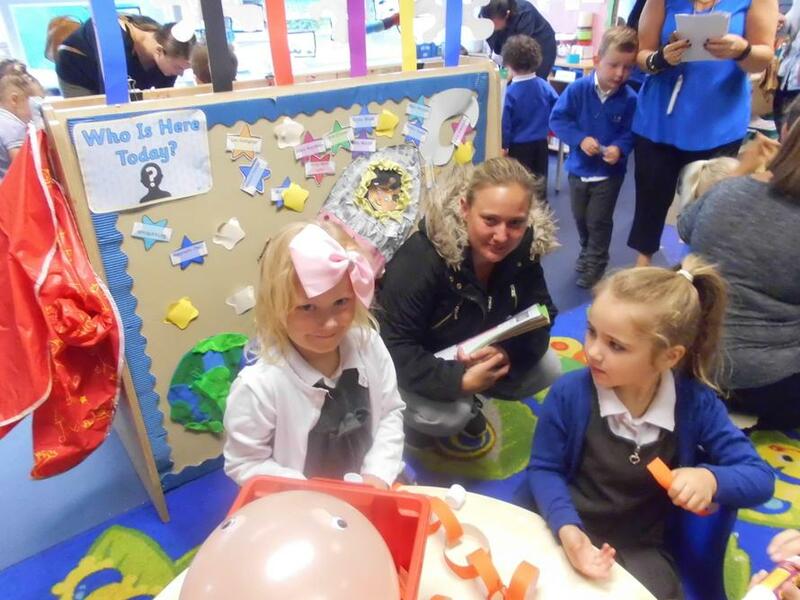 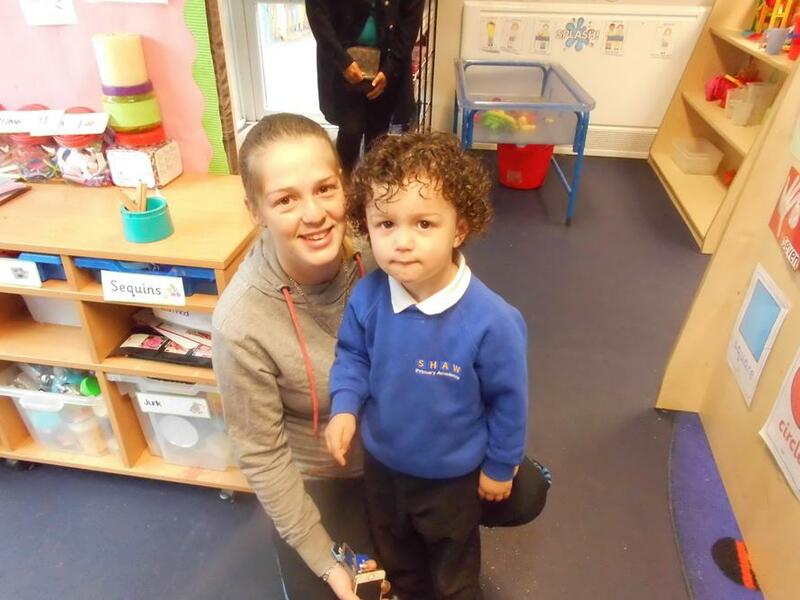 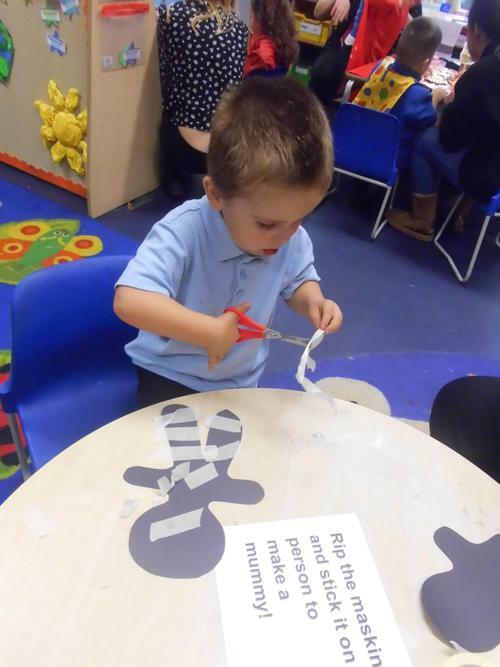 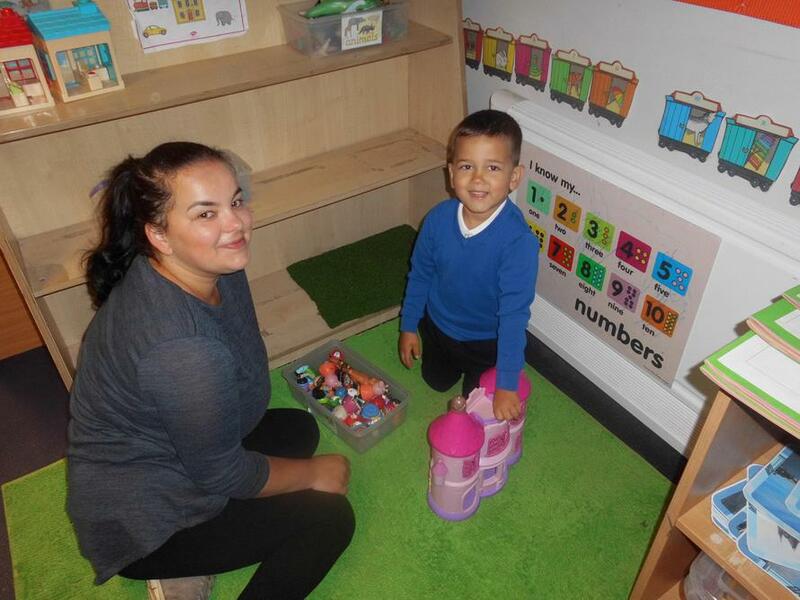 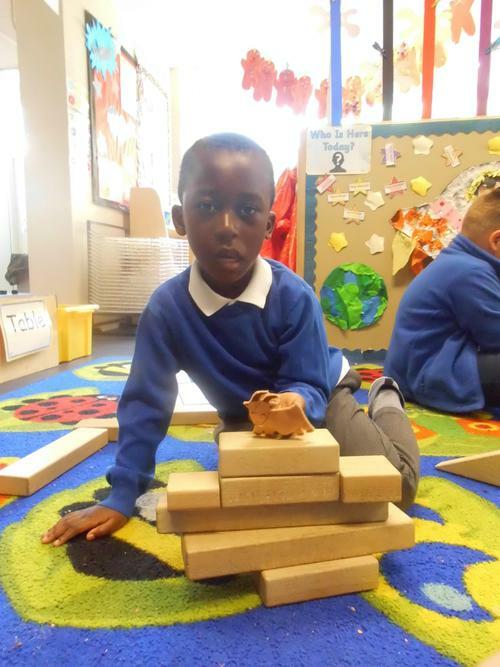 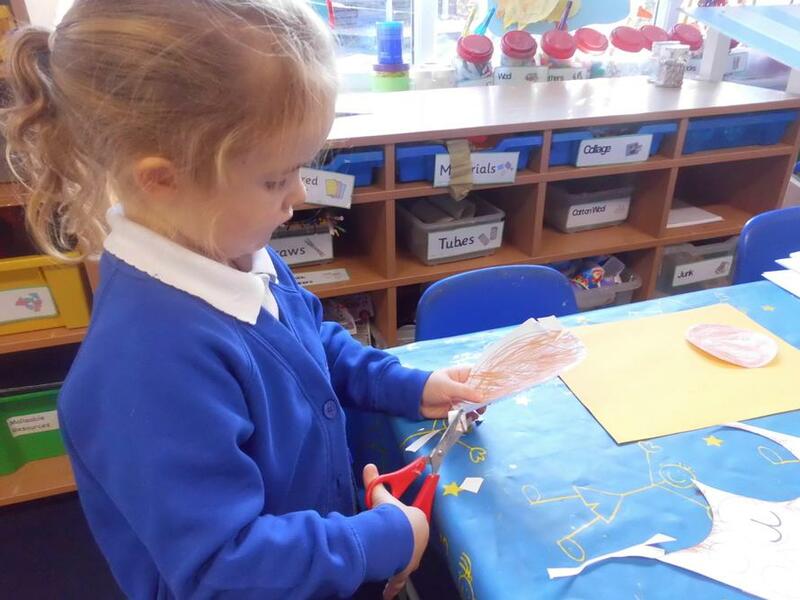 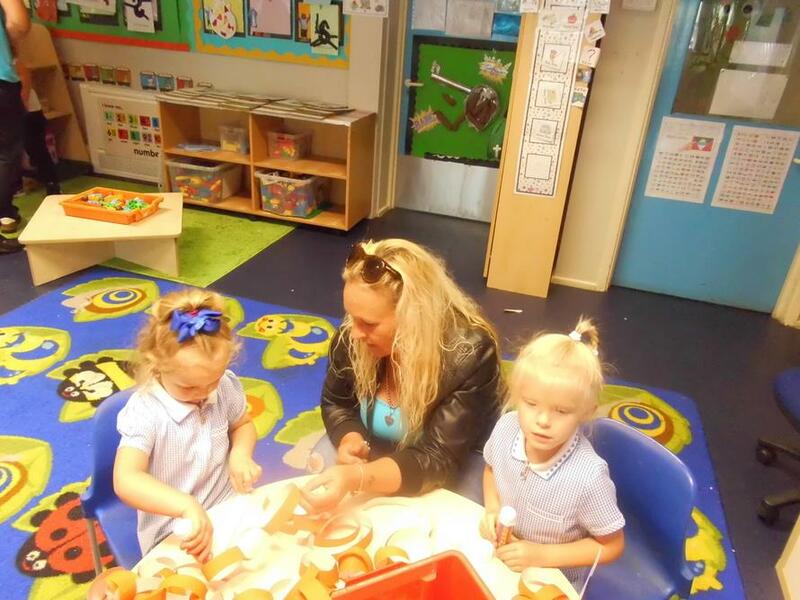 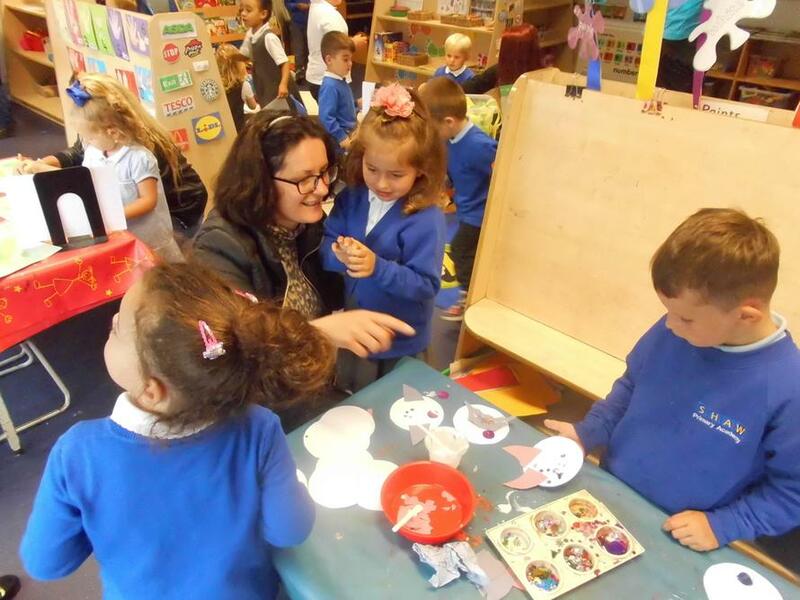 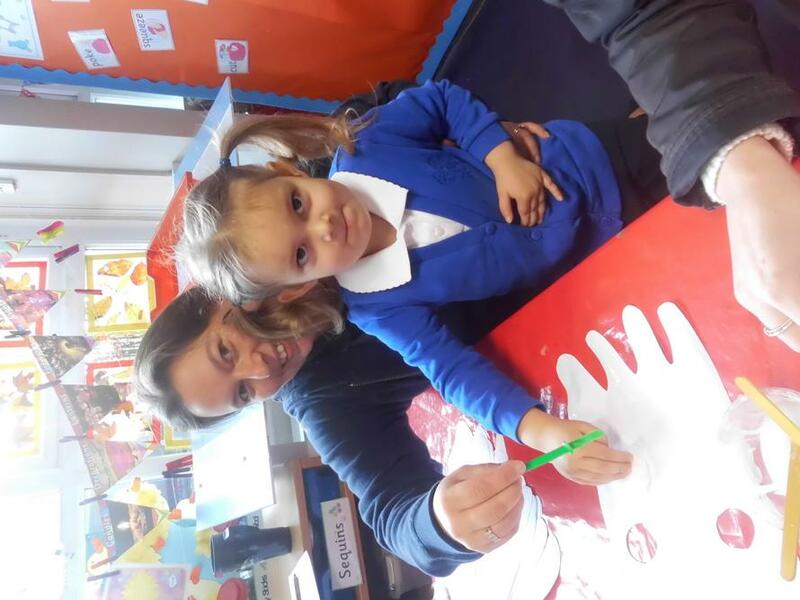 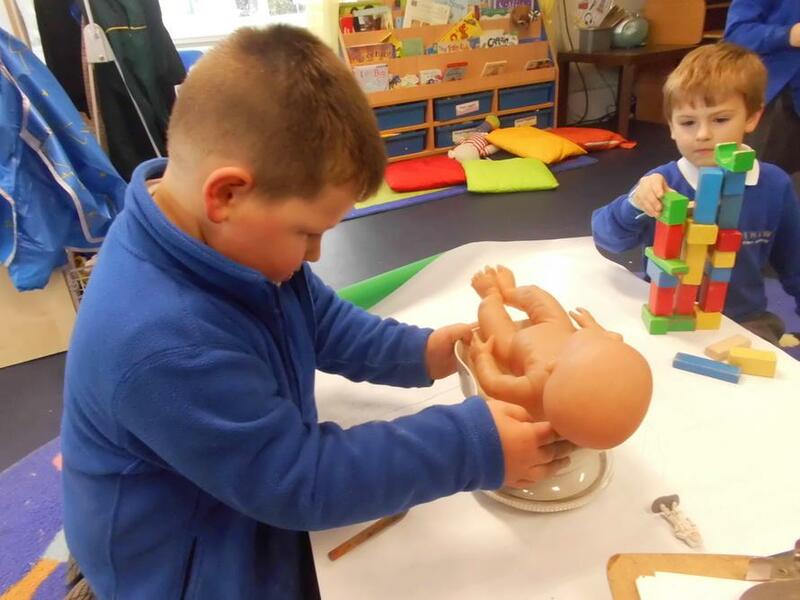 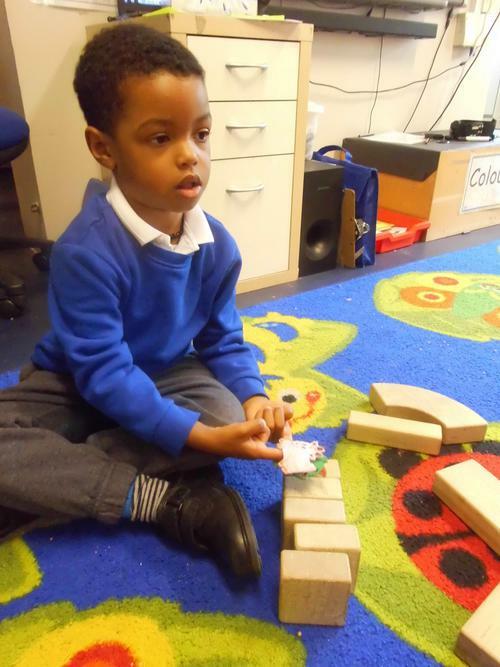 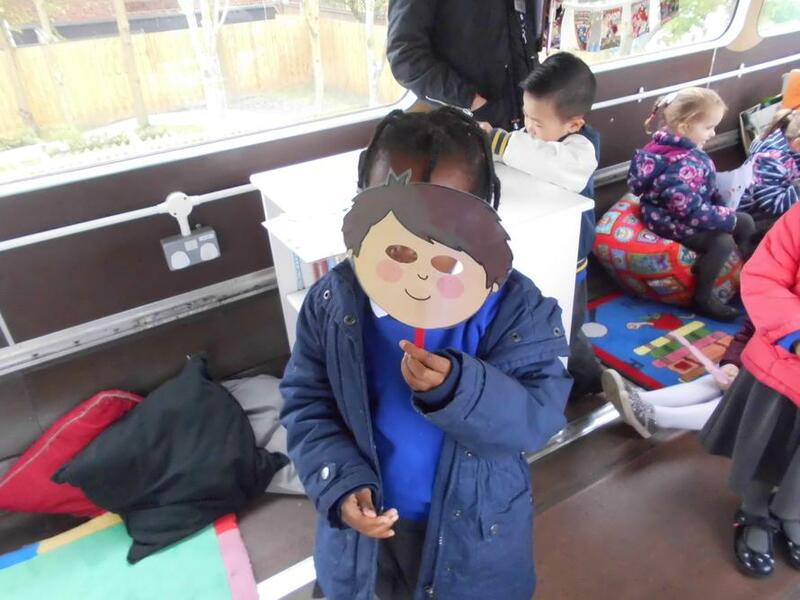 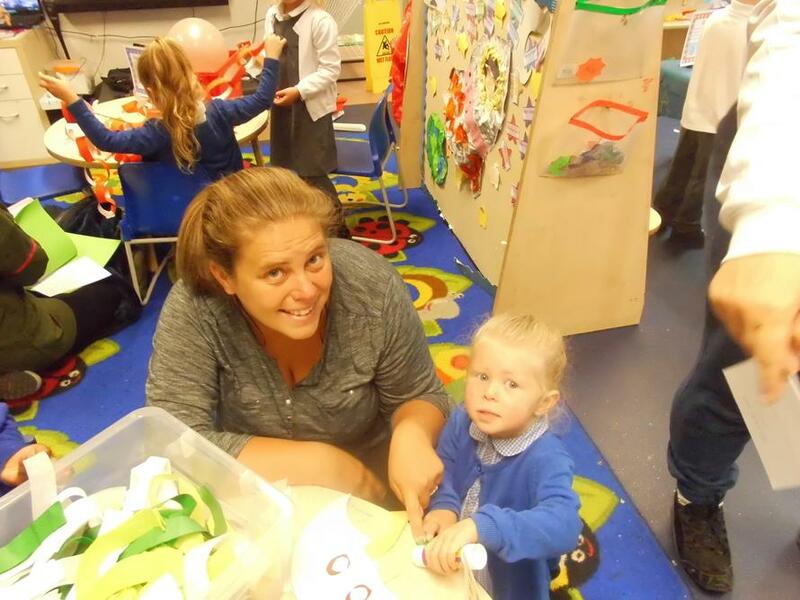 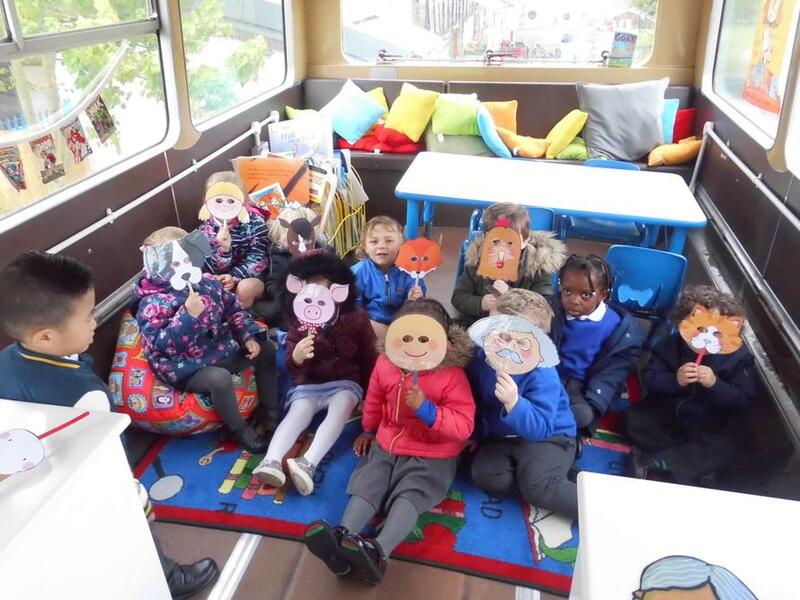 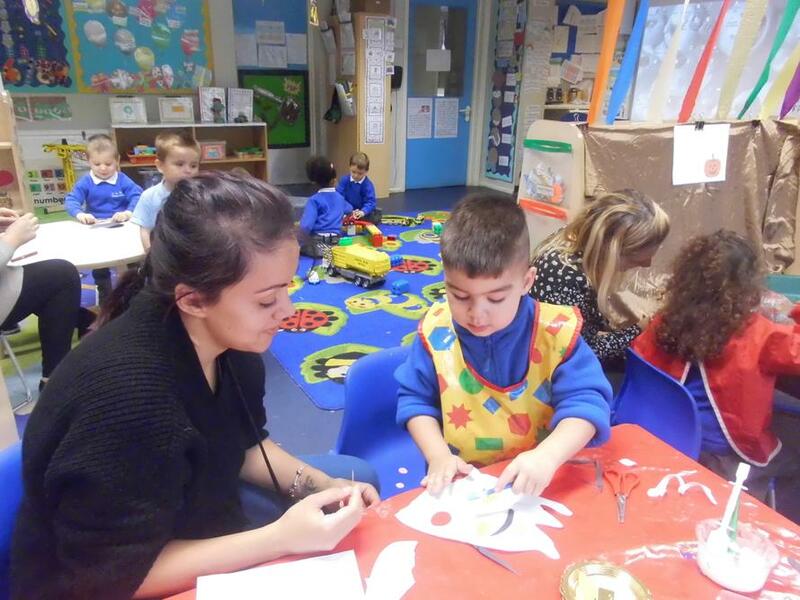 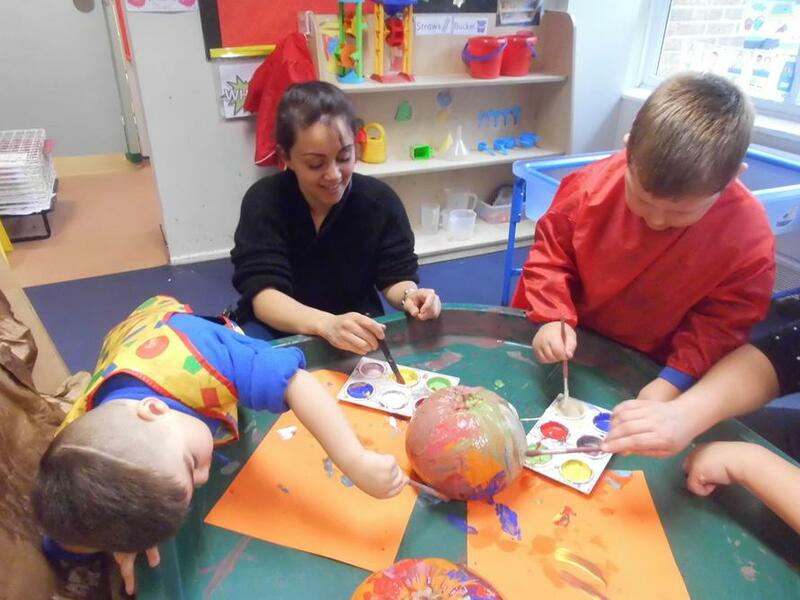 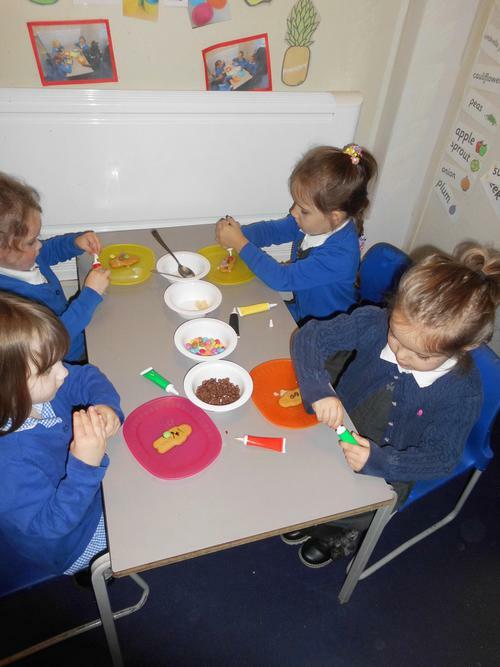 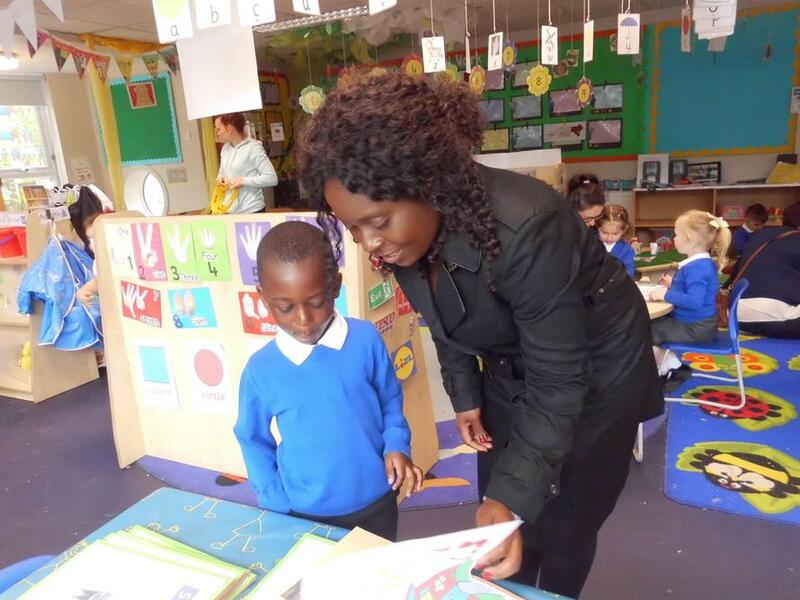 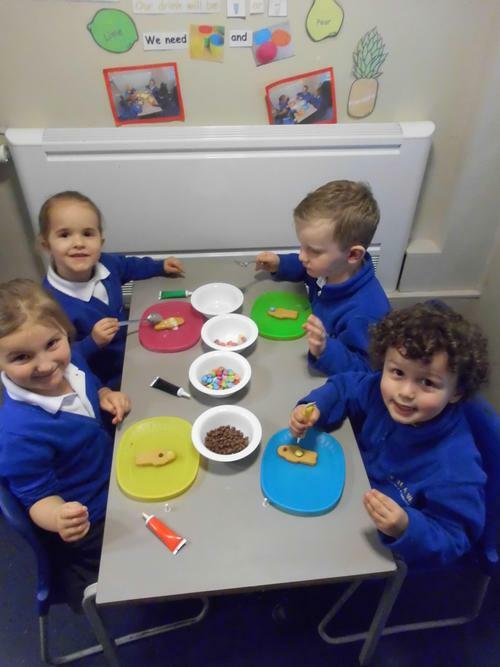 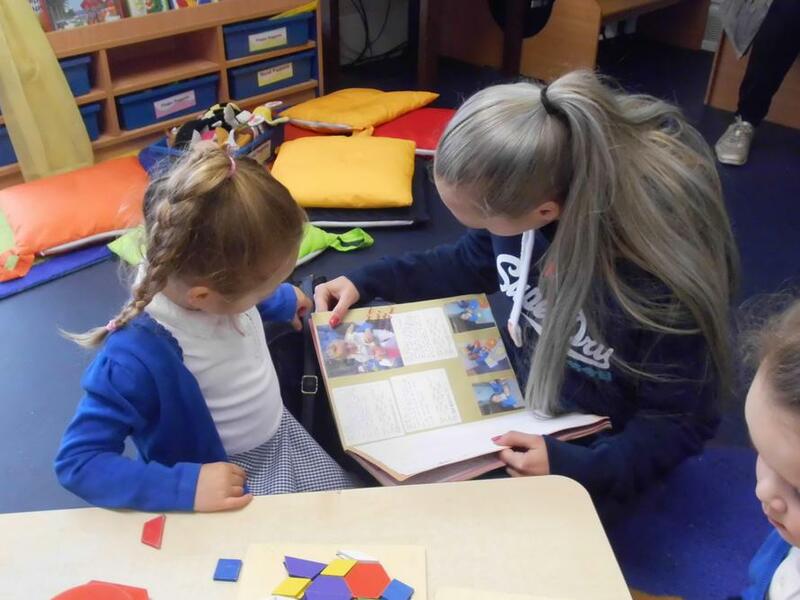 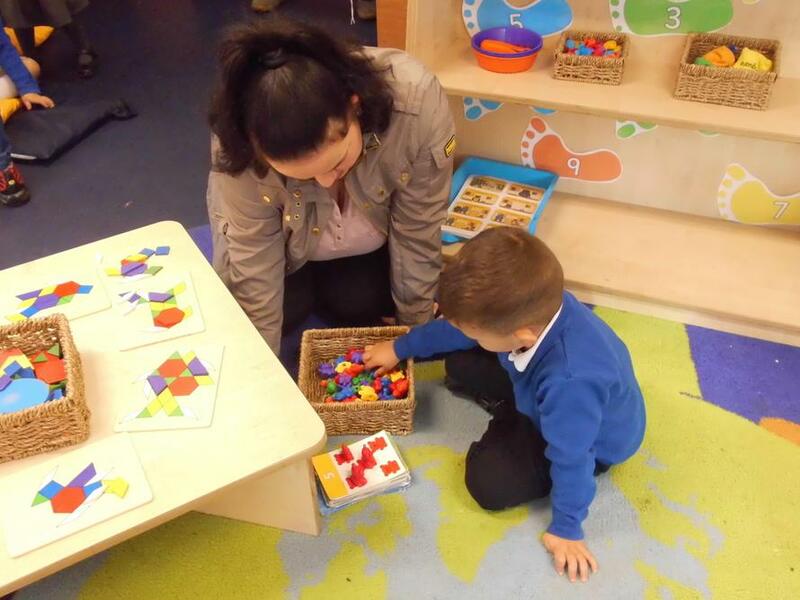 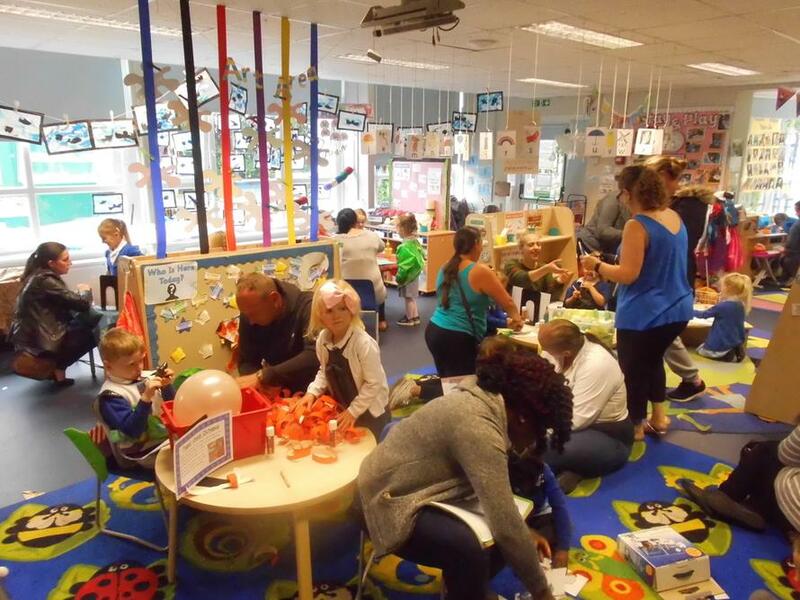 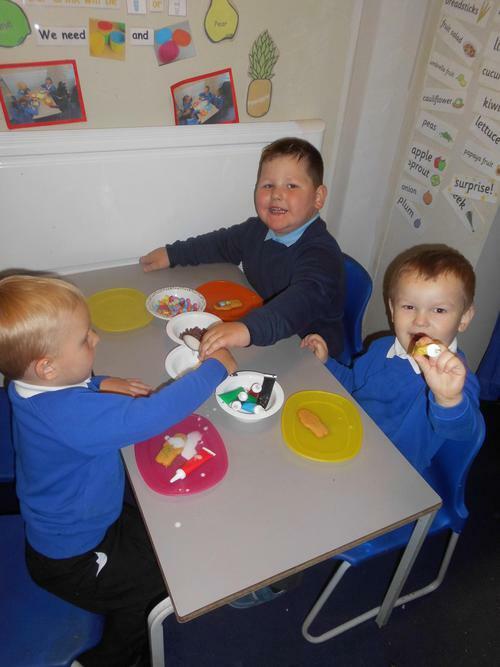 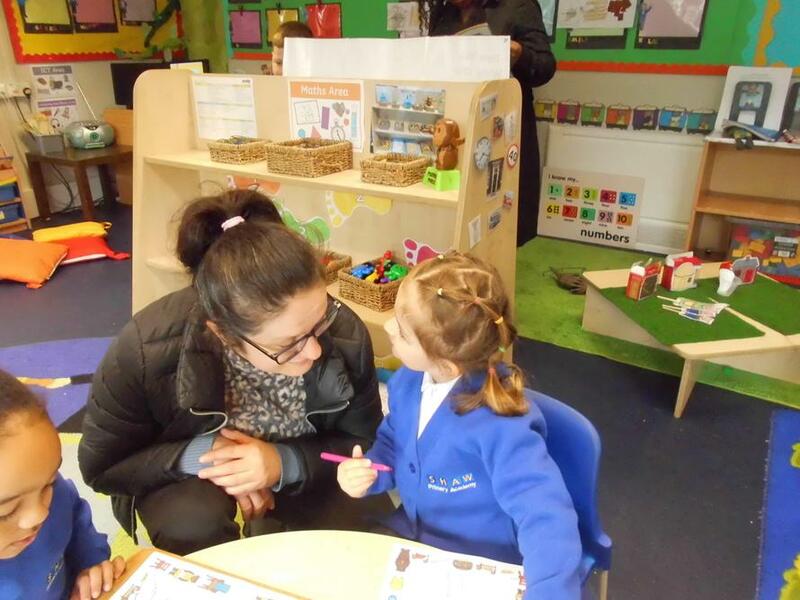 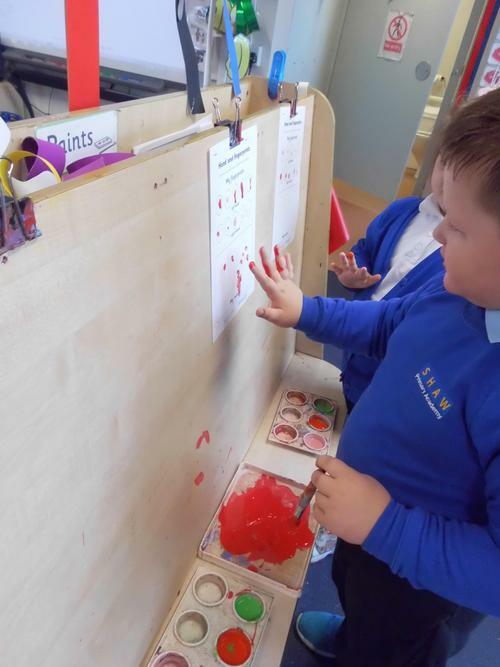 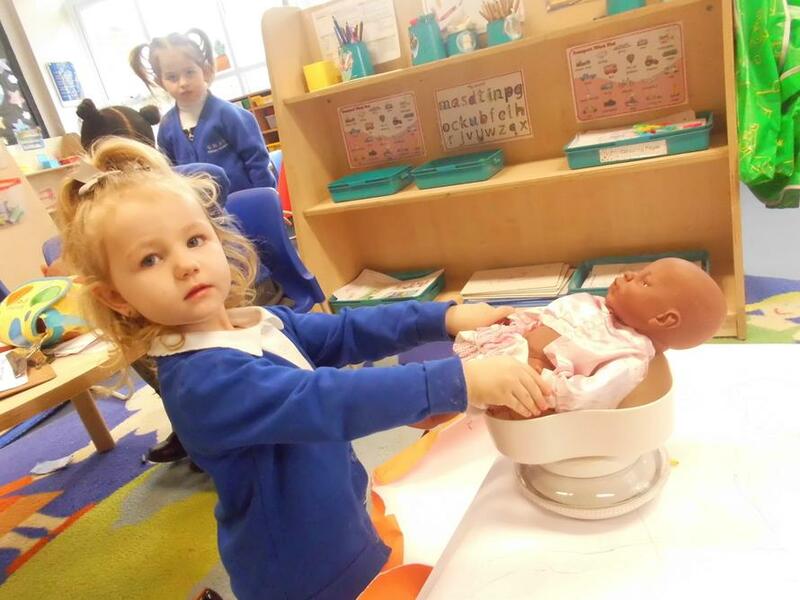 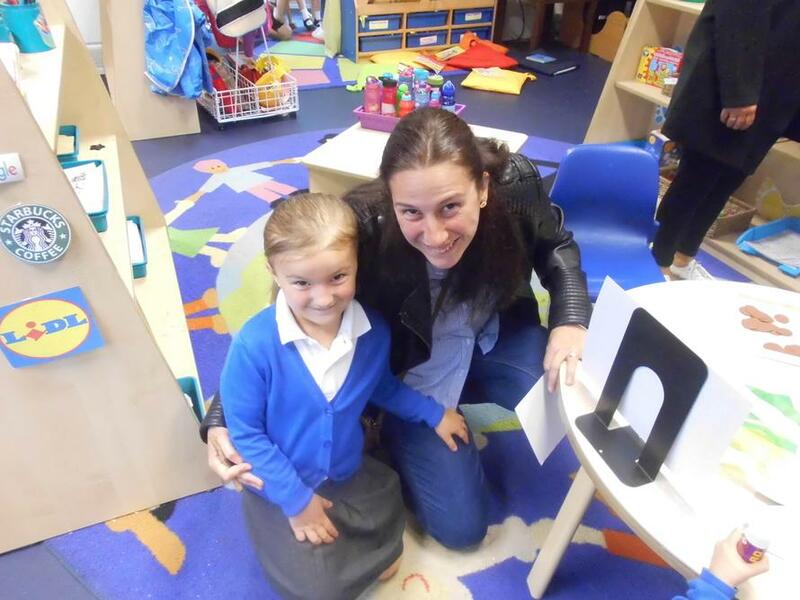 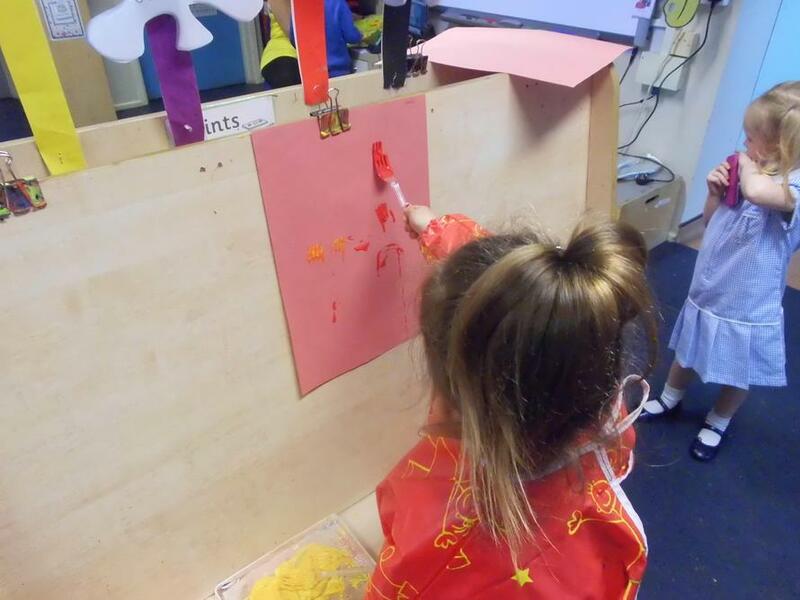 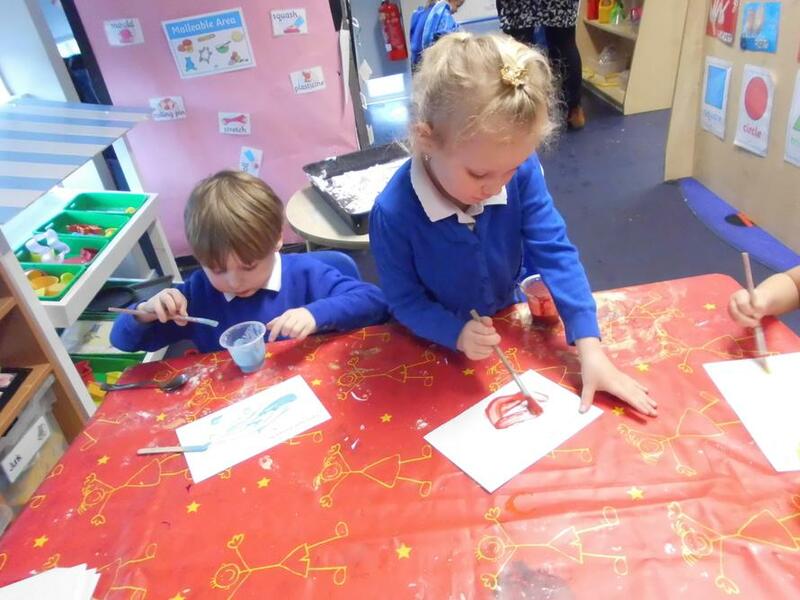 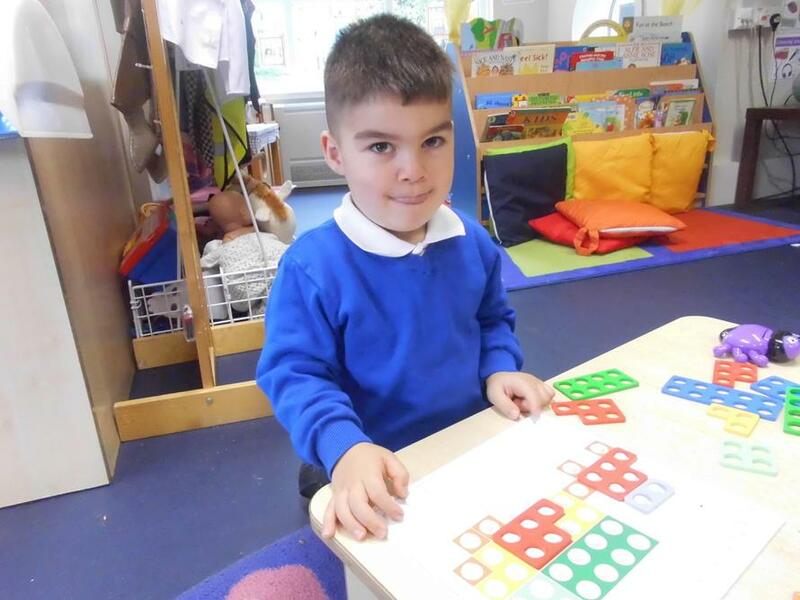 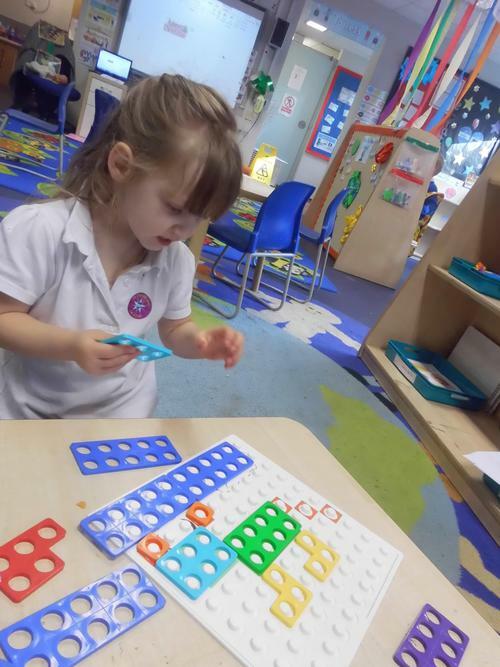 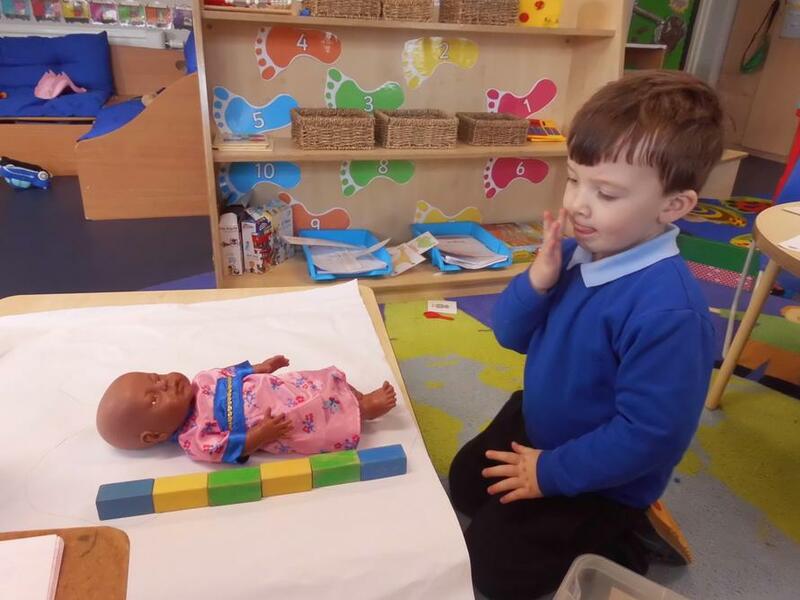 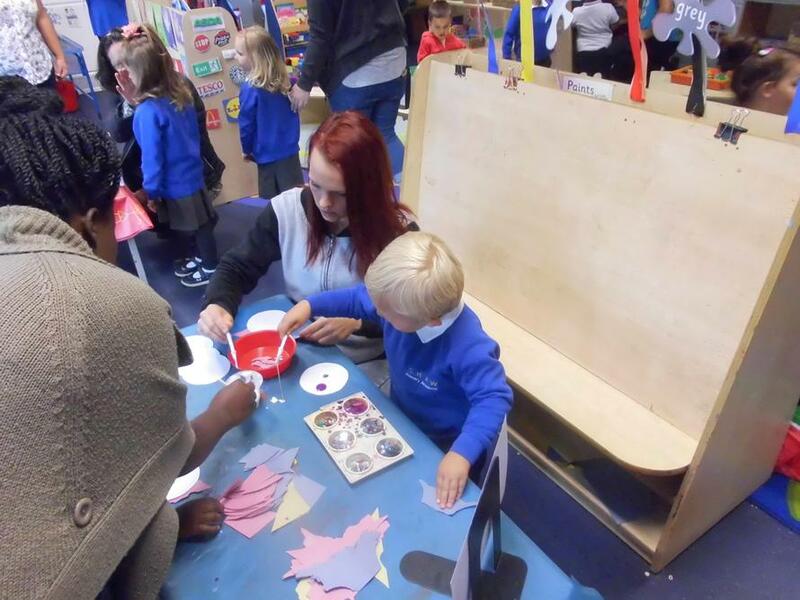 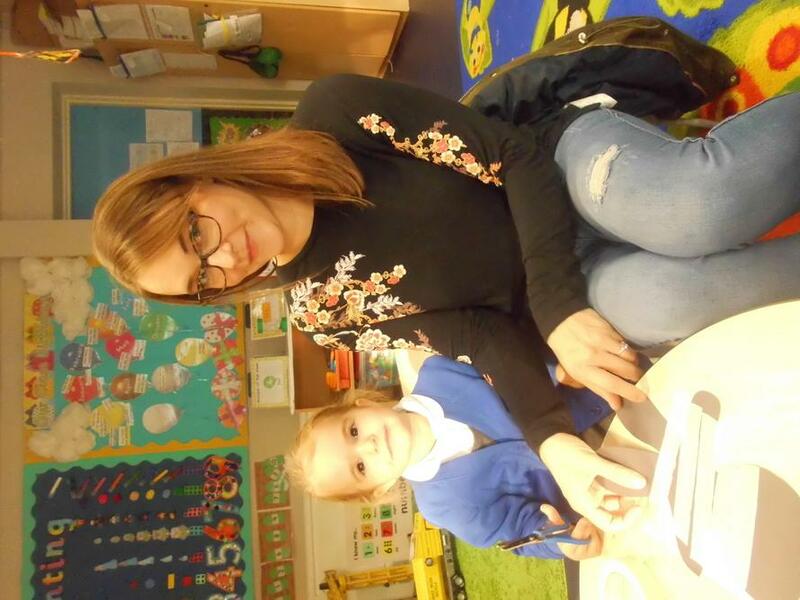 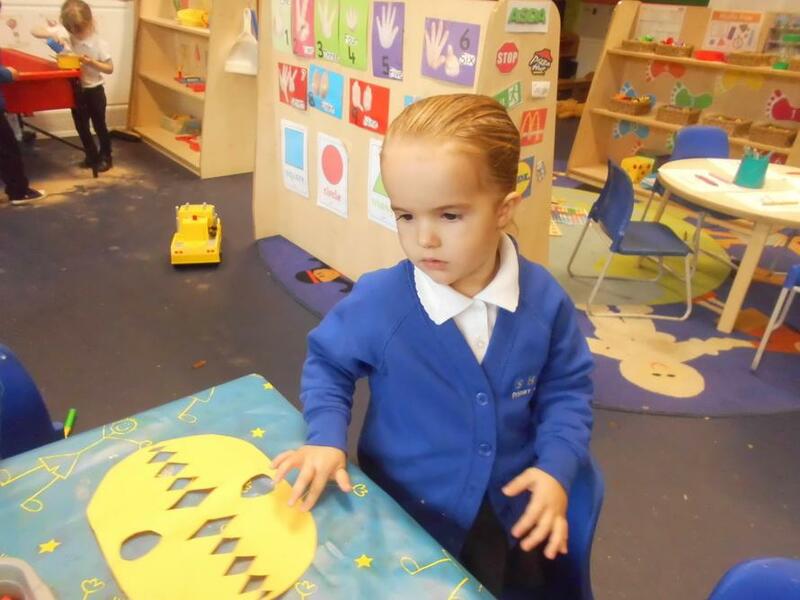 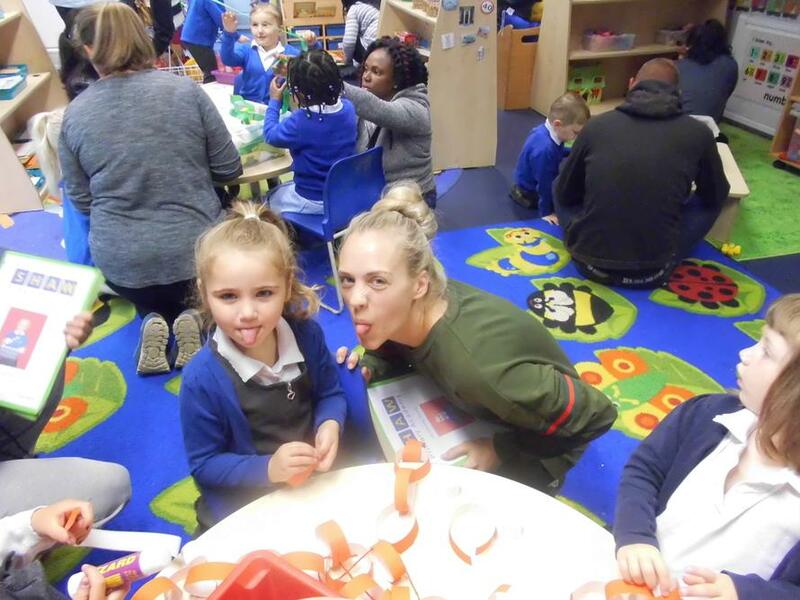 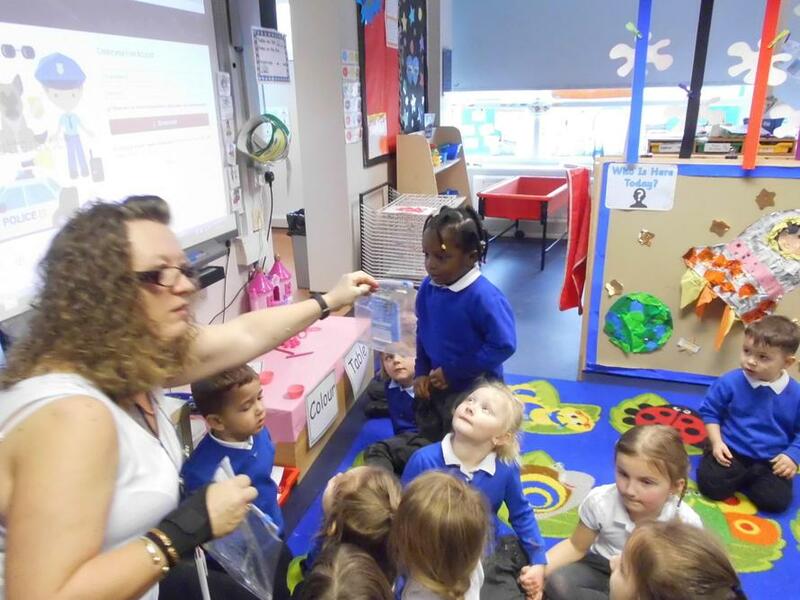 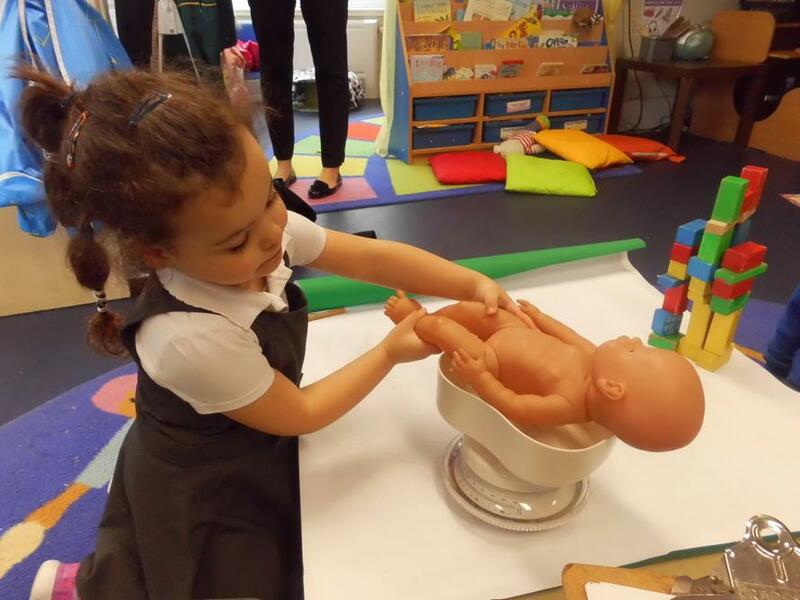 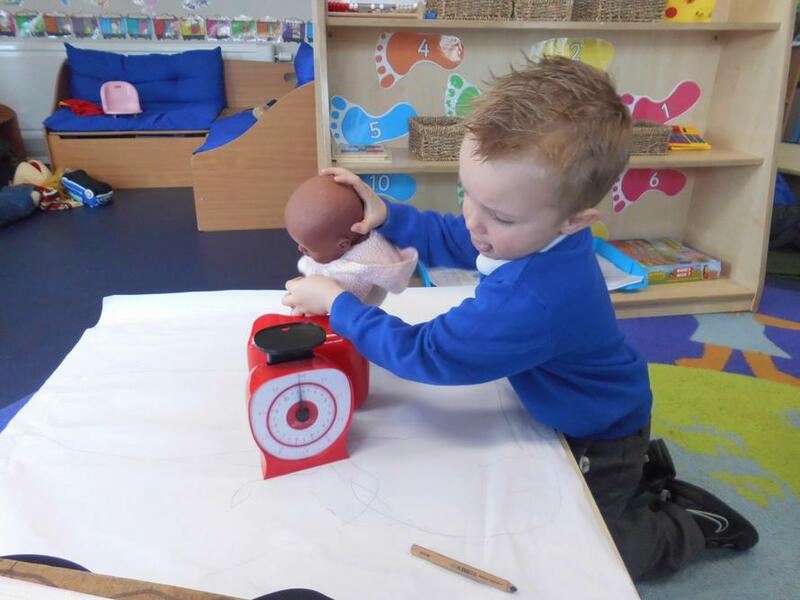 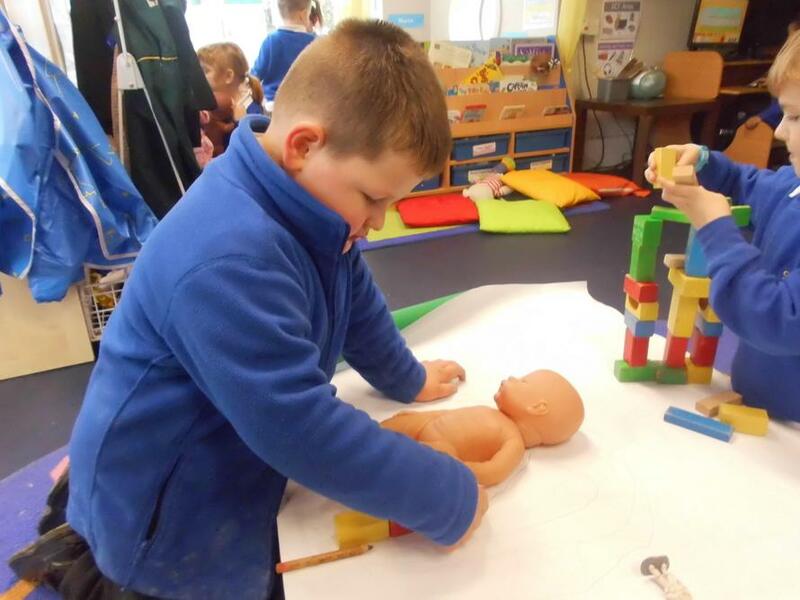 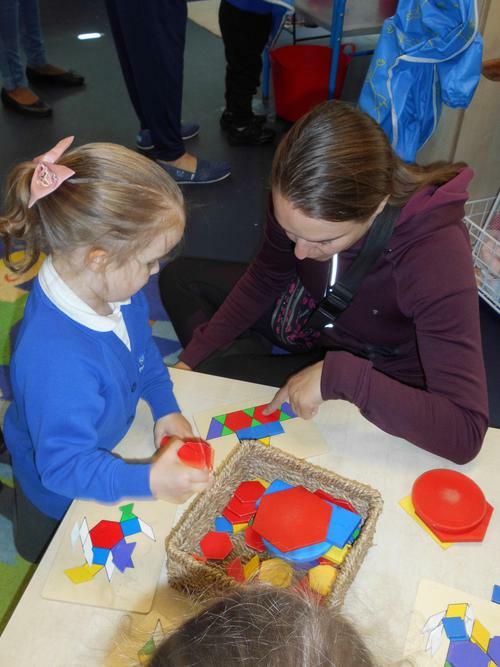 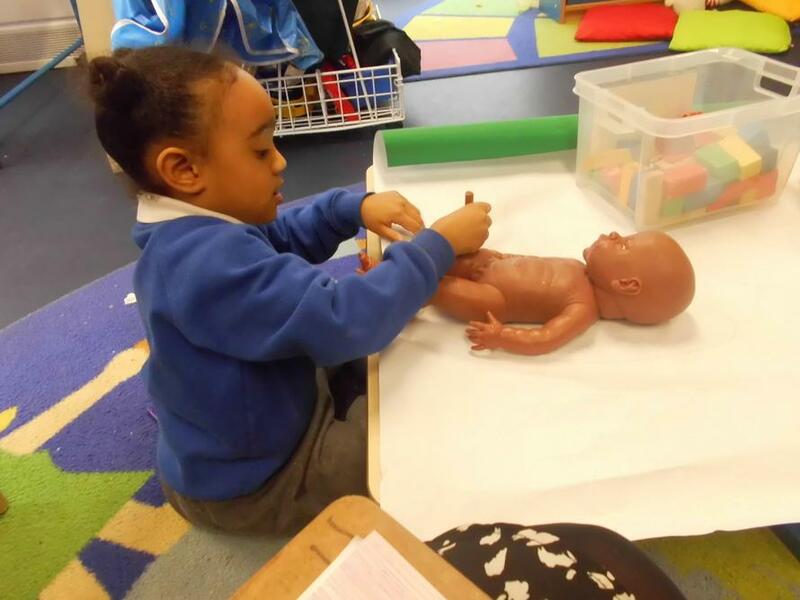 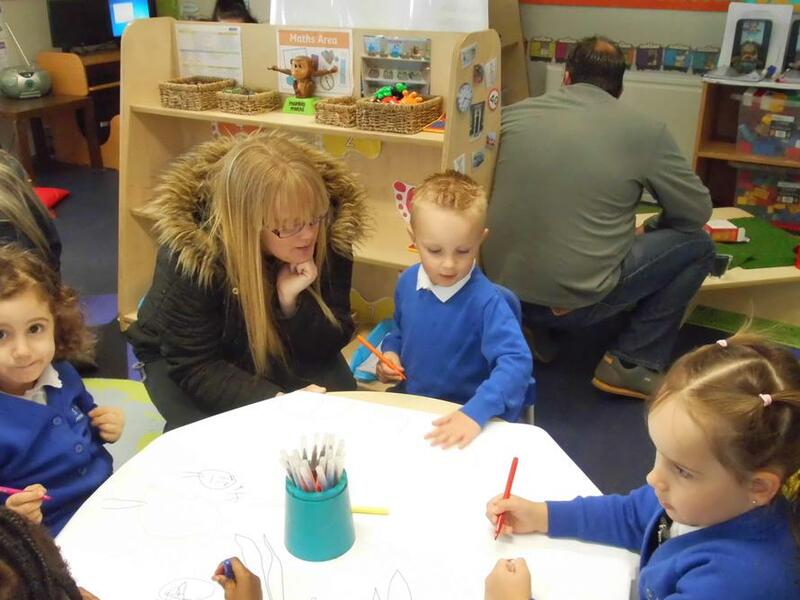 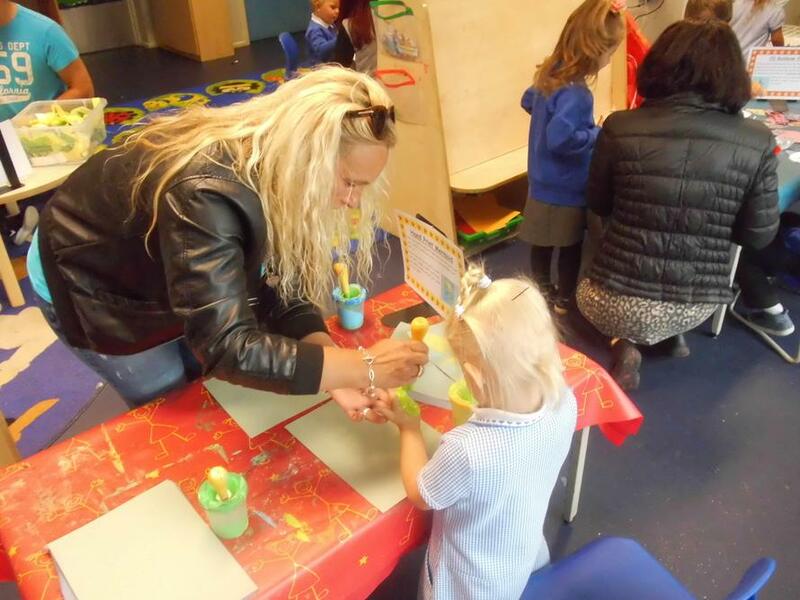 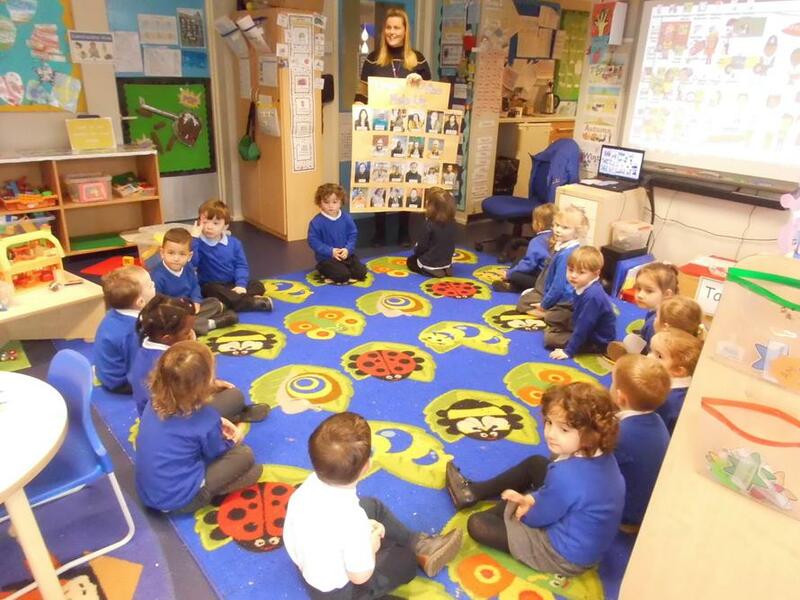 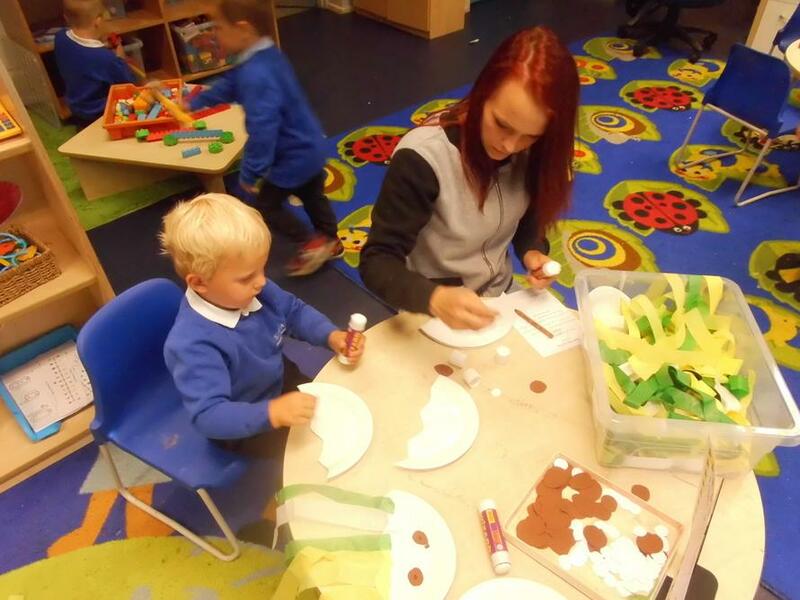 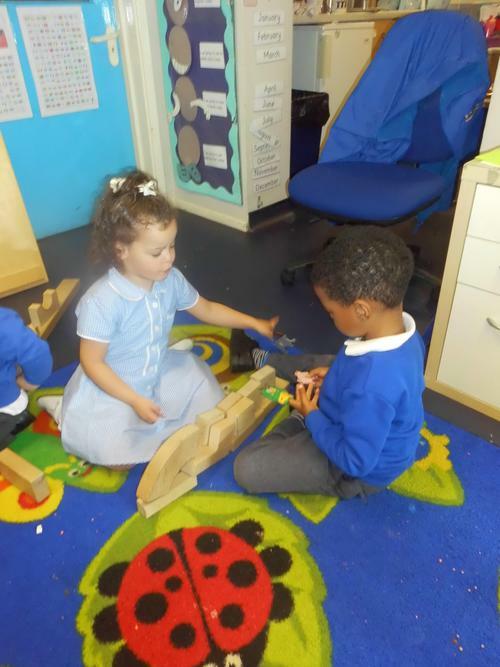 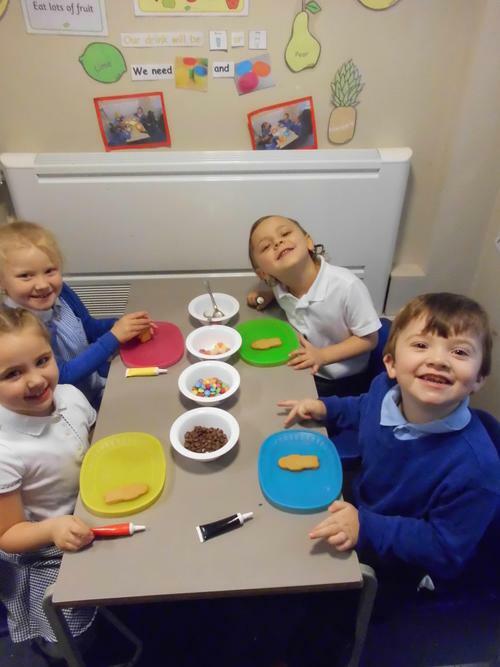 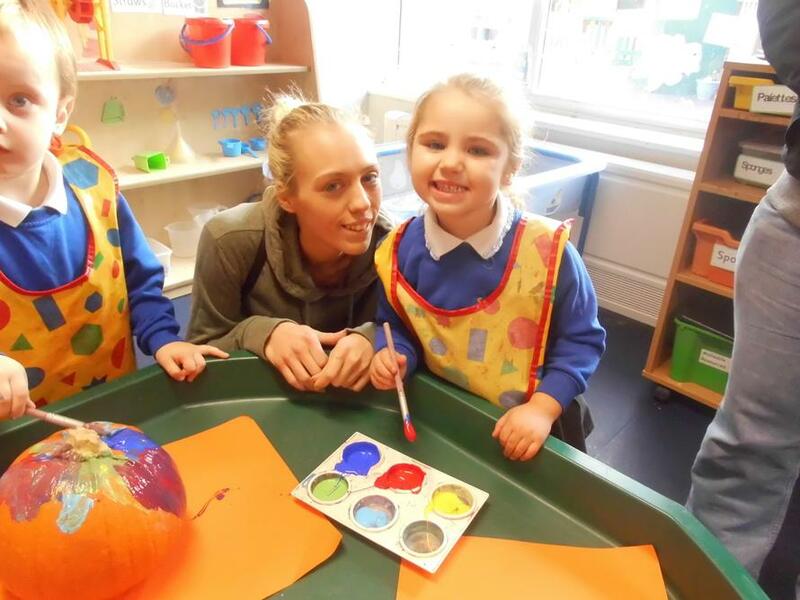 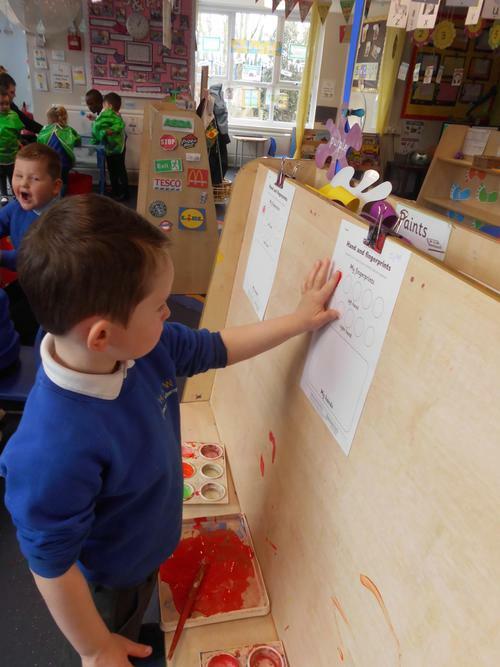 On Tuesday 17th October, the early years had a stay and play session for all children and their parents in the 2 reception classes and Nursery class. 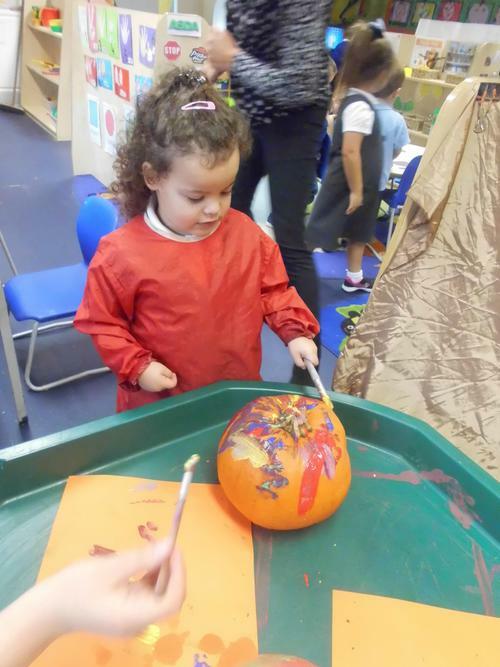 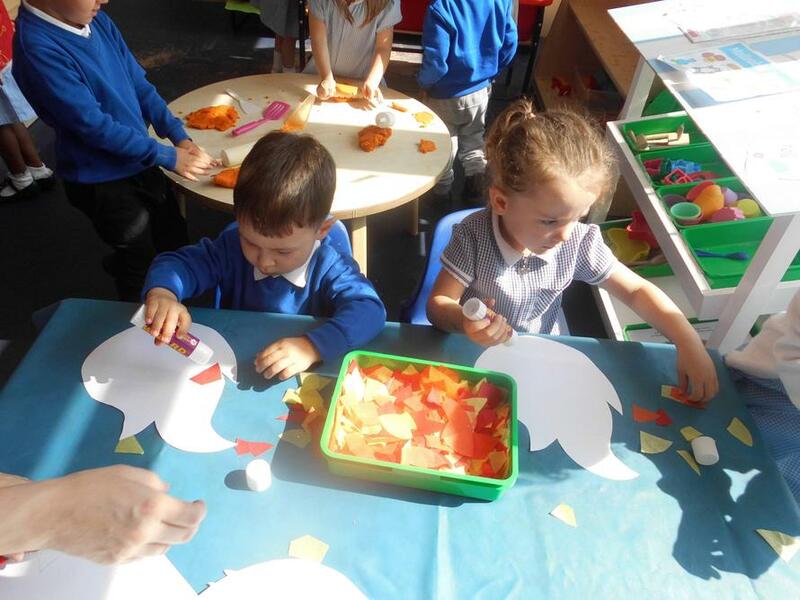 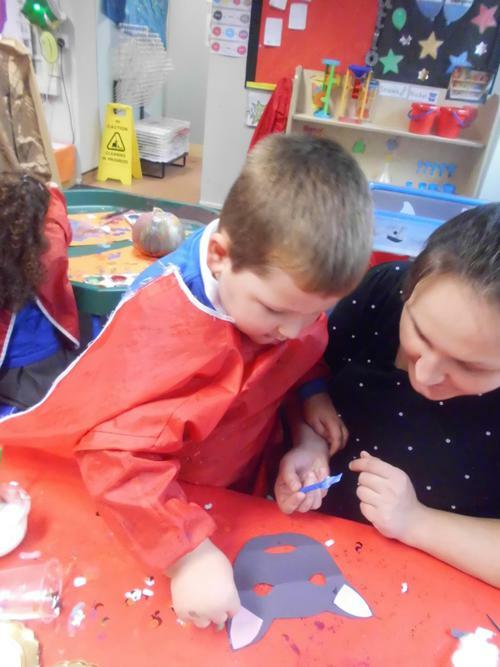 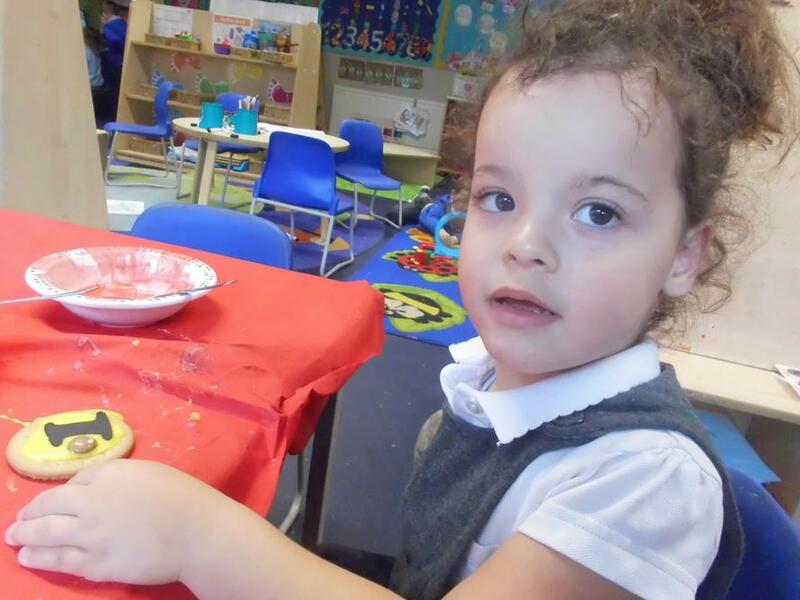 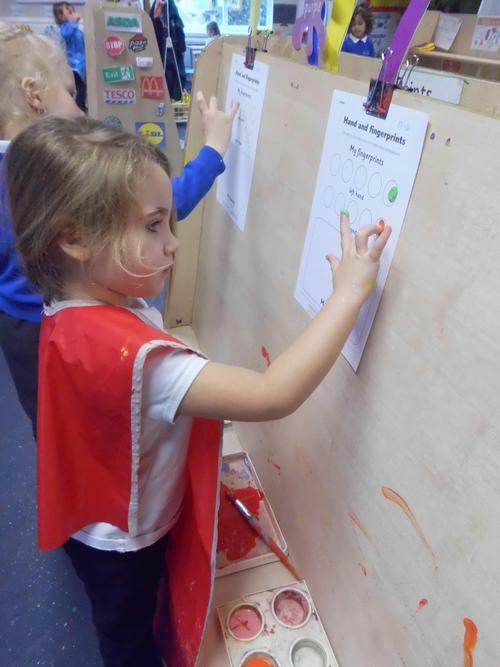 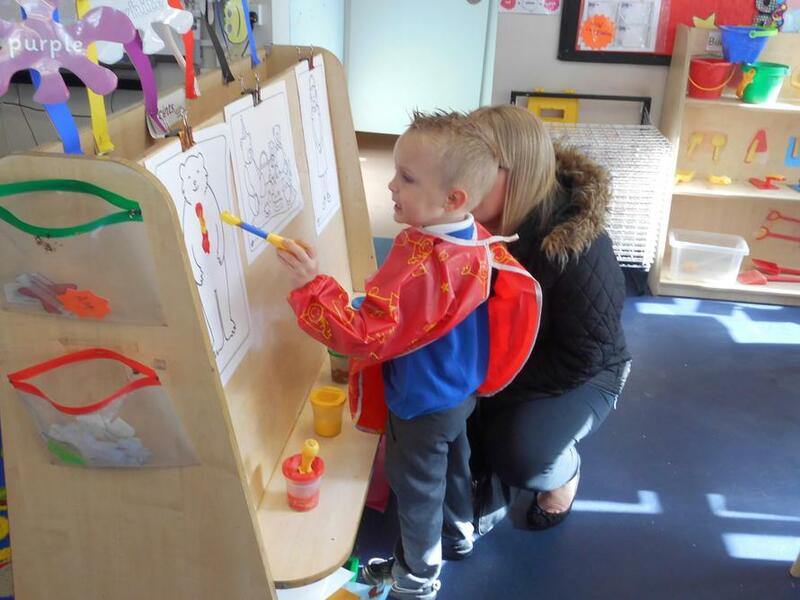 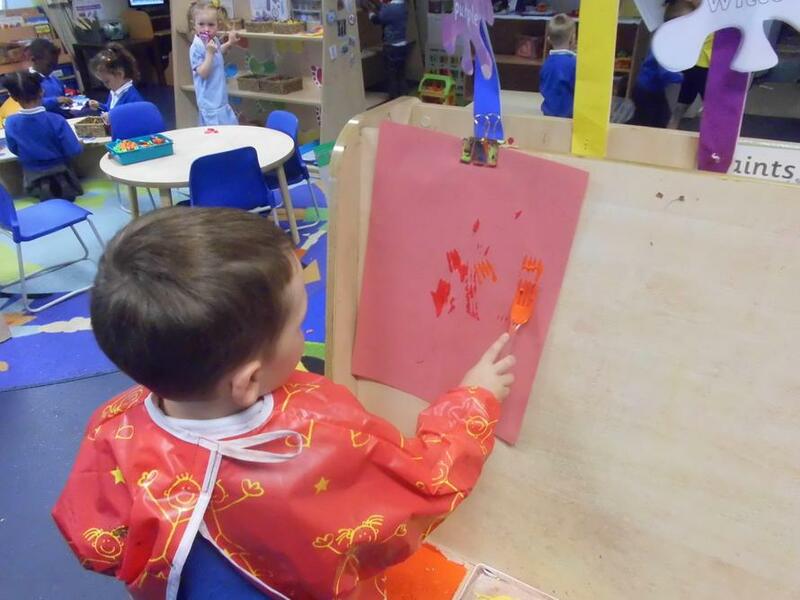 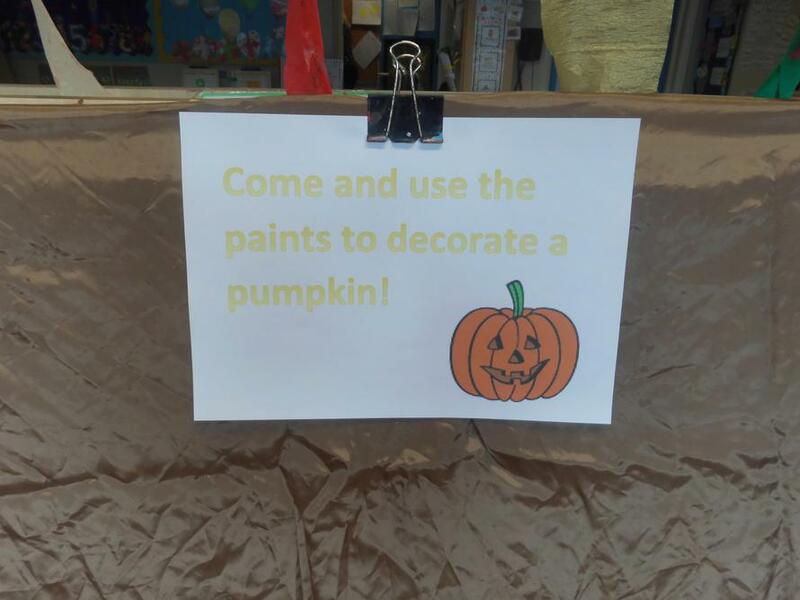 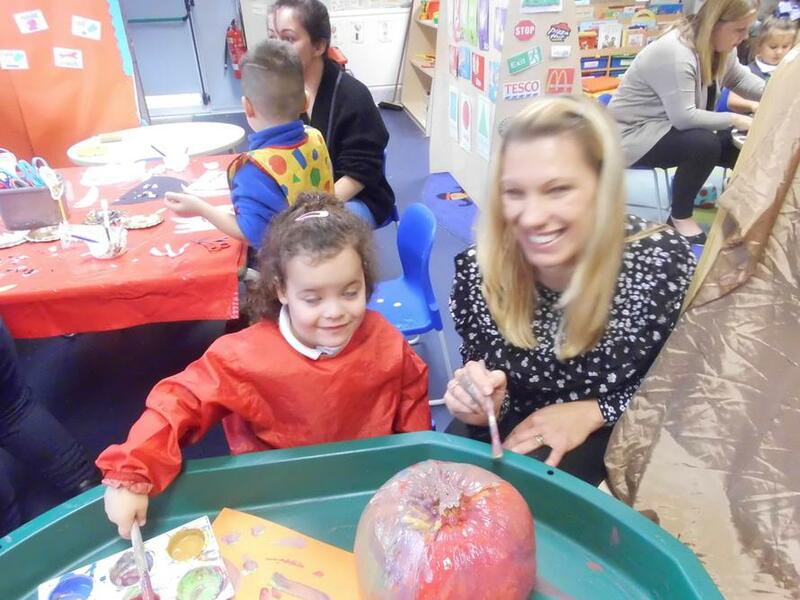 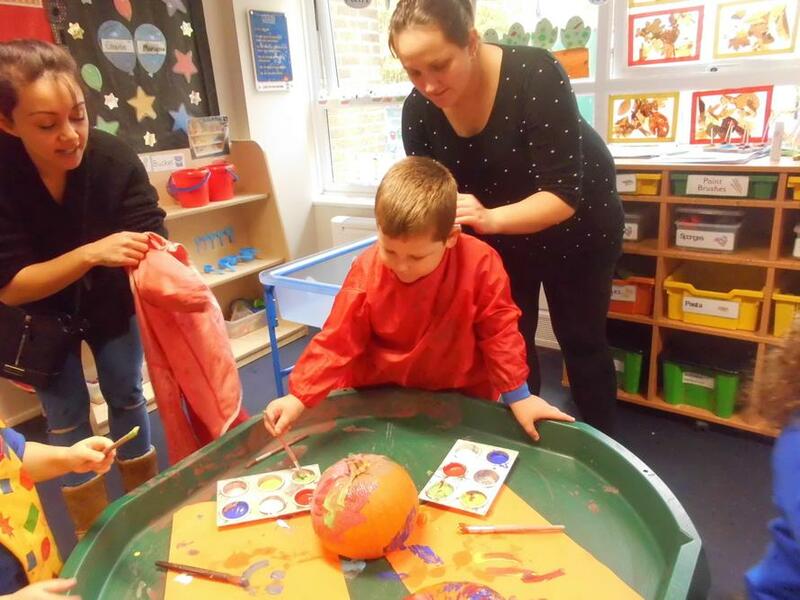 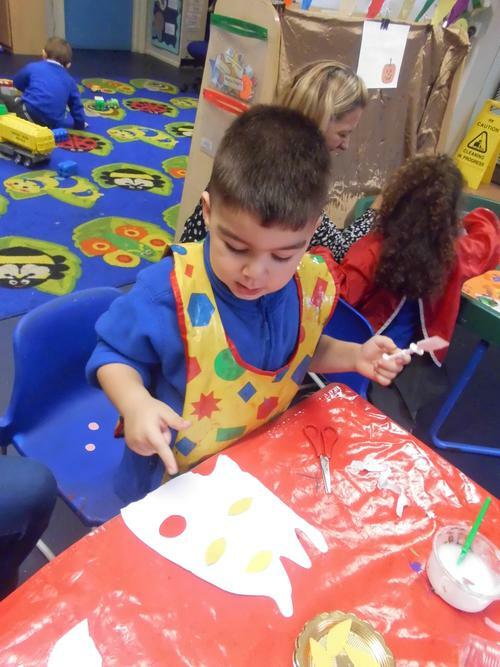 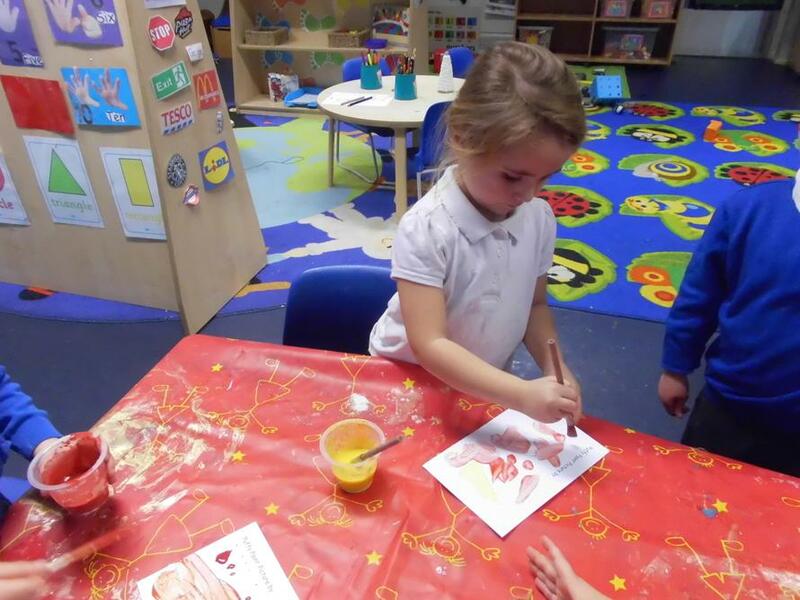 The children in Nursery had lots of Halloween themed activities to share with their parents! 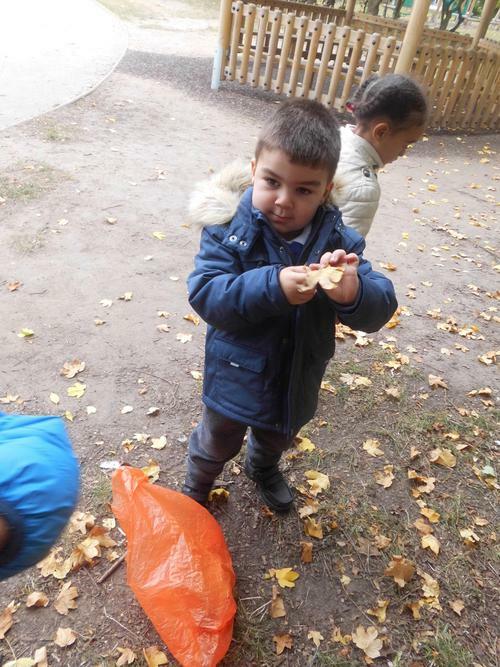 This half term our topic is 'In the woods' and we will be continuing our discussion about the changes that the seasons bring including the effect on animals, plants and ourselves e.g. 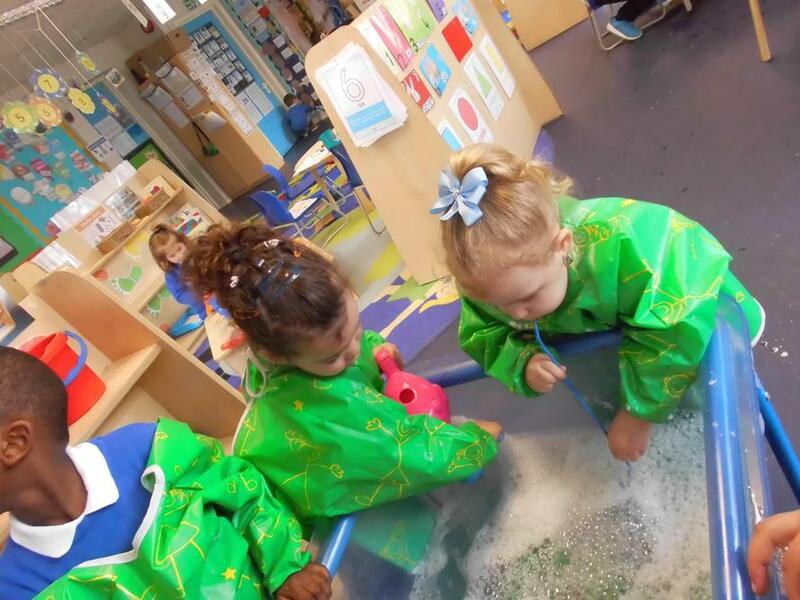 what clothing do we need to wear as the weather changes. 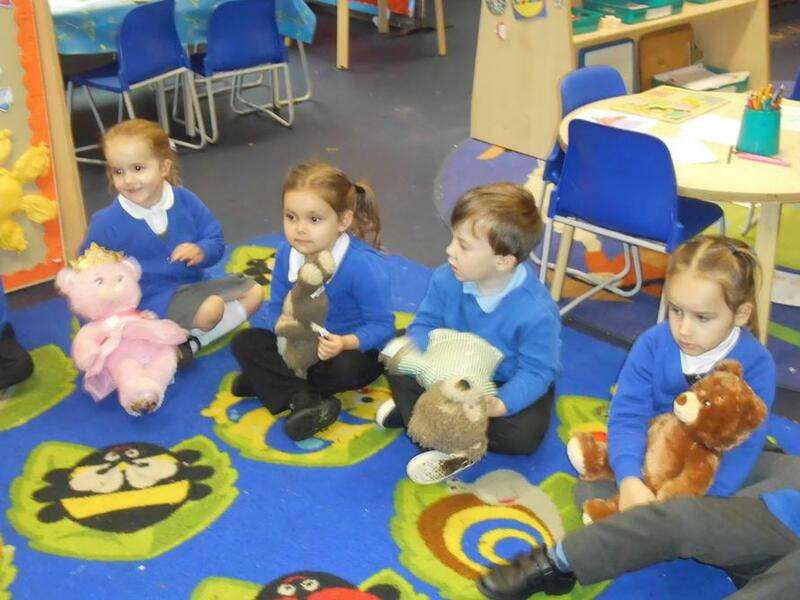 We will be reading and sharing stories with various woodland creatures in e.g. 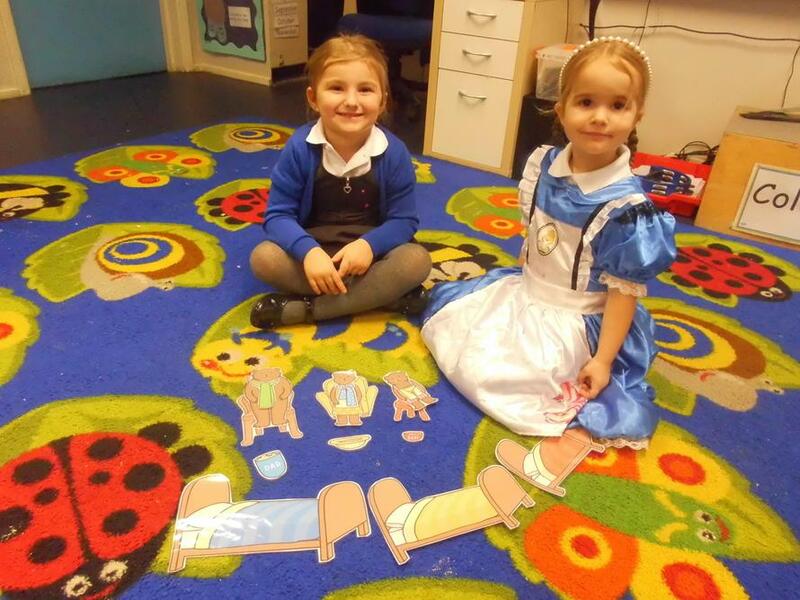 the Gruffalo, the three bears, Old bear stories and lots of others. 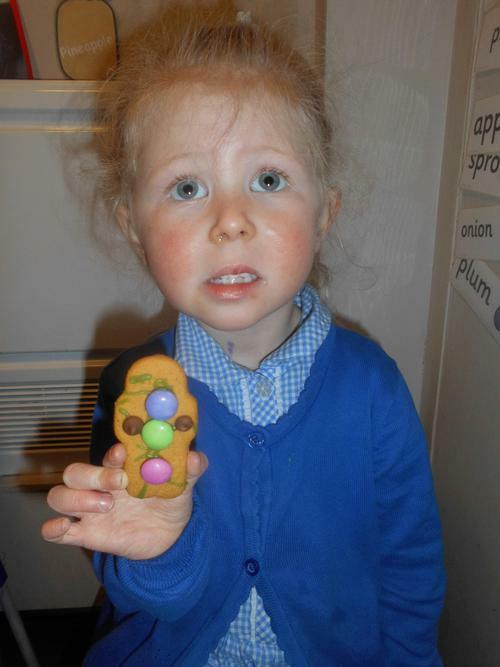 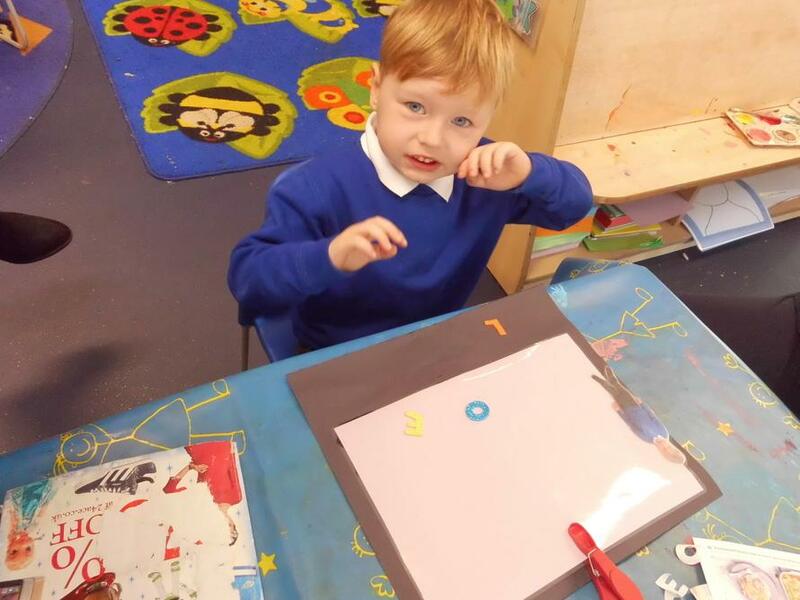 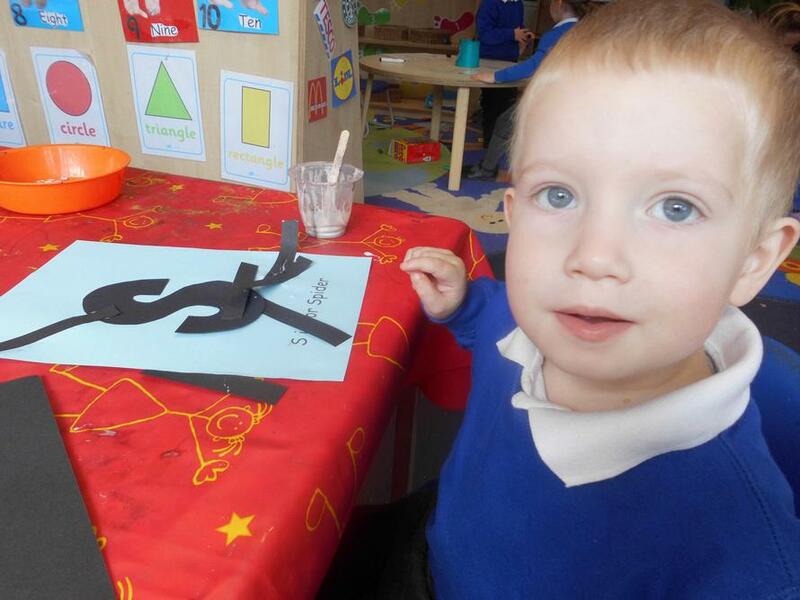 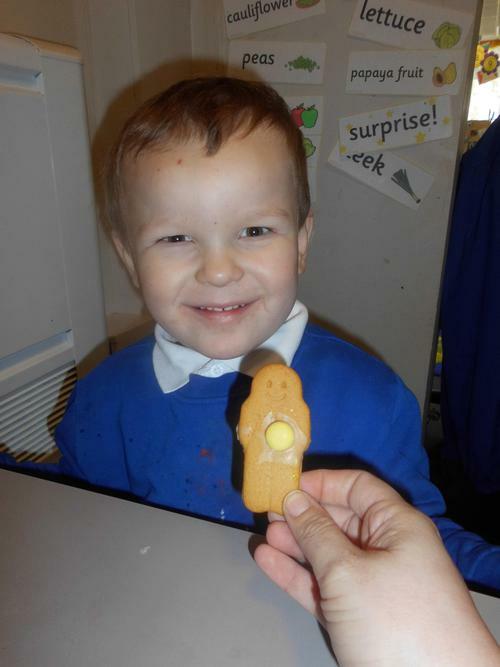 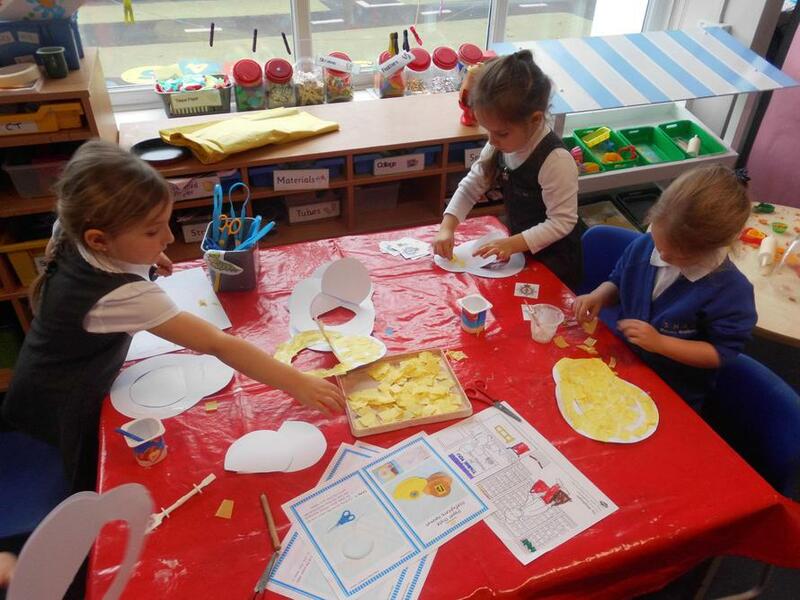 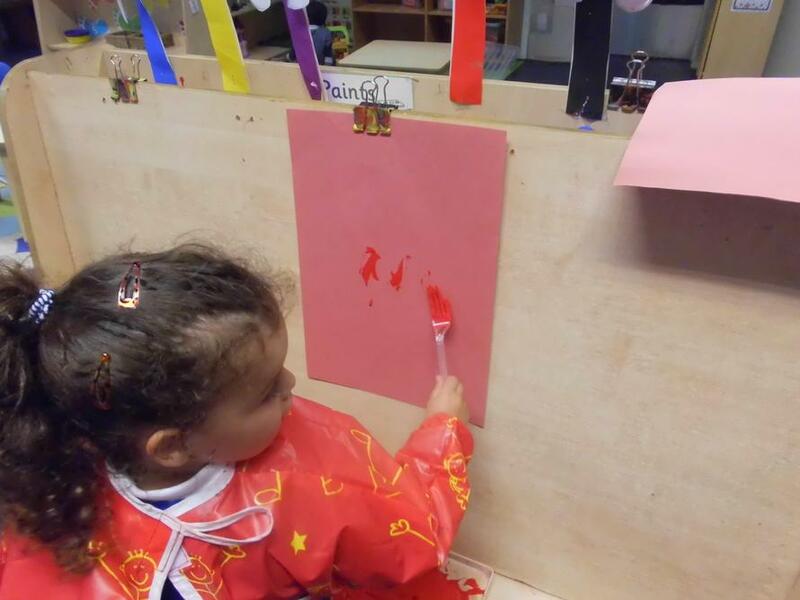 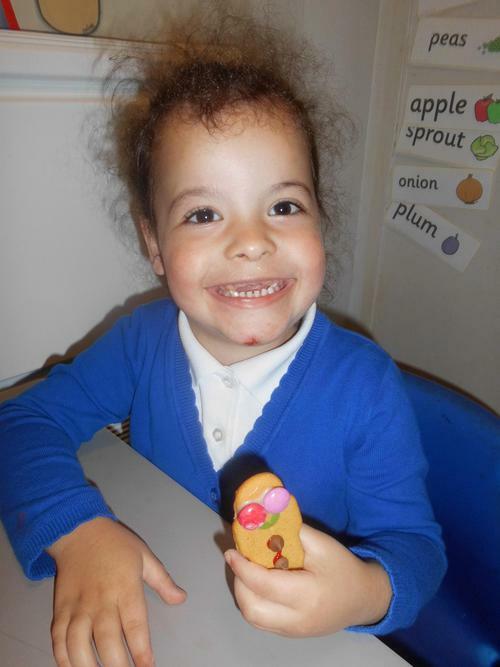 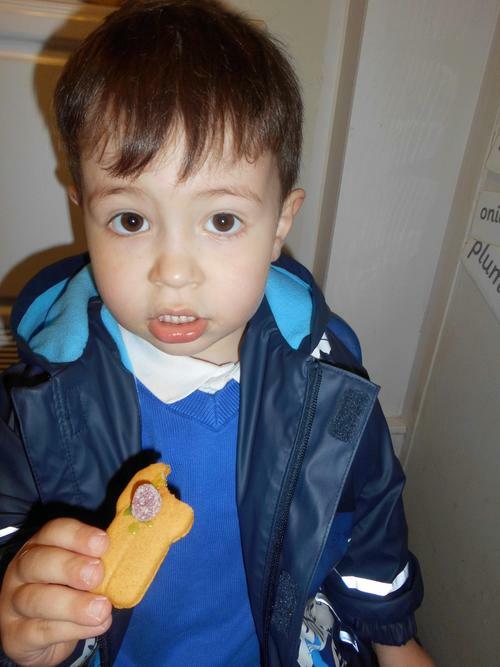 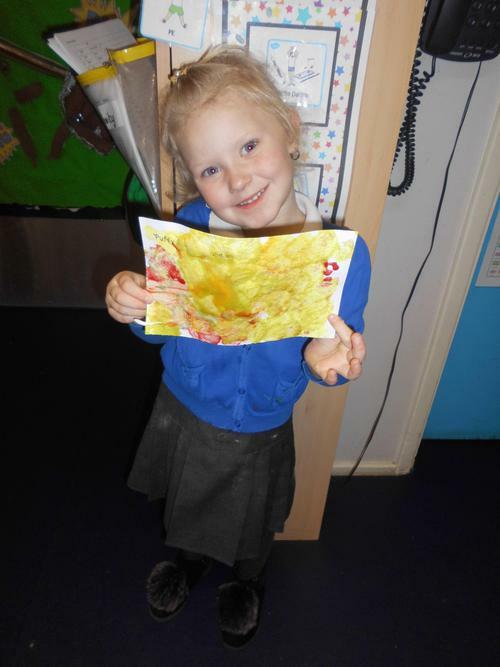 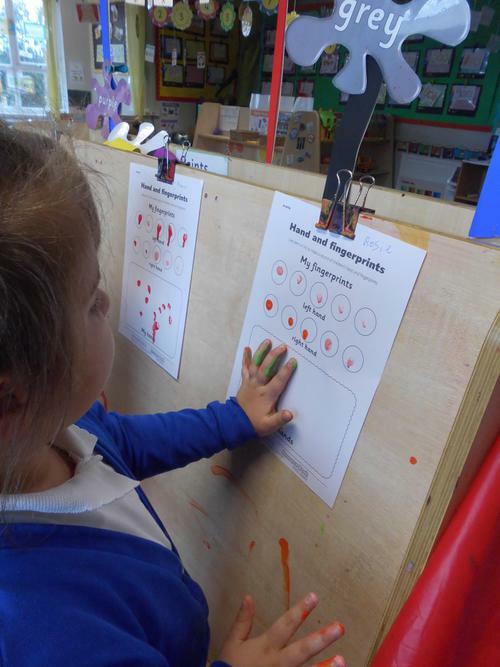 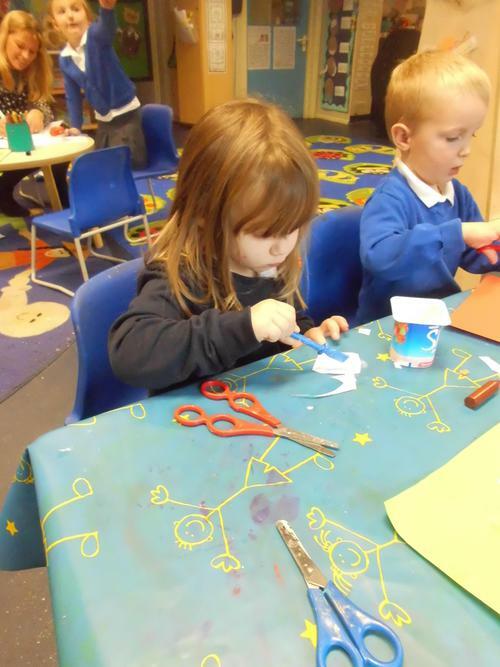 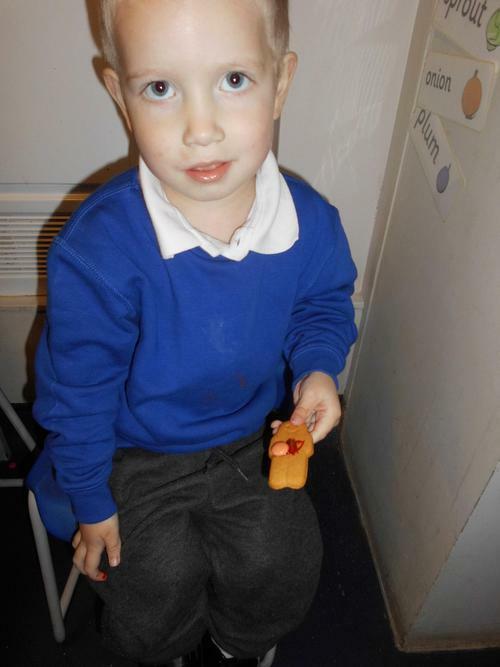 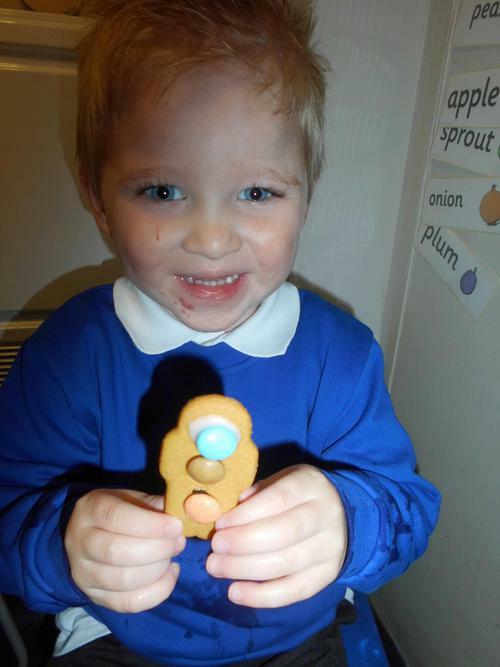 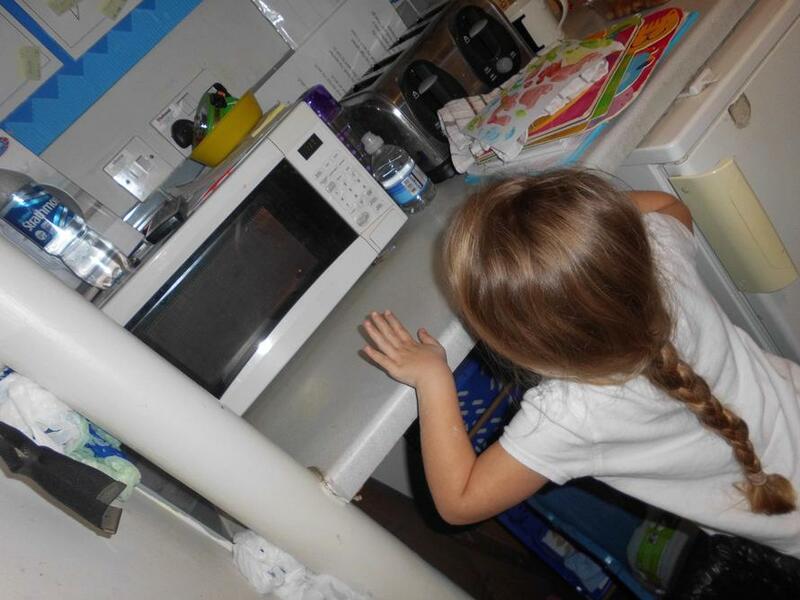 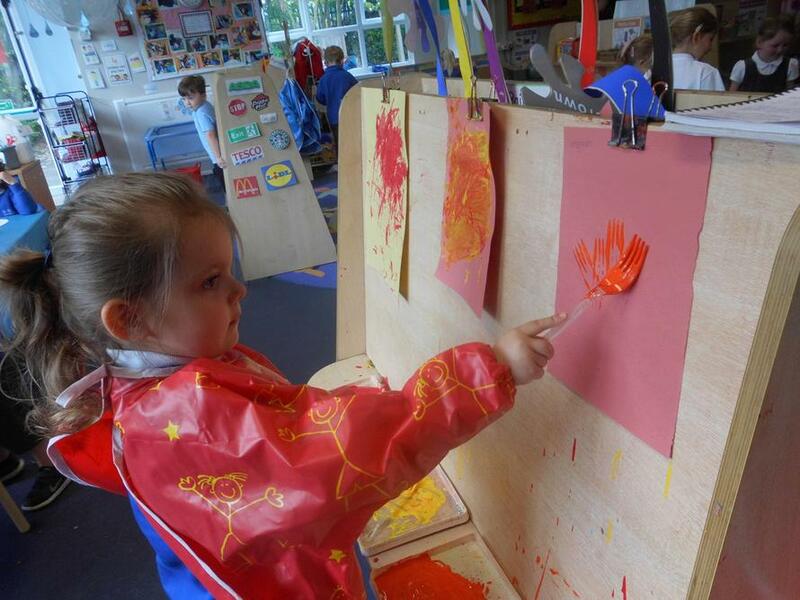 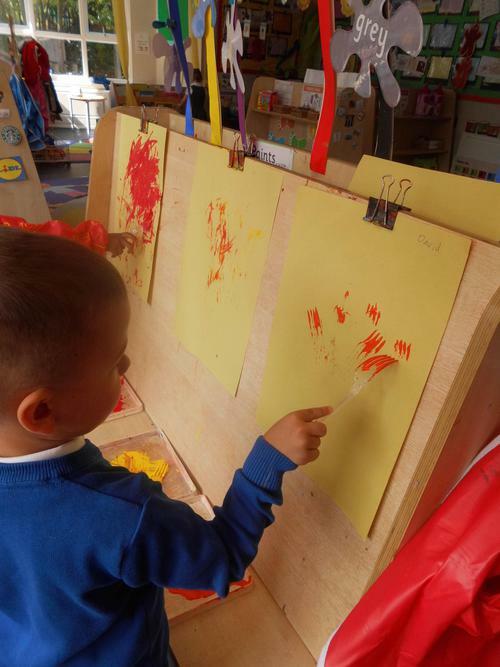 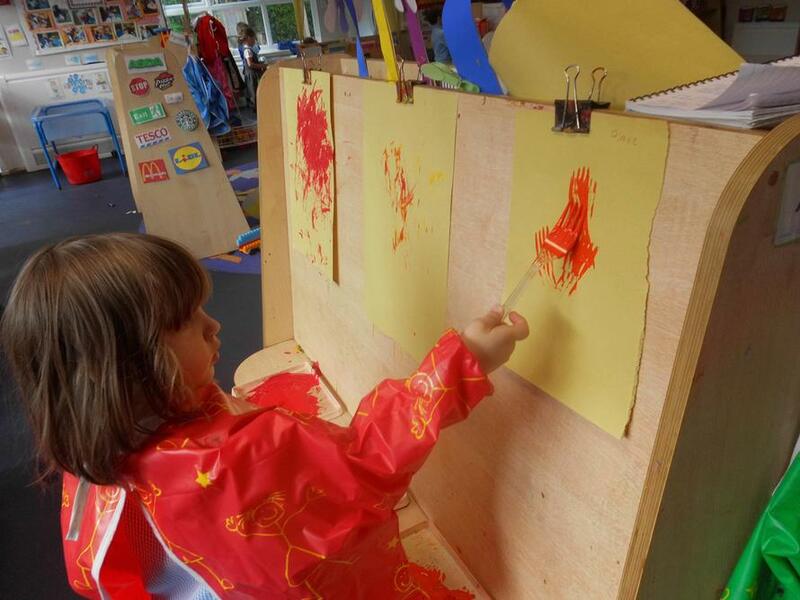 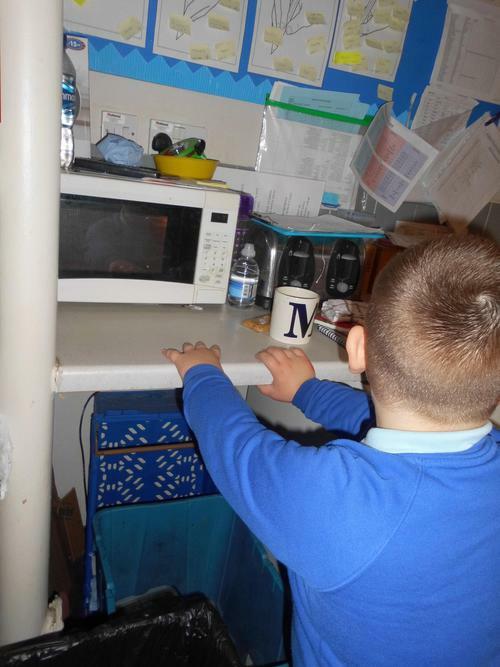 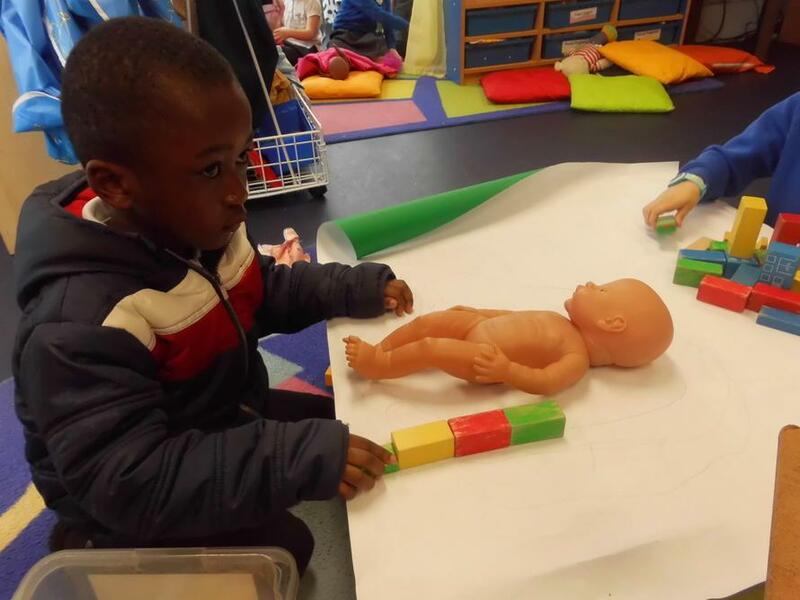 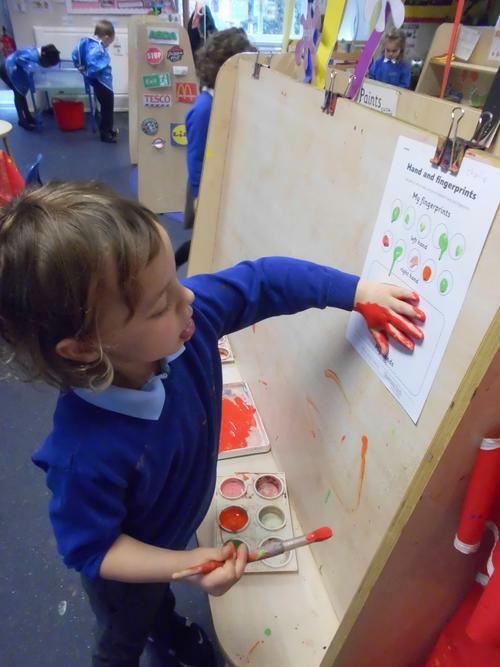 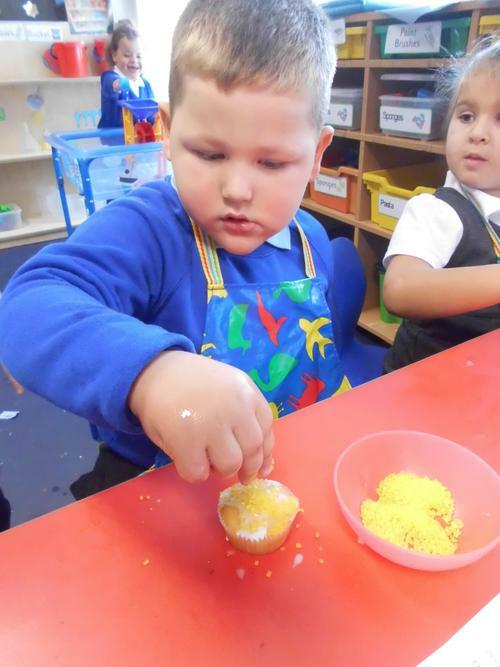 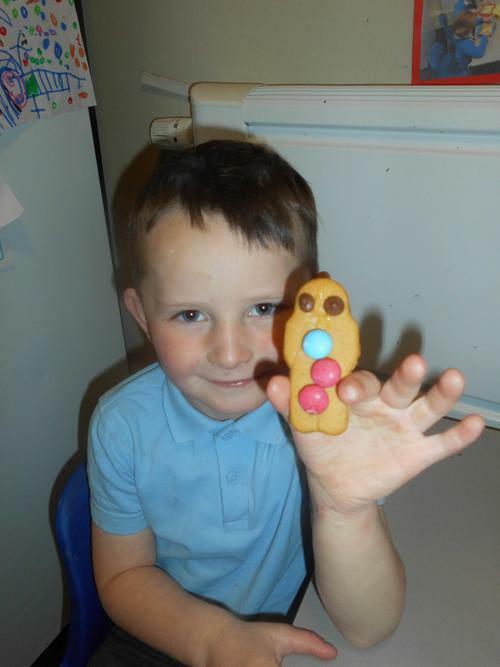 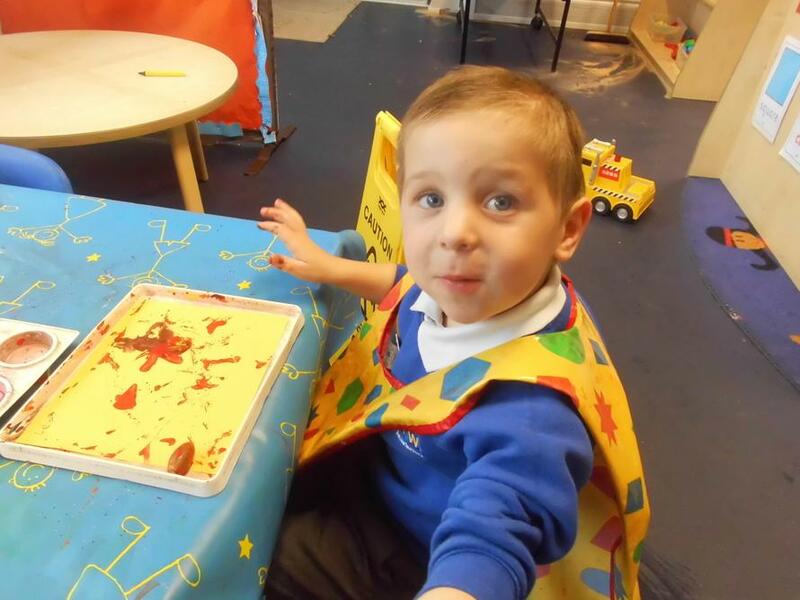 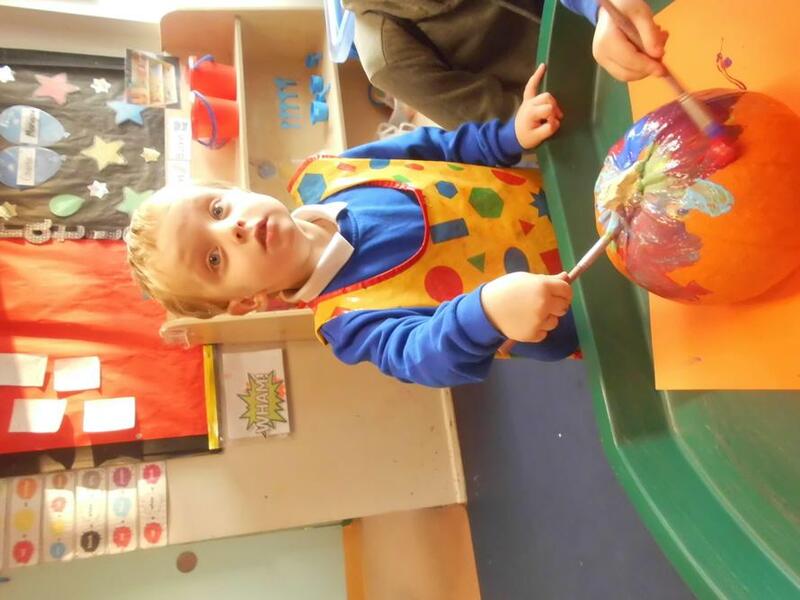 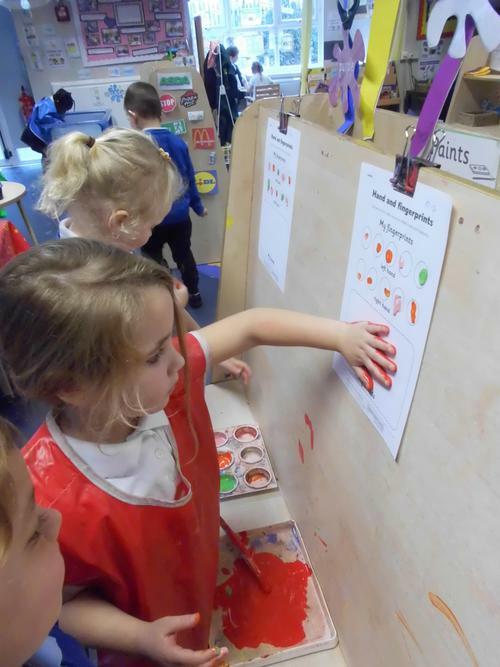 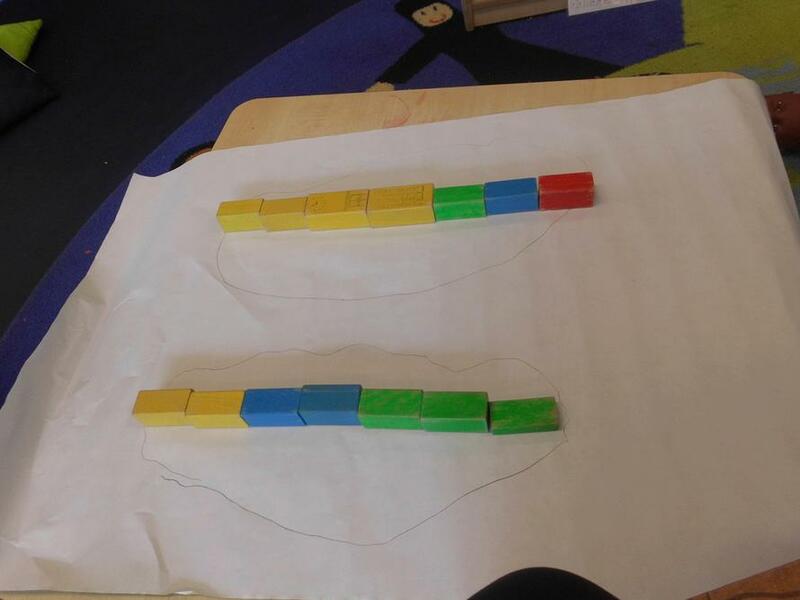 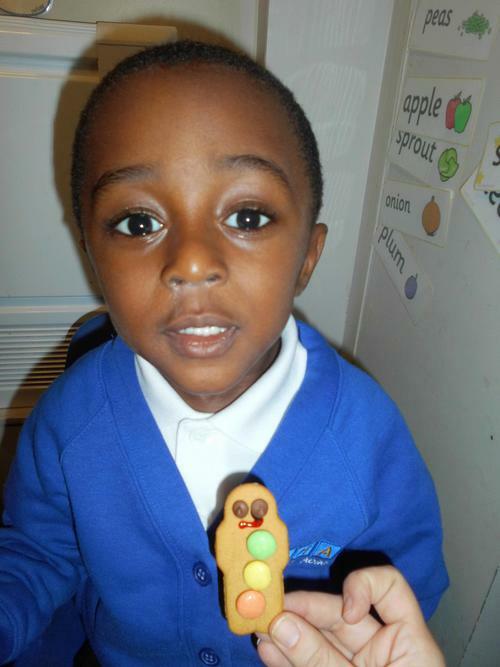 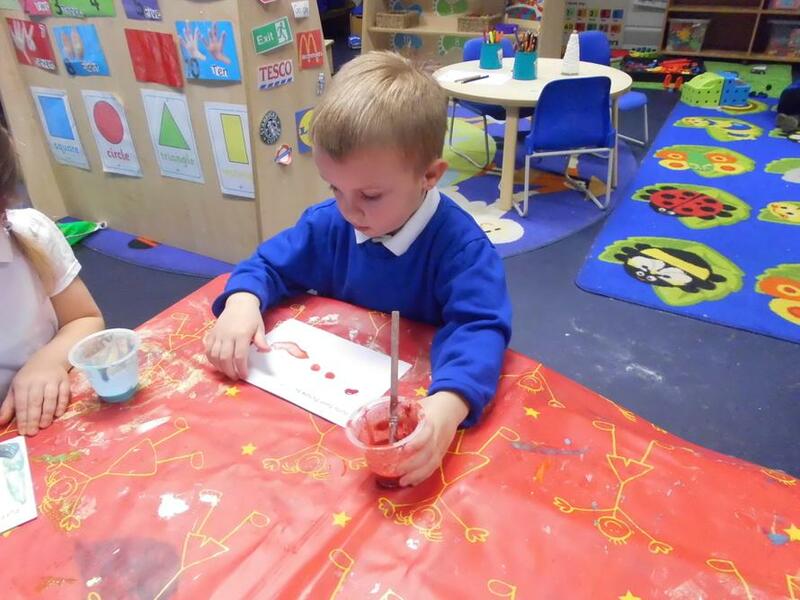 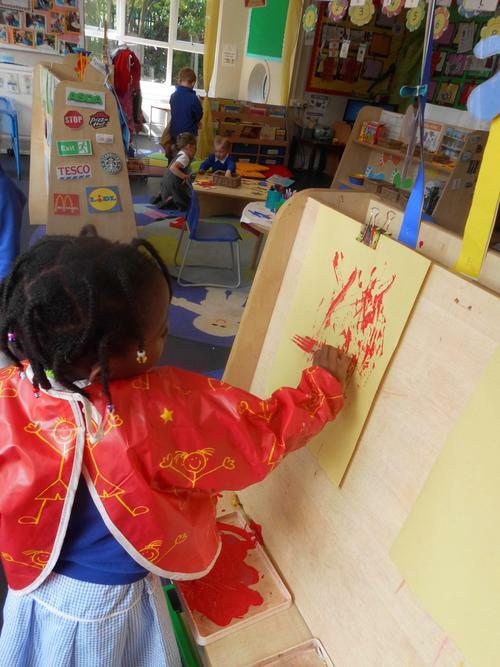 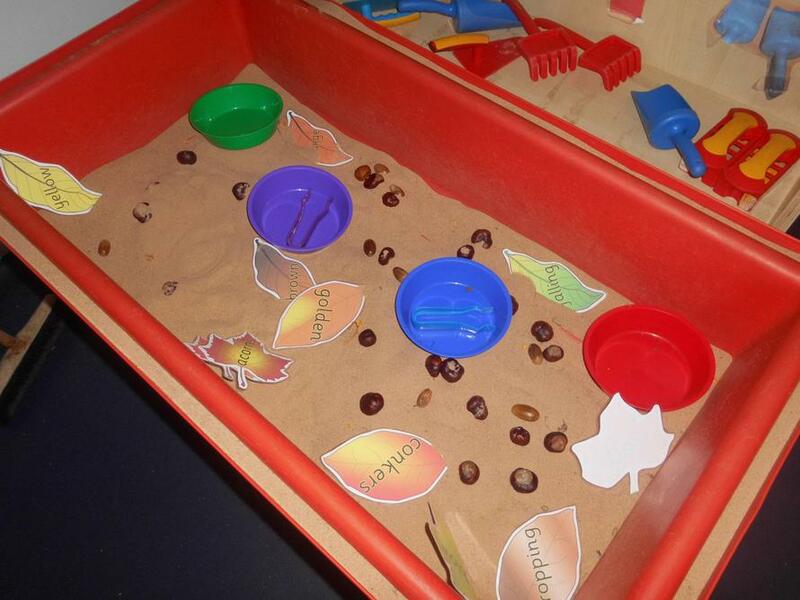 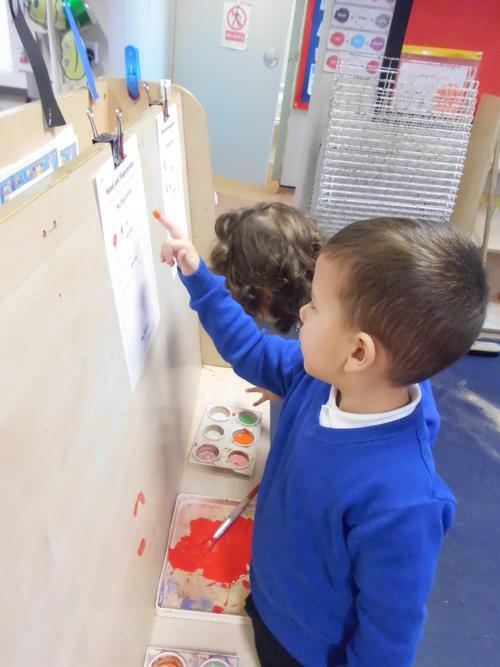 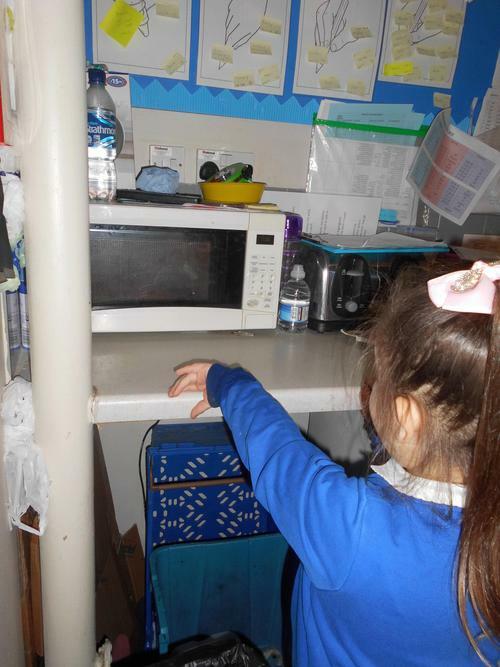 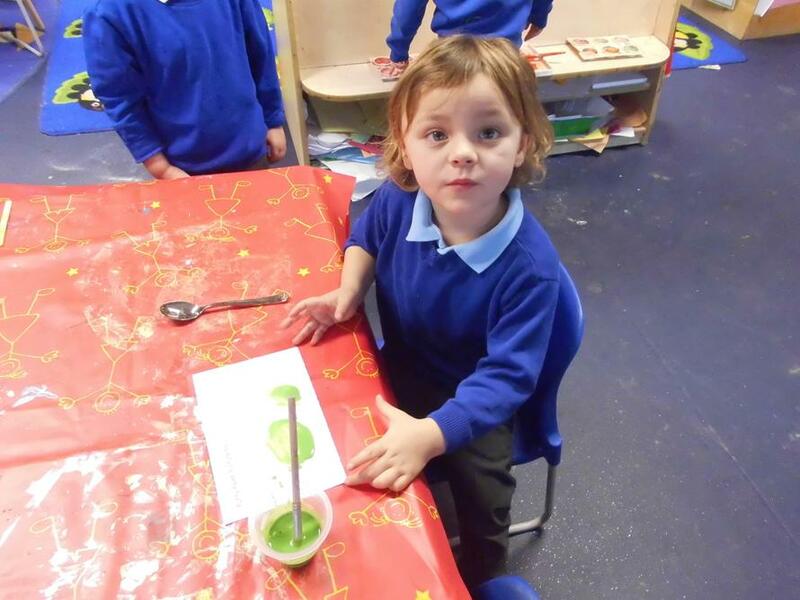 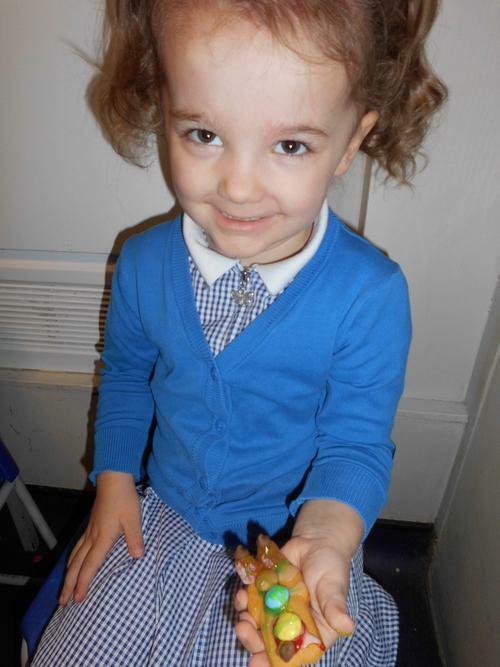 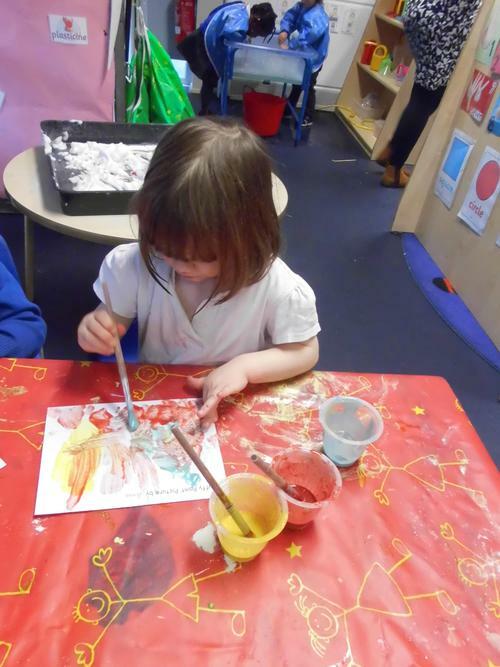 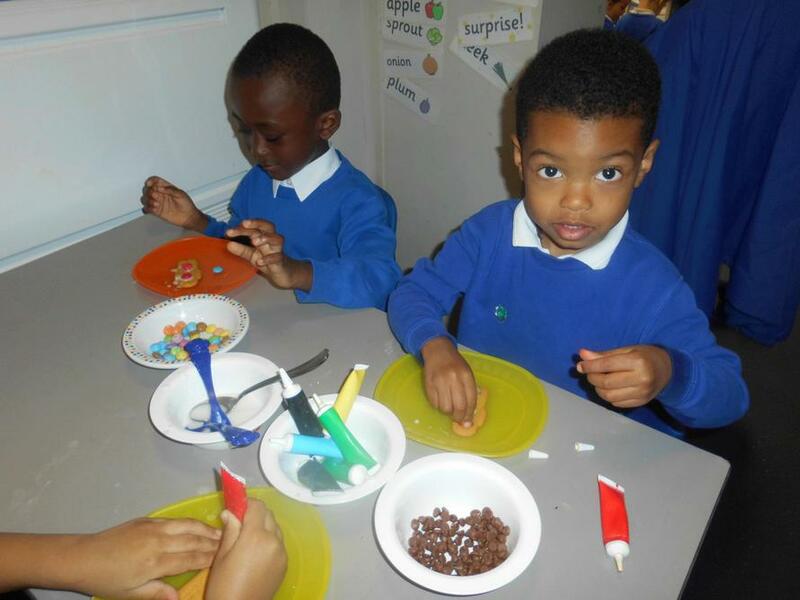 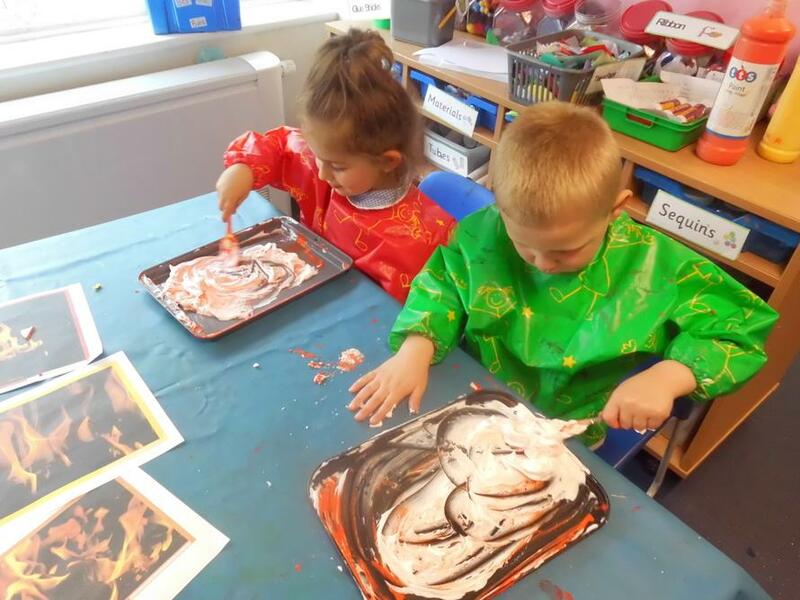 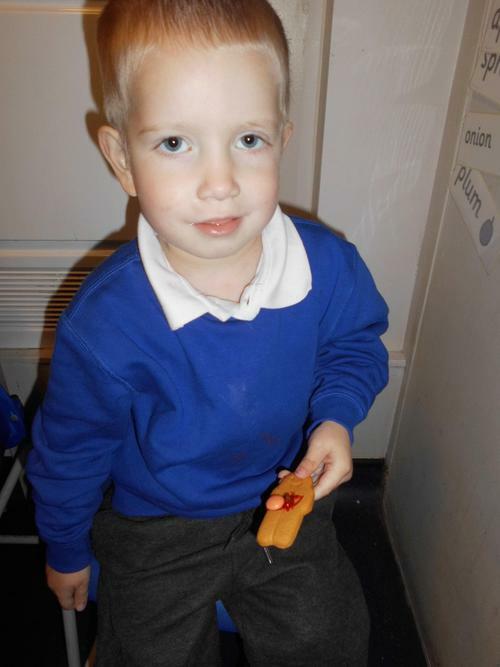 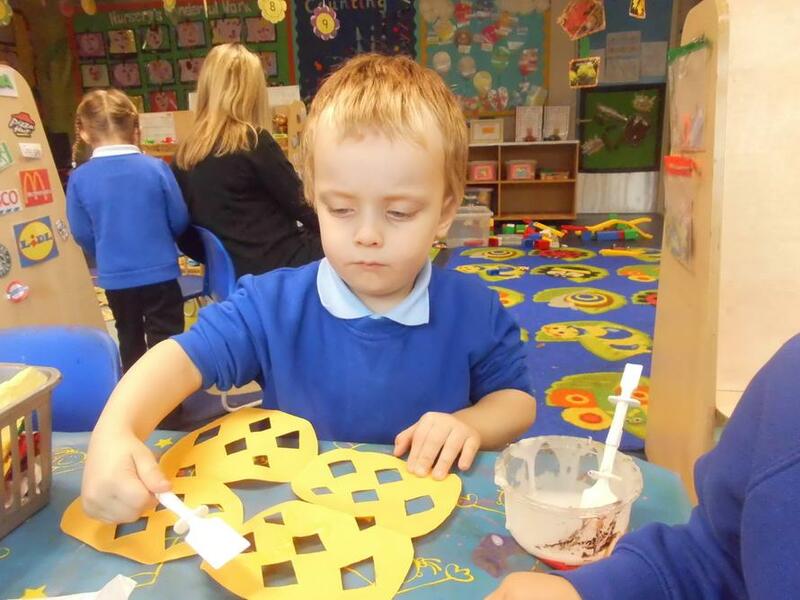 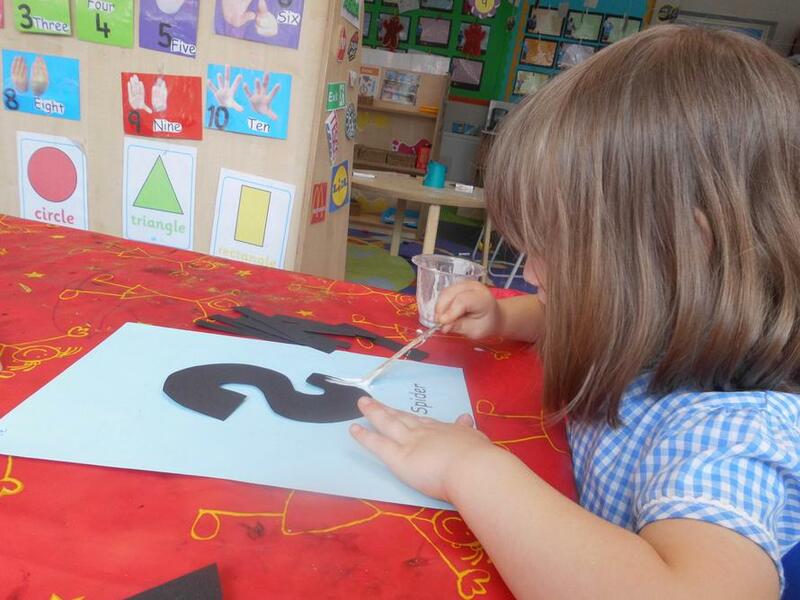 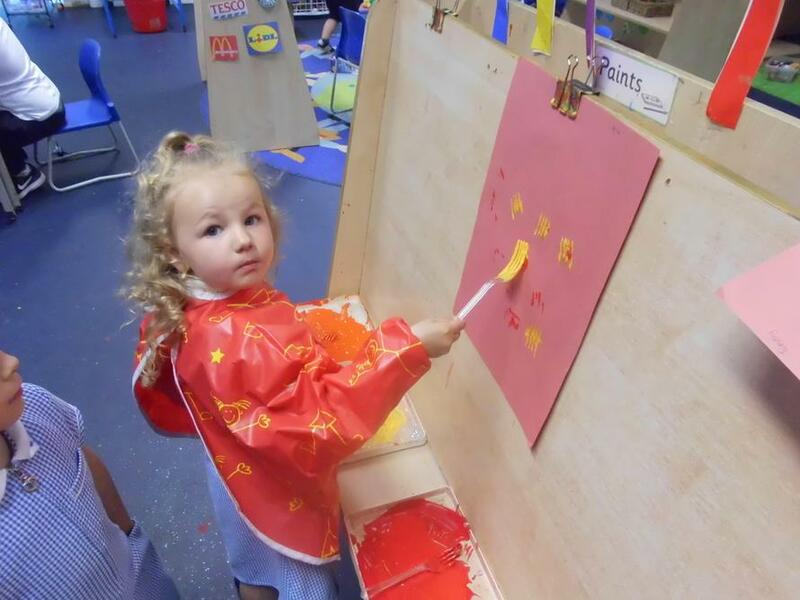 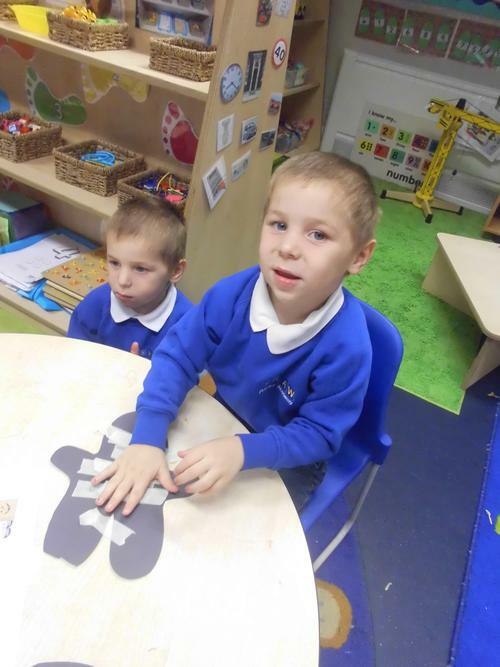 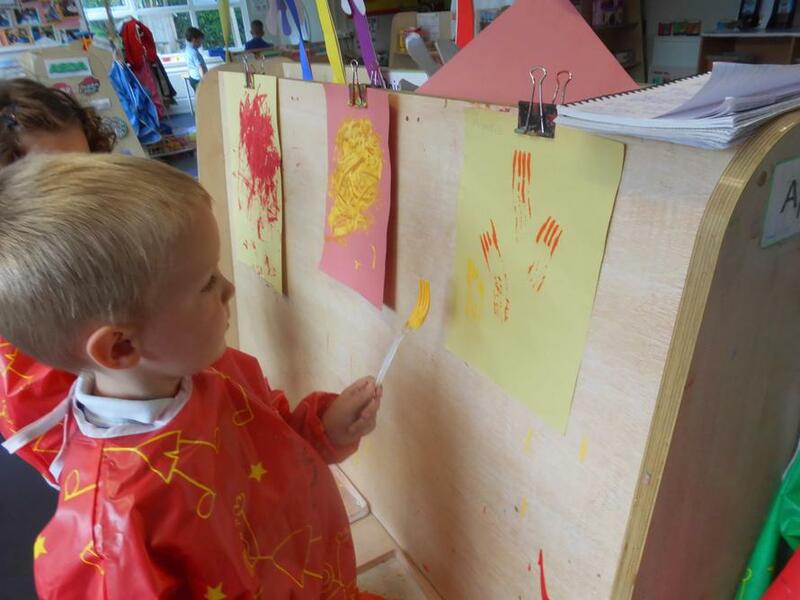 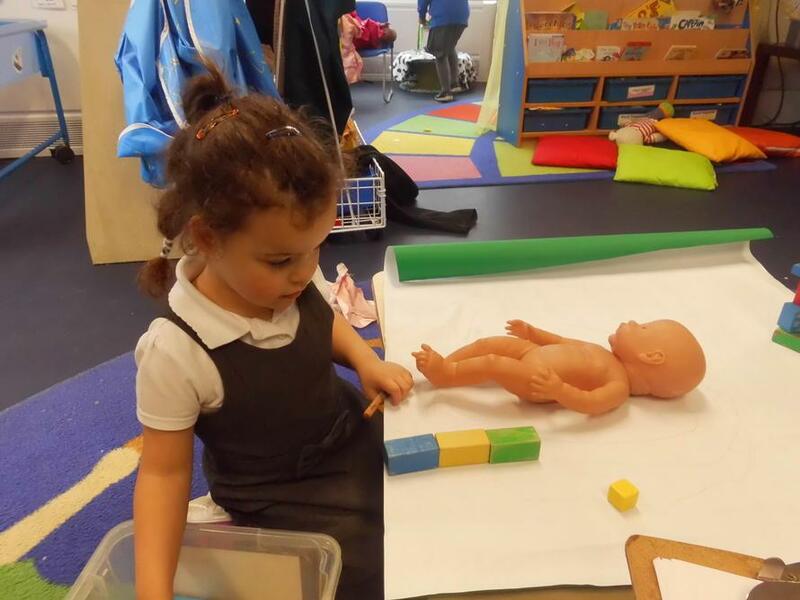 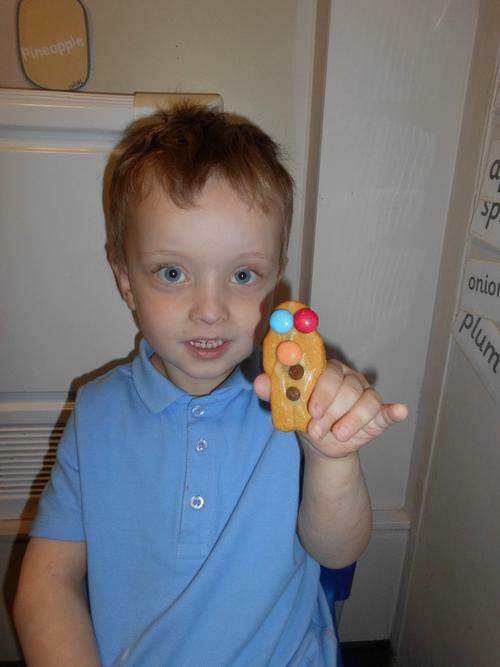 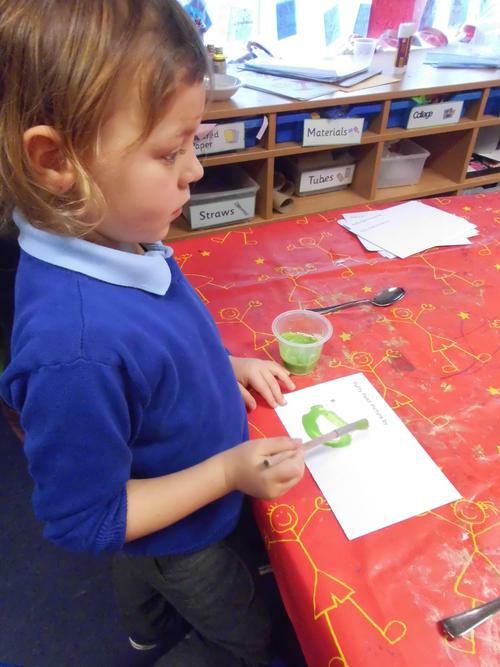 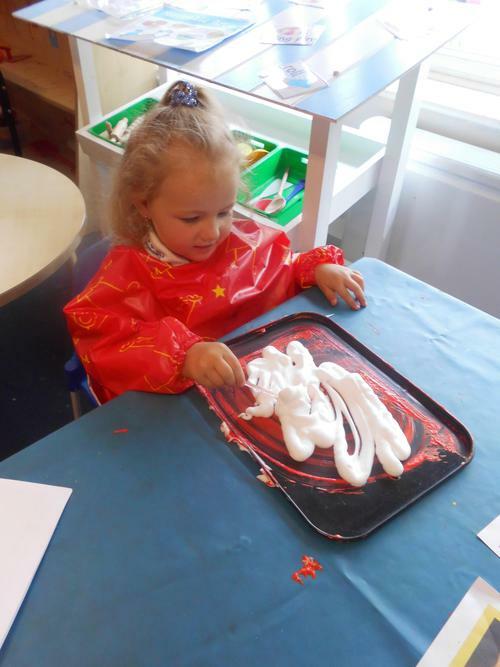 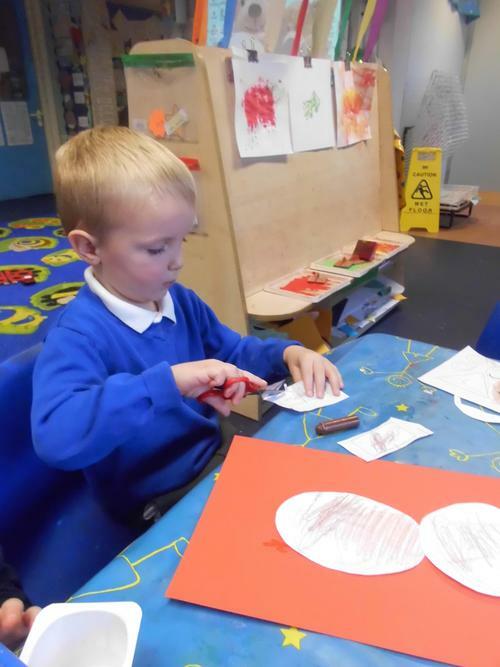 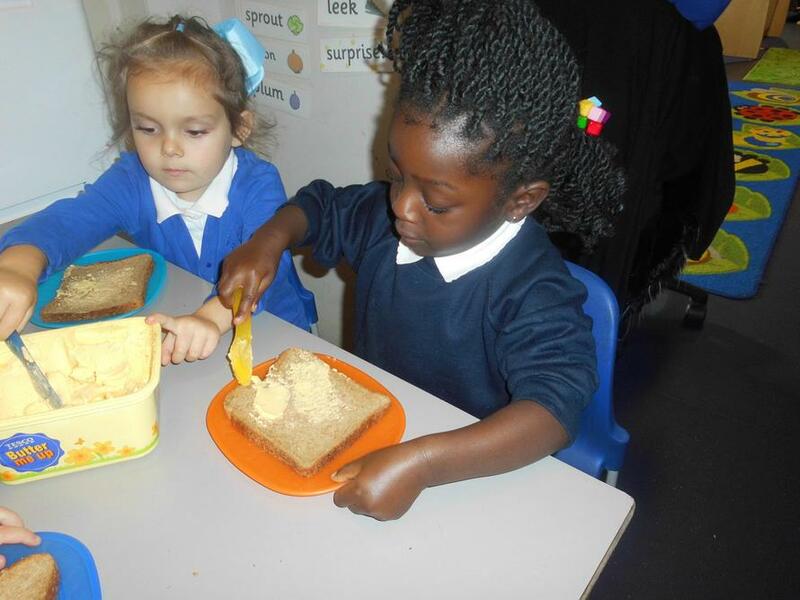 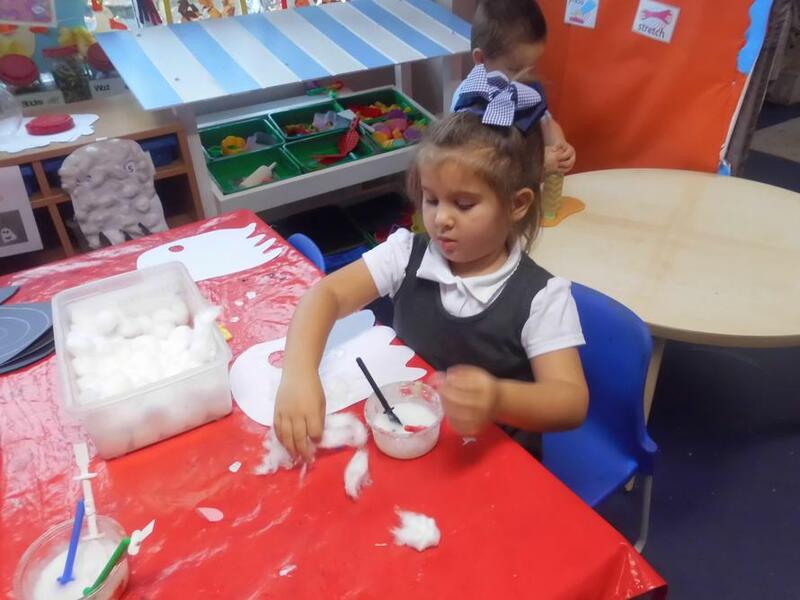 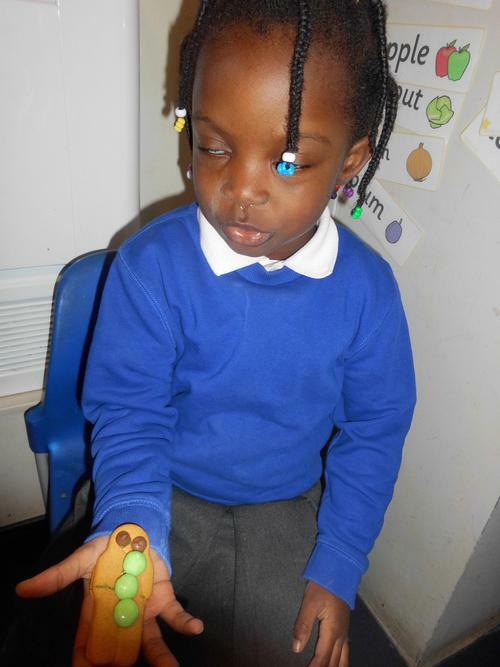 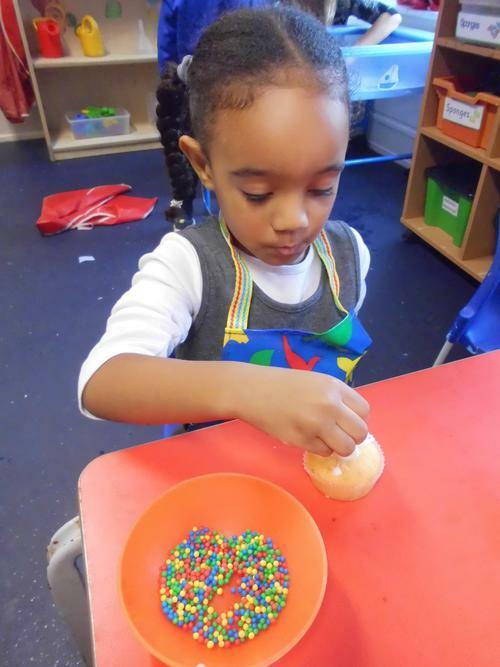 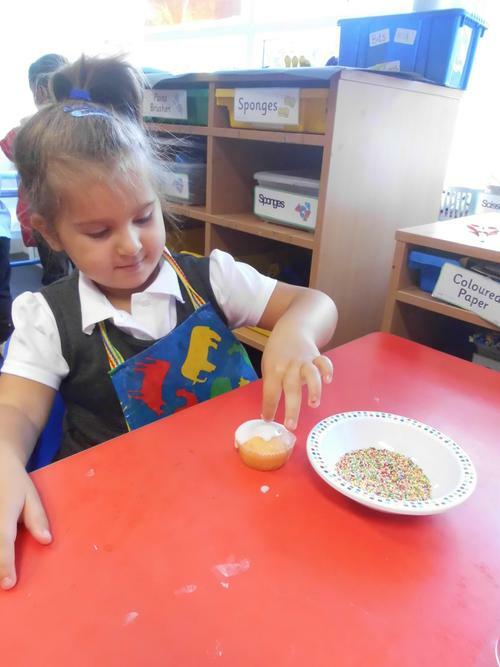 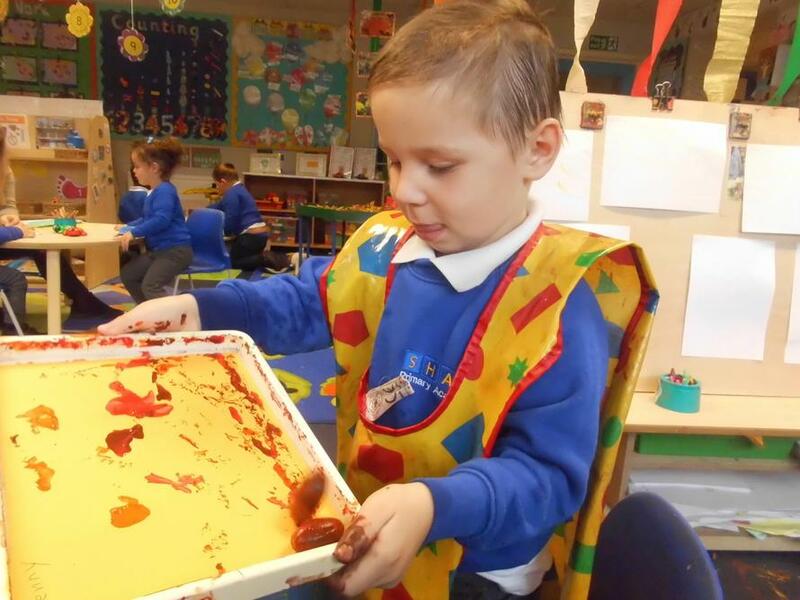 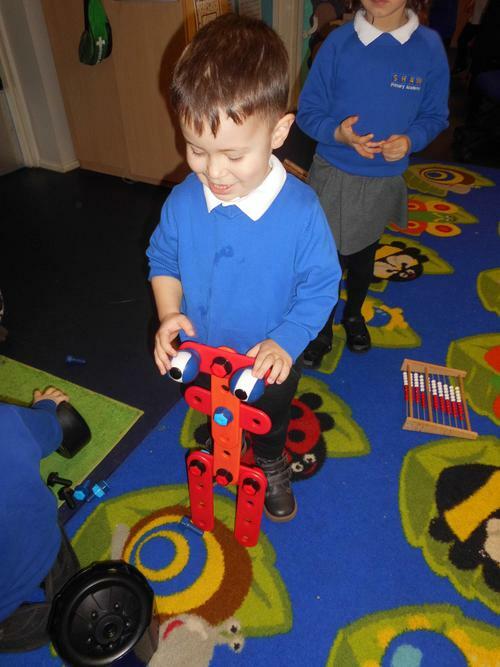 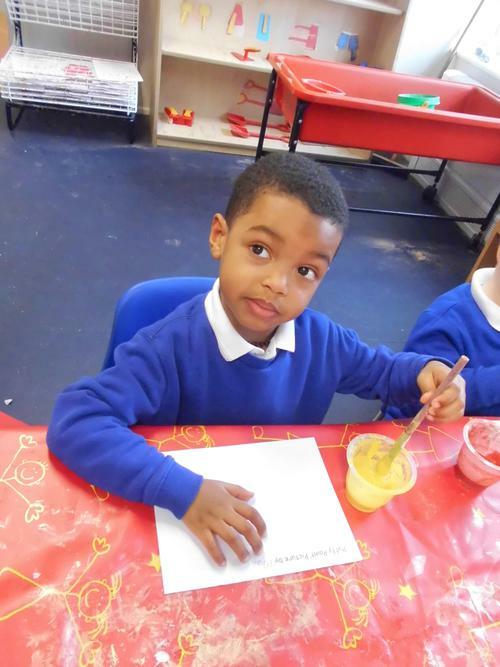 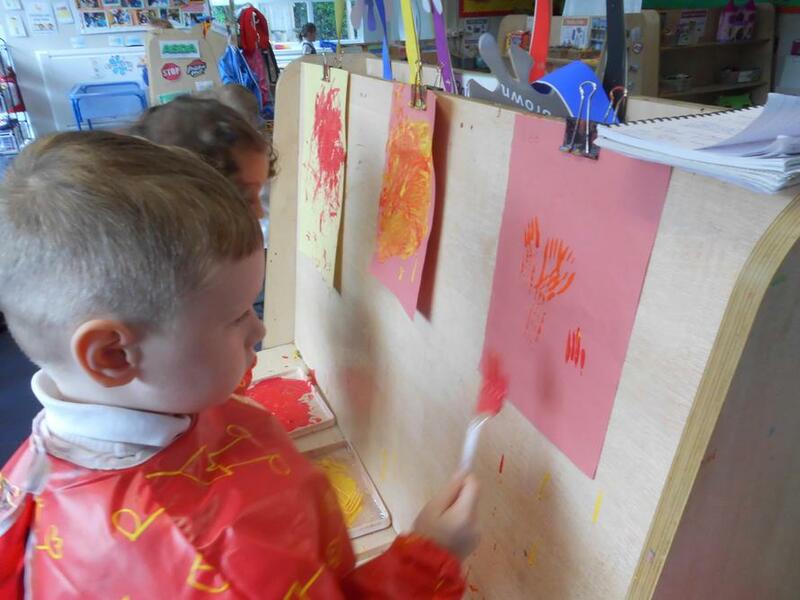 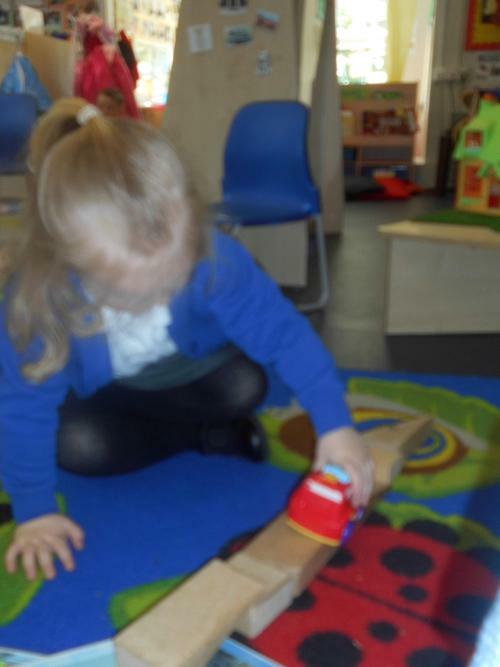 These pictures show some of the activities that the children in Nursery have been doing. 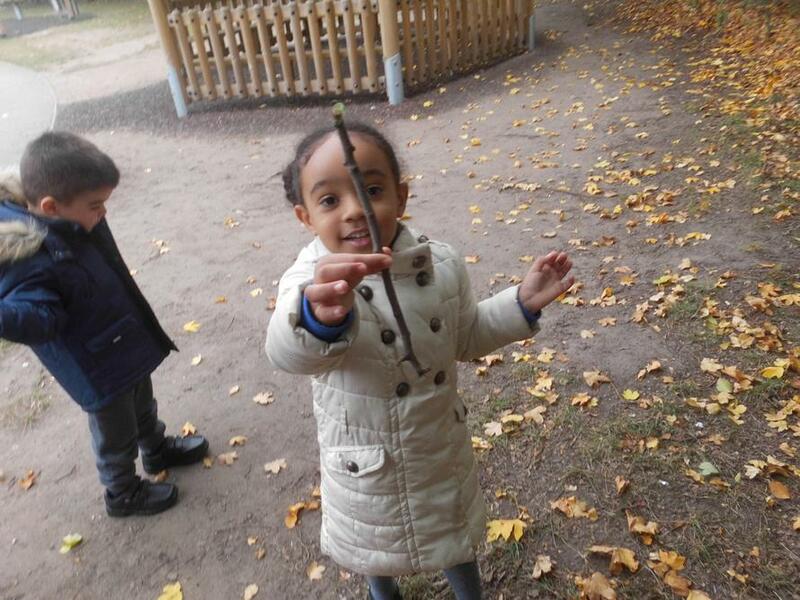 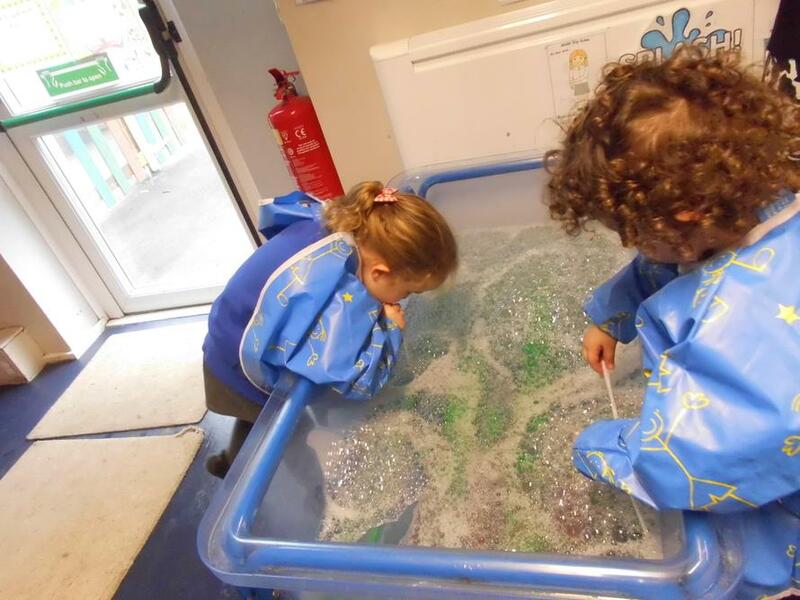 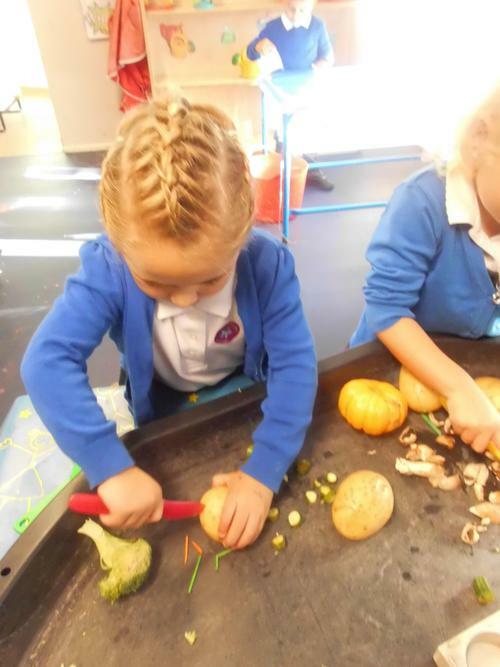 There have been a large number of activities available for the children in Nursery based around our topic 'into the woods'. 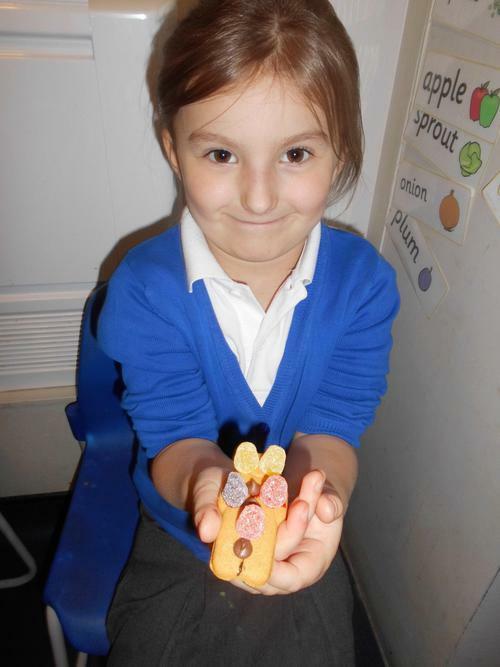 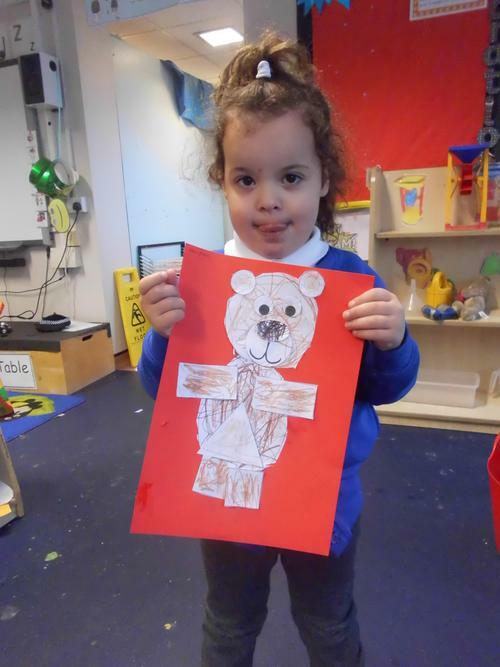 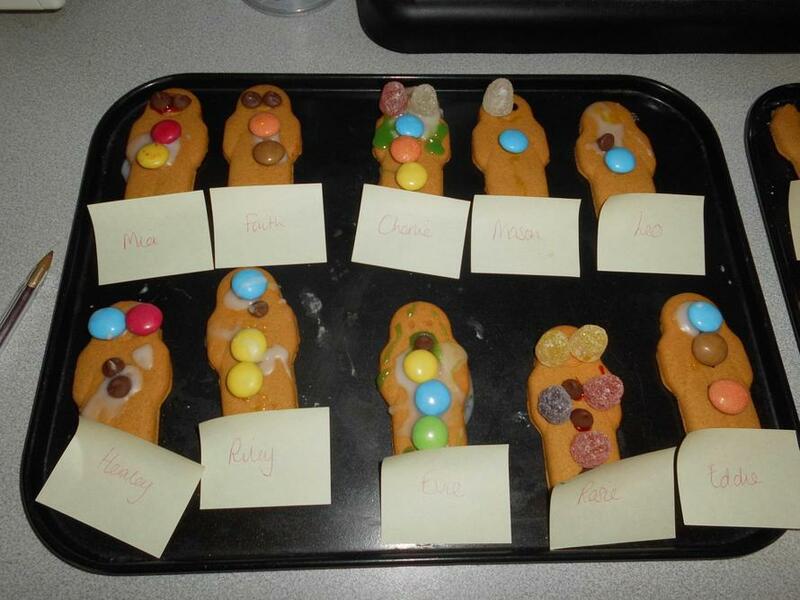 The children worked with an adult to cut and arrange shape to make a shape bear, which they all did very well! 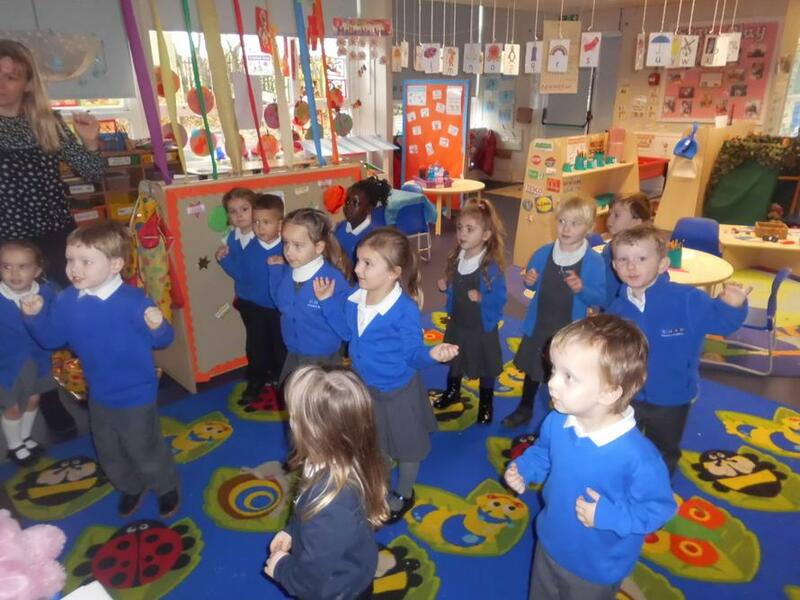 We have been learning to sing and dance to lots of bear themed songs such as 'the gummy bear song' and 'if you go down to the woods'. 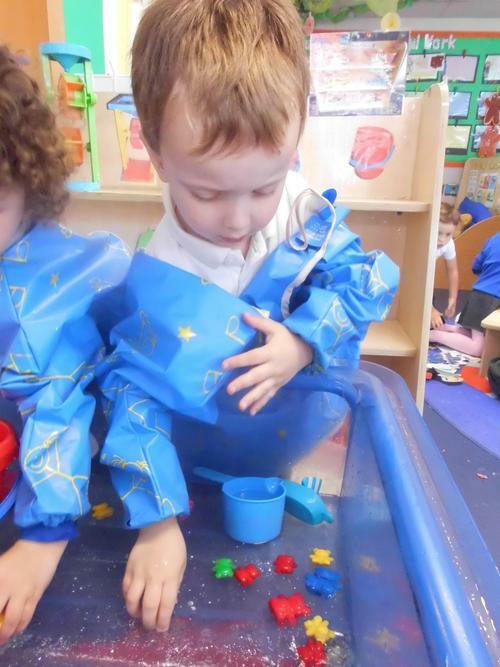 The photographs show the children learning the moves to the gummy bear dance, which is fabulous for their physical development! 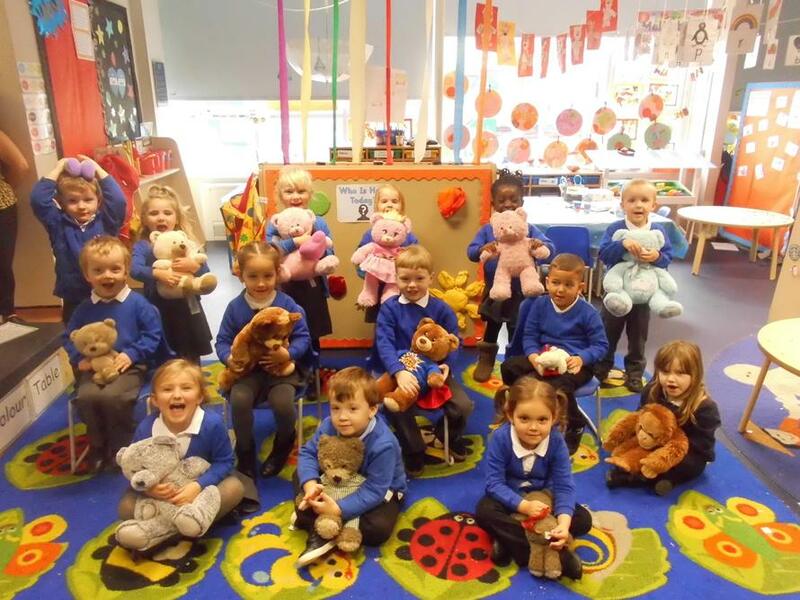 The children were invited to bring in their teddies for 'Show & Tell' to tell us about them and to have a teddy bears picnic! 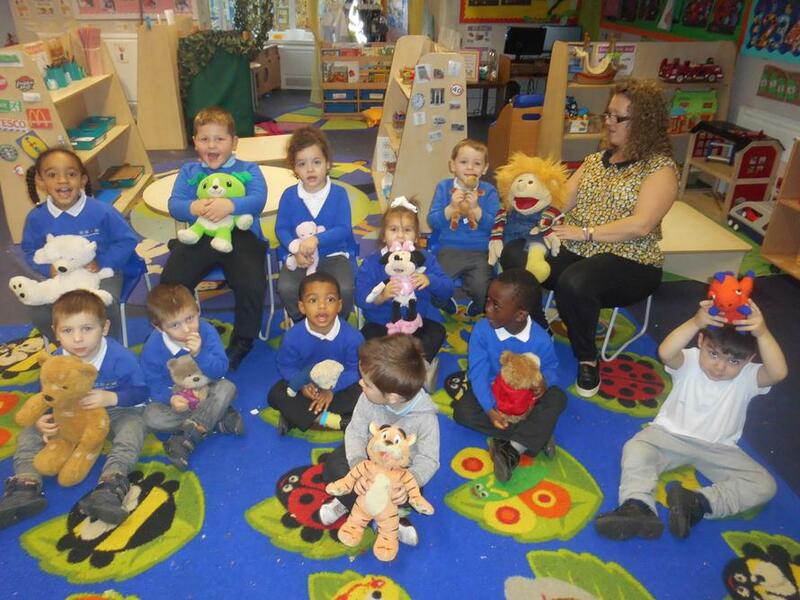 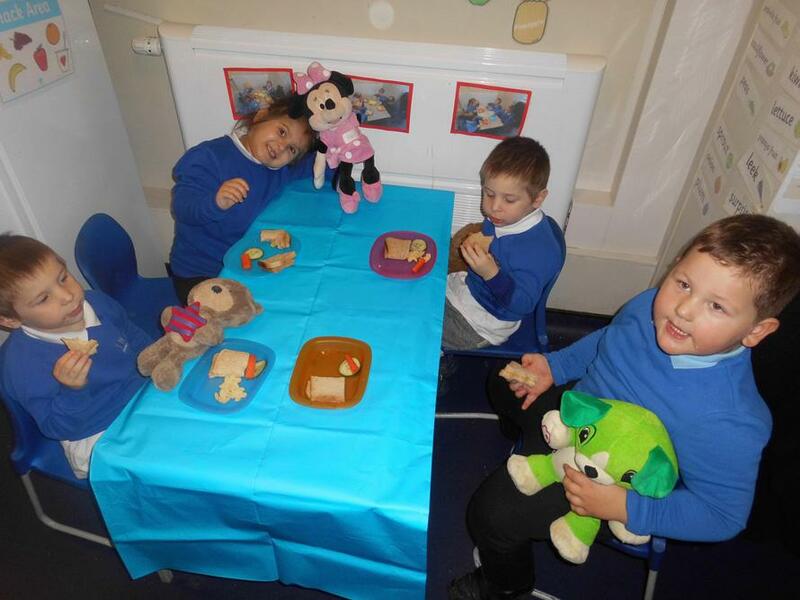 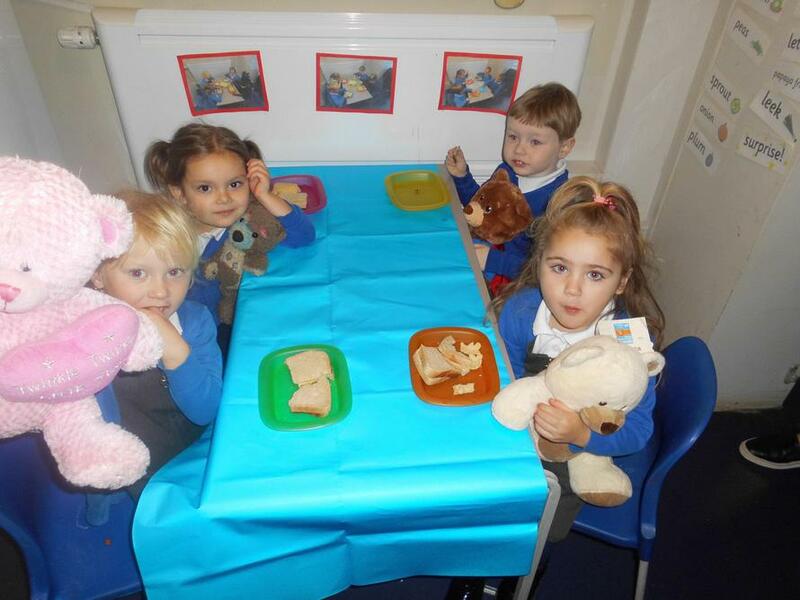 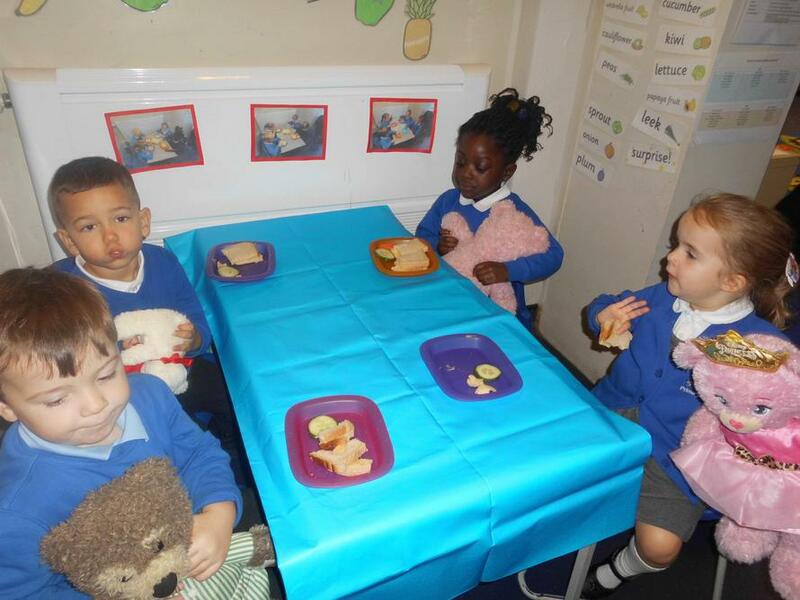 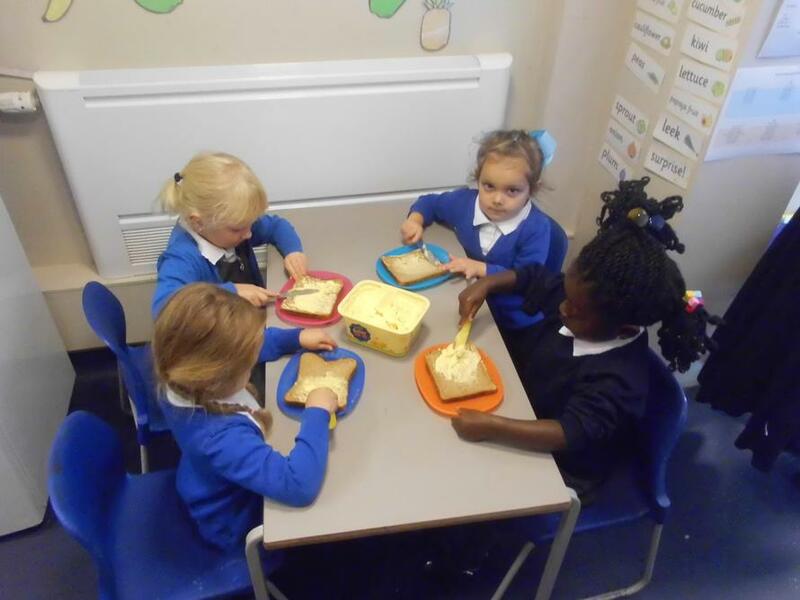 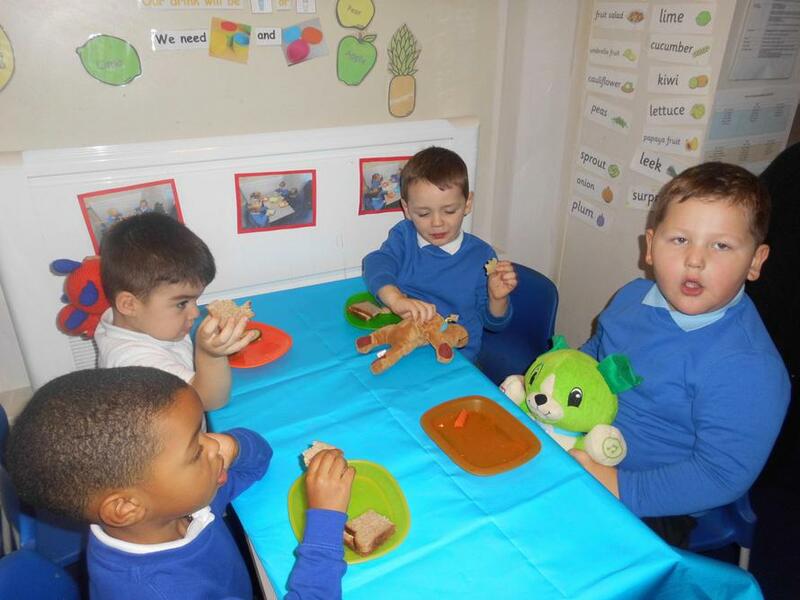 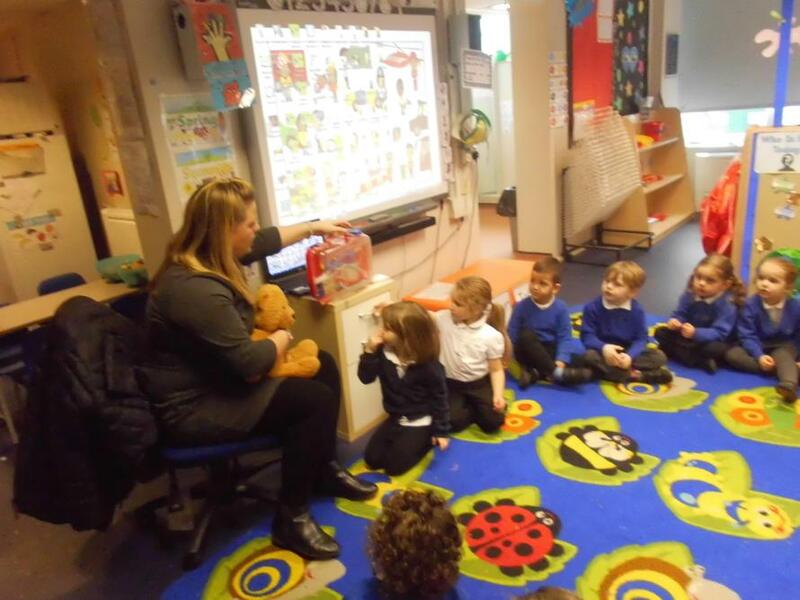 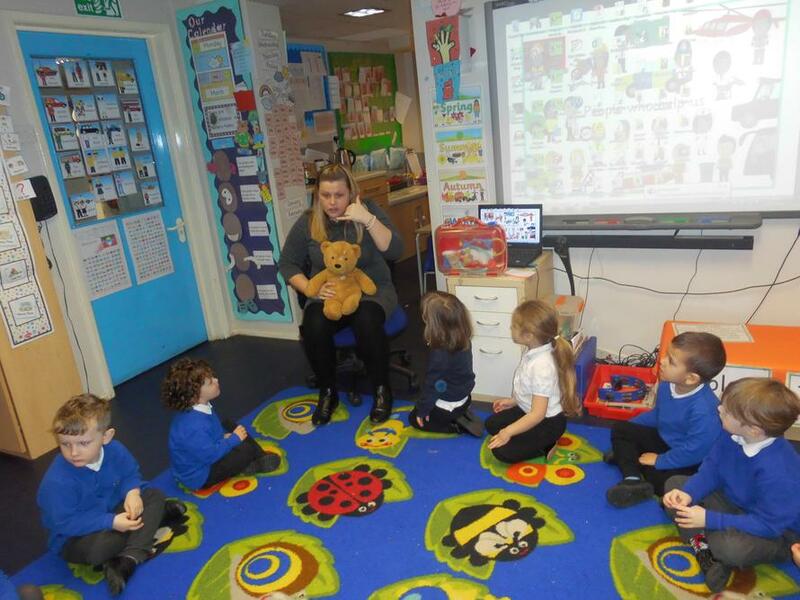 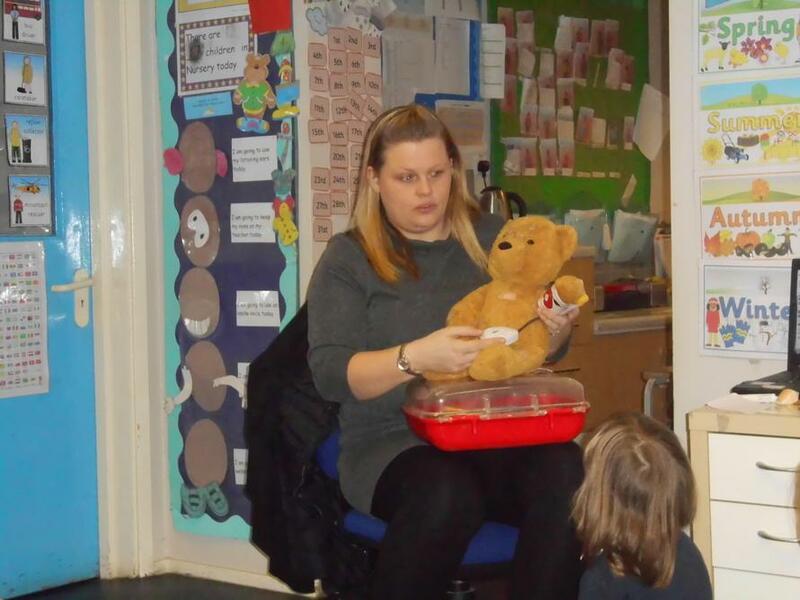 the children had juice, sandwiches and crisps for snack with their teddies and enjoyed telling their friends about their teddies during 'Show & Tell'. 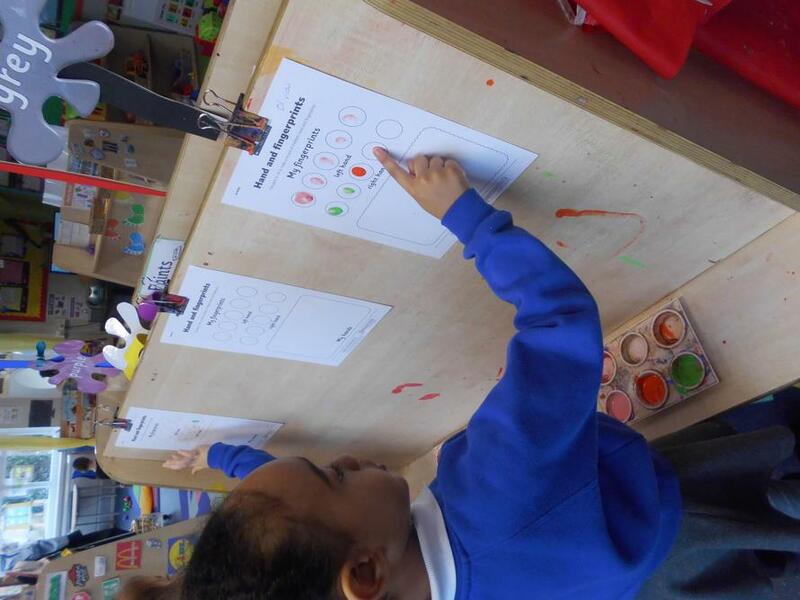 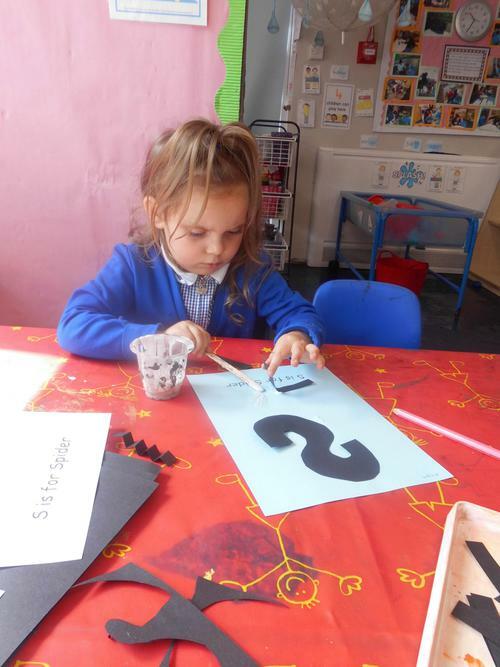 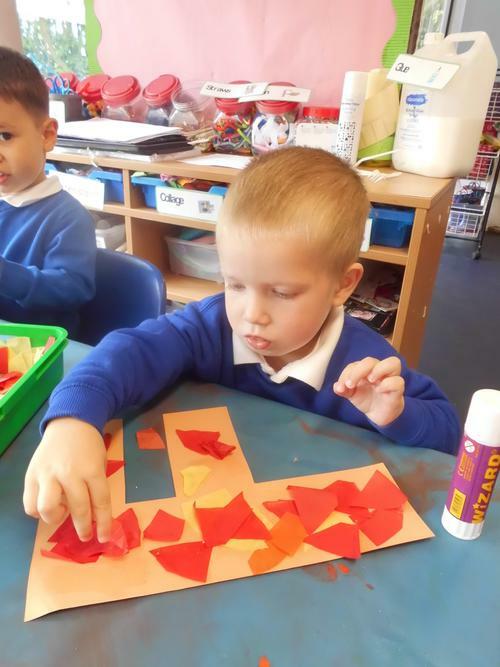 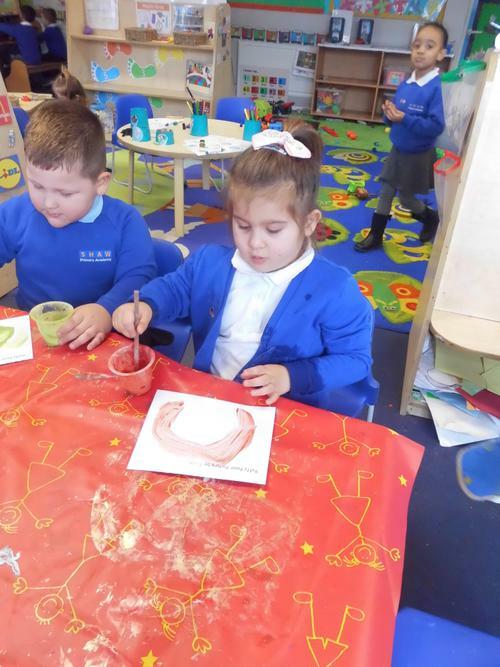 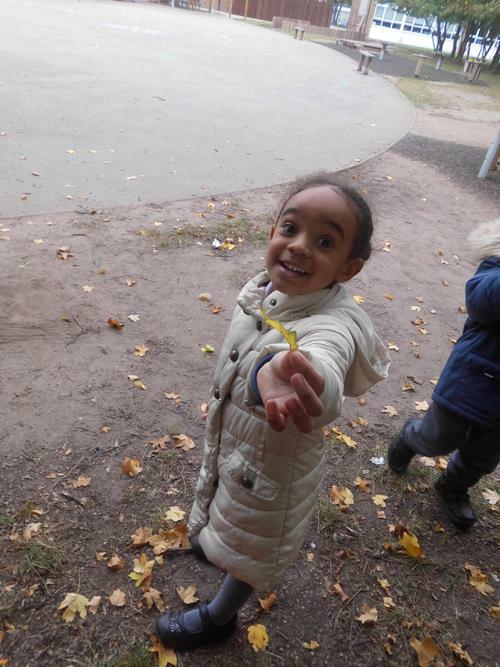 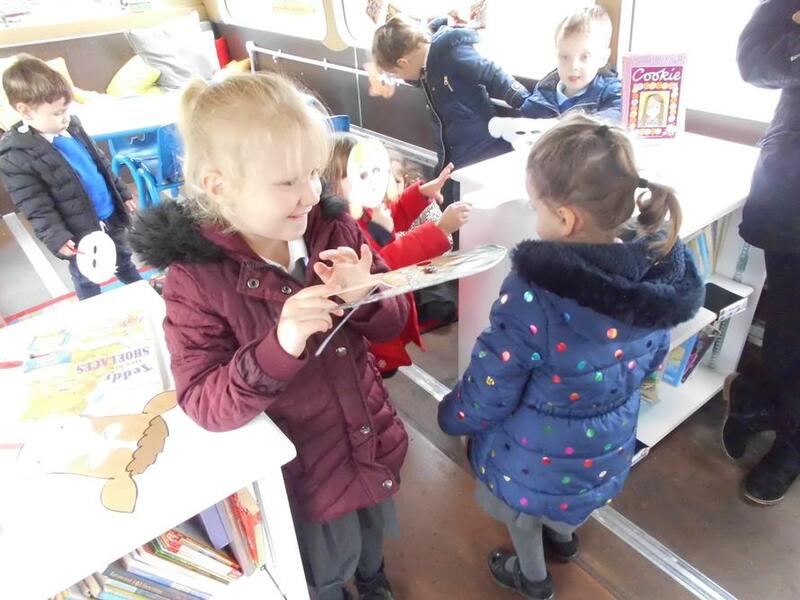 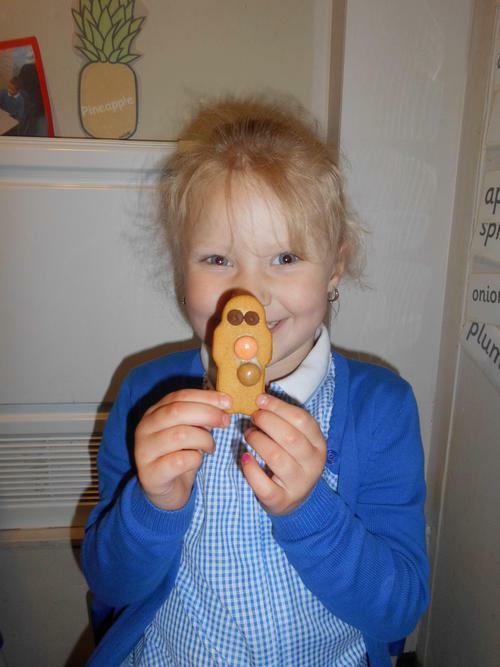 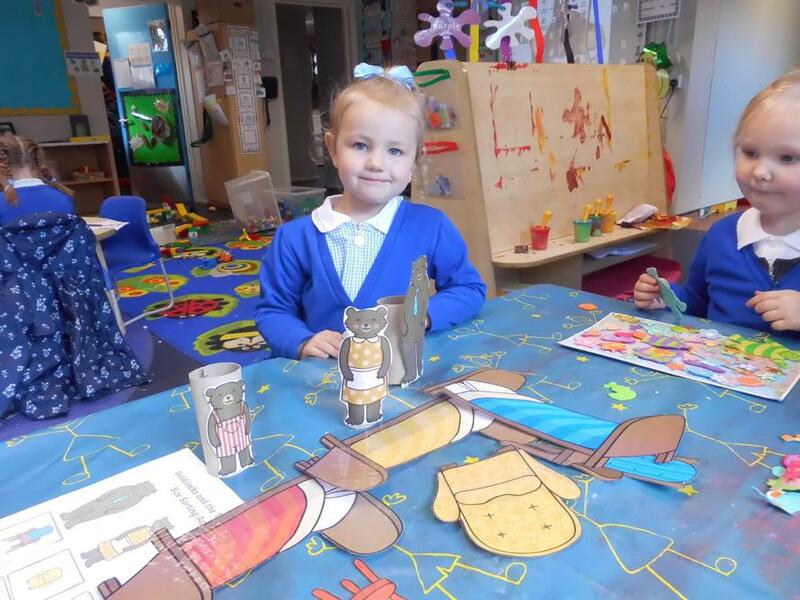 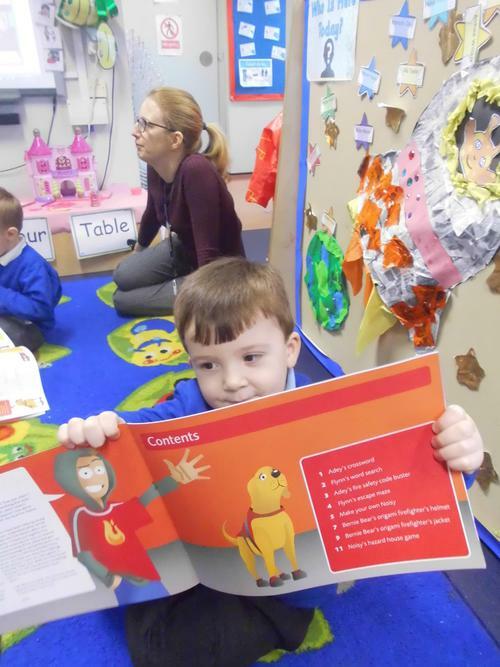 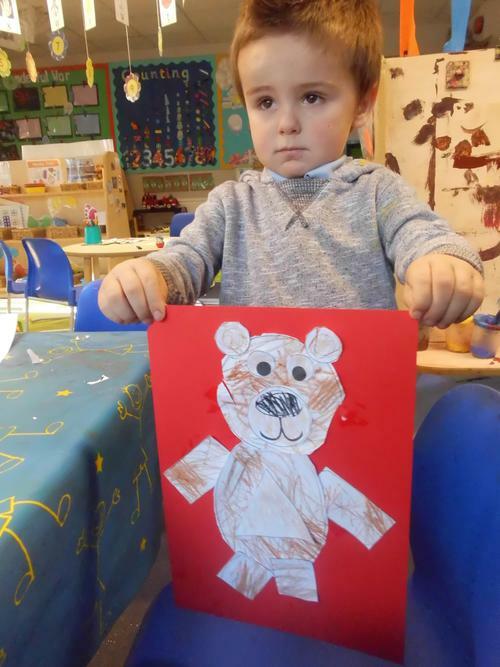 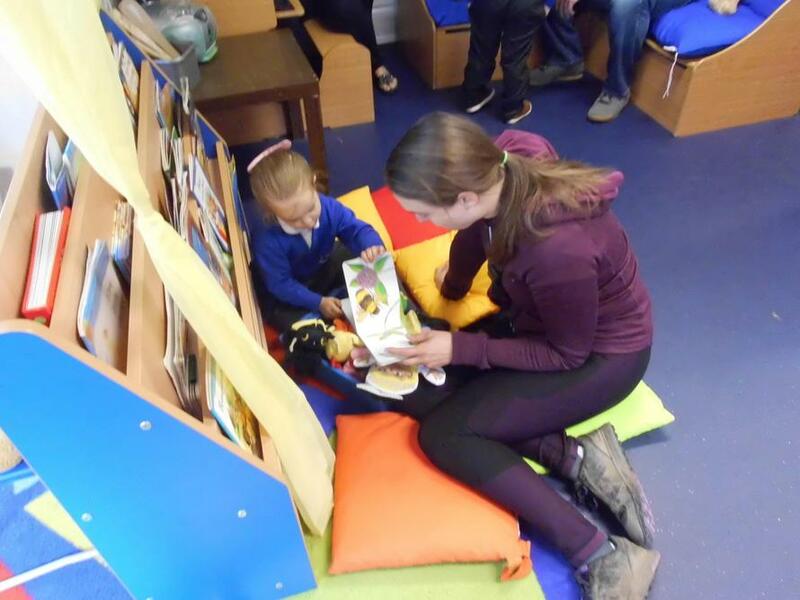 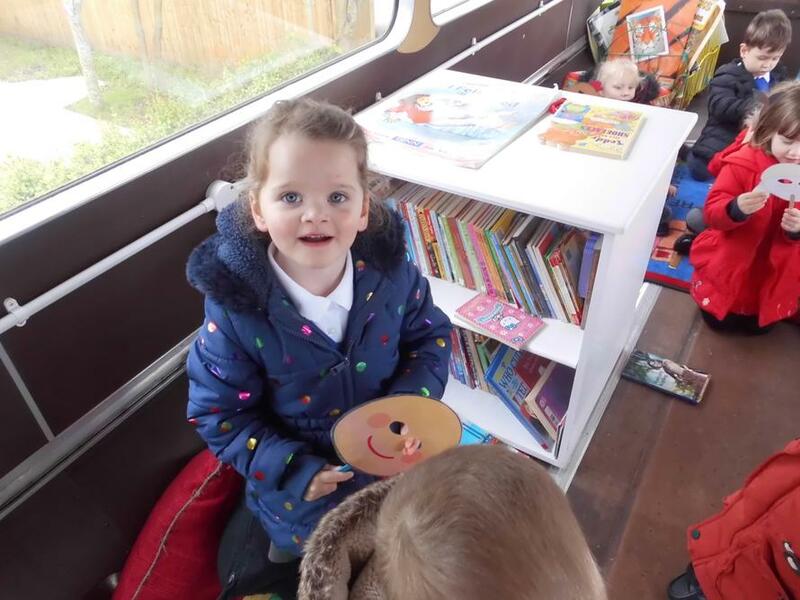 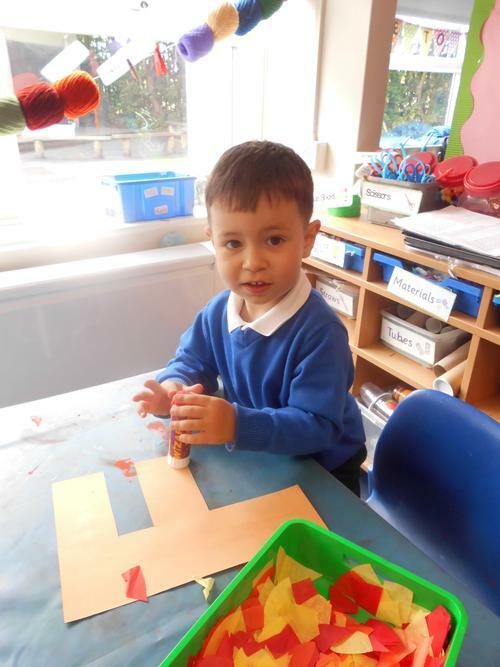 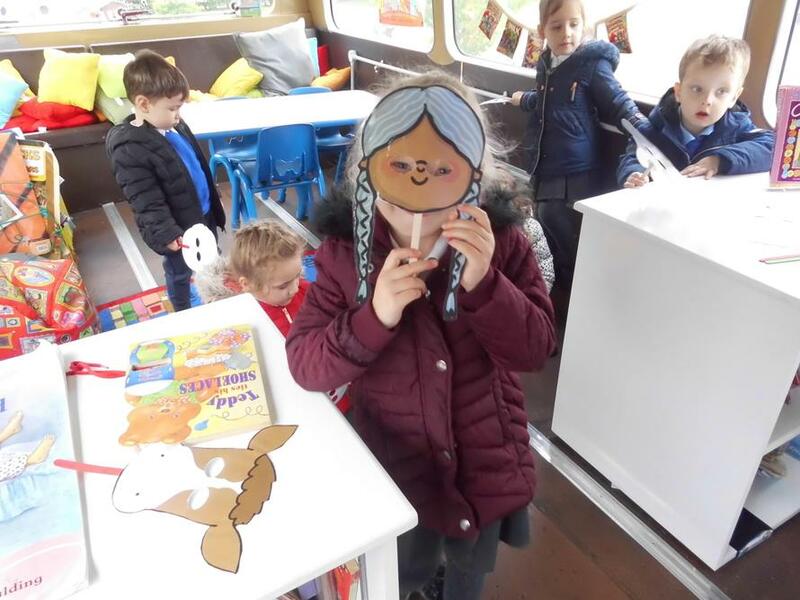 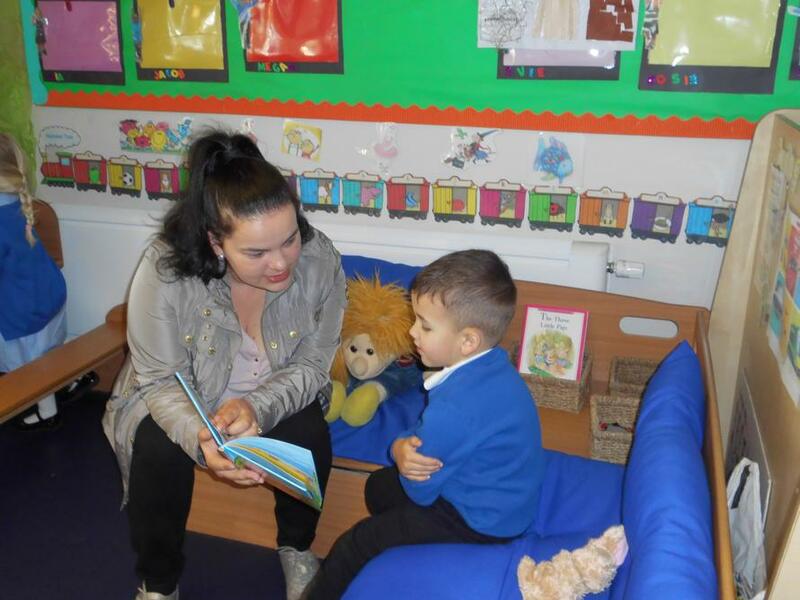 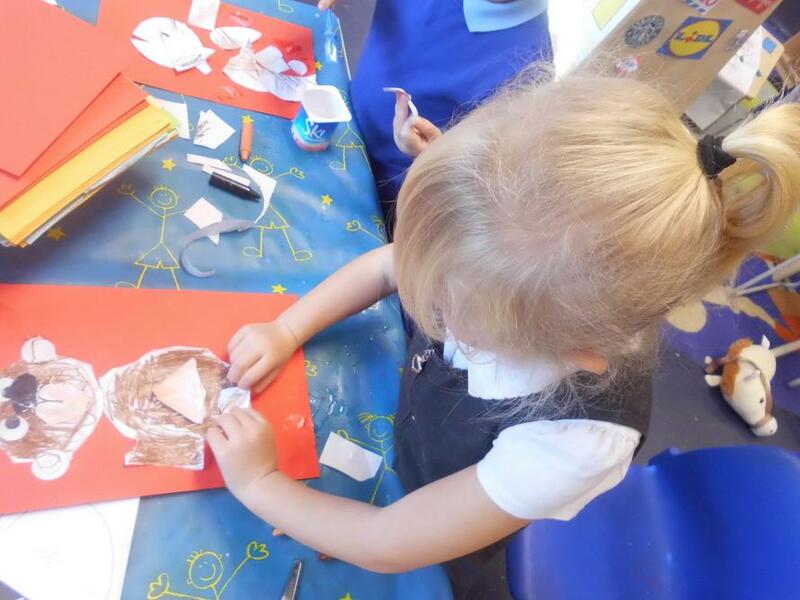 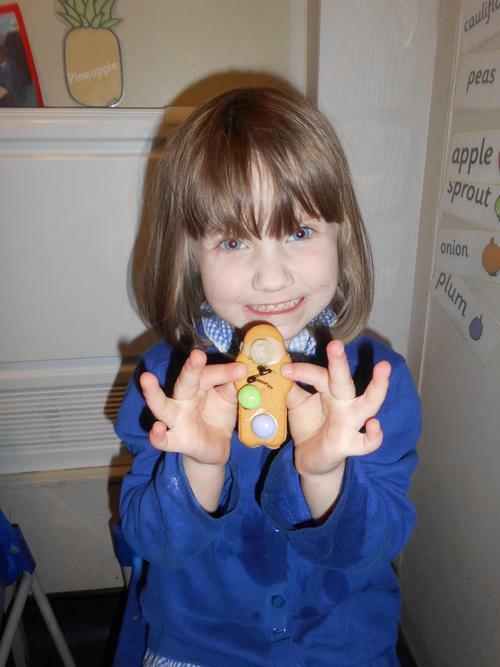 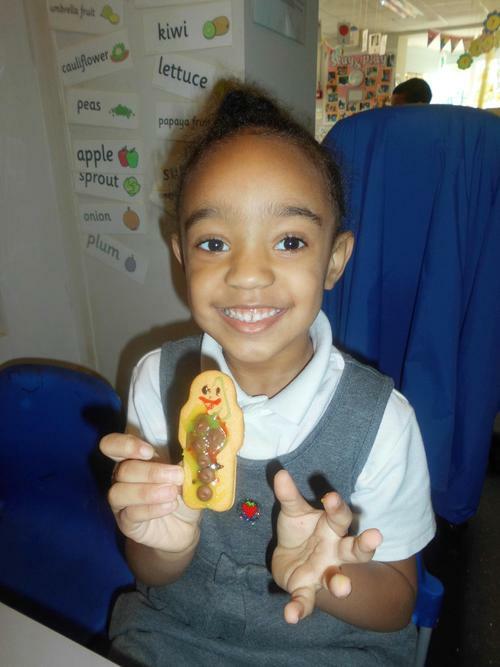 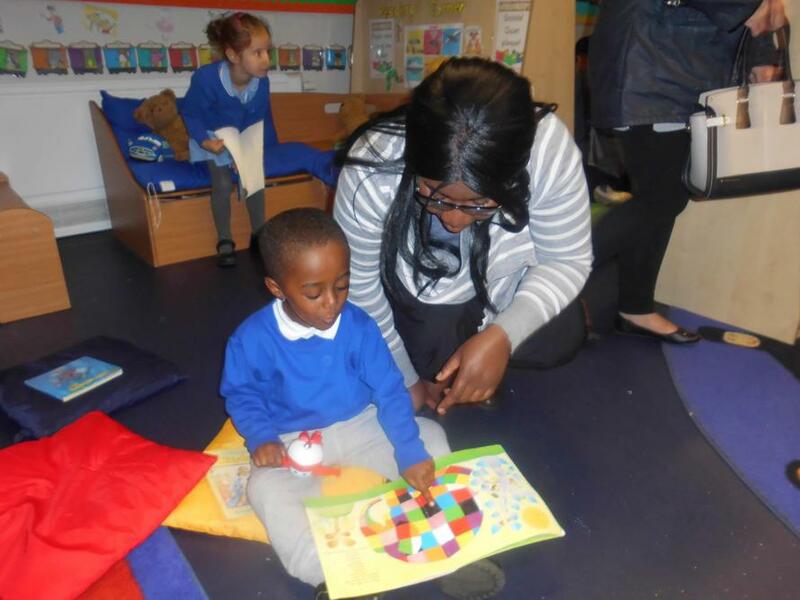 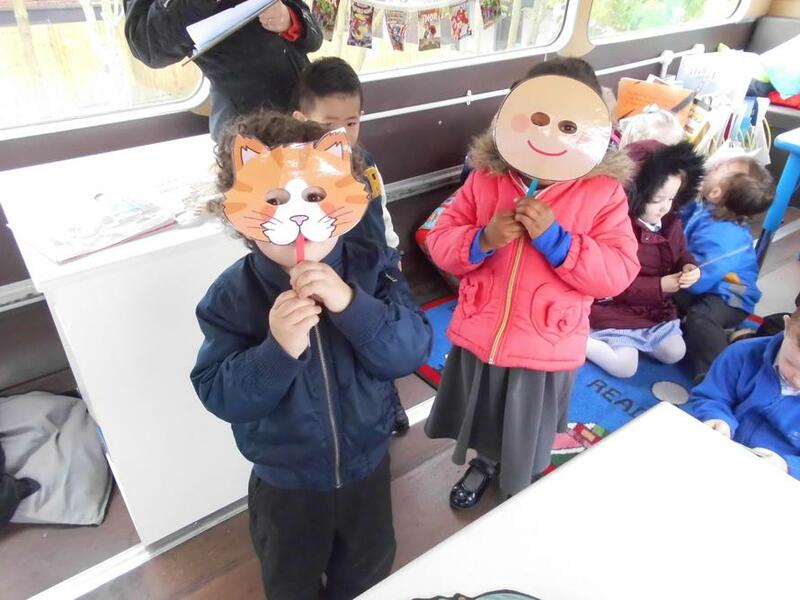 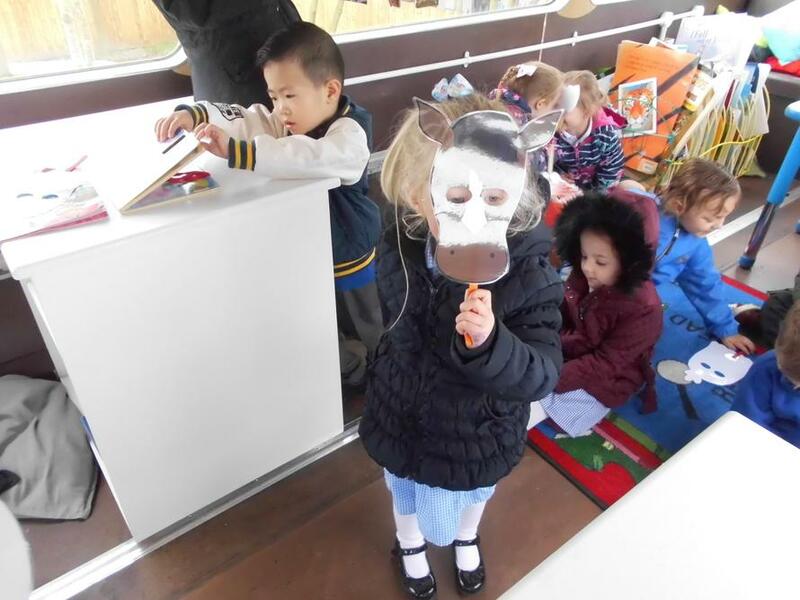 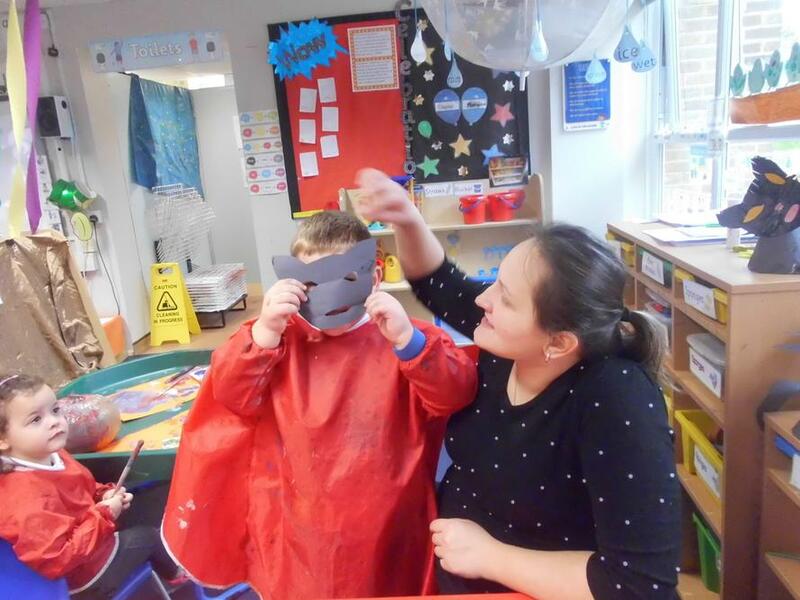 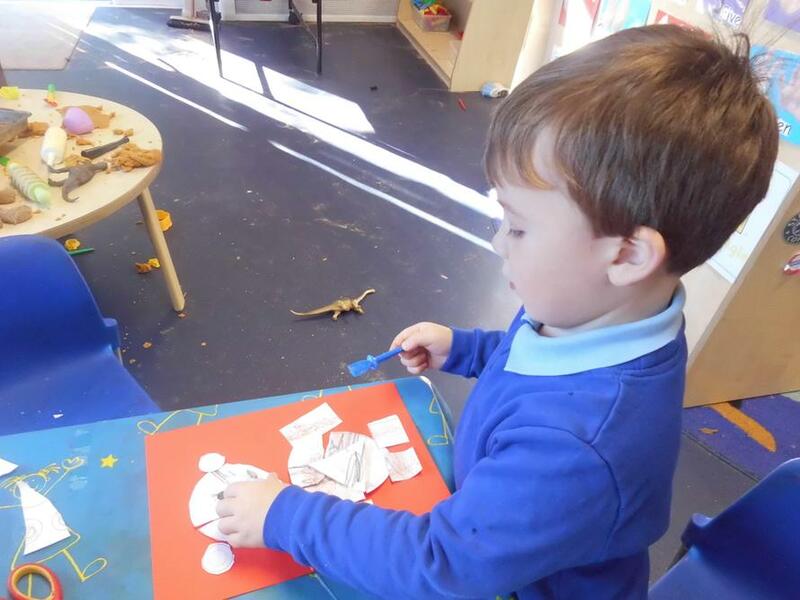 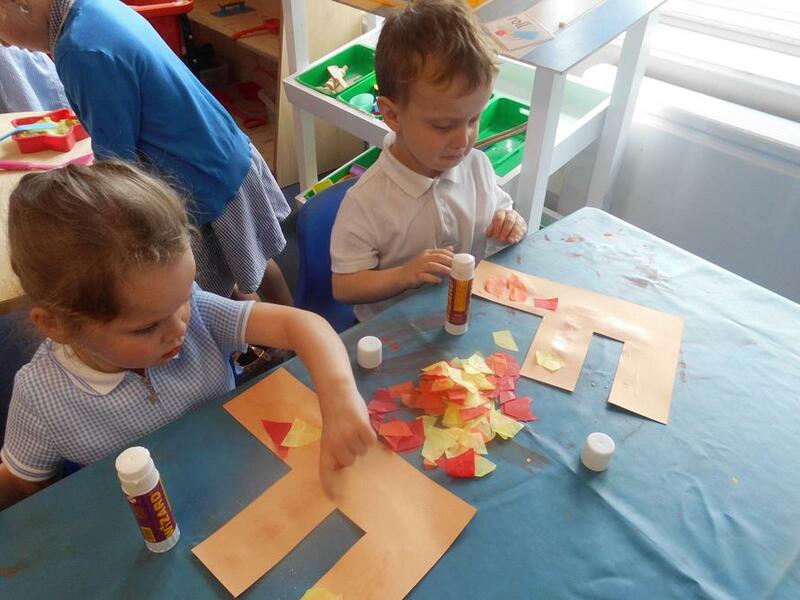 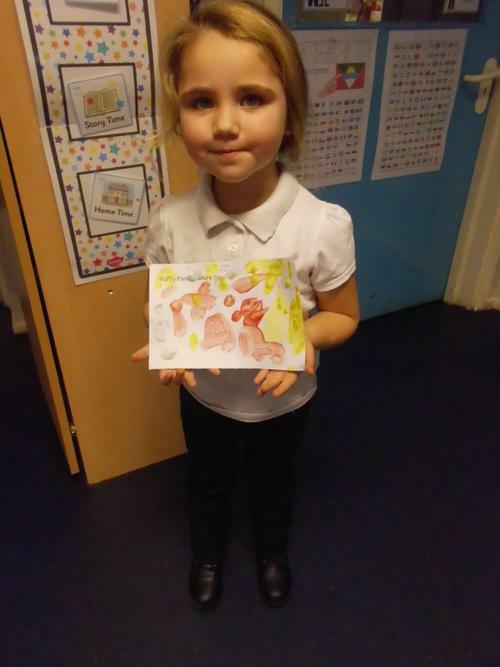 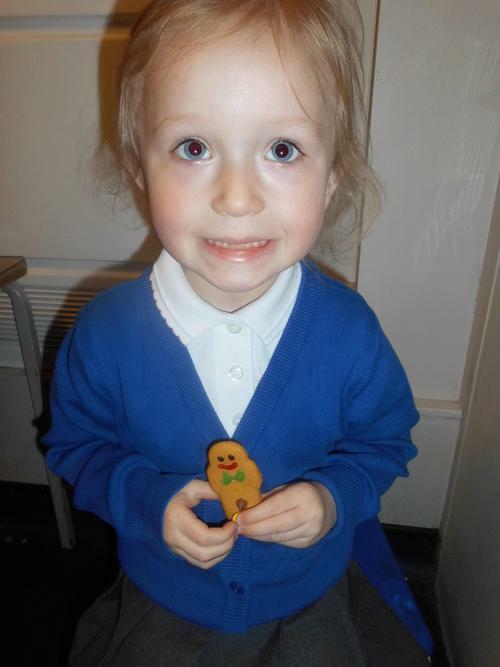 This half term is a busy half term because the children in Nursery have been learning lots about their topic and reading stories such as The Gruffalo and the 3 Bears and also learning about shapes! 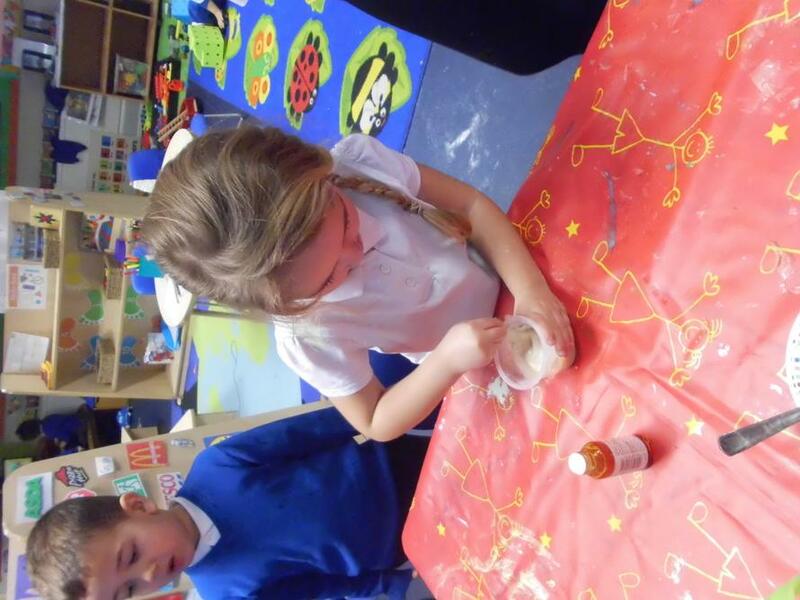 The children have also been practicing hard for the Christmas performance 'Aliens love Christmas'! 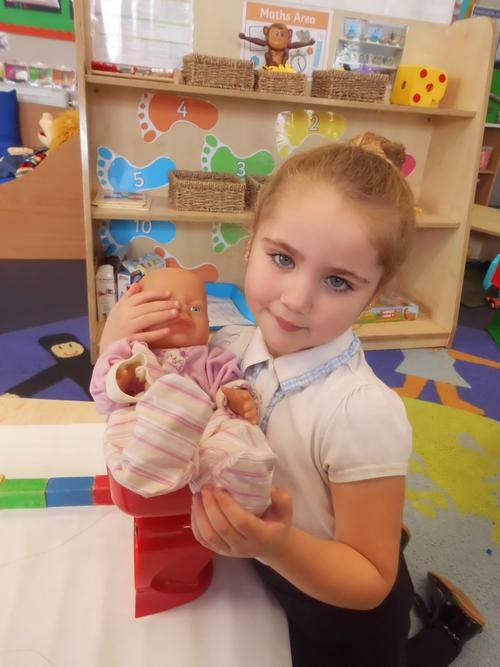 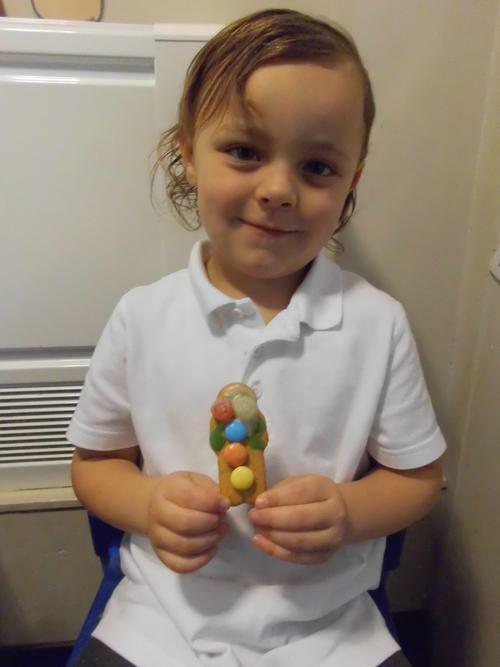 The children have done very well learning the words to the songs for the performance such as such as '5 cold icicles' 'The snowman song' and 'Away in a manger', which was played during the Nursery's special nativity scene in the production. 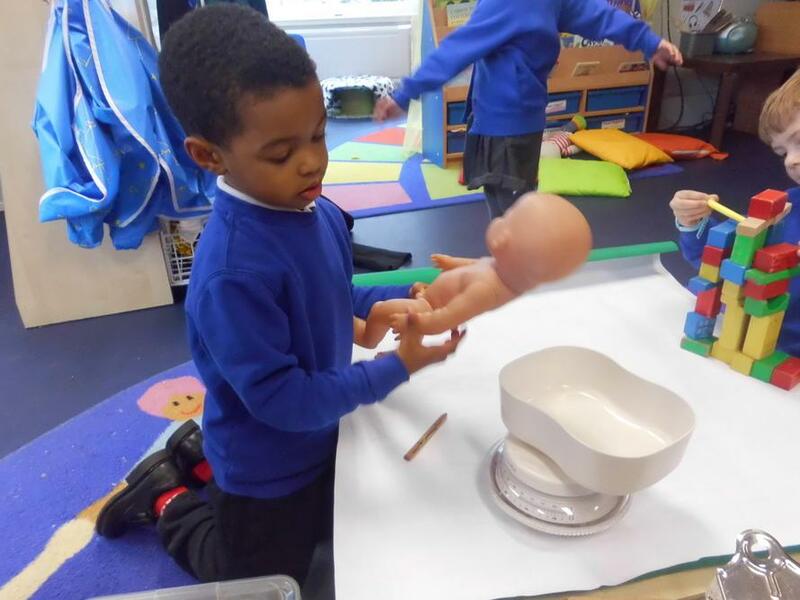 Below are a few pictures of the children dressed in their Nativity costumes for the production and also a video of the '5 little men in a flying saucer' song that the children learn for the production too. 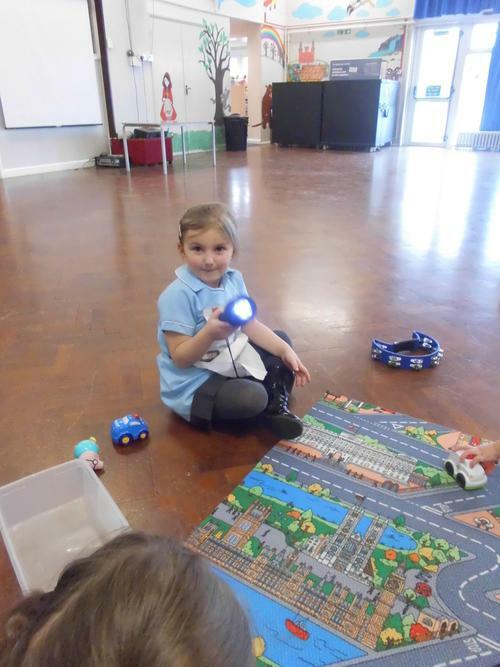 As part of this topic the children will be learning about different types of transport that travel on land, sea and in the air (including space!). 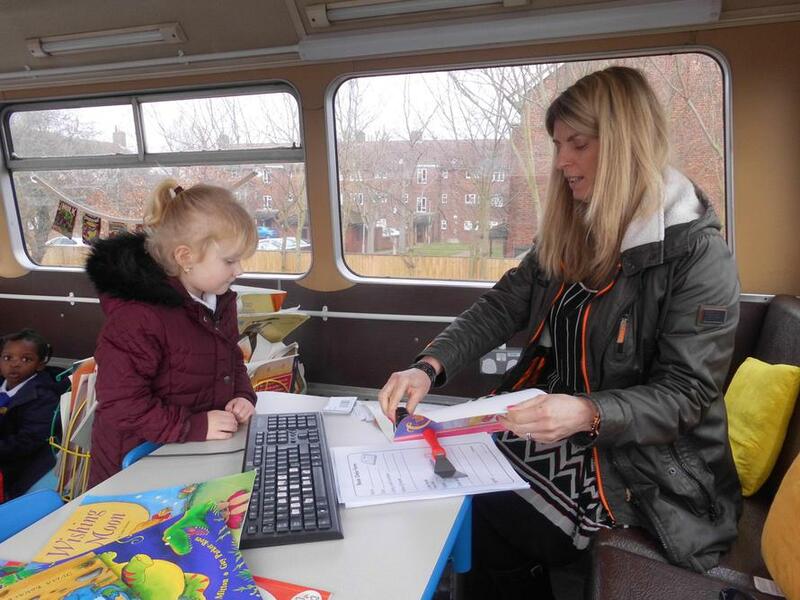 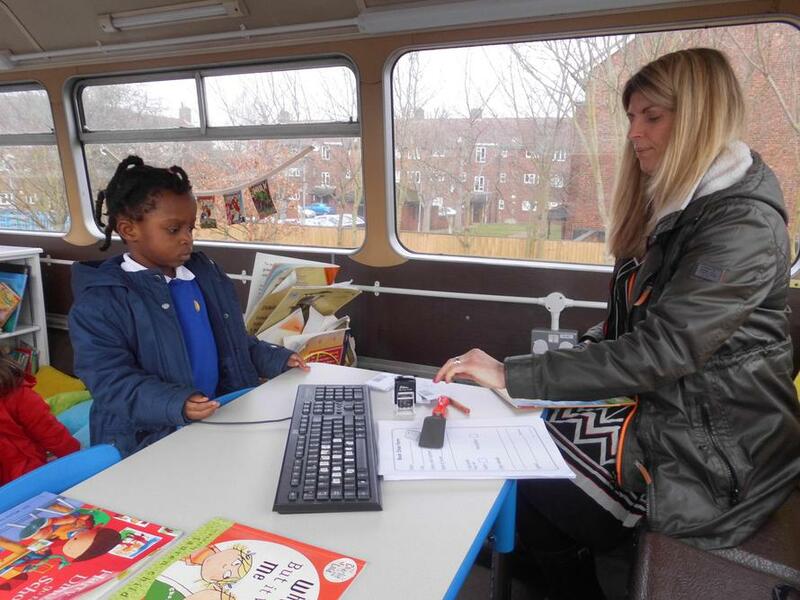 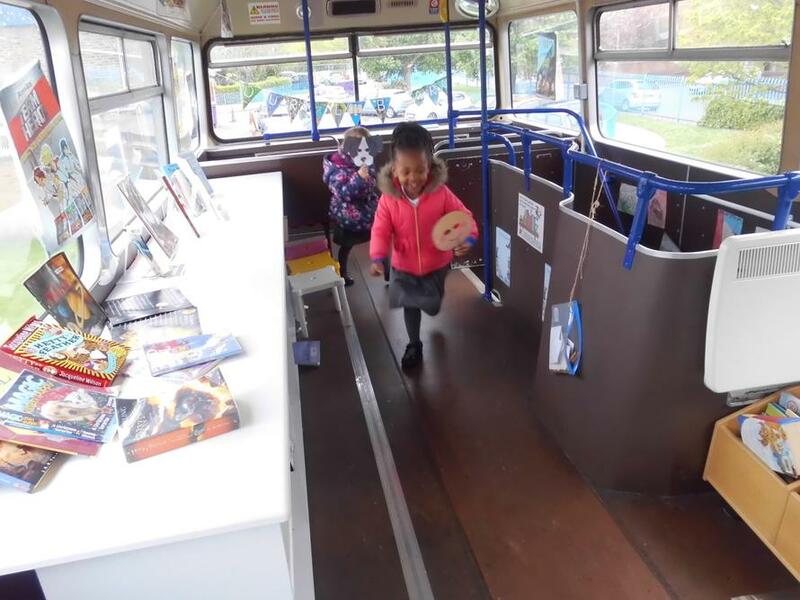 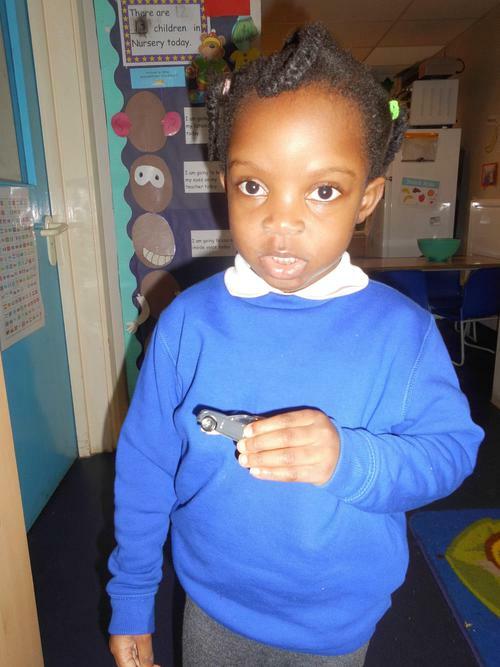 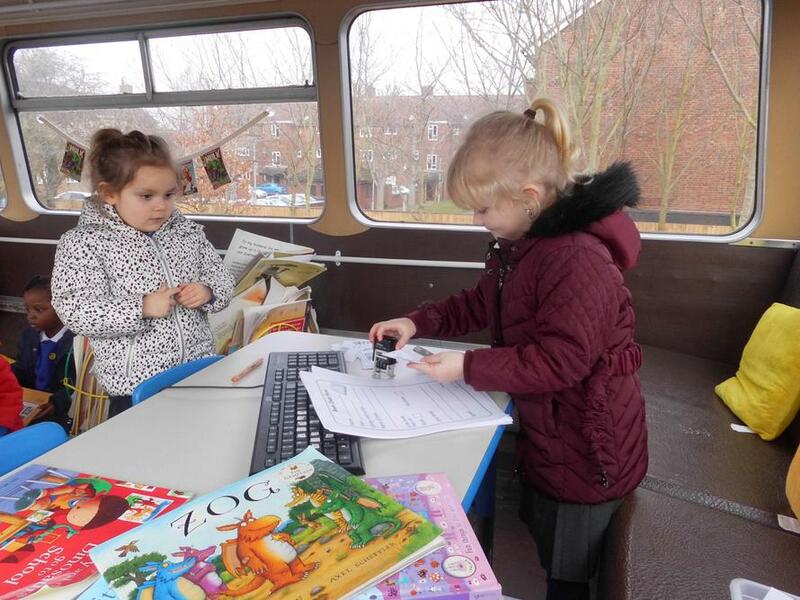 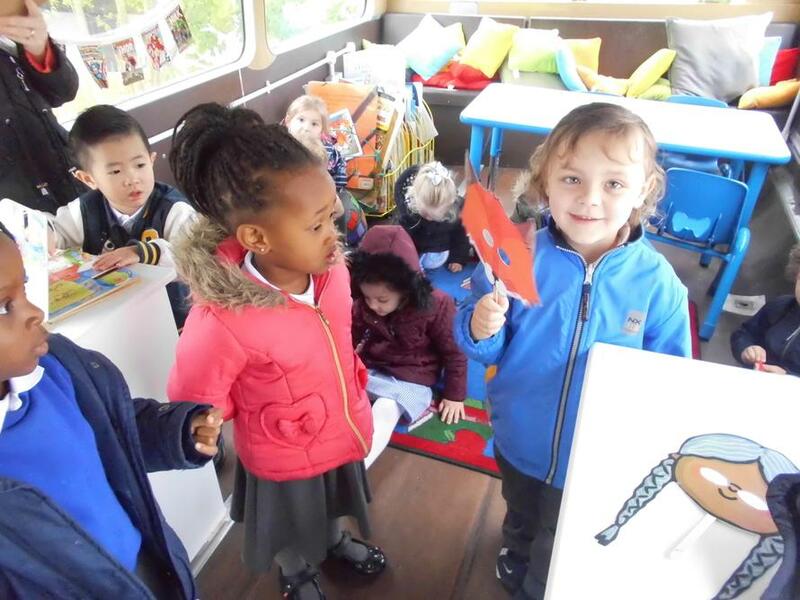 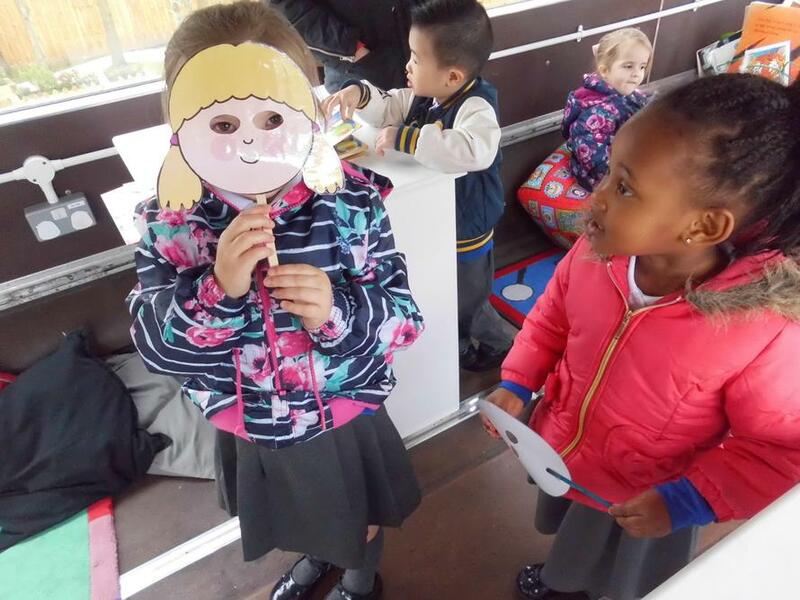 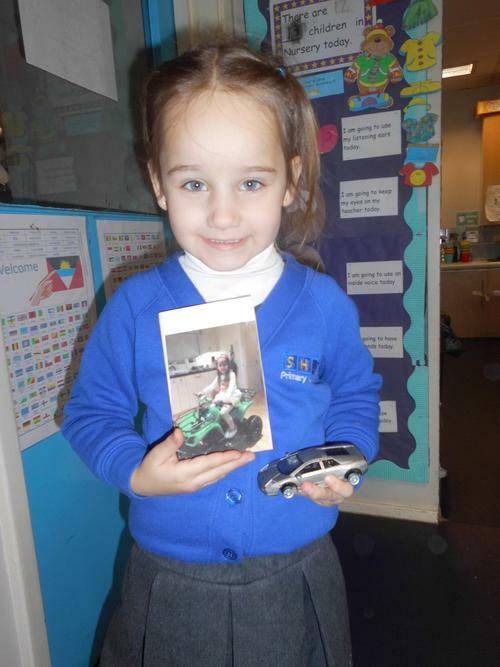 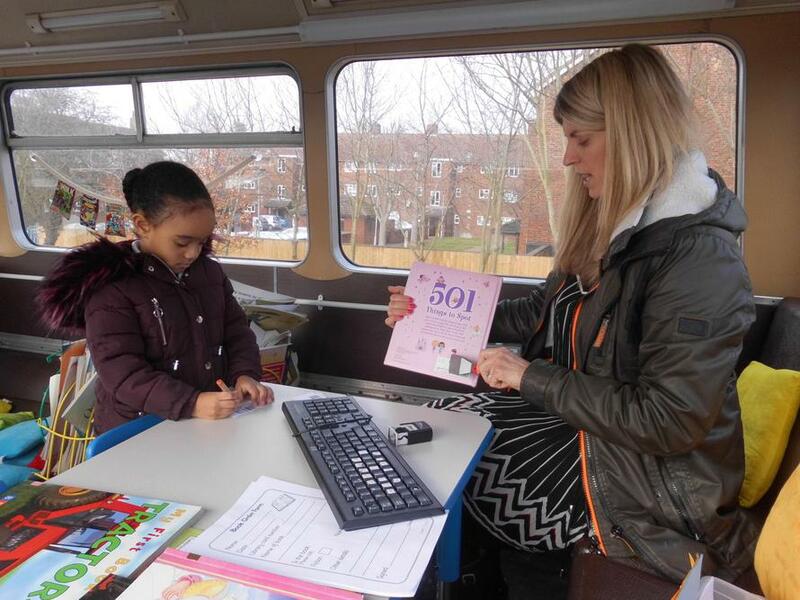 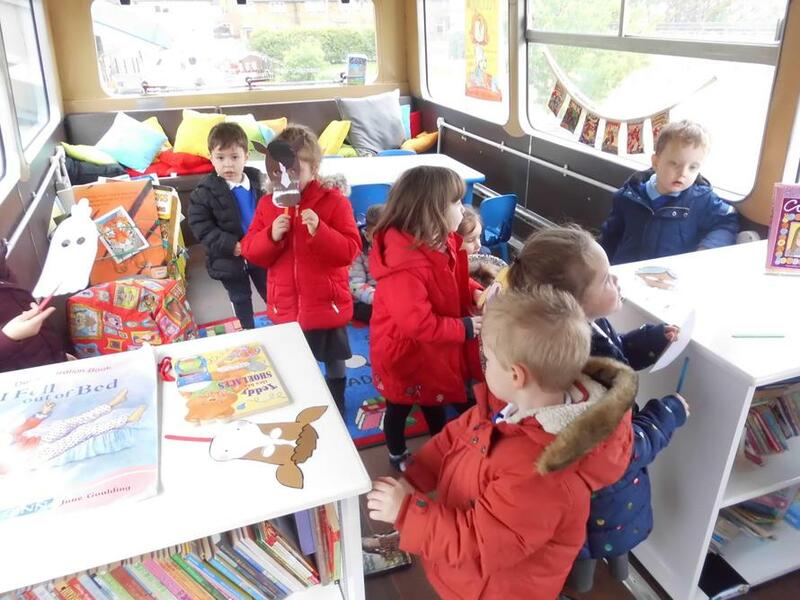 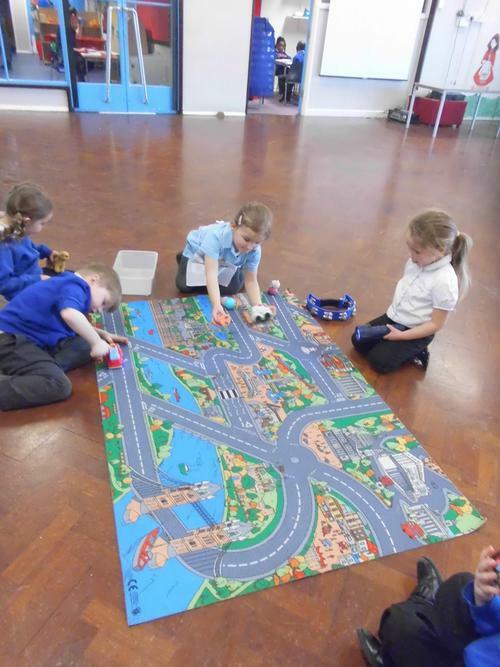 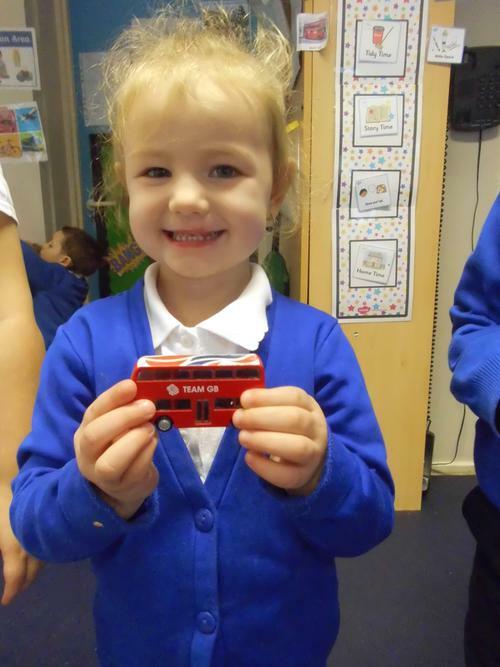 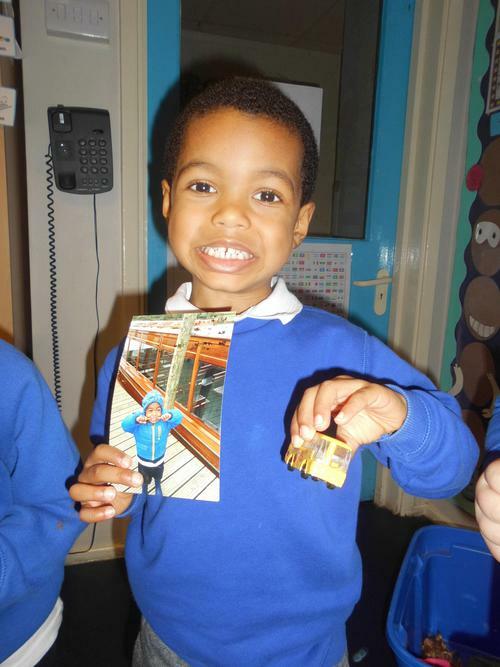 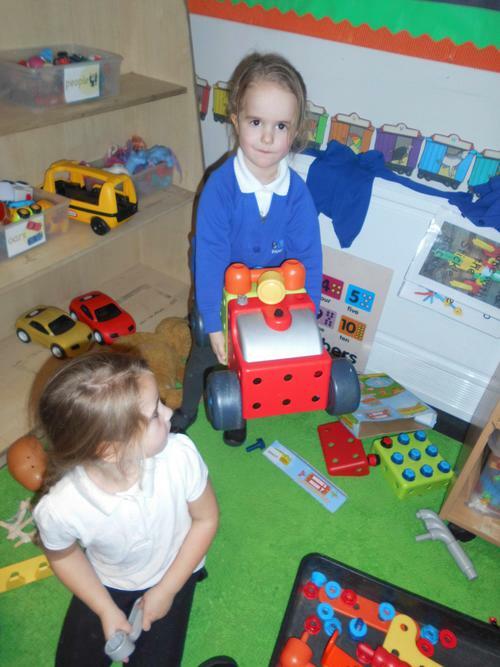 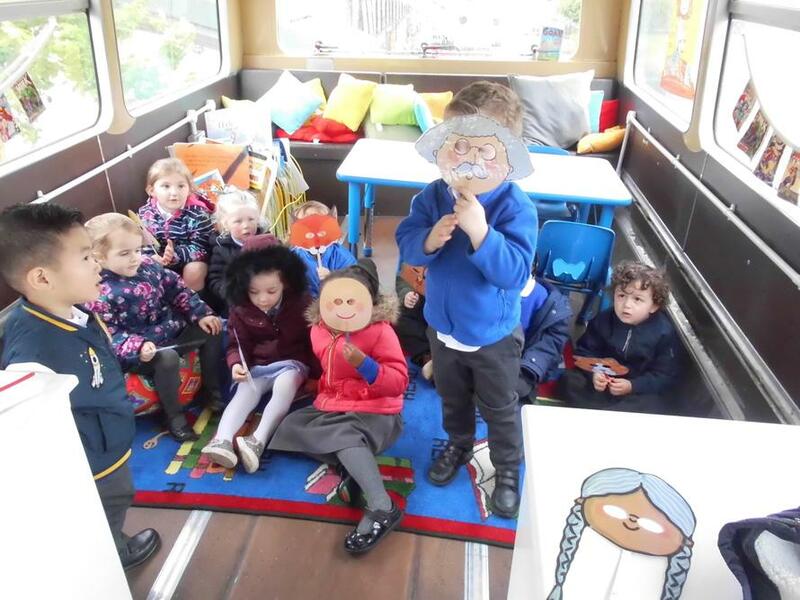 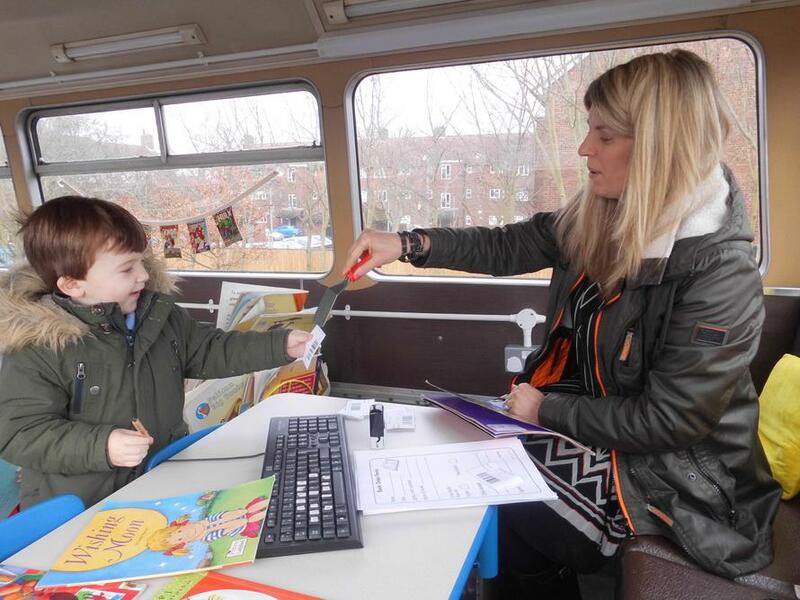 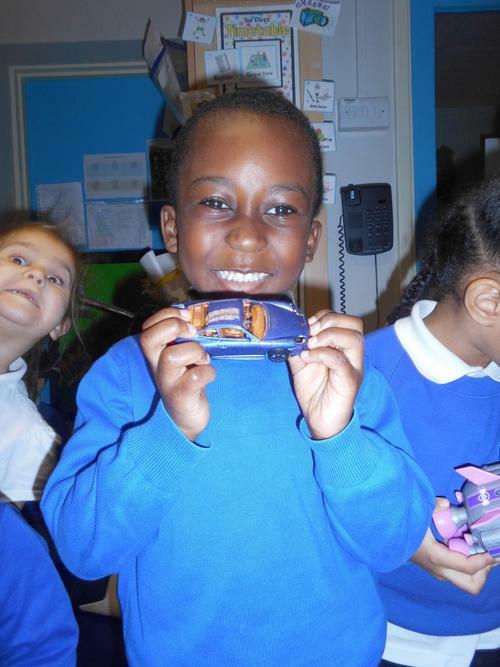 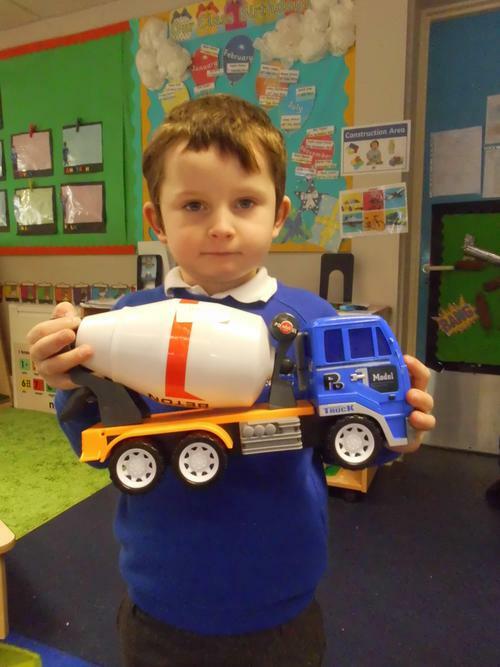 The Nursery children have enjoyed lots of transport themed activities this half term. 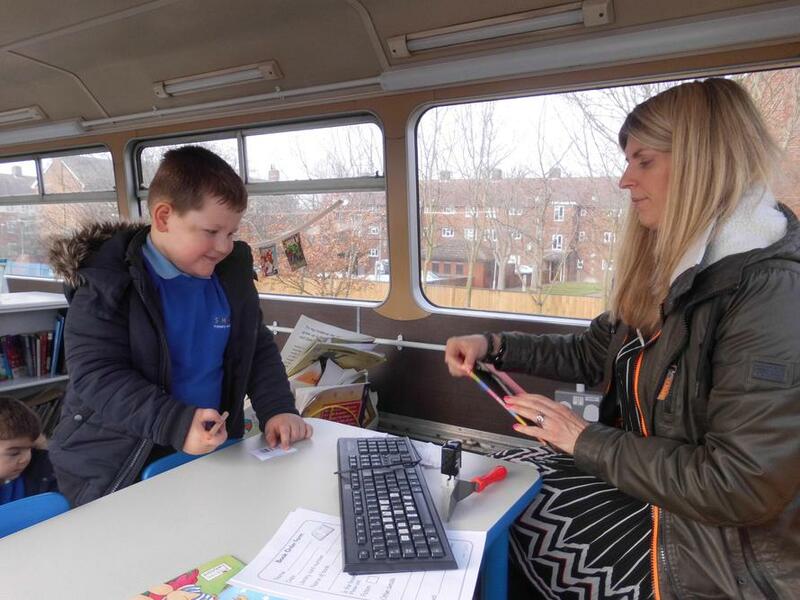 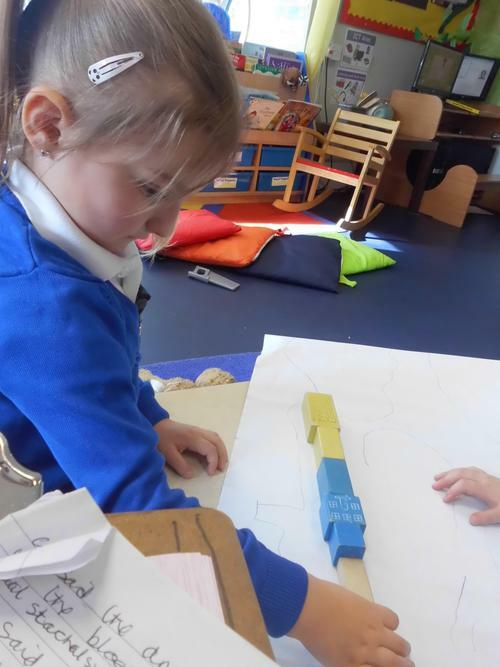 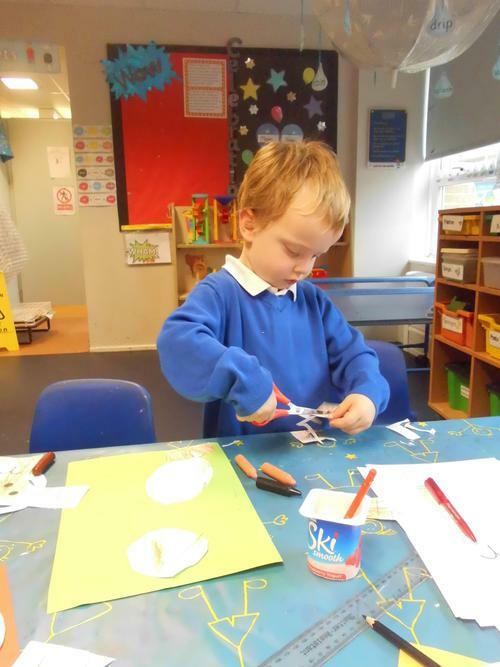 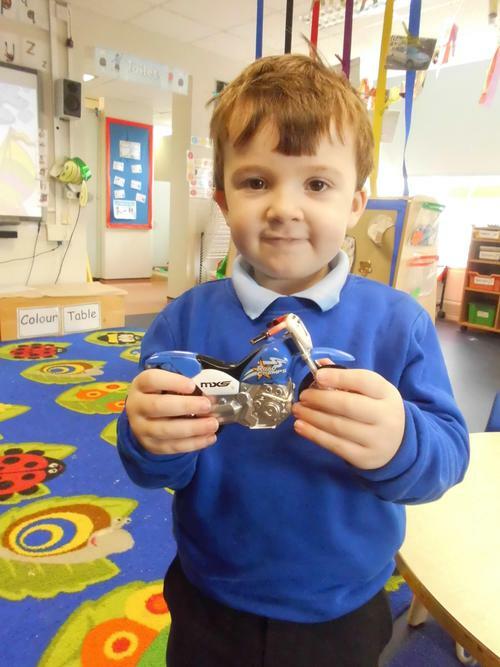 WE have had lots of different transport themed crafts including stamping with transport stamps, making aeroplanes with lolly sticks, paper plate cars etc. 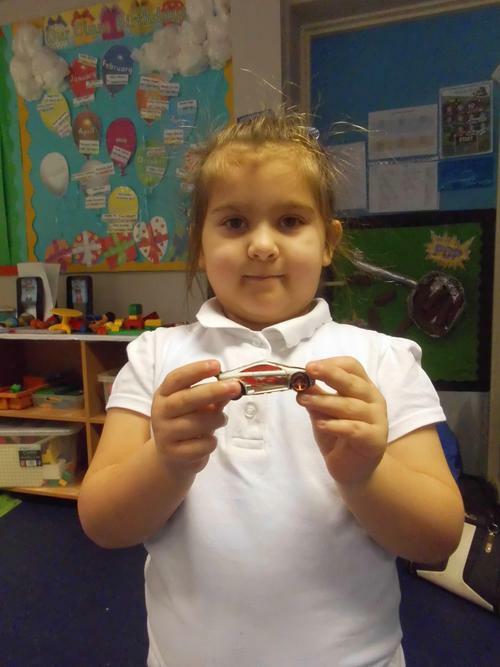 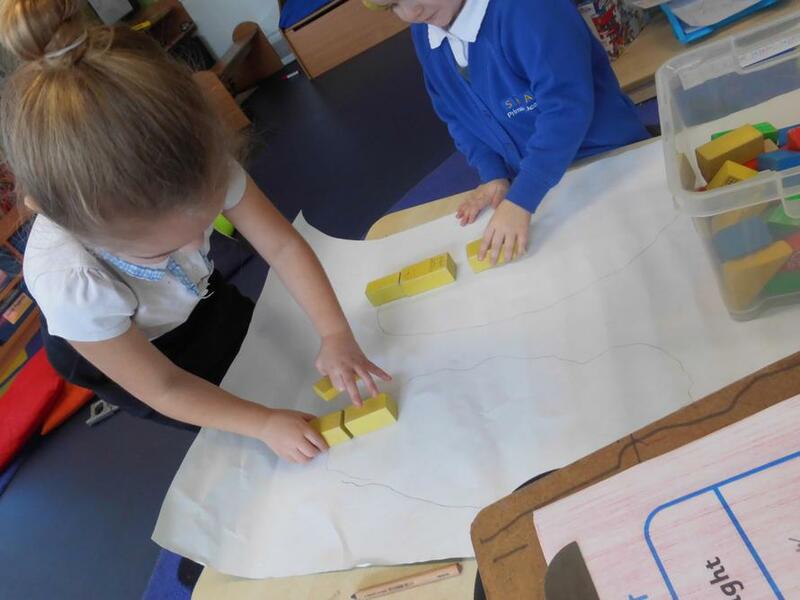 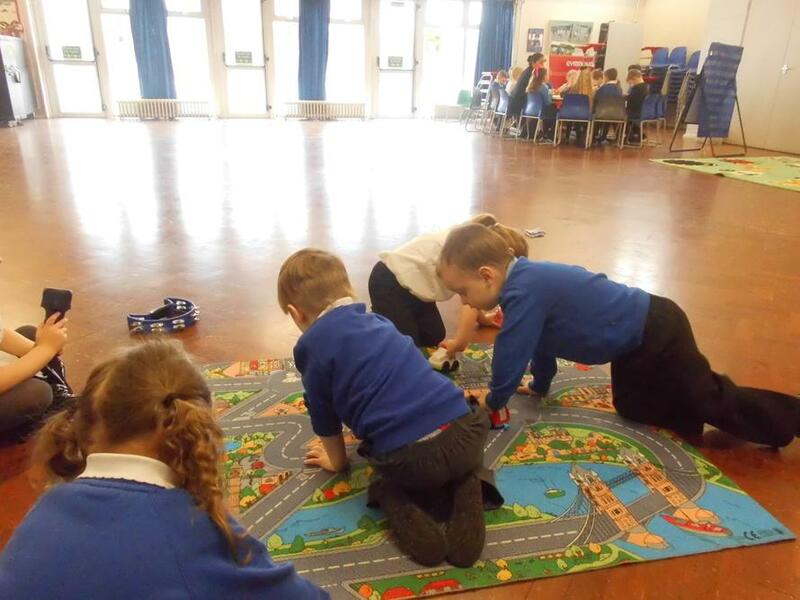 We have also enjoyed transport themed maths activities, we had numbers on our small cars and we also helped to sort them into colours . 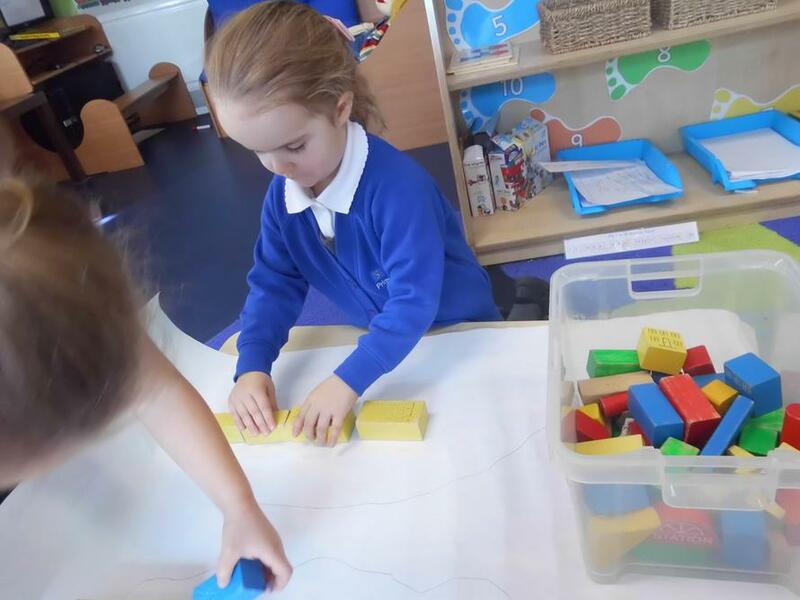 During carpet time we have talked about transport we have travelled on, places we have been to and whether it was on land, in the sea or ain the air. 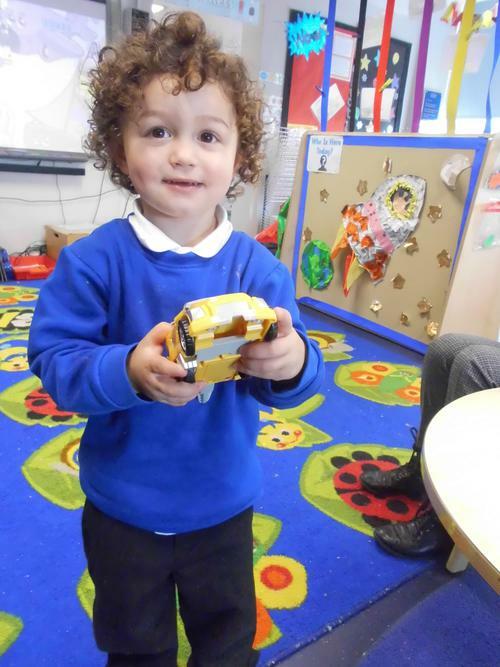 We also enjoyed singing lots of transport songs e.g. 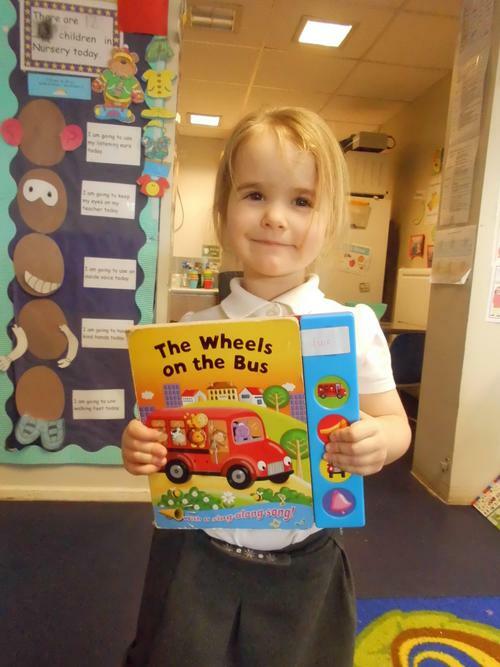 'down at the station' 'the wheels on the bus'. 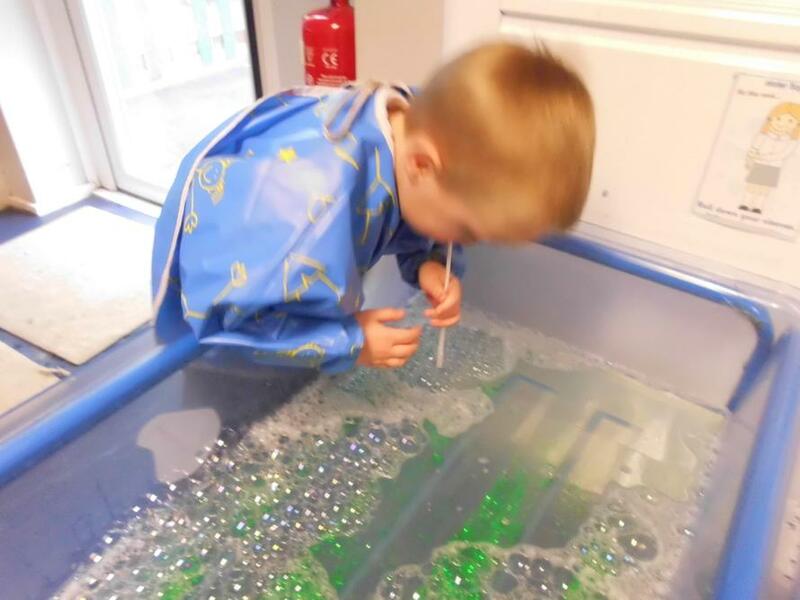 Mrs Cotter bought in a bubble train for us to see, it played music and blew bubbles. 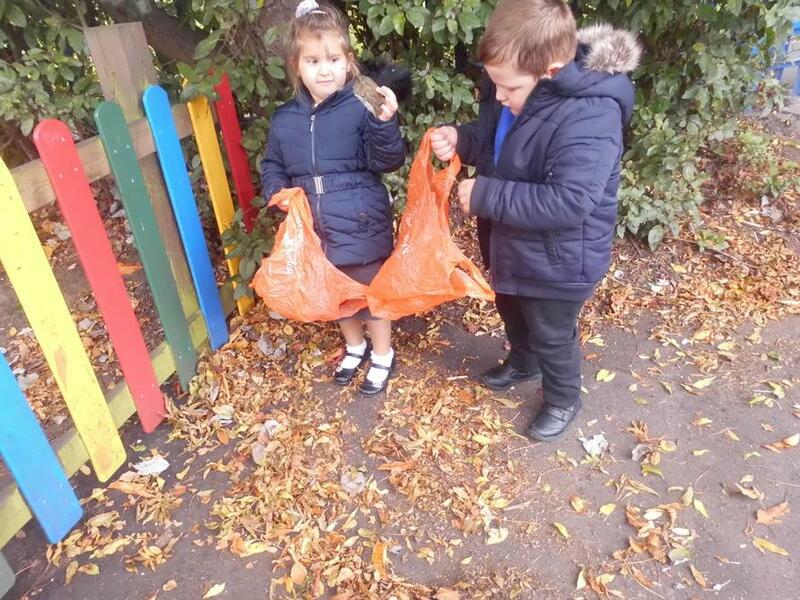 We had fun catching them! 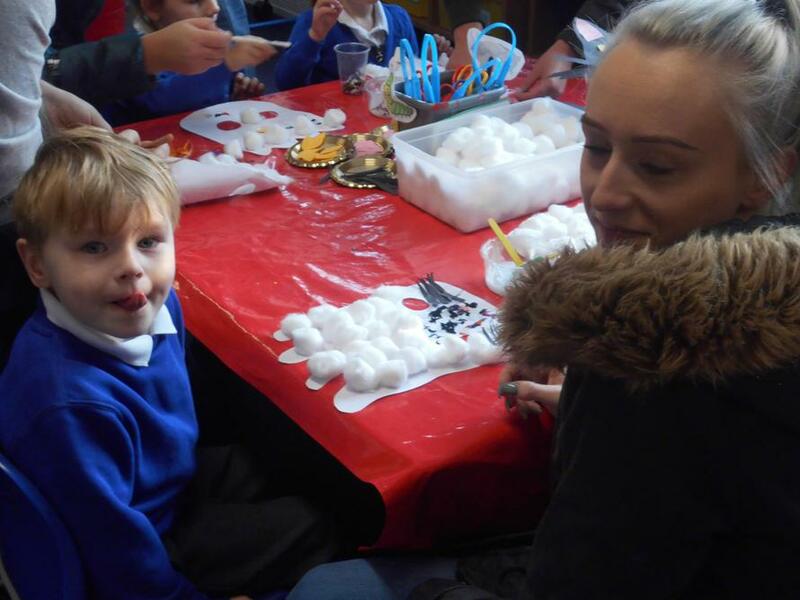 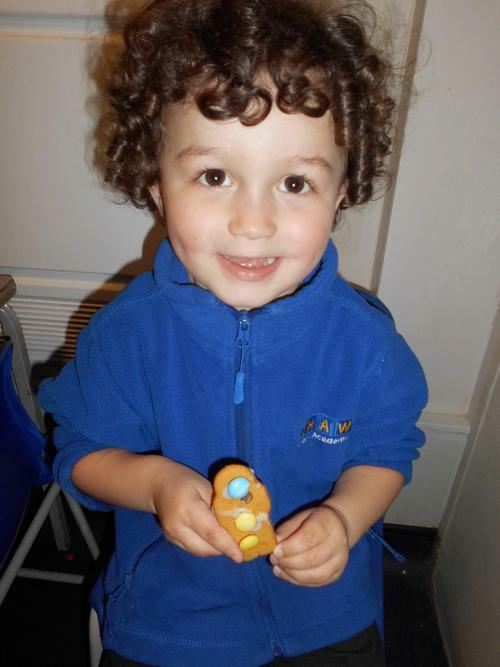 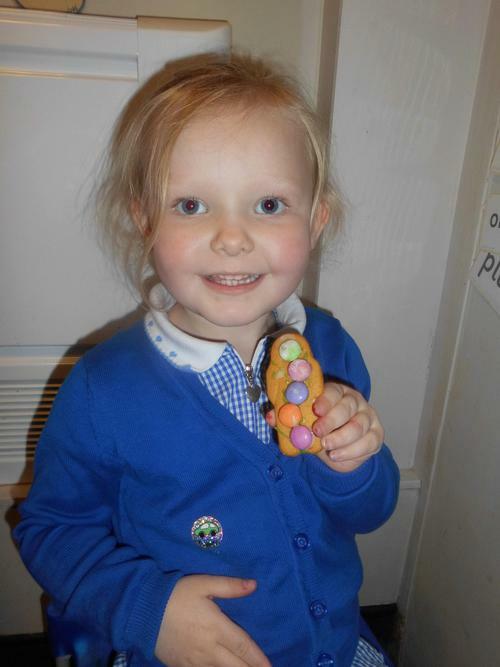 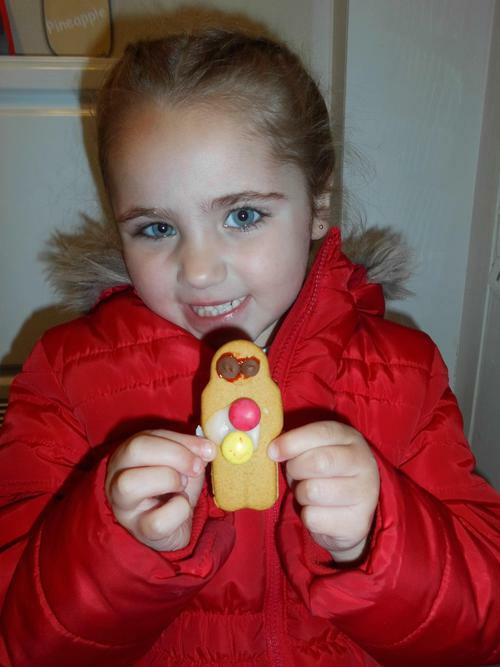 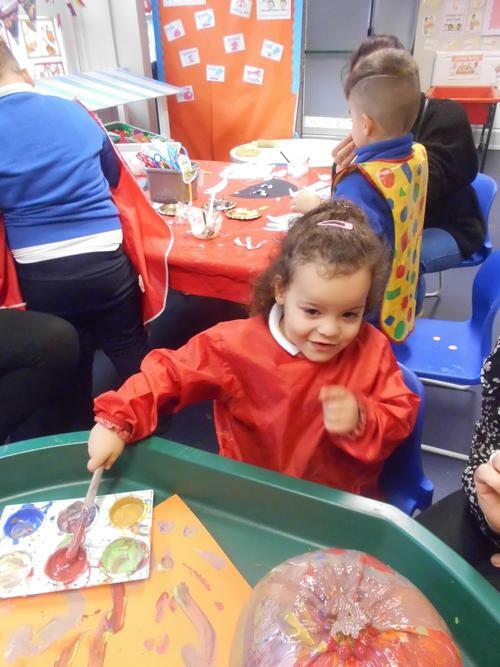 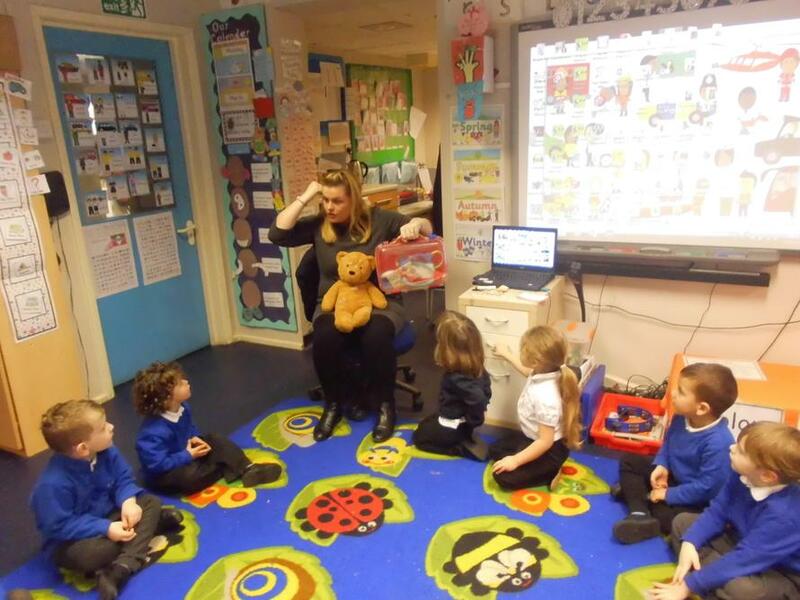 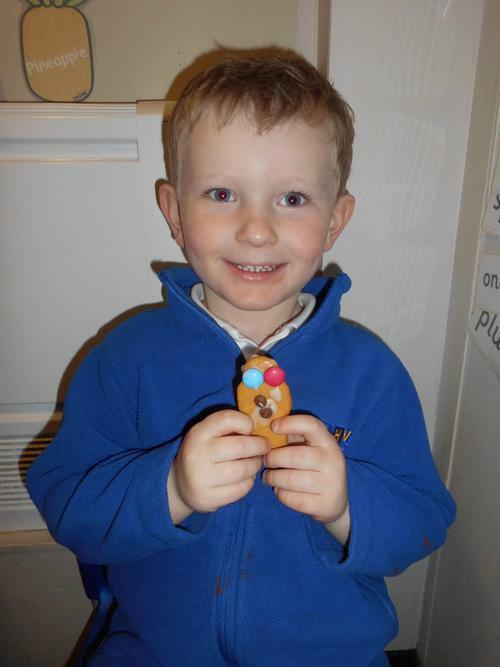 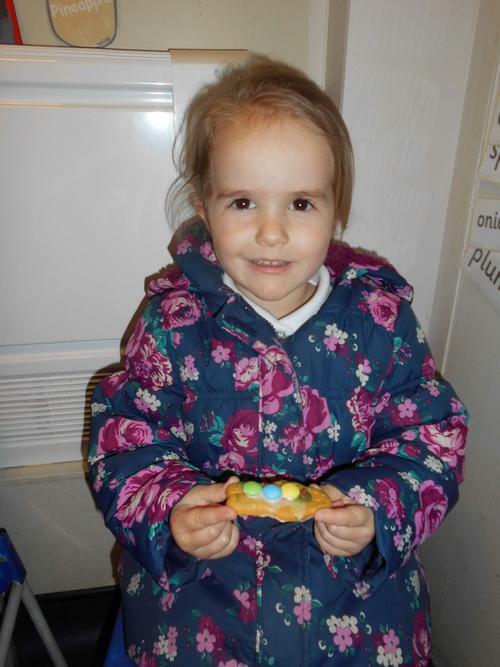 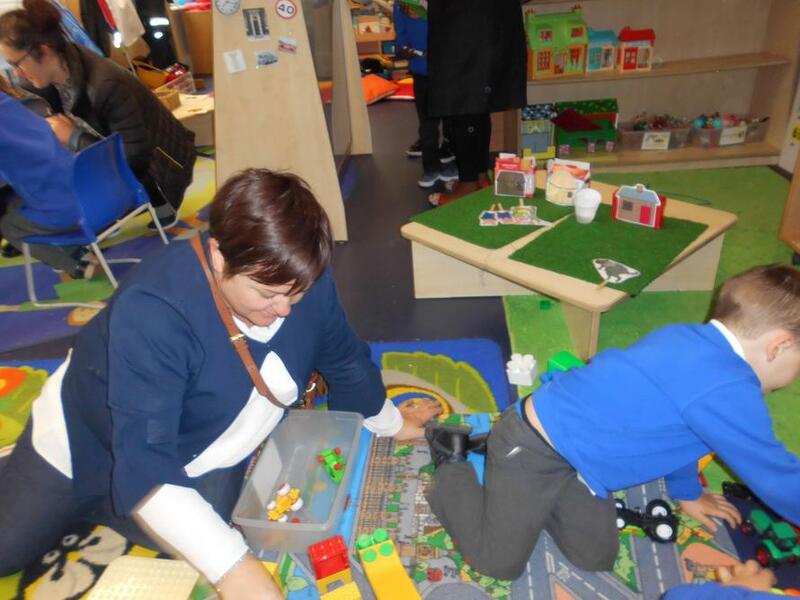 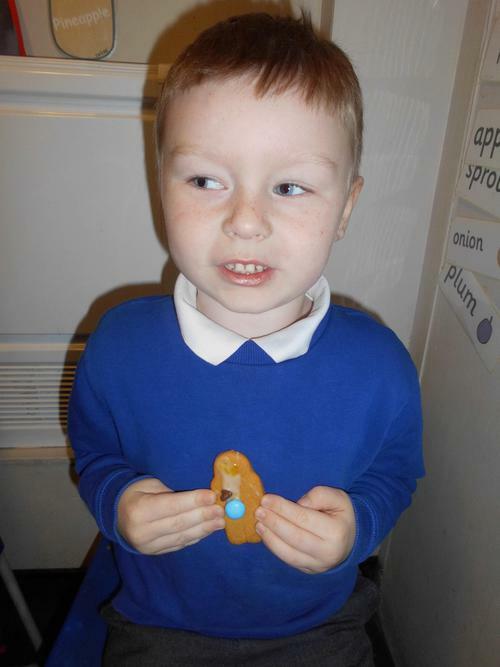 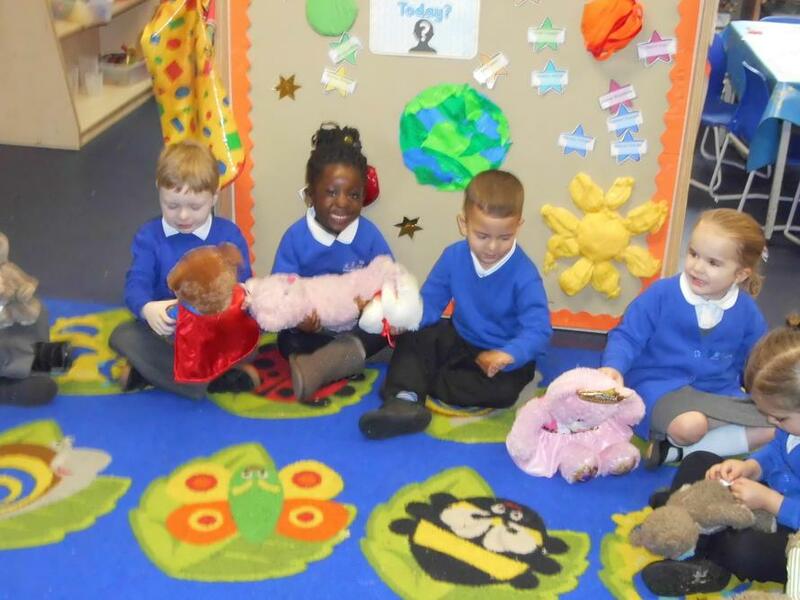 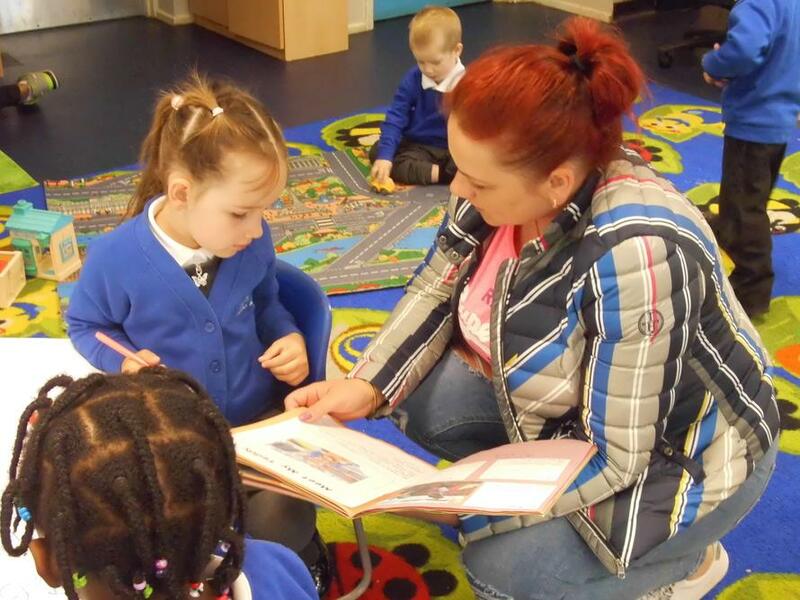 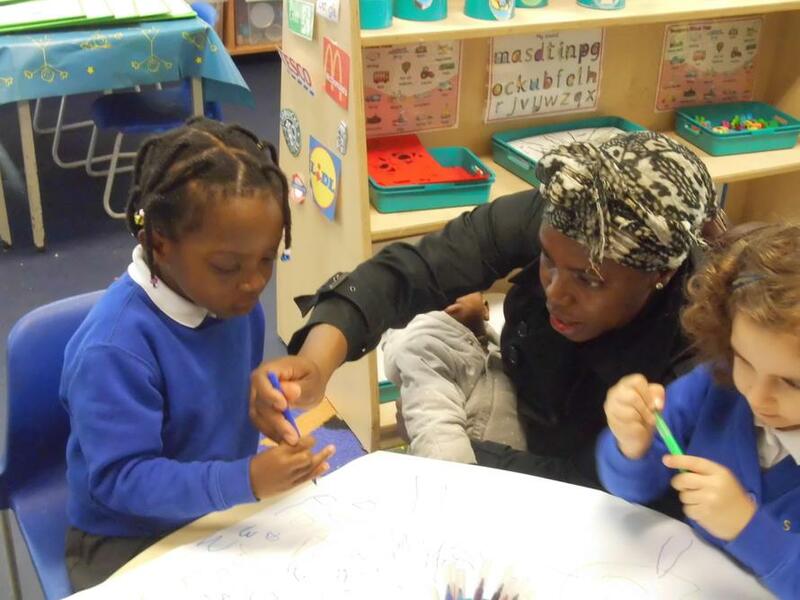 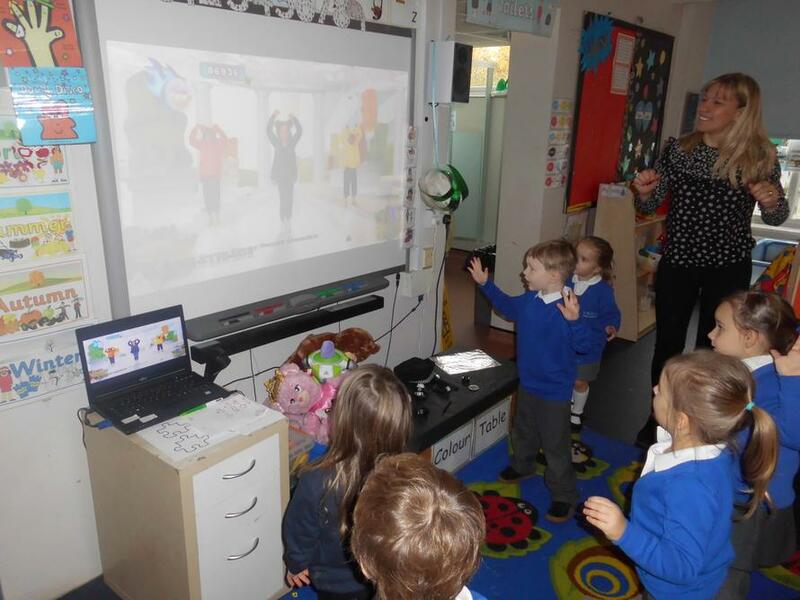 Our half termly EYFS 'stay and play' event took place on Tuesday 6th February. 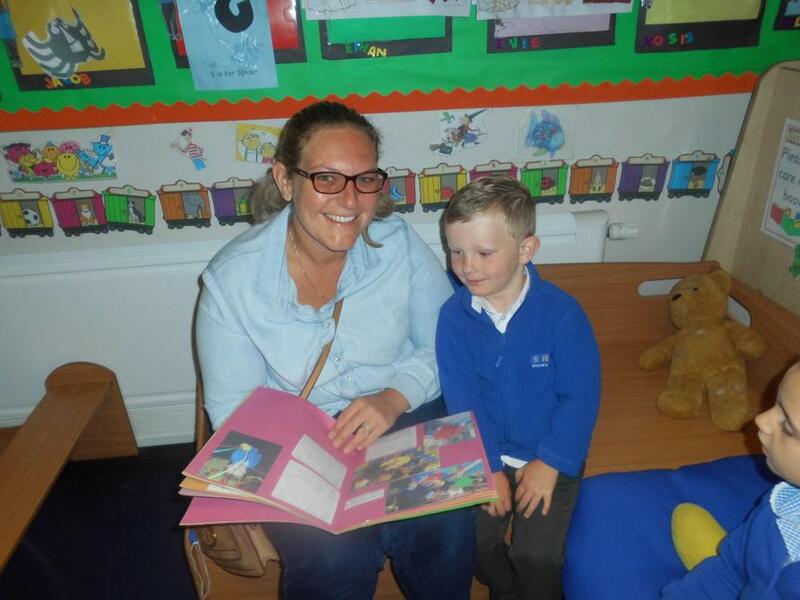 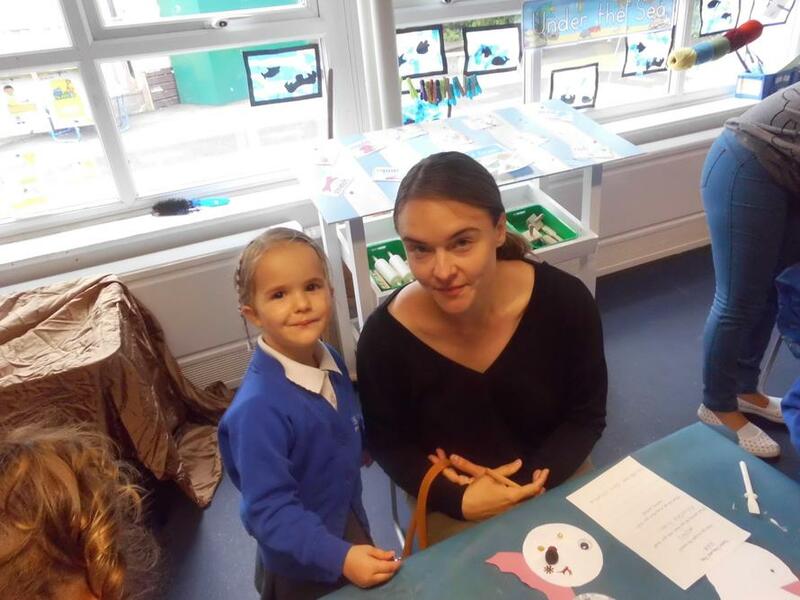 The children enjoyed sharing their learning journals with their parents as well as taking part in lots of different activities. 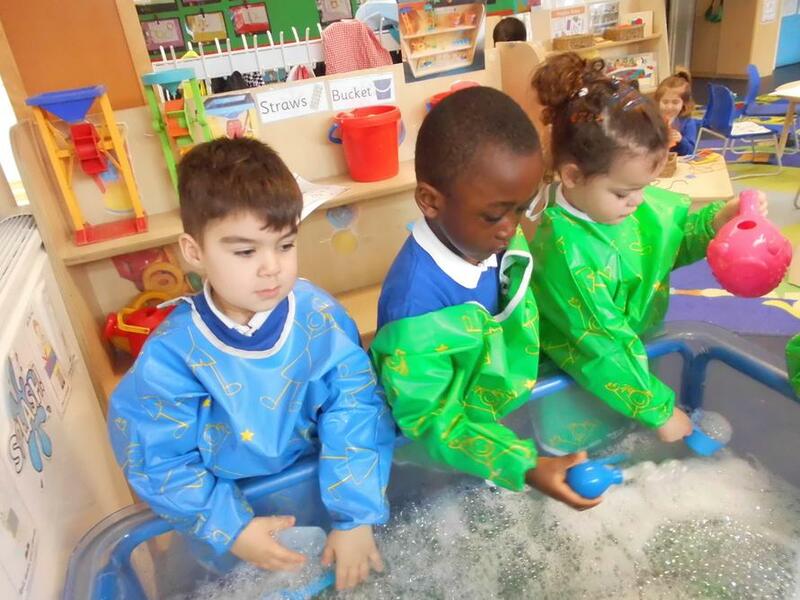 PE days in Nursery are Thursday PM and Friday AM. 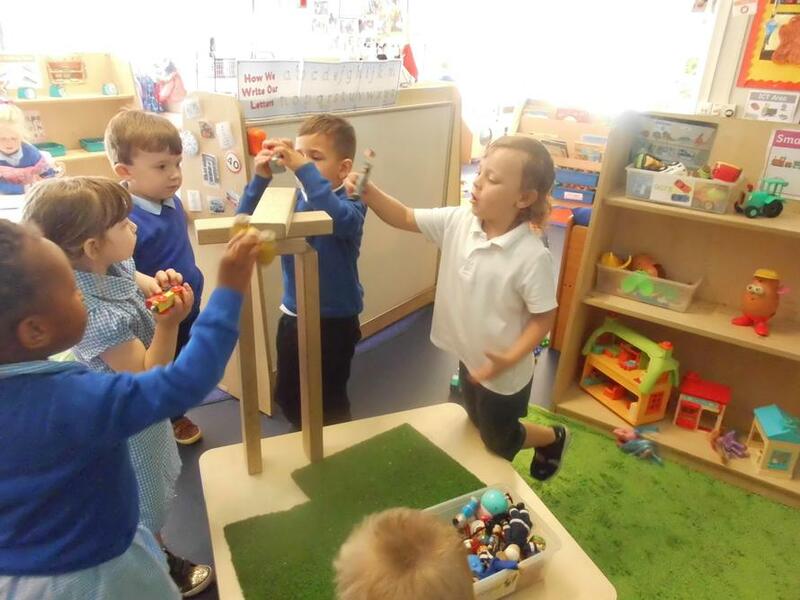 The children have been learning lots of different skills during PE lessons such as balancing, moving in lots of different ways, throwing and catching. 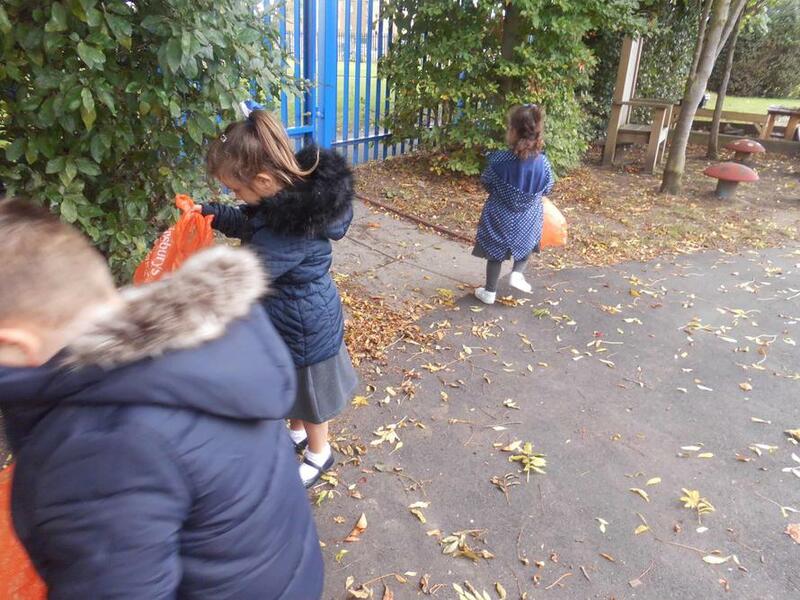 Here are some pictures below of the children working hard during PE learning all of these new skills. 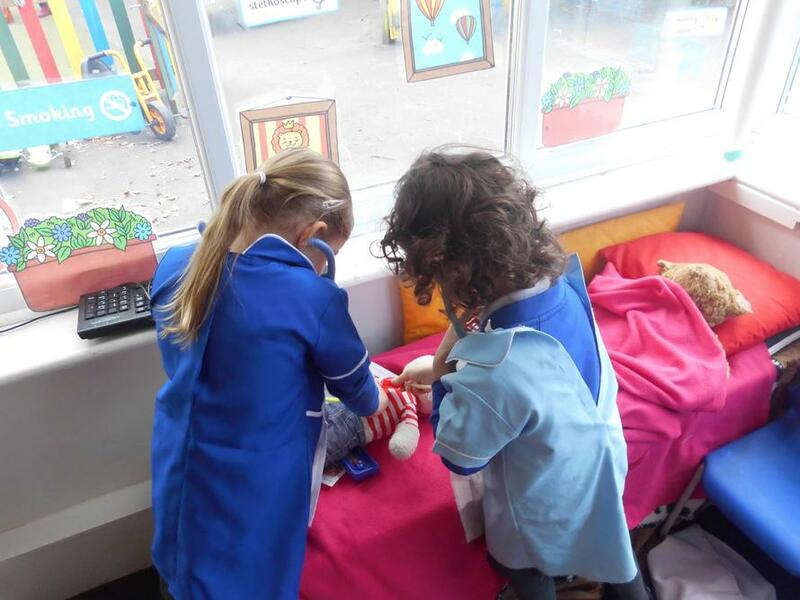 The children have also been working hard to put their own shoes and socks on after PE and are making good progress. 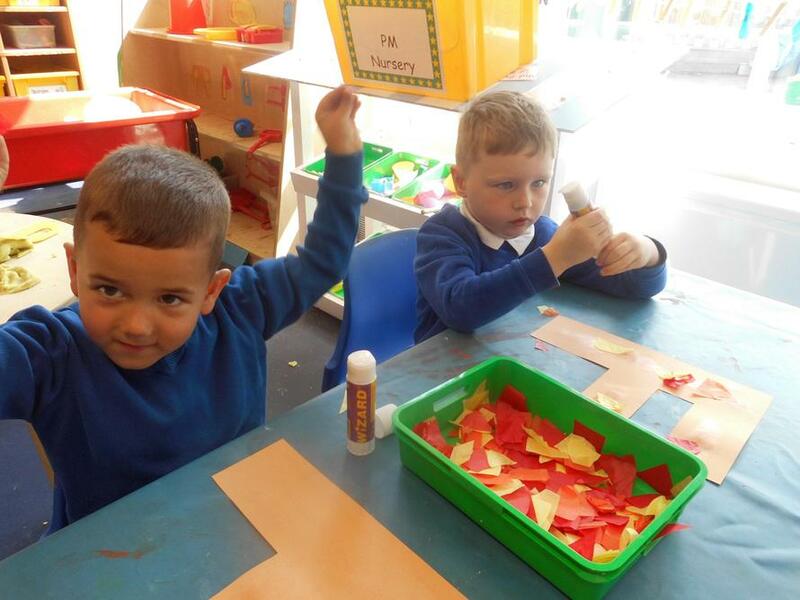 Independence is promoted in Nursery. 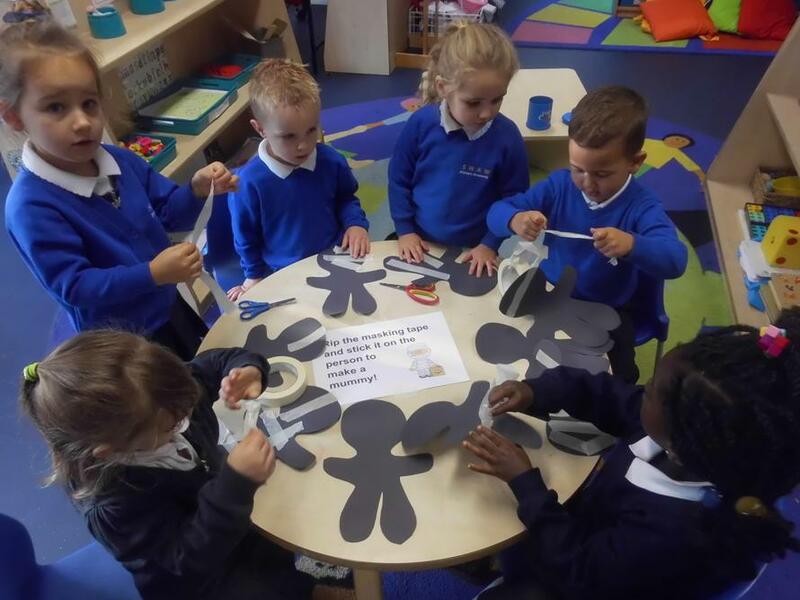 This half term our topic is 'People who help us', each week we will be learning about different people in our community that help us. 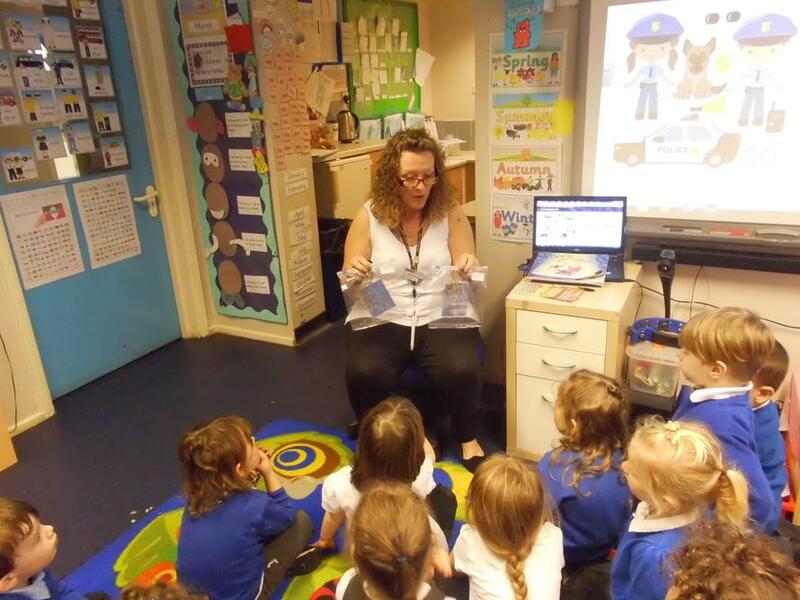 Starting with 'people who help us in school', we will then go on to talk about postal workers, Refuse collectors, fire fighters, Police, Doctor and Nurses. 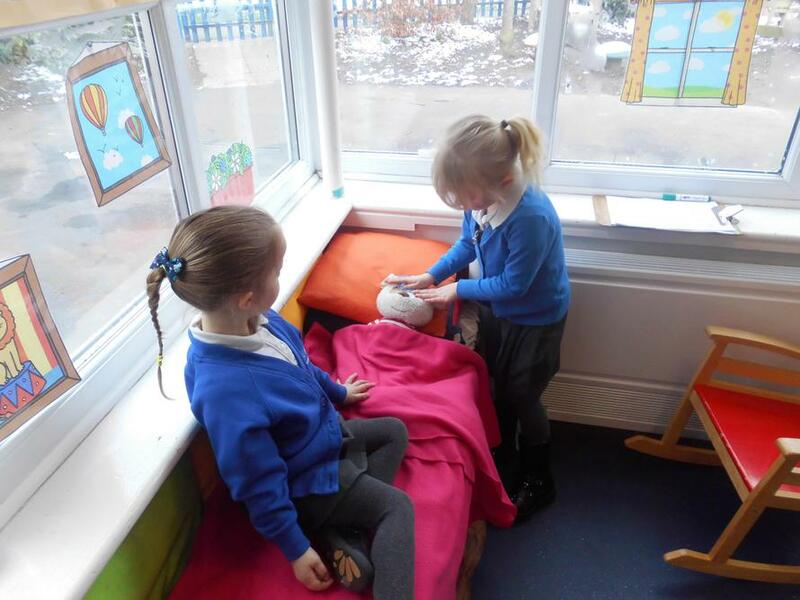 The first week back after half term, the children have enjoyed talking about people who help us in school. 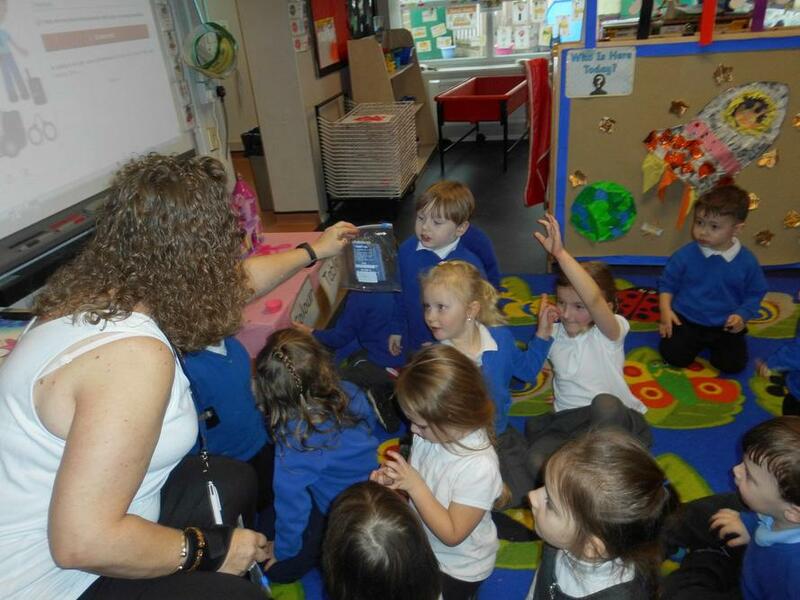 We have spoken about cleaners, cooks, librarians and also people who help us in class and out of class. 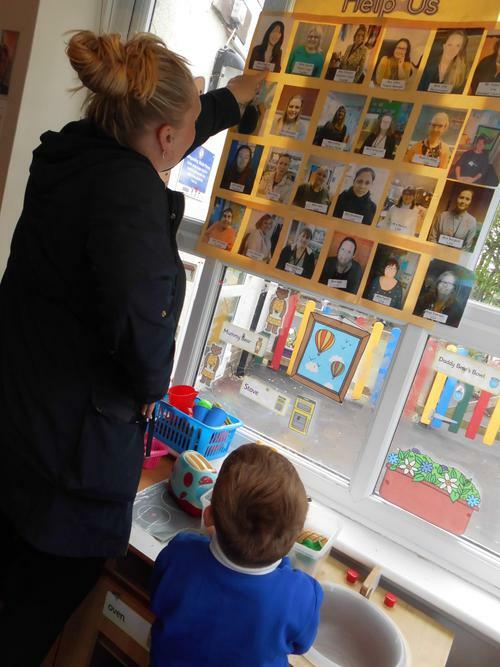 We enjoyed looking at photographs of members of staff and pointing out who we knew and how they help us! 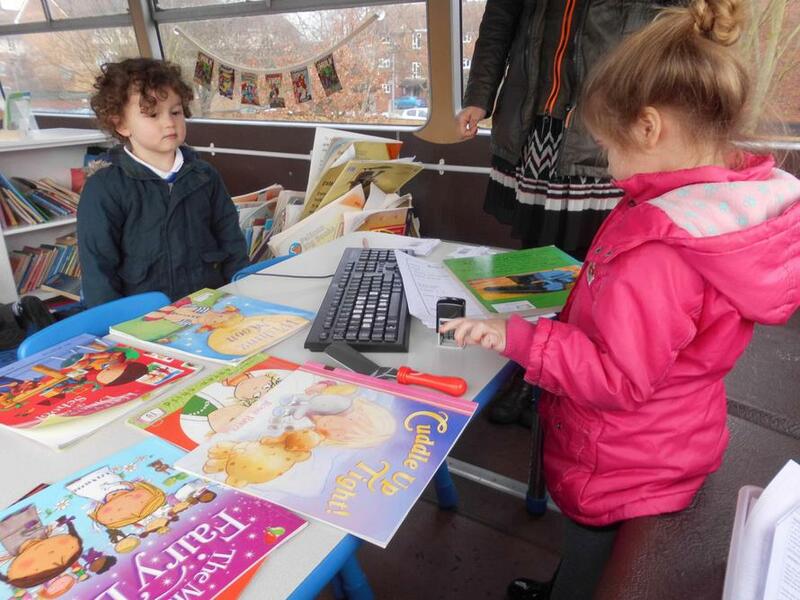 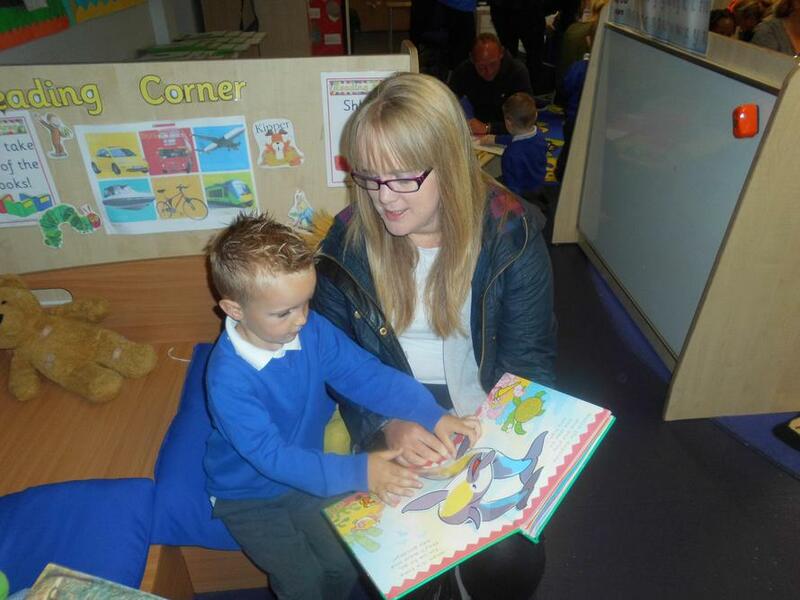 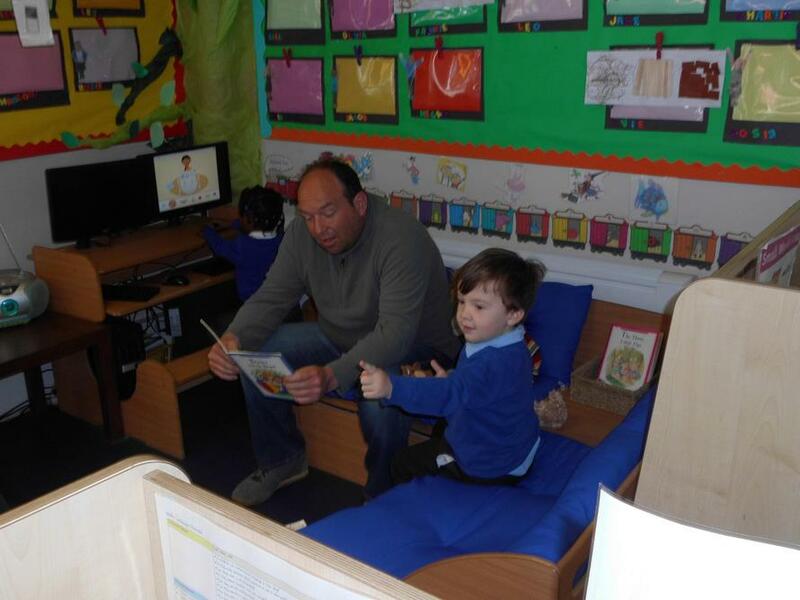 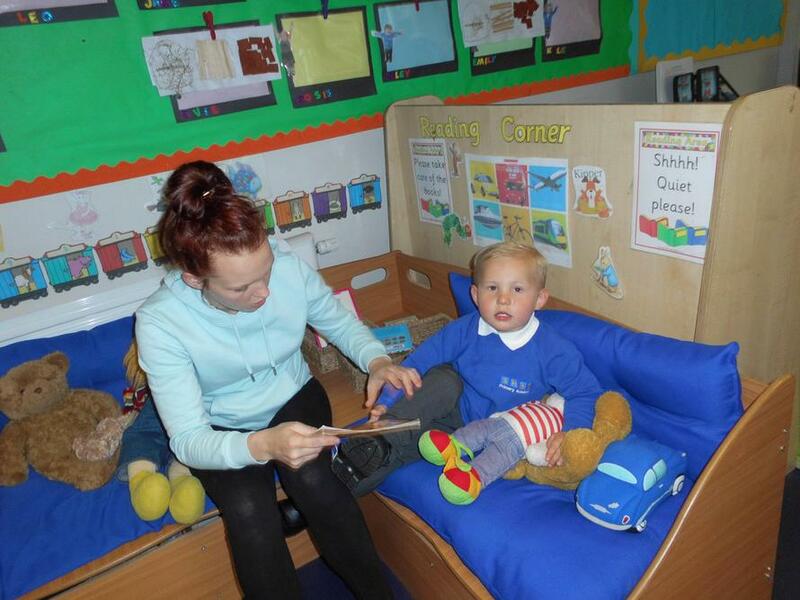 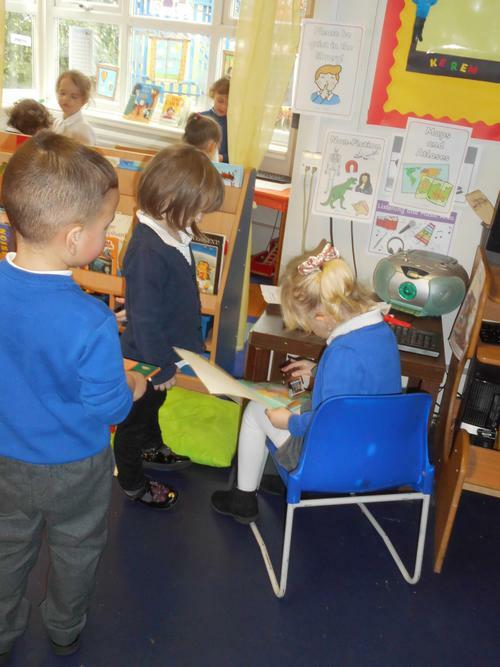 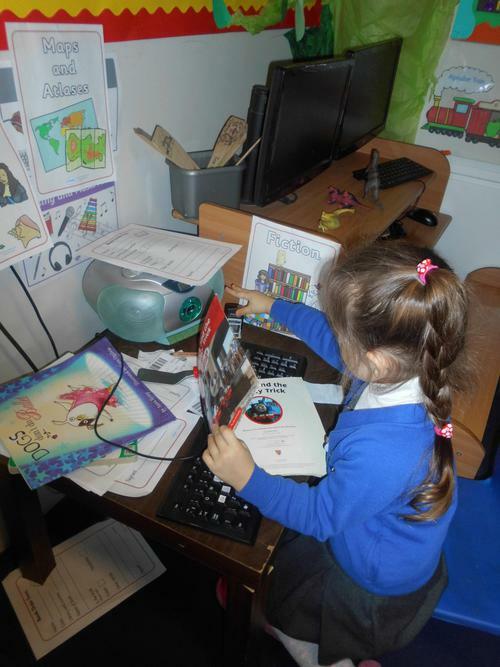 We have also enjoyed role playing in our school themed role play area and our role play library. 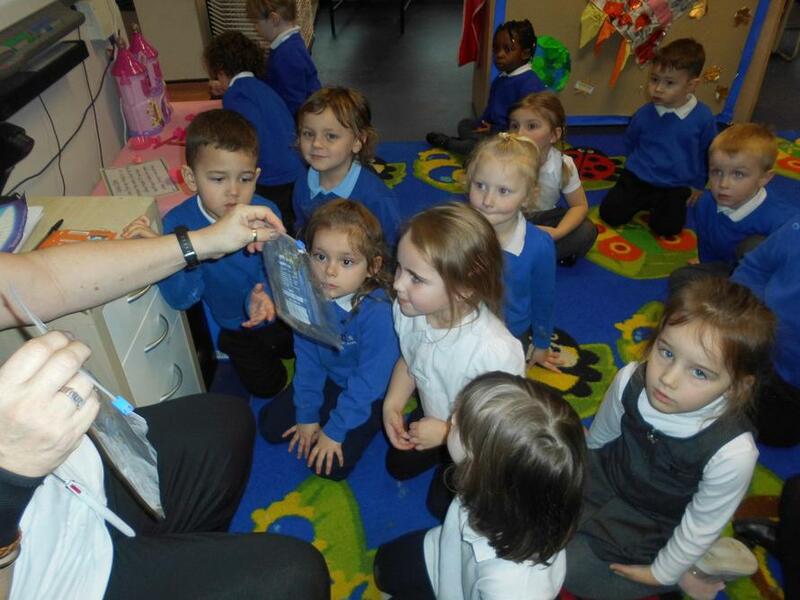 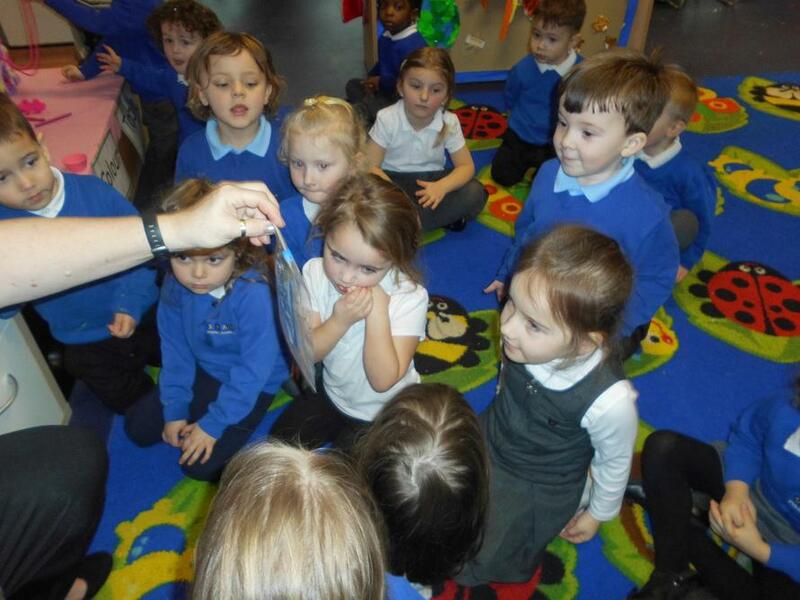 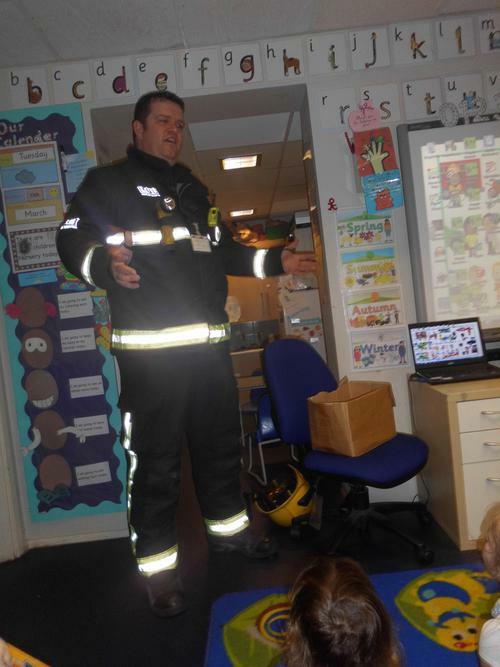 The children in morning Nursery enjoyed a visit from a paramedic on Wednesday 7th March. 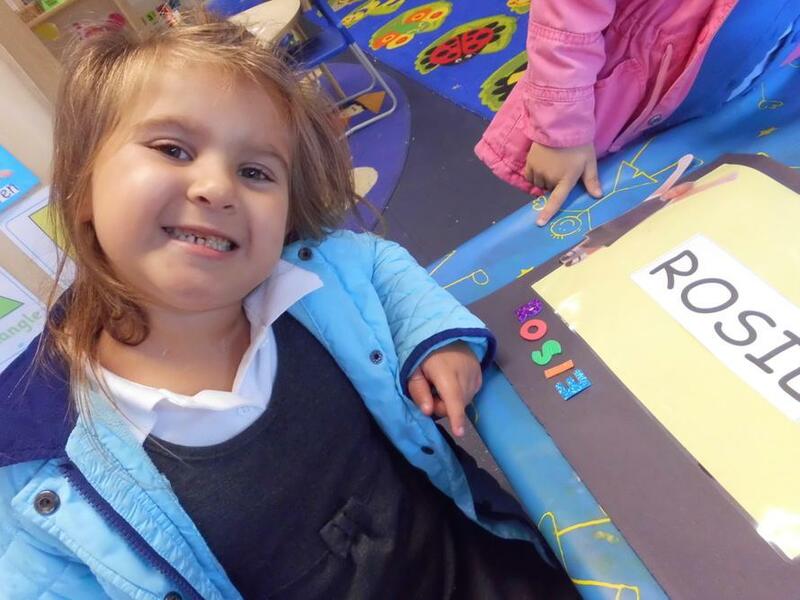 His name was 'Ross' and he bought his assistant with him called 'Louise'. 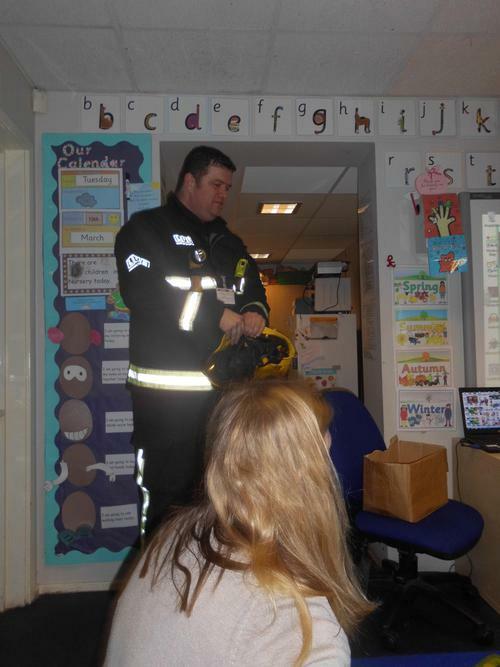 Rose showed the children the equipment he uses for his job and he talked about how he uses it and what for. 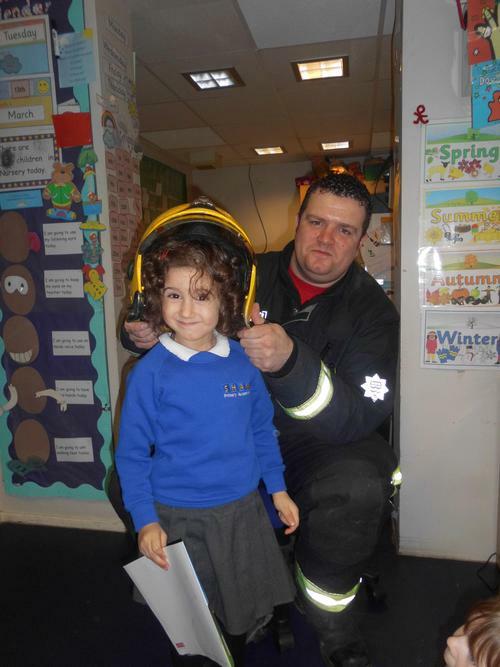 He also showed the children his paramedic helmet which the children enjoyed trying on! 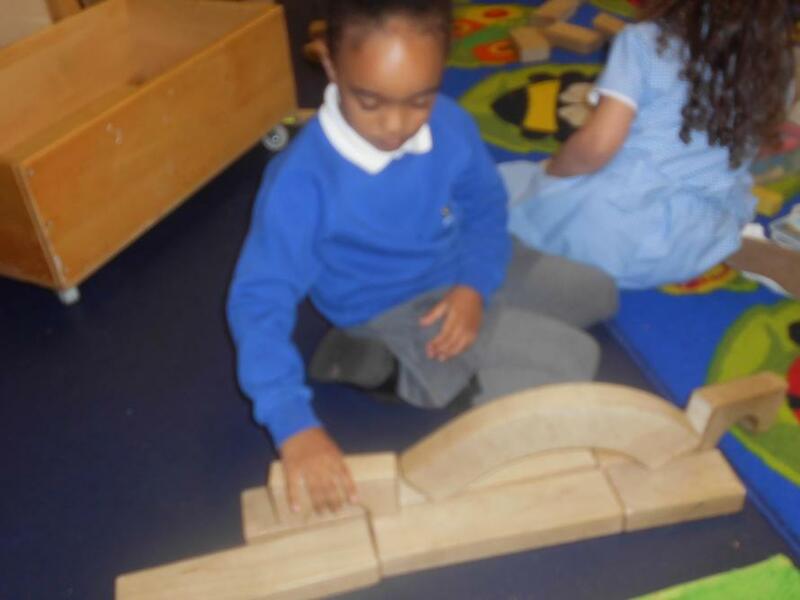 The children enjoyed making ladders with different materials to rescue small world people! 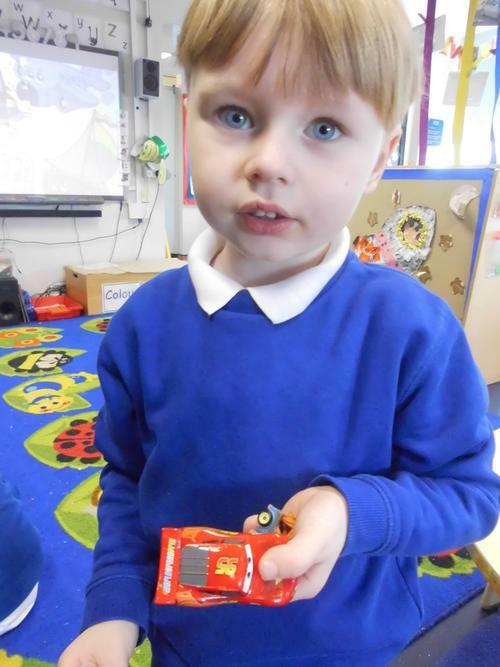 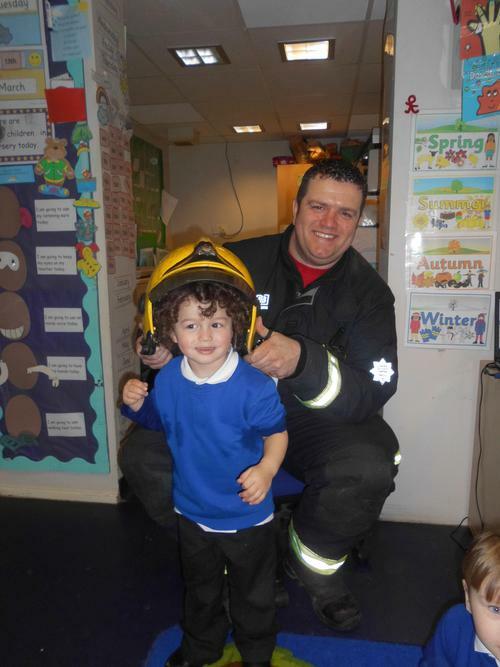 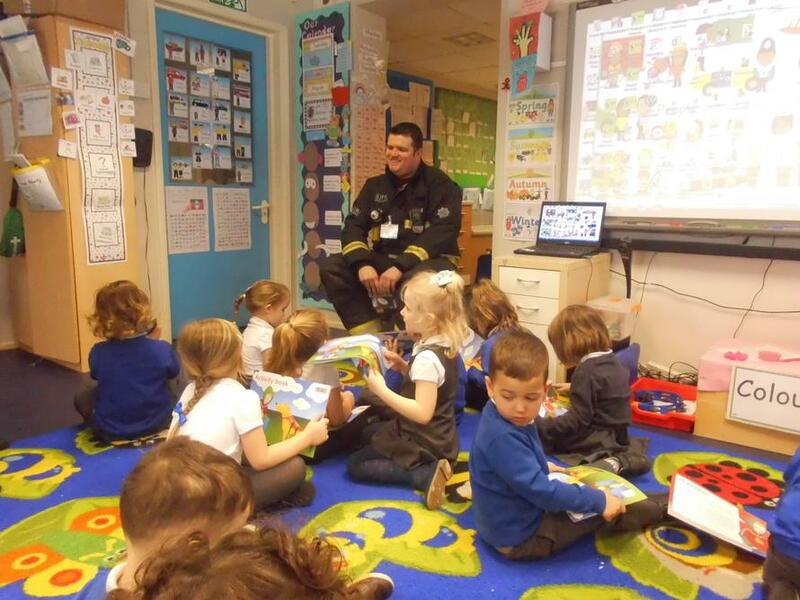 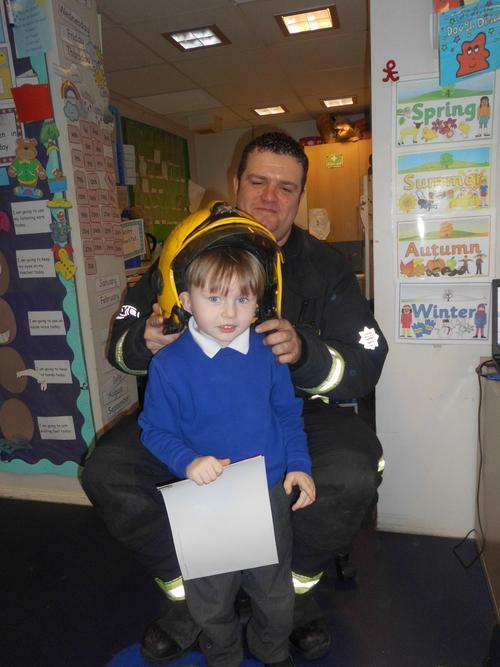 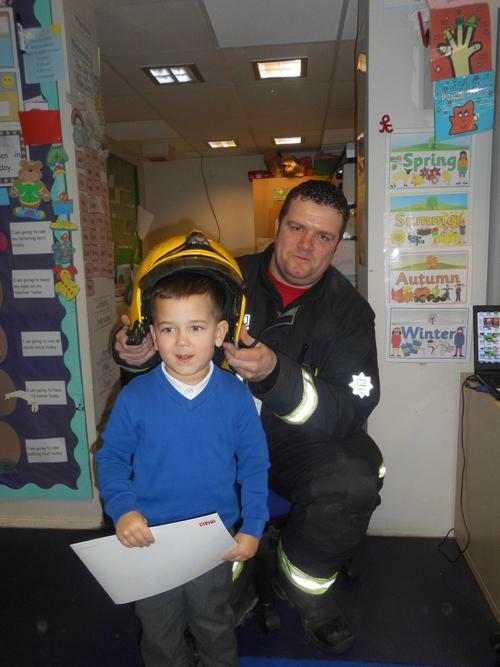 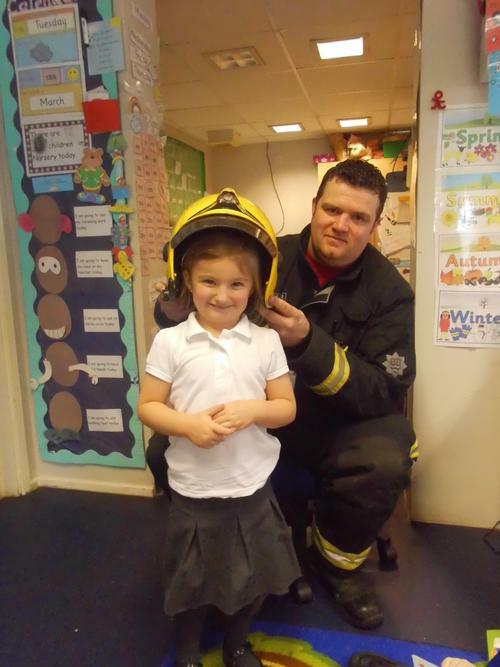 On Tuesday 13th March, the children in Nursery had a visit from a fire fighter! 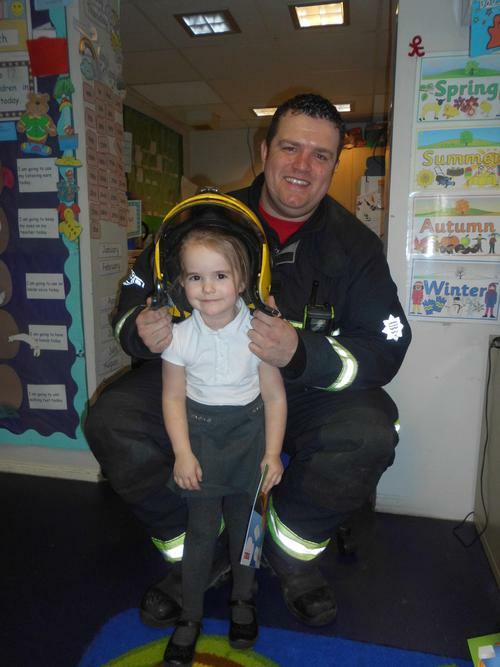 Evie's Dad James is a fire fighter in London and came to speak to the children about his job and answer their questions. 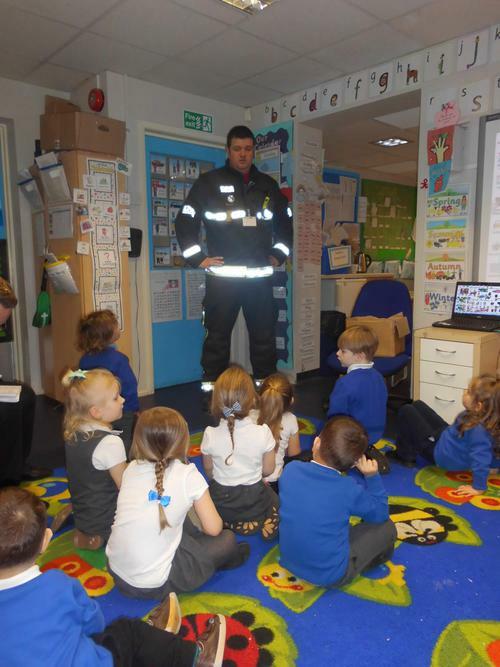 The children listened really well to the advice given about what to do when they see a fire, they all practiced calling out 'FIRE' to wake up their mummies and daddies! 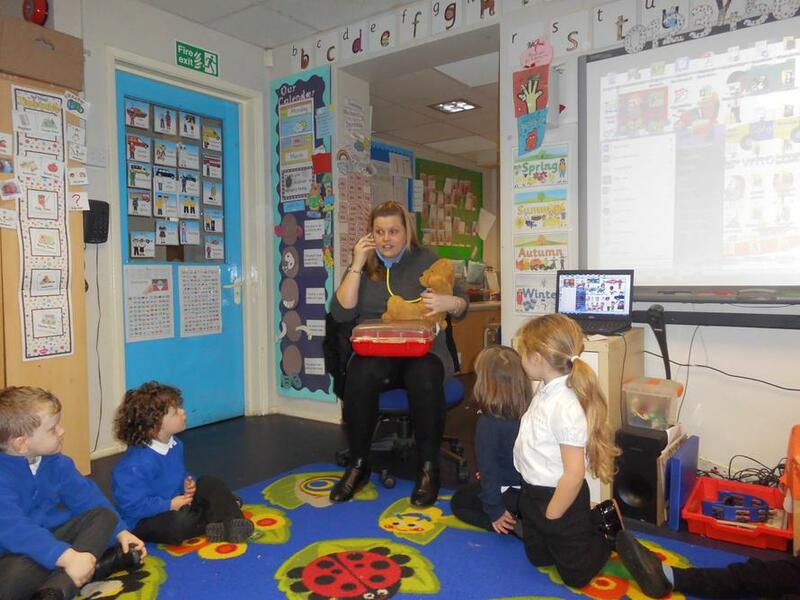 The children also enjoyed asking James questions about his job e.g. 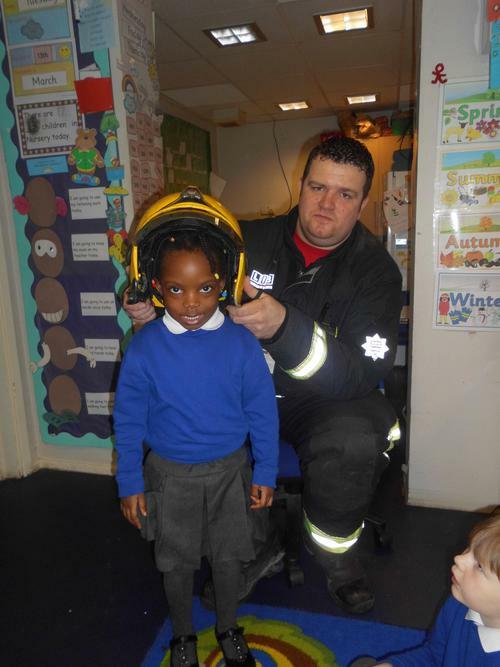 'have you ever rescued a cat from a tree?' 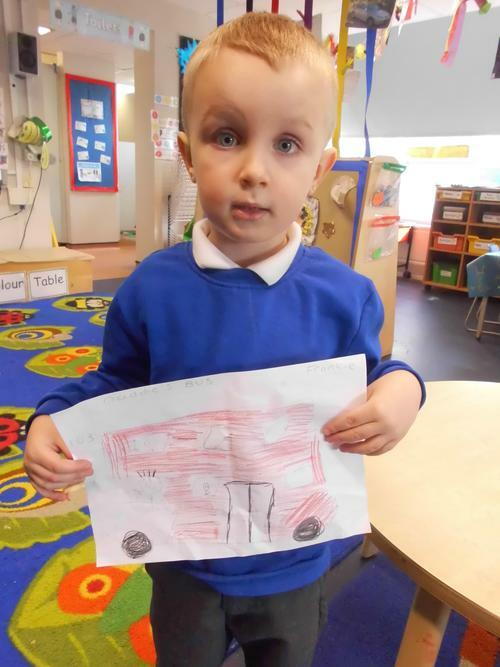 'do you drive the fire engine?'. 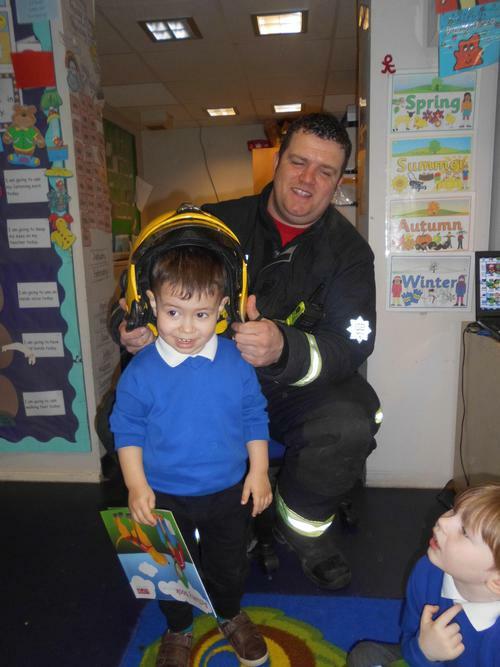 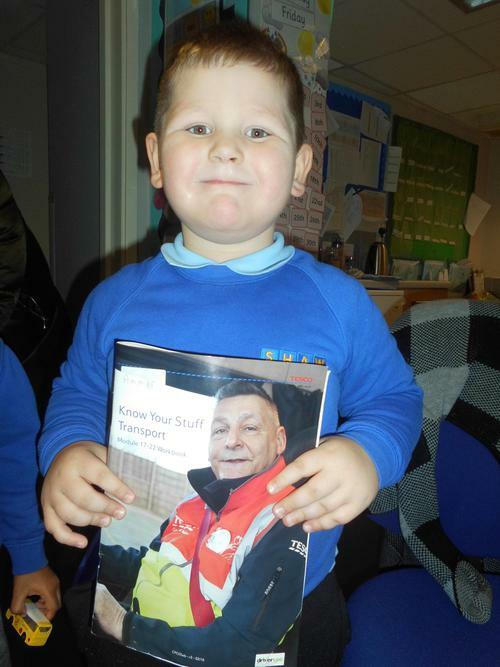 The children also got to try on James' fire fighter helmet and were given a fun activity pack to do at home! 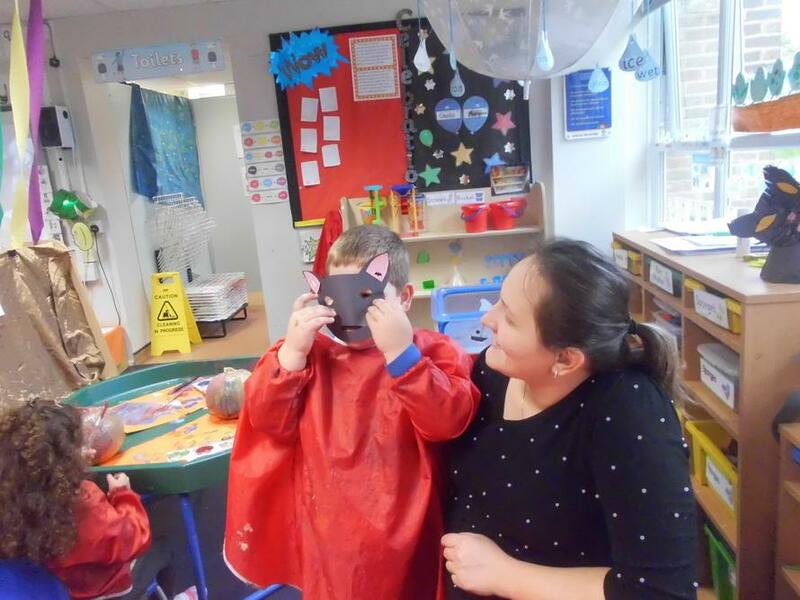 It was a fun interesting visit, thank you James! 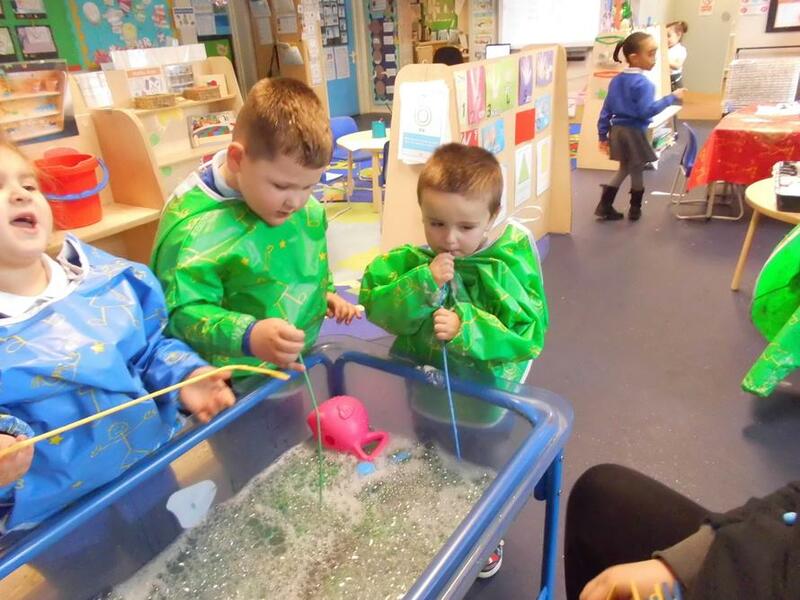 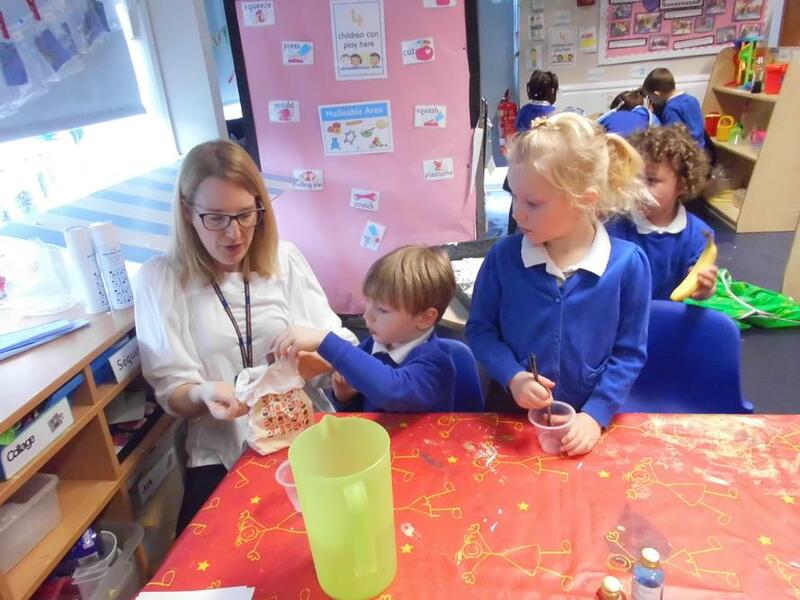 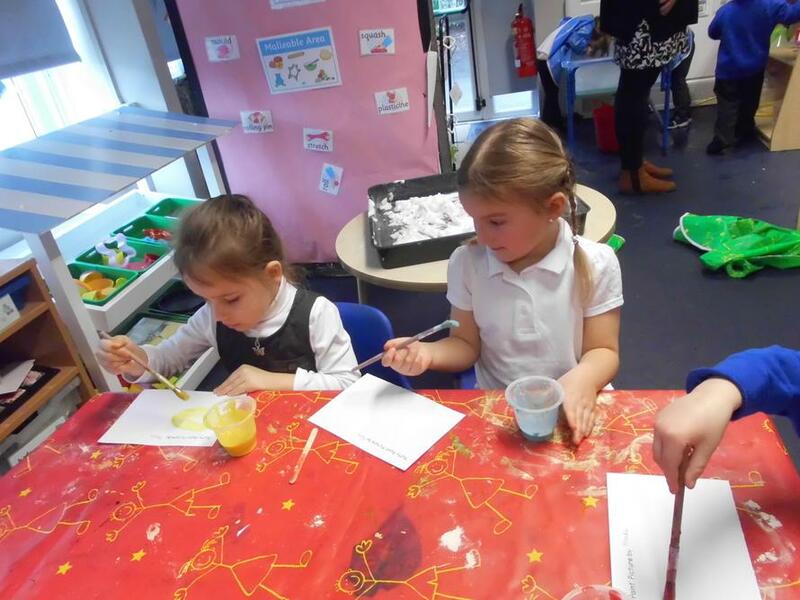 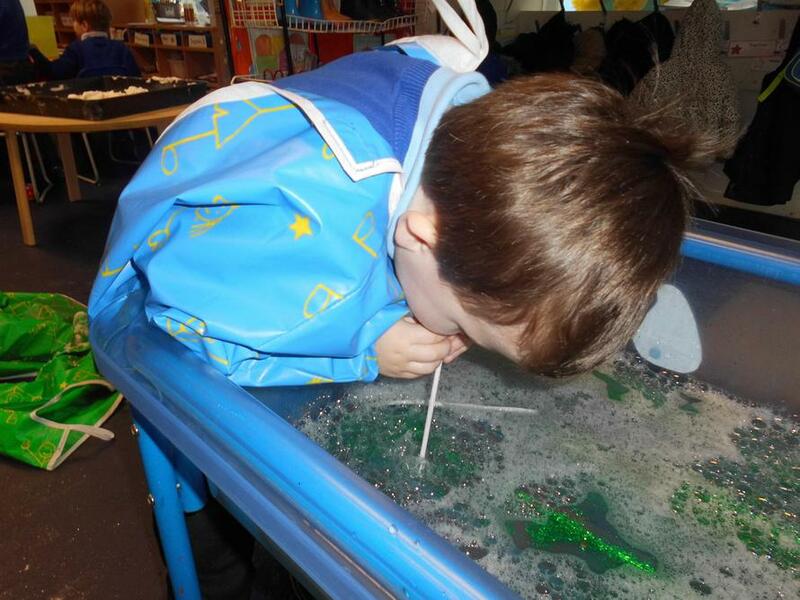 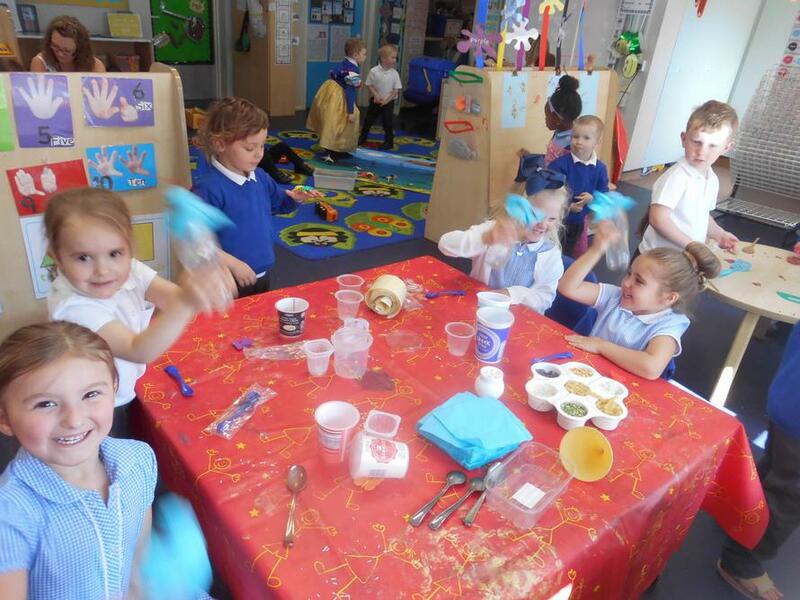 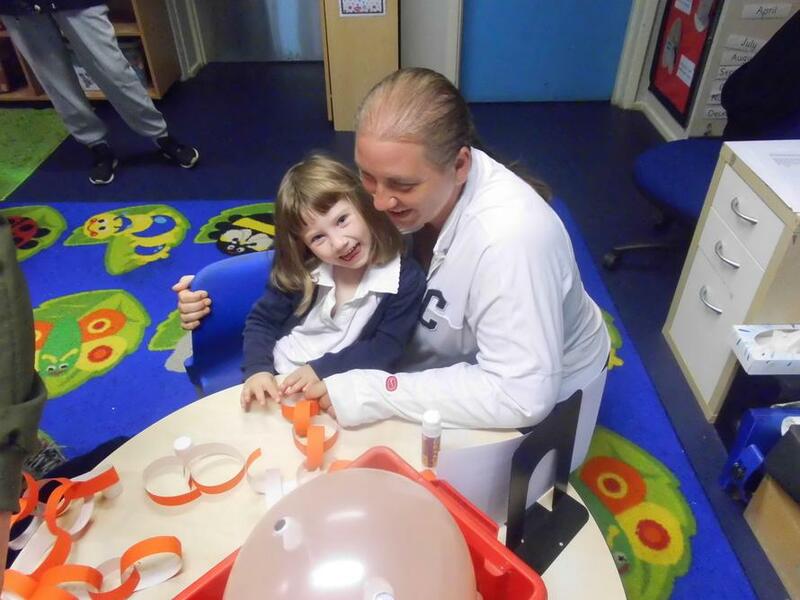 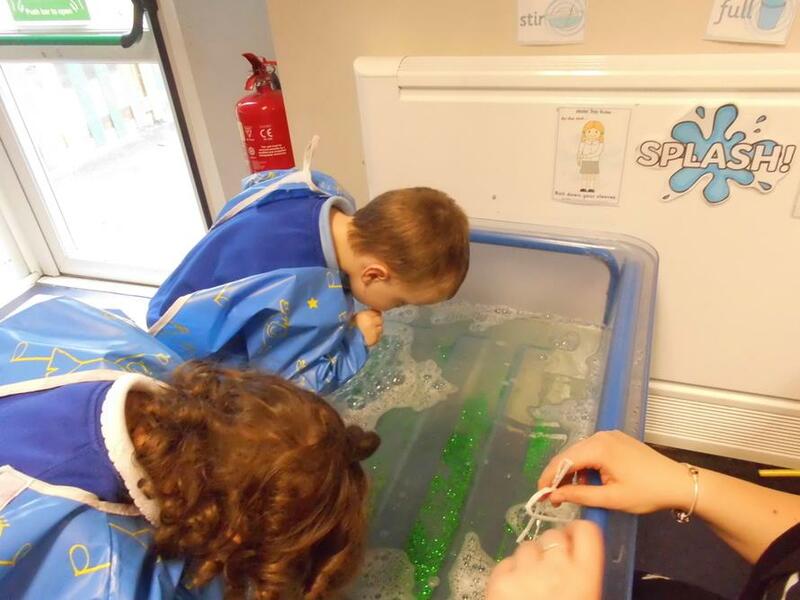 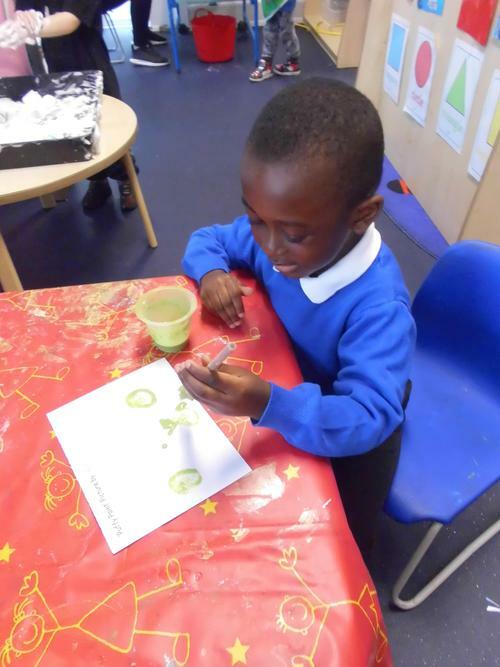 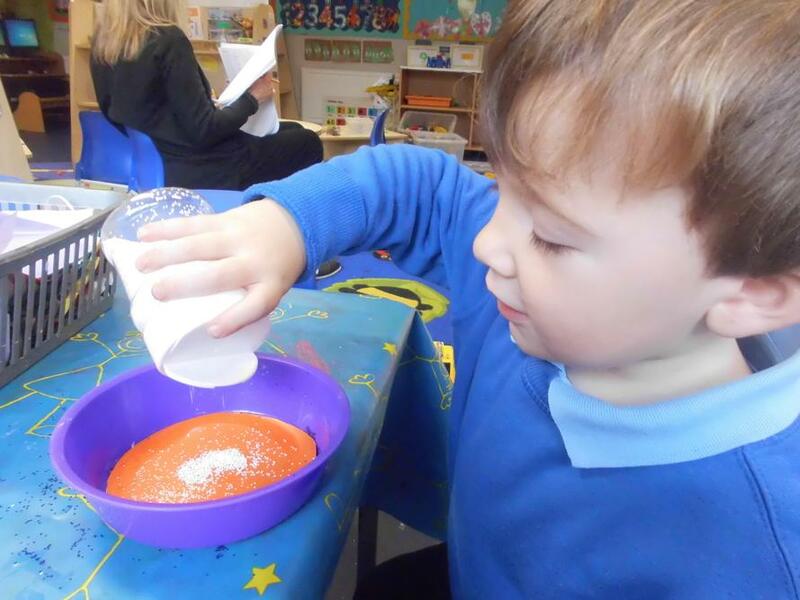 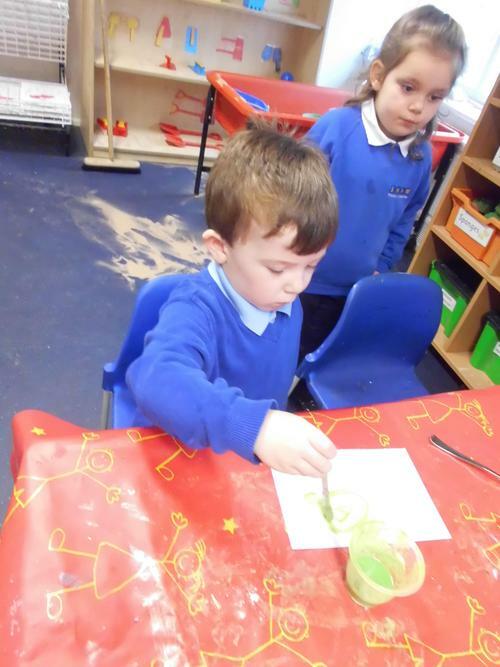 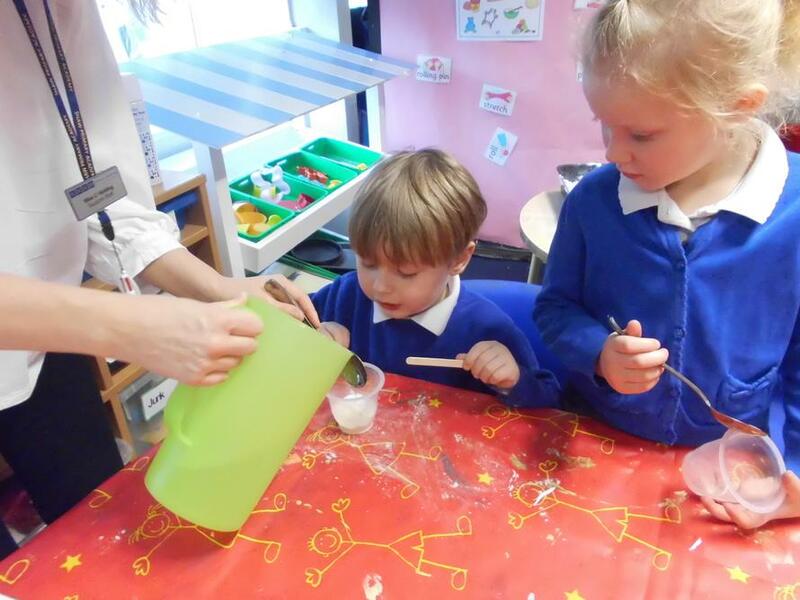 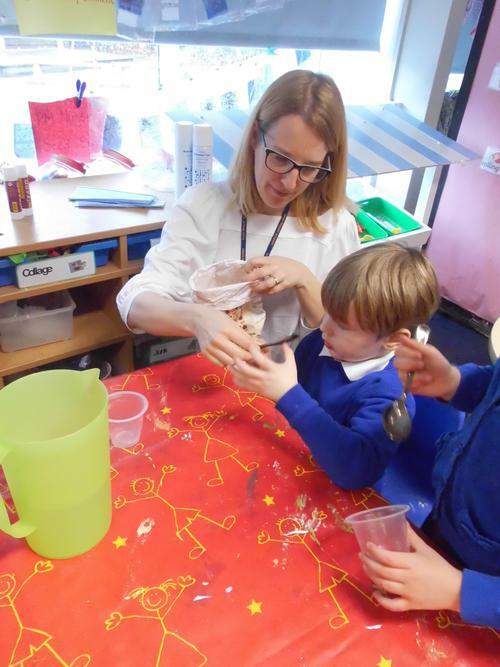 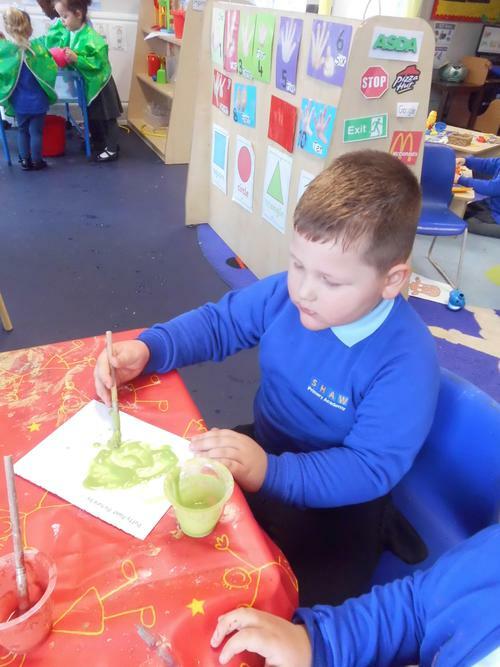 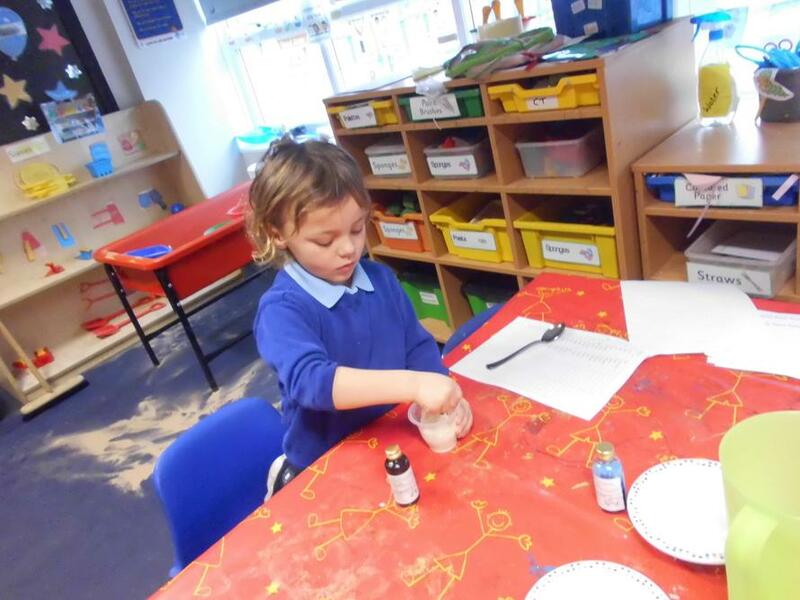 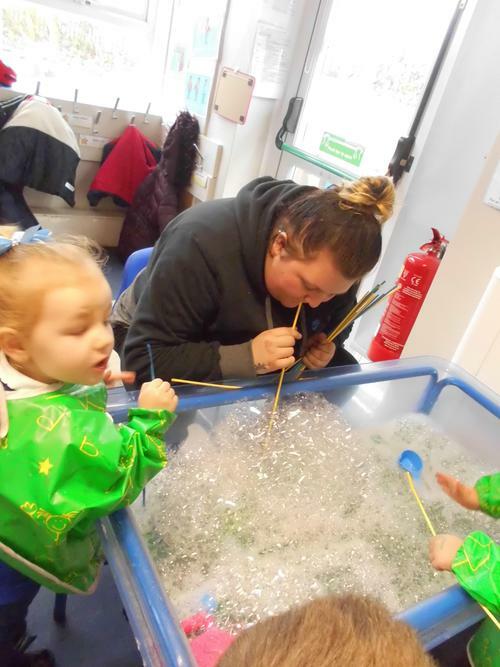 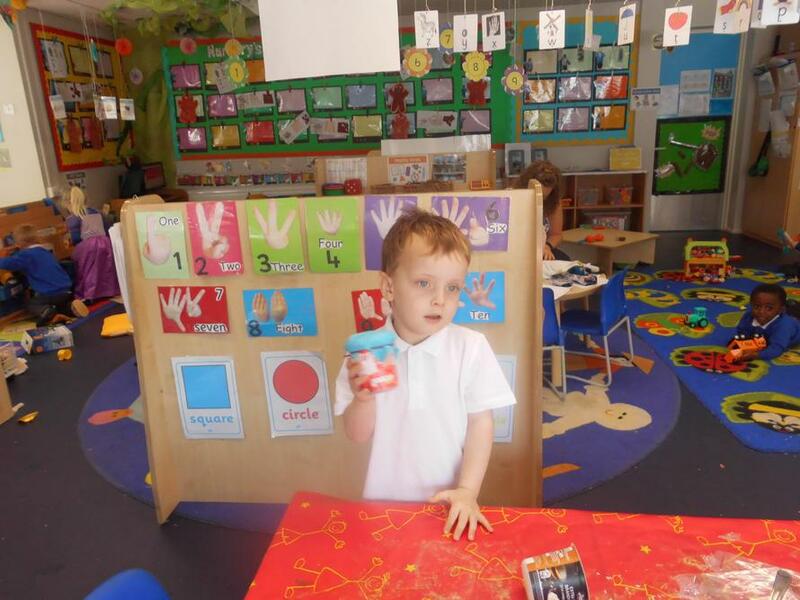 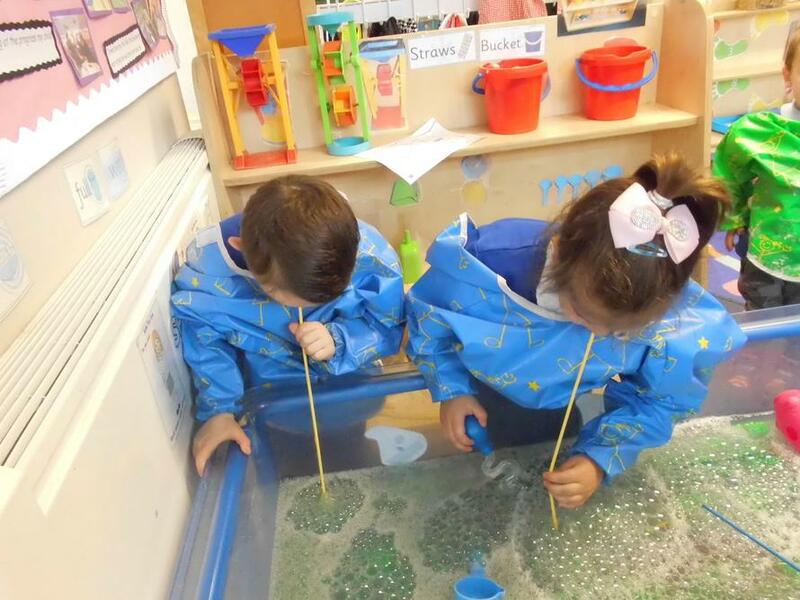 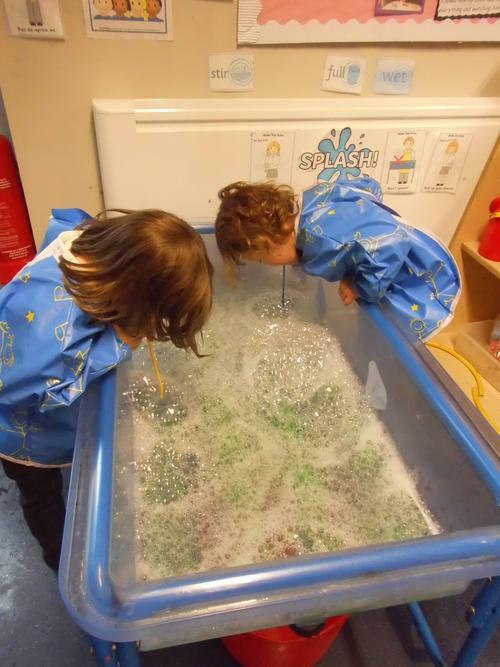 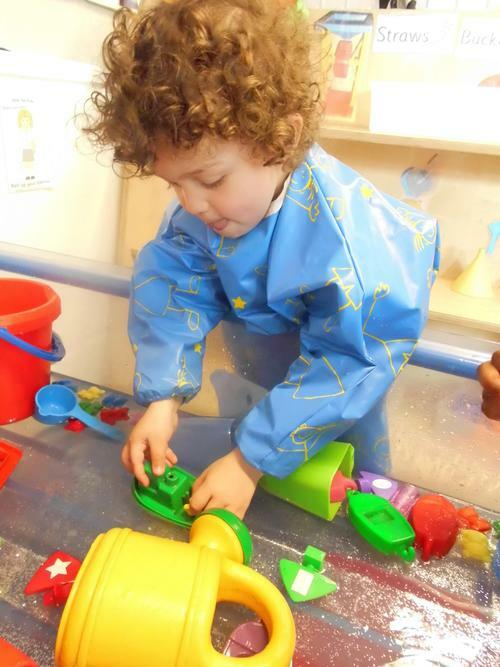 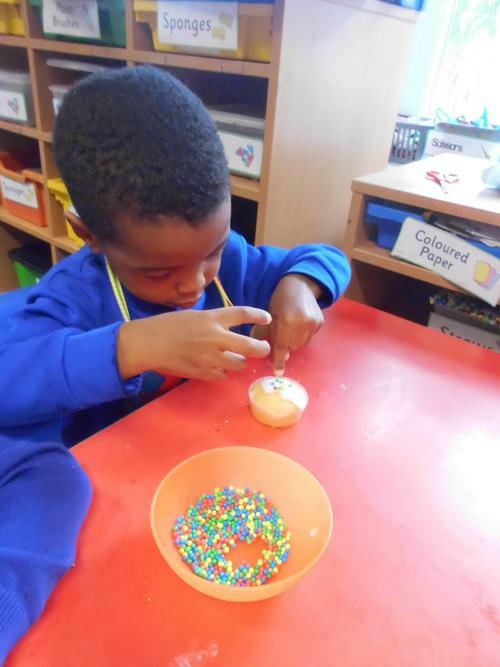 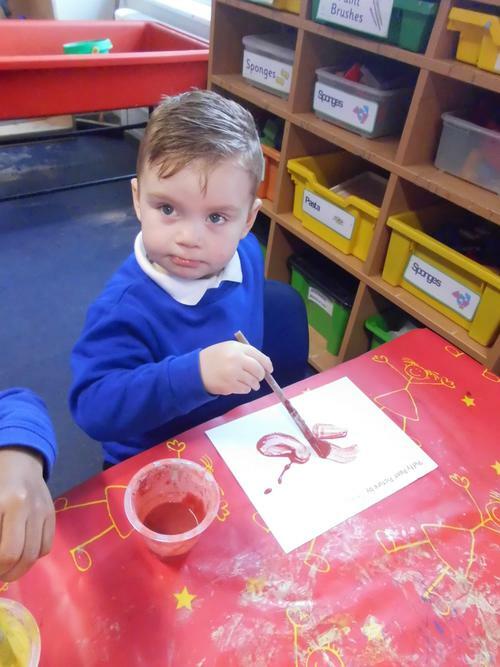 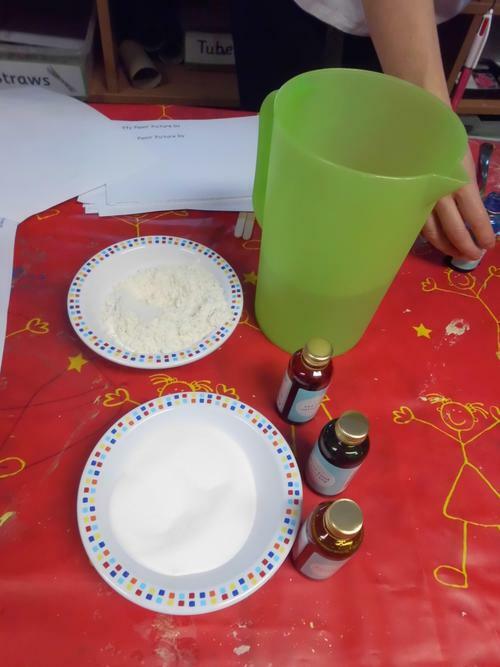 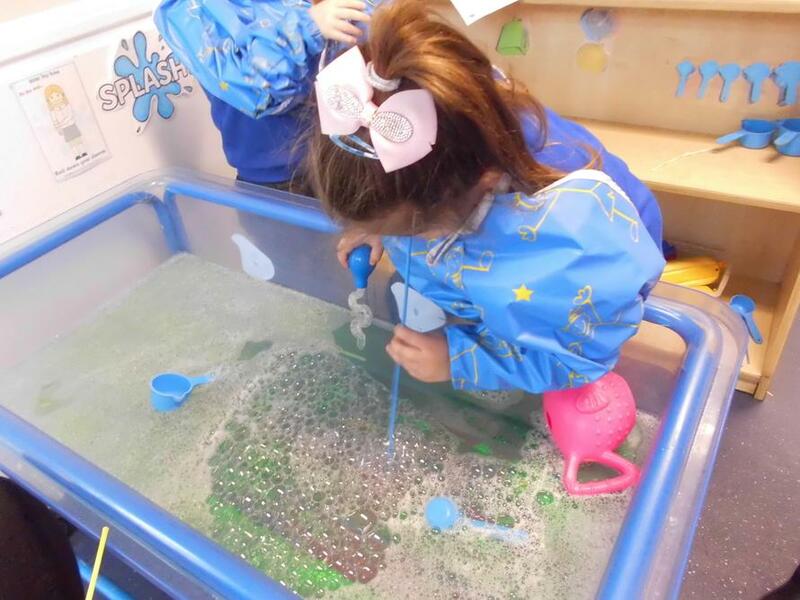 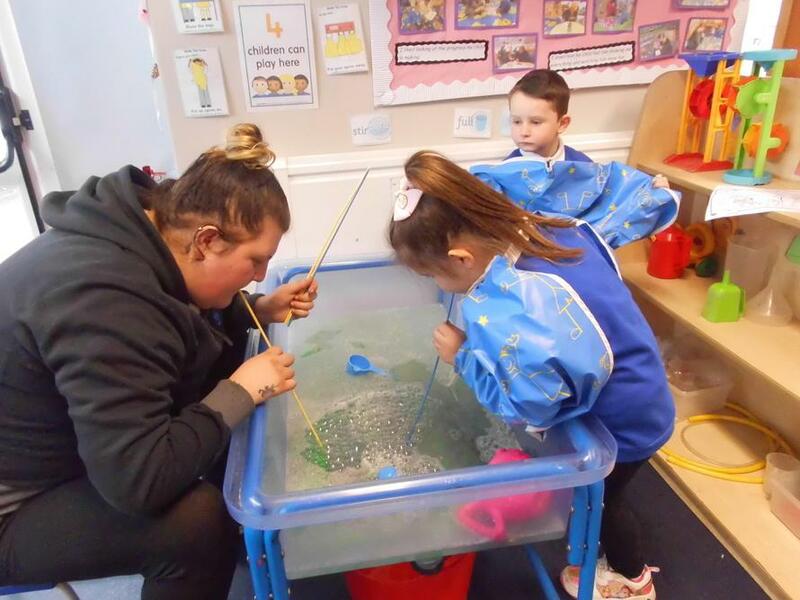 This week (12th-16th March) has been science week and we have been doing lots of different science experiments in Nursery! 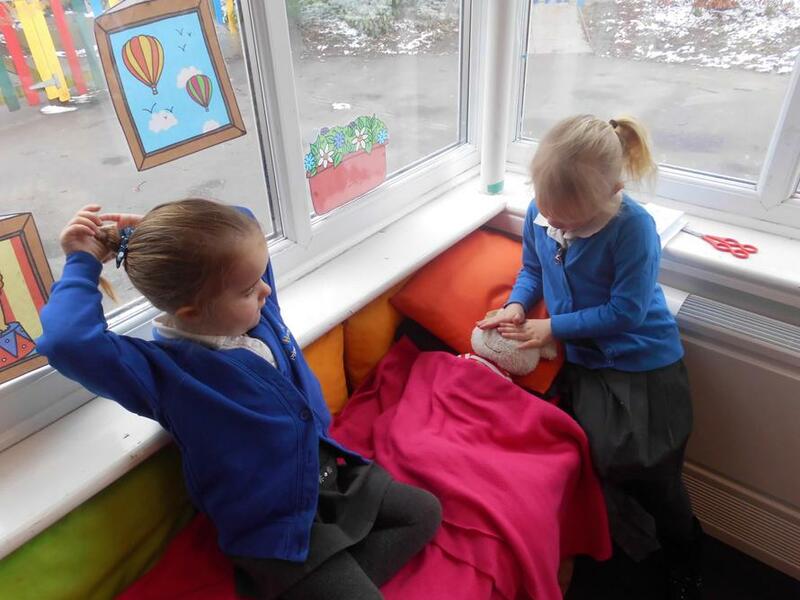 We planted seeds in zip-lock bags and watered them.We spoke about what plants need to grow and we watered them and we then hung them up in front of the window and watched them grow in front of our eyes! 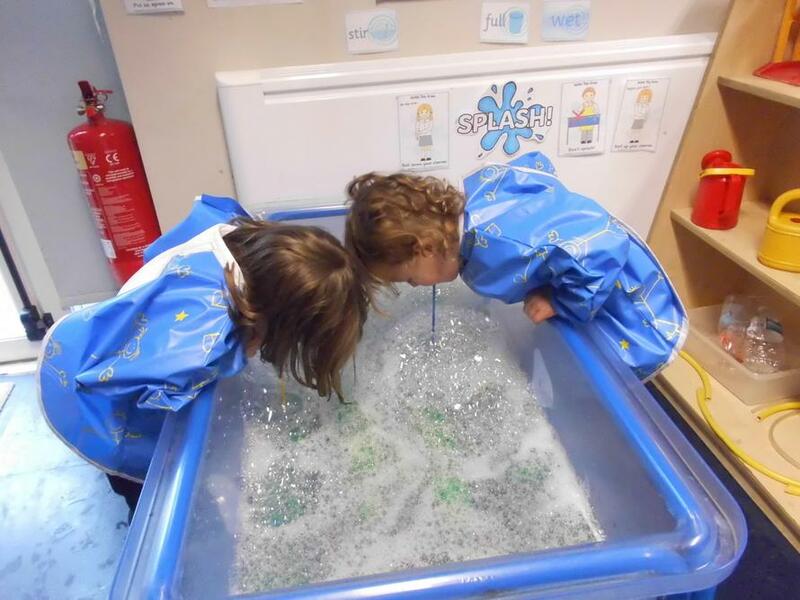 We had lots of numbers hidden in ice! 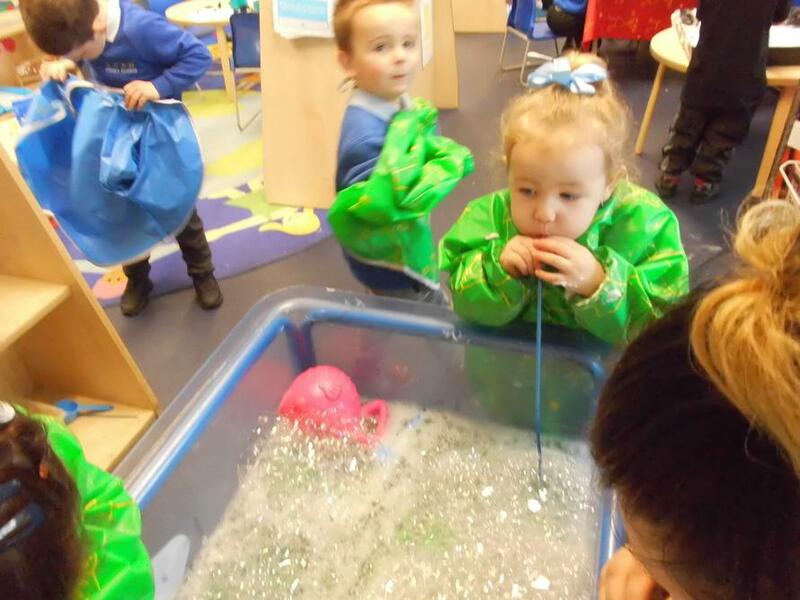 We investigated the ice using our senses and thought of a plan to try to break free the numbers hidden inside! 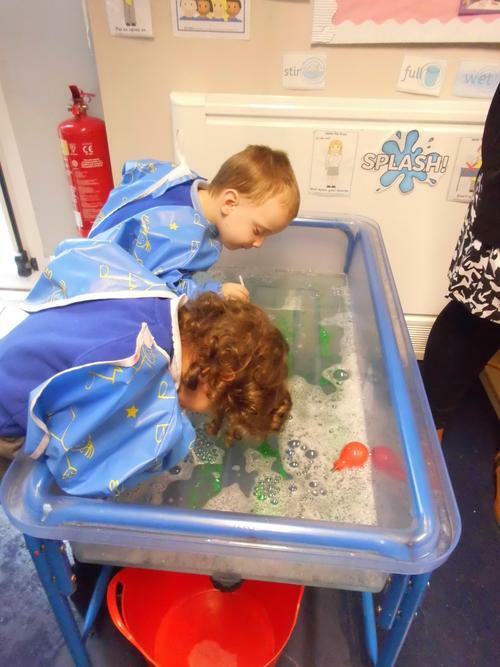 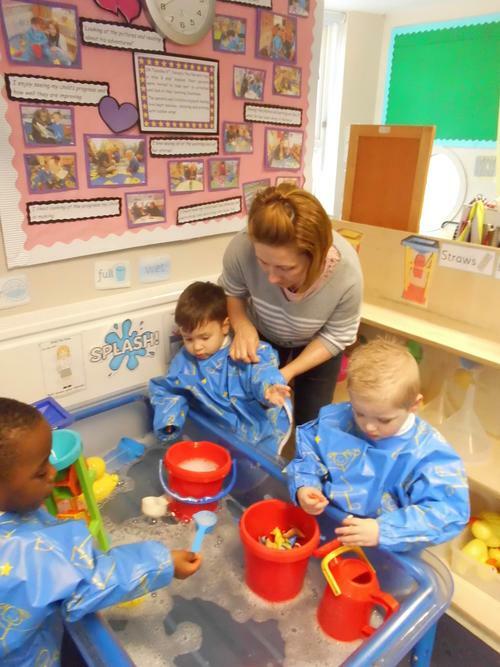 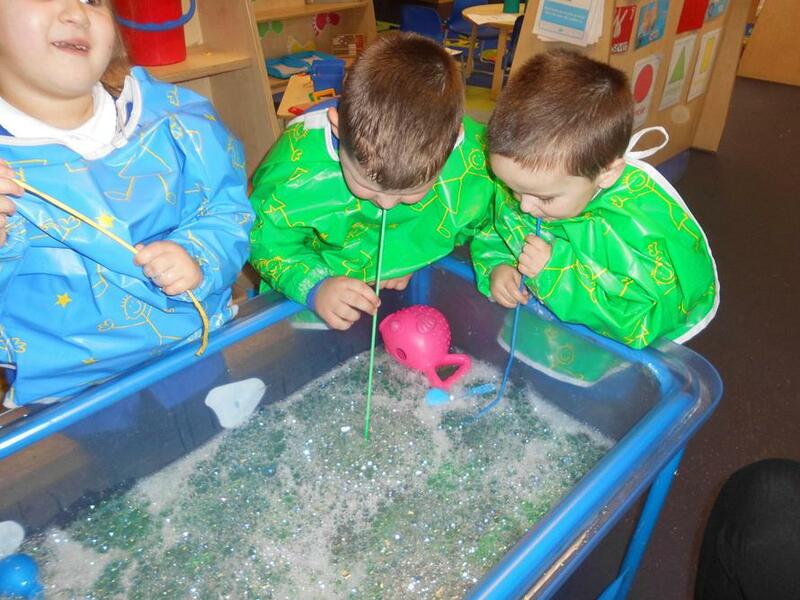 We tried lots of things like hitting the ice together, melting it in the water tray and holding it in our hands. 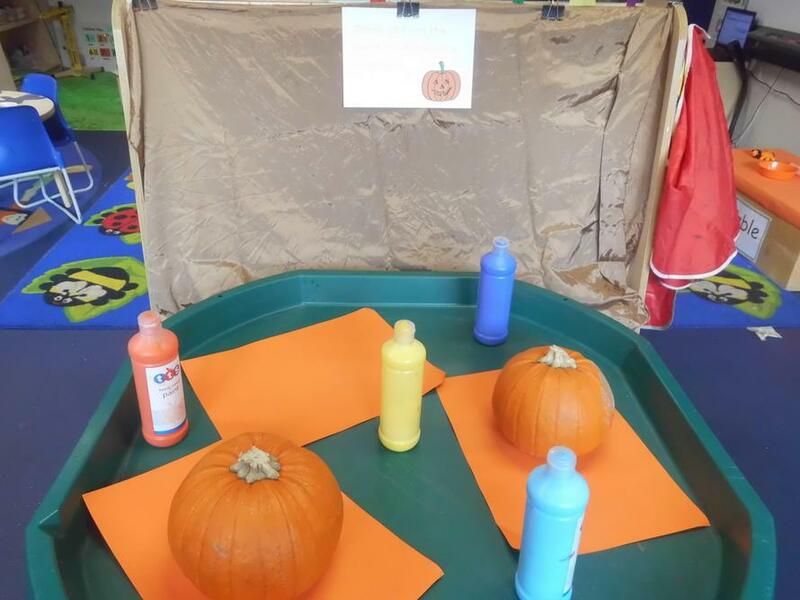 At the creative table made and used puffy paint to make pictures! 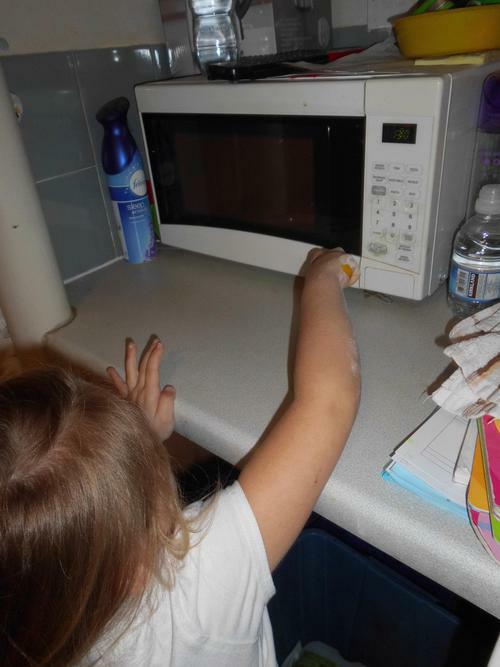 We had to cook to paint in the microwave and it made it go puffy. 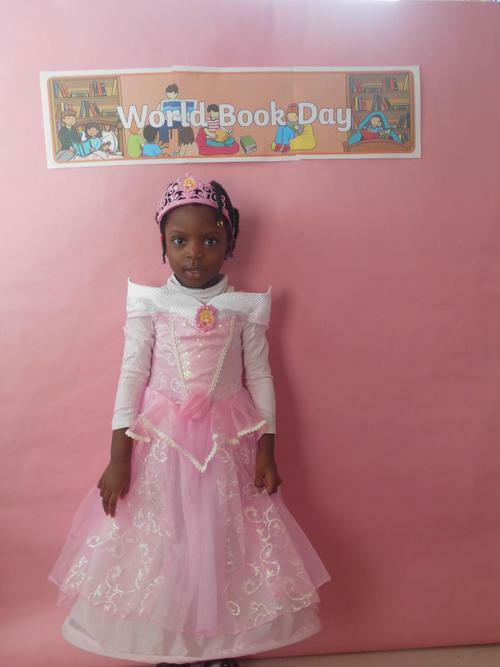 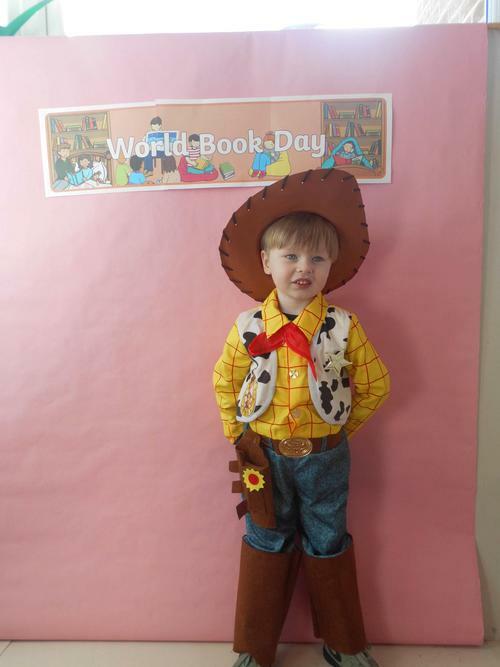 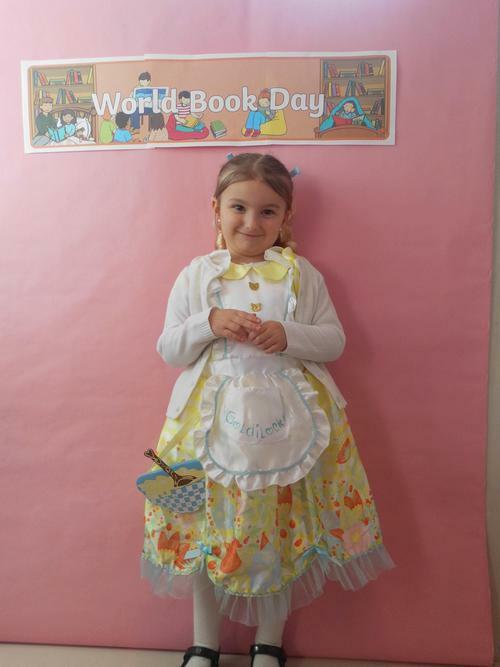 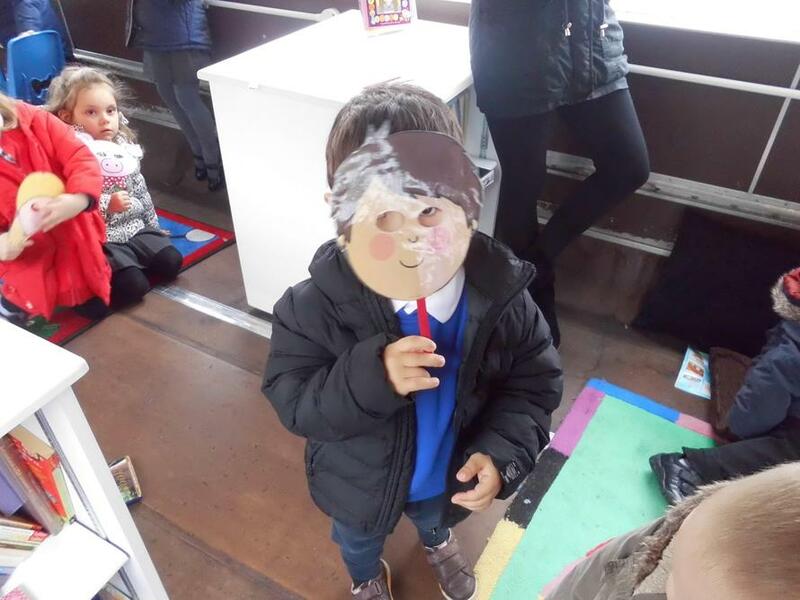 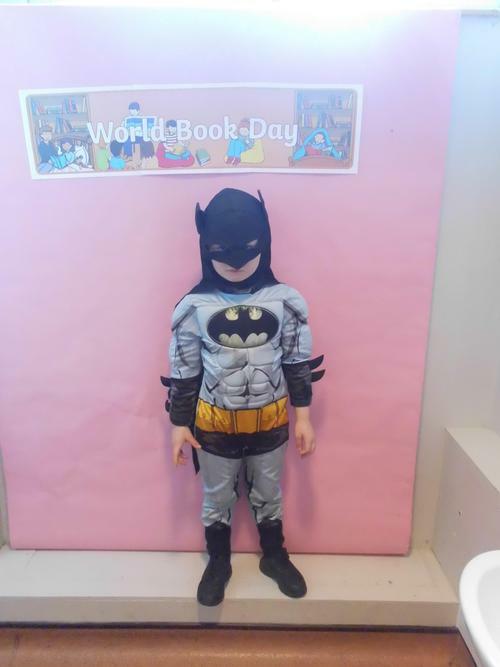 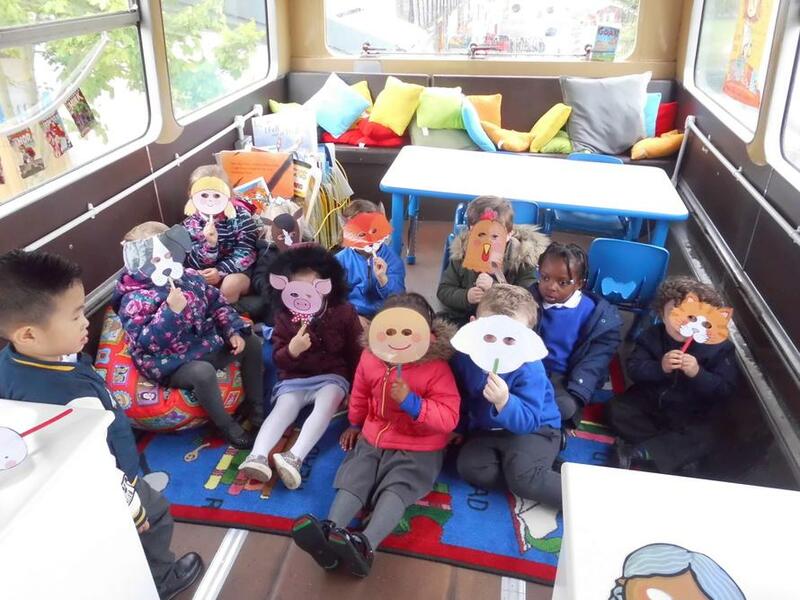 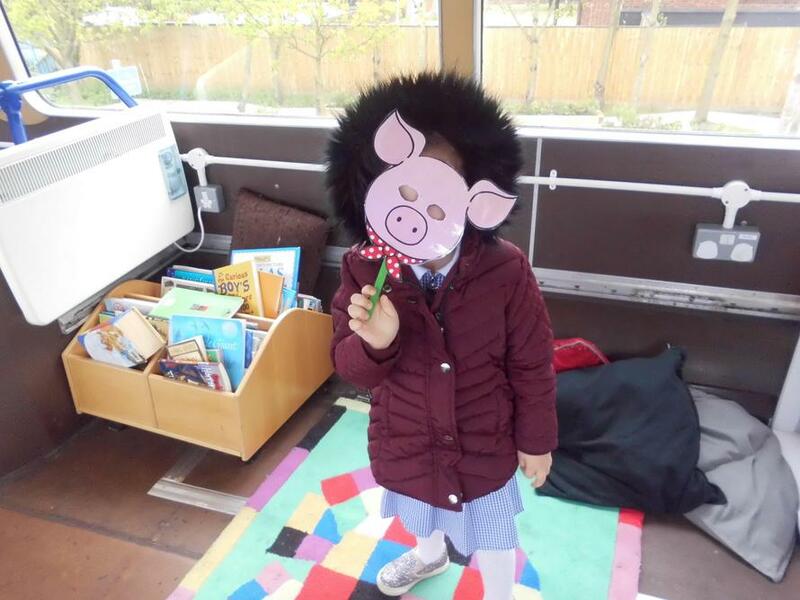 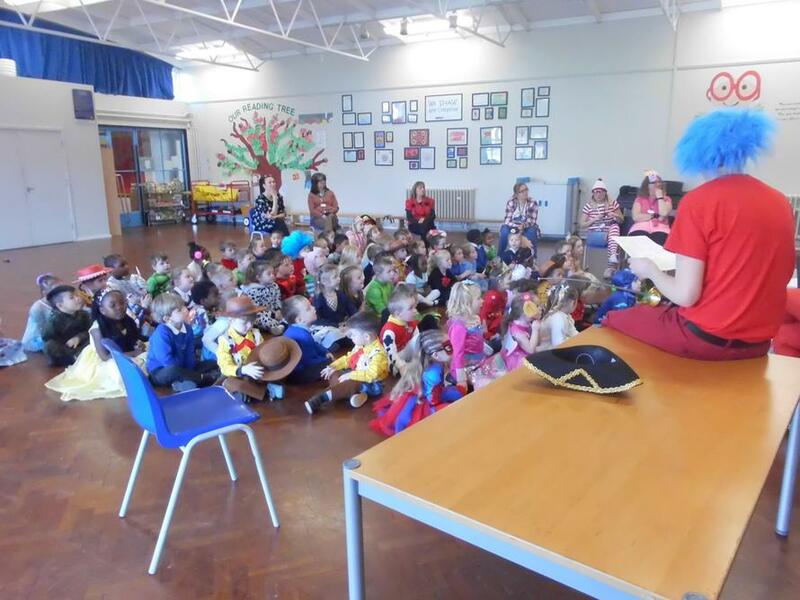 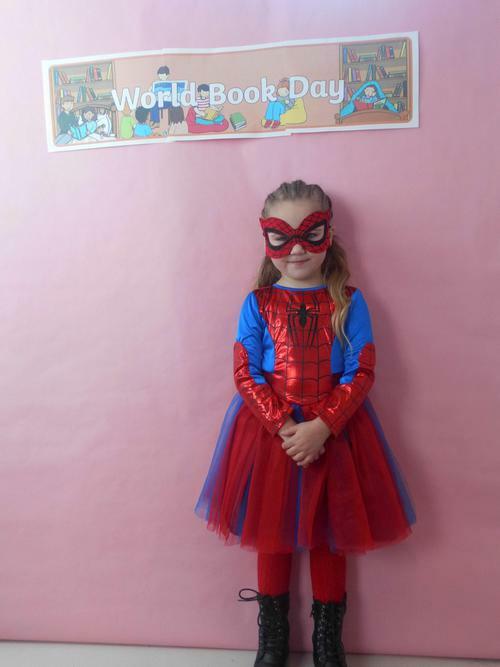 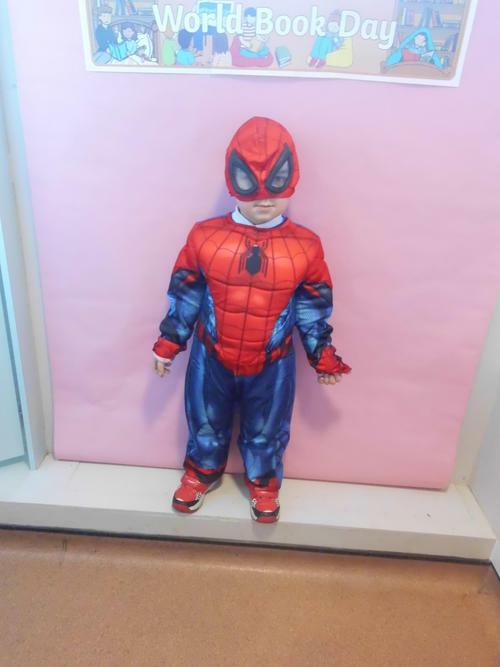 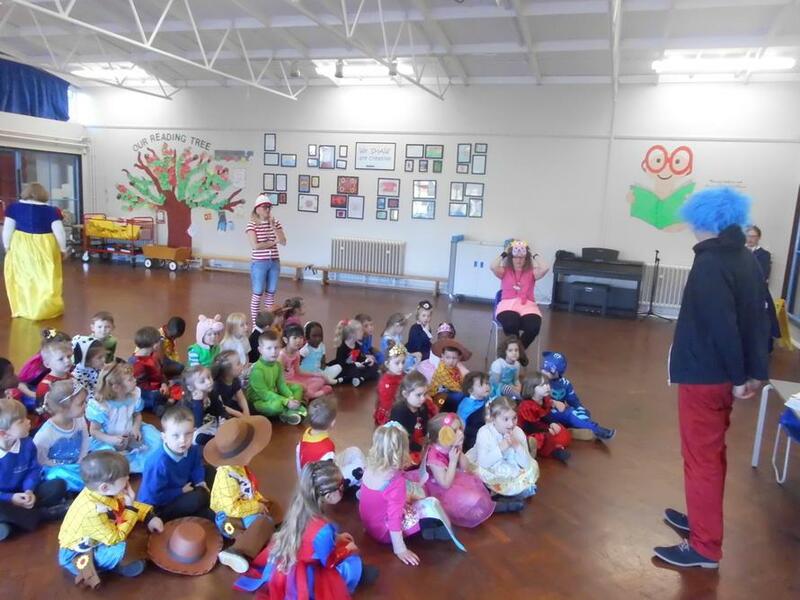 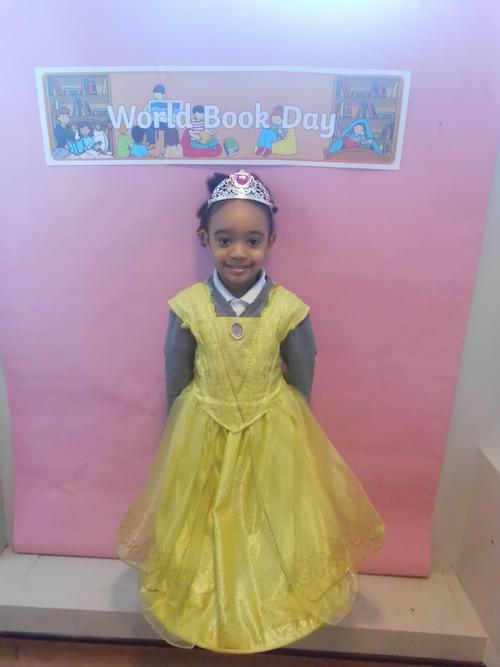 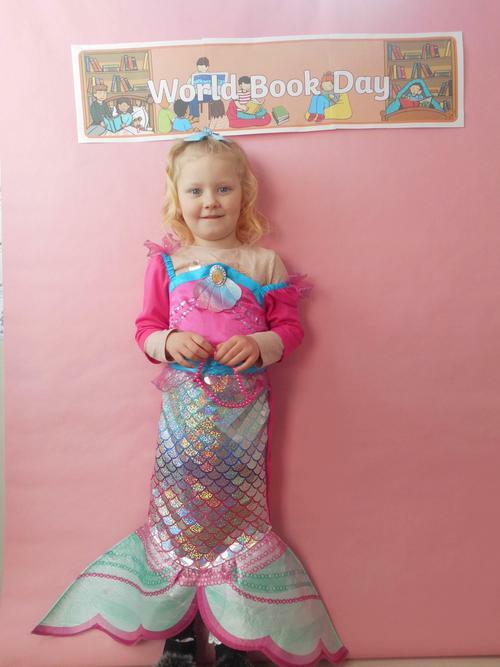 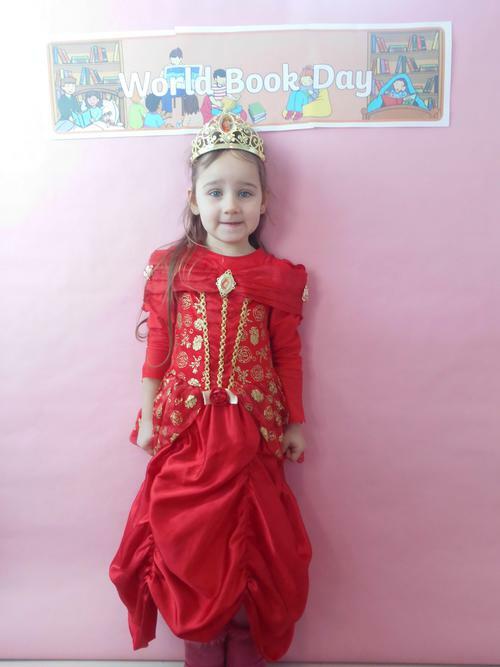 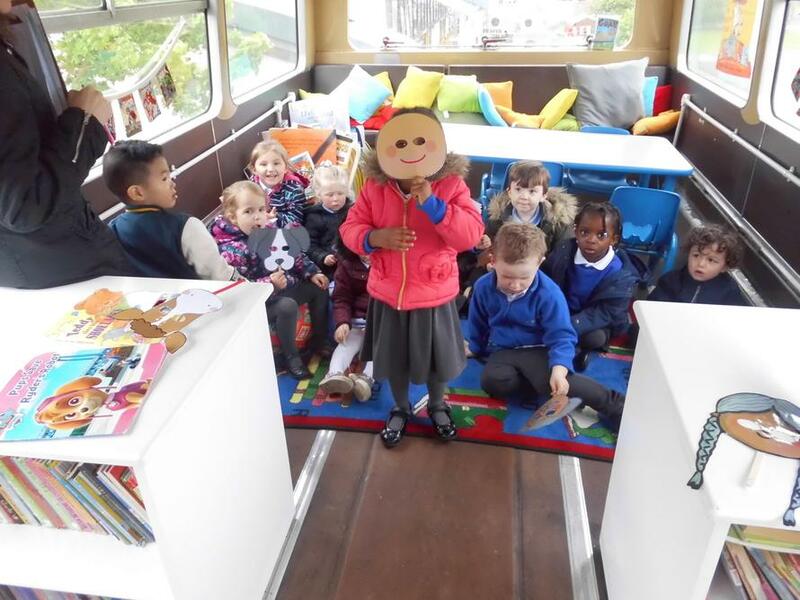 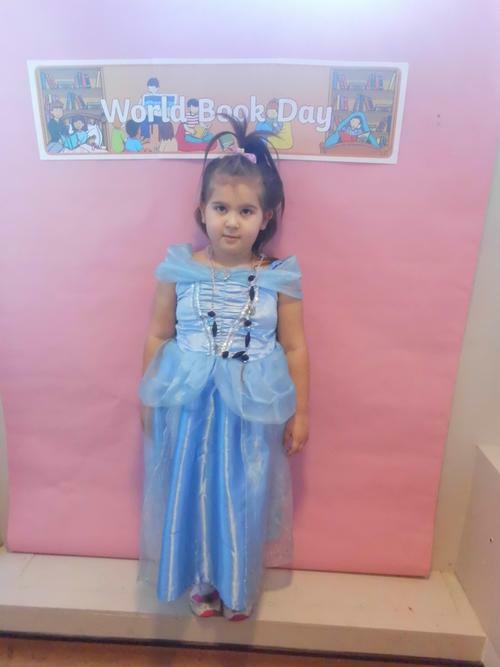 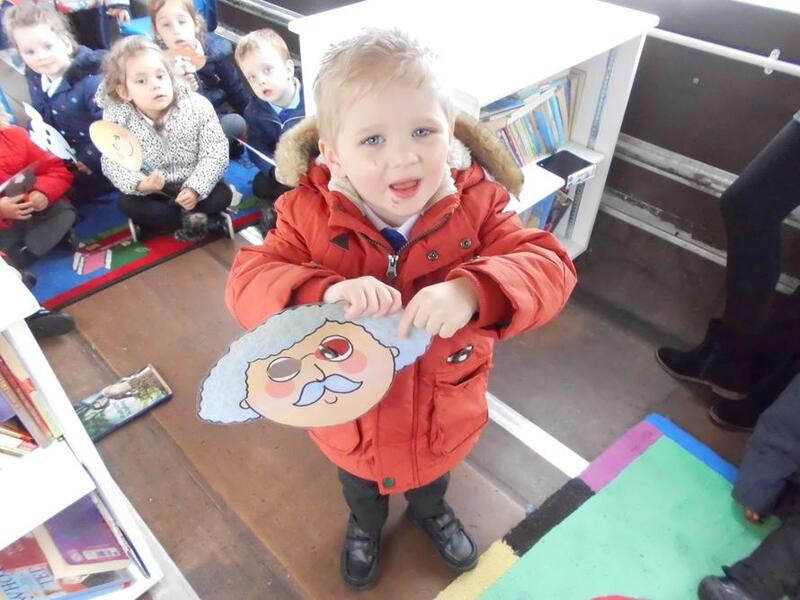 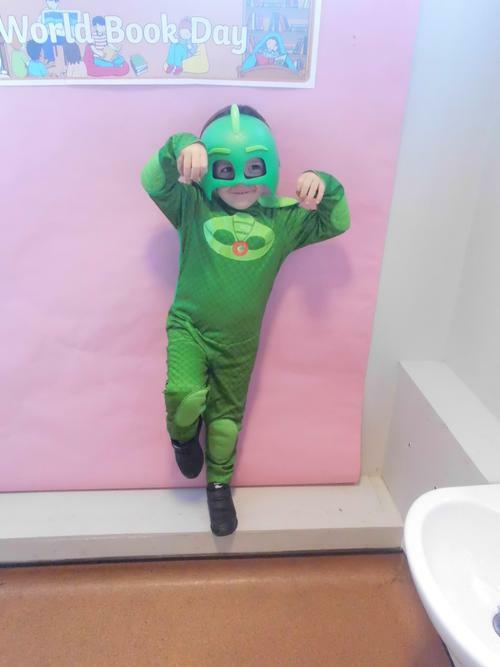 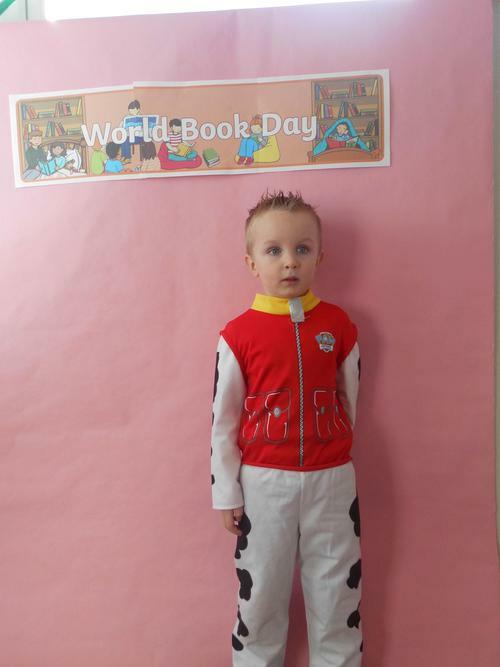 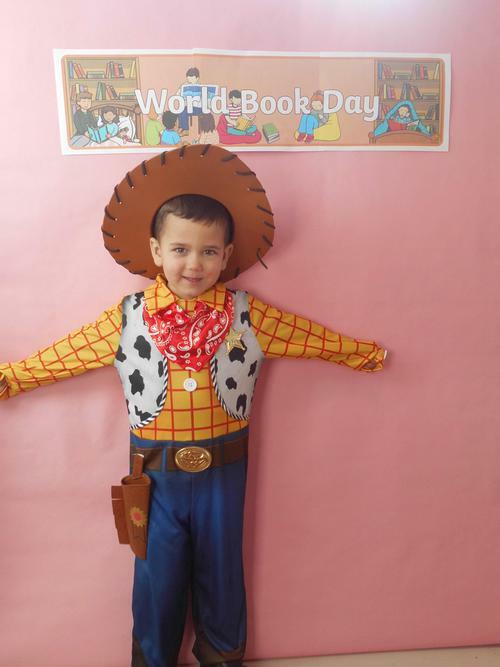 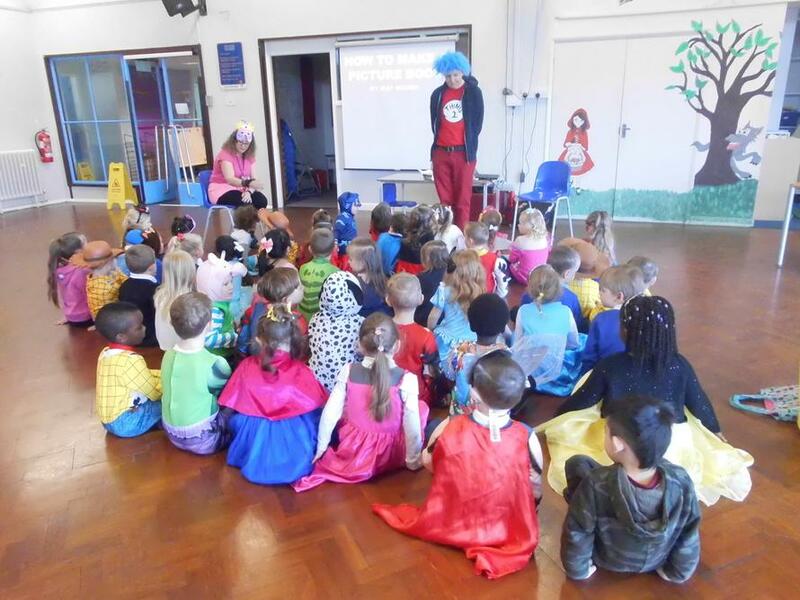 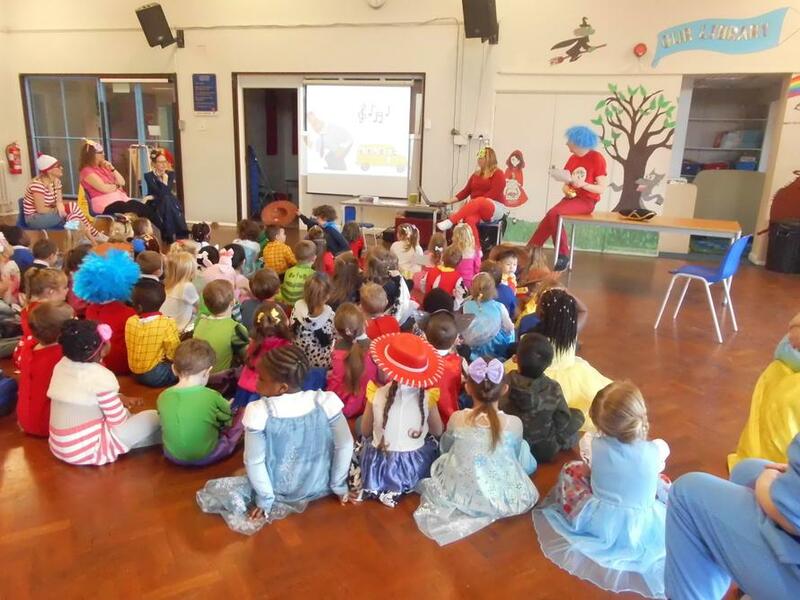 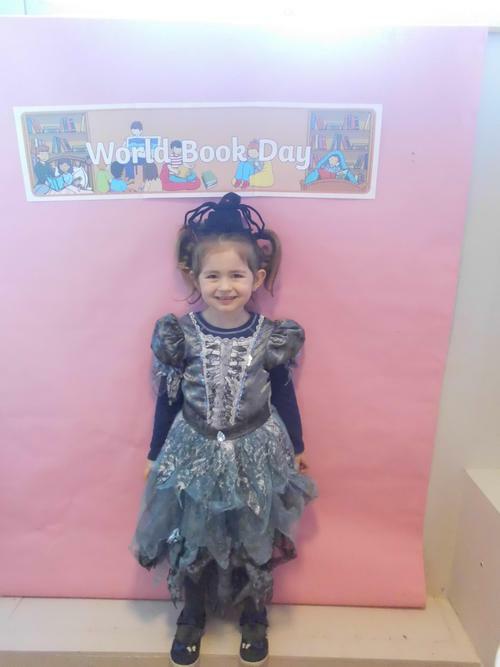 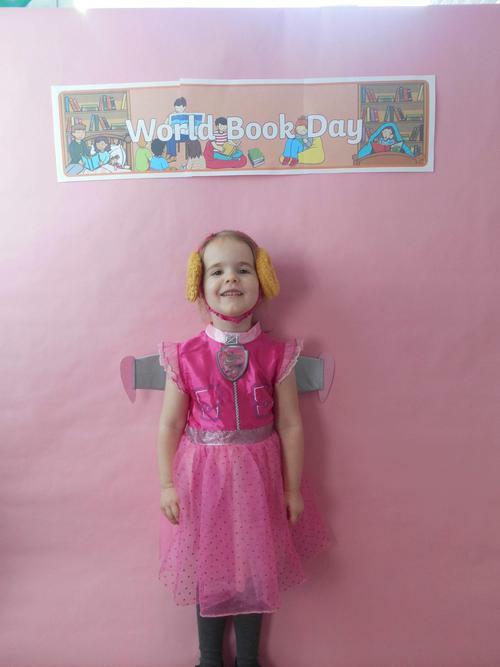 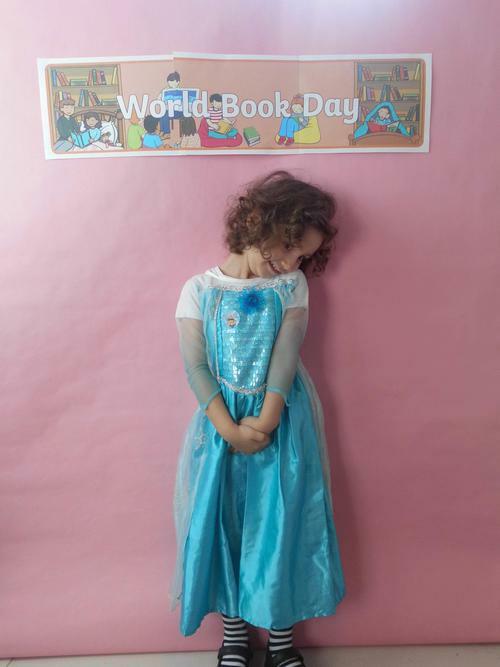 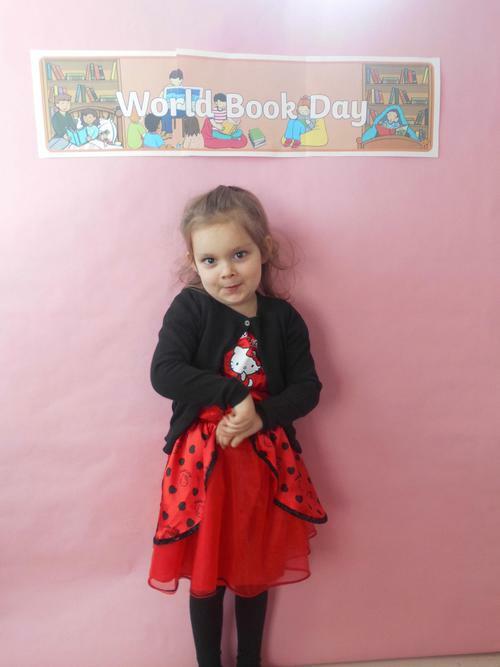 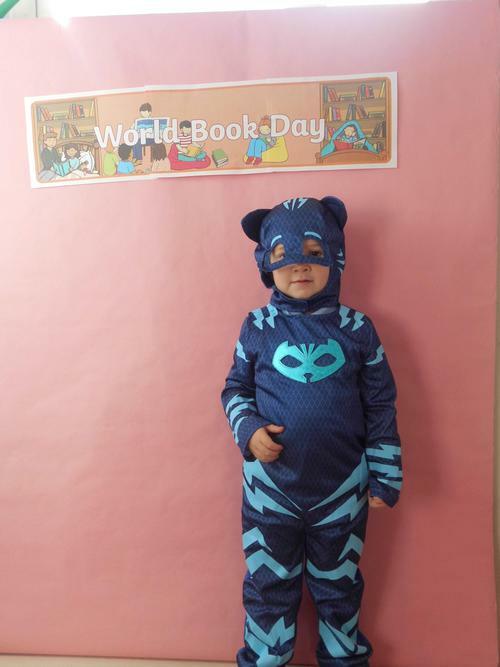 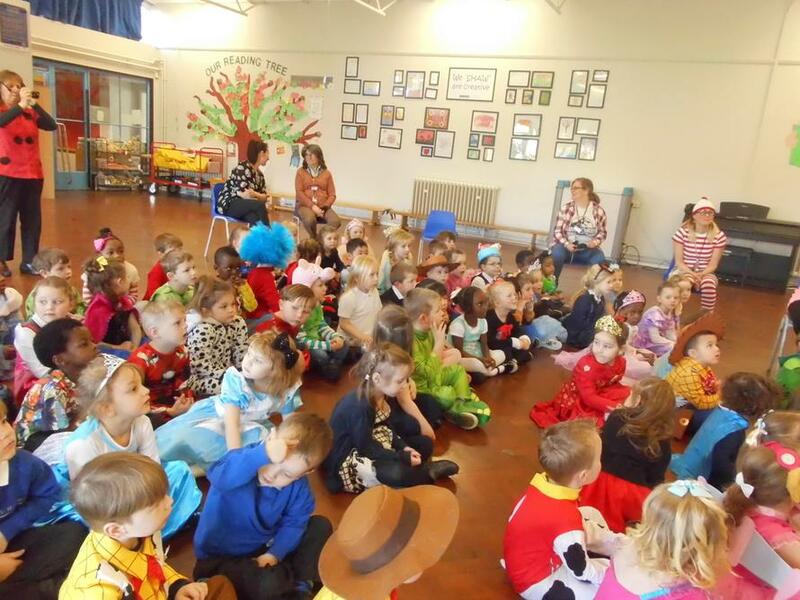 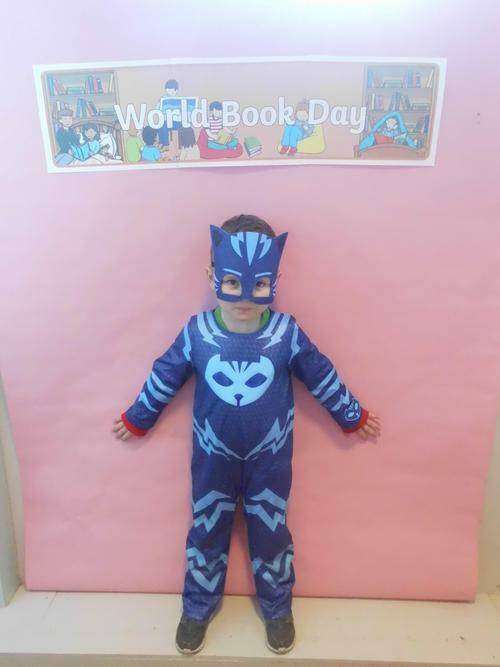 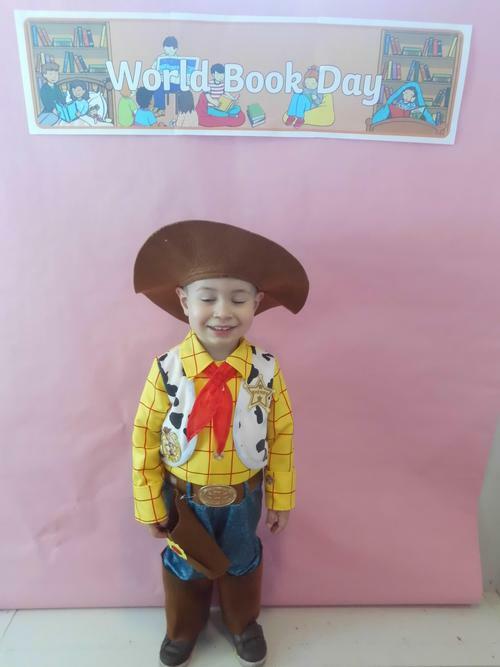 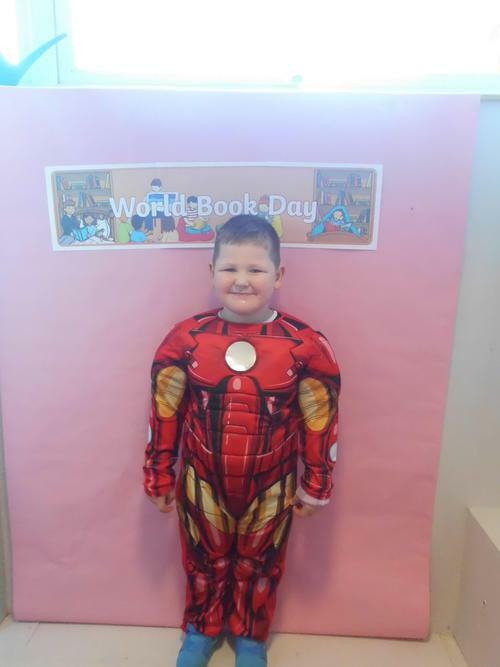 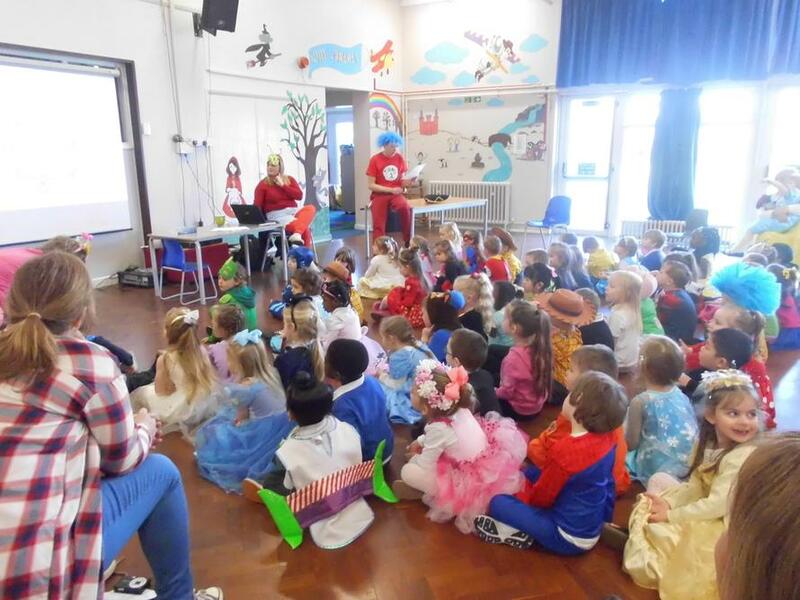 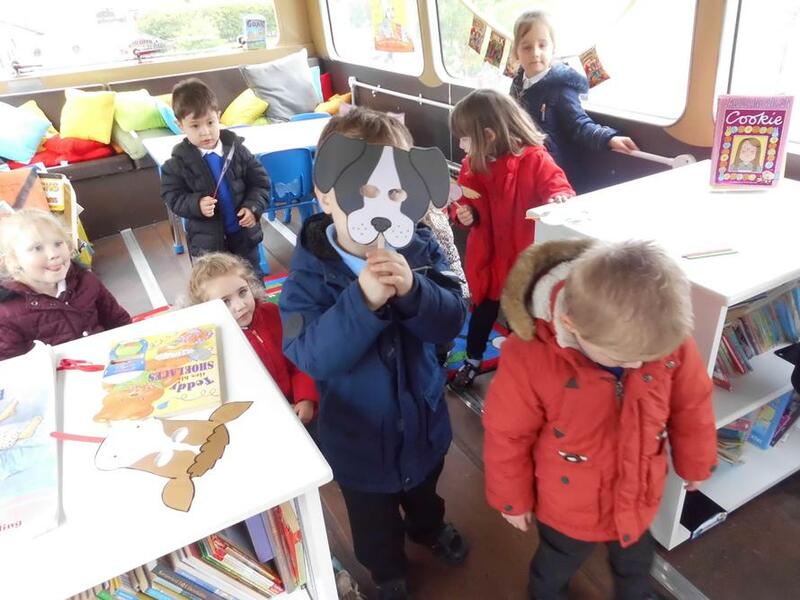 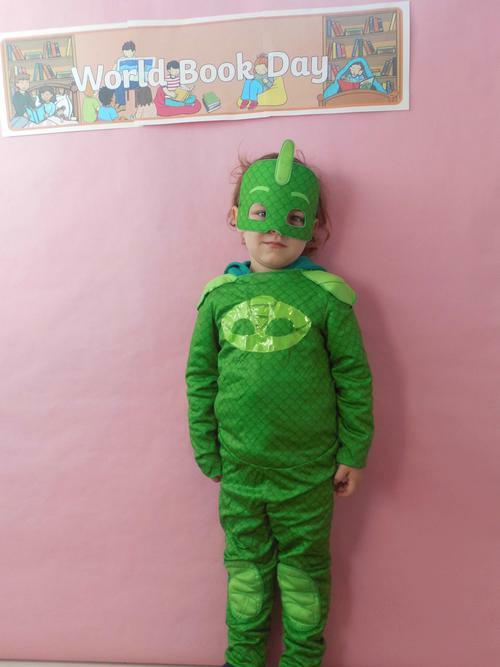 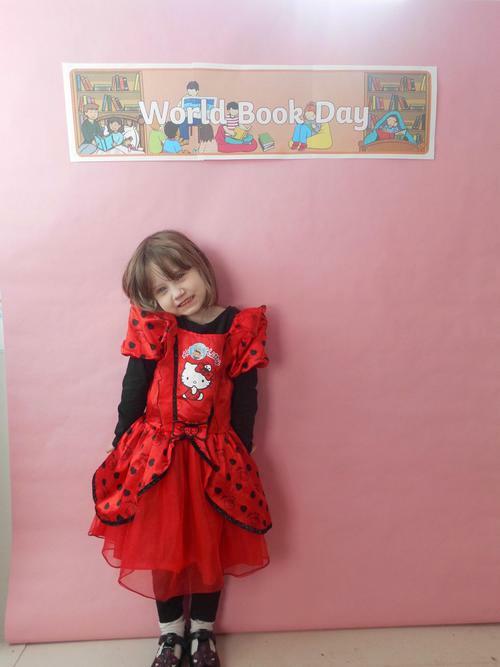 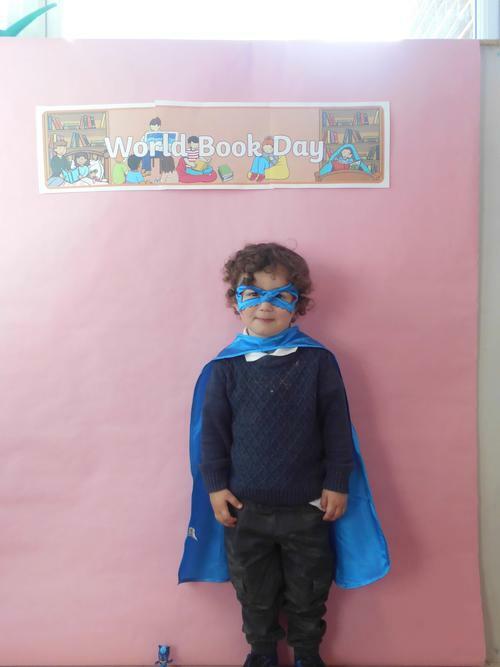 The annual World Book day celebrations were put on hold due to snow this year so on Friday 16th March the children in Nursery dressed up as their favourite book characters. 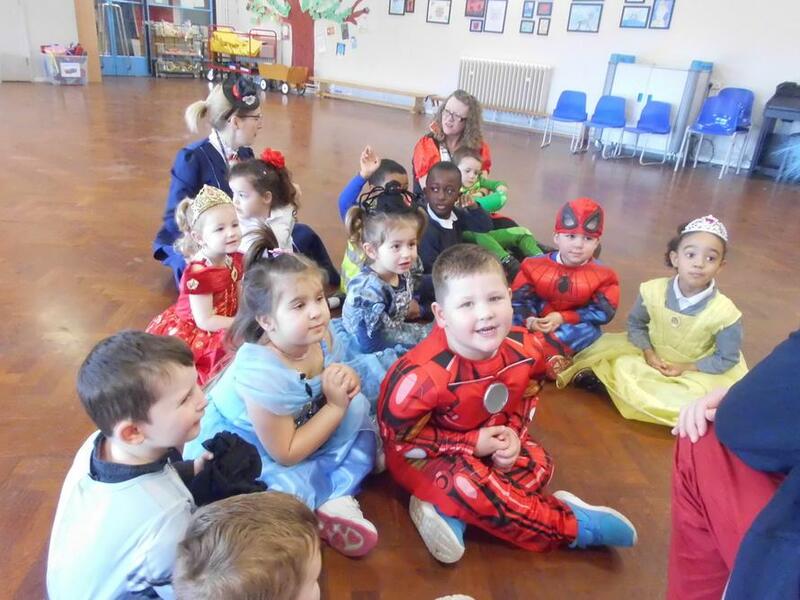 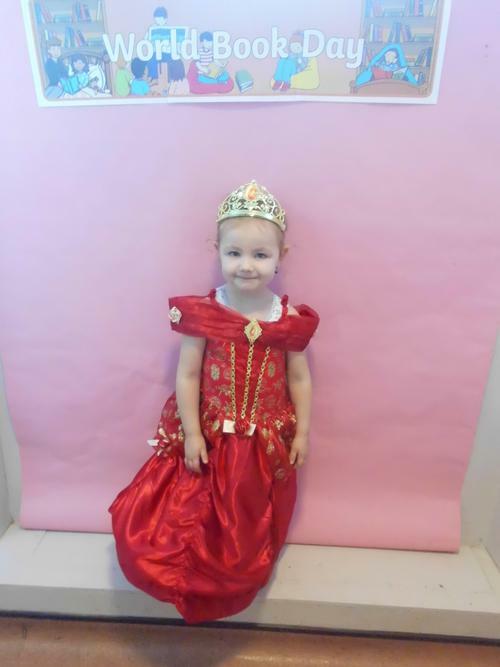 We had lots of princesses, superheroes and other story characters! 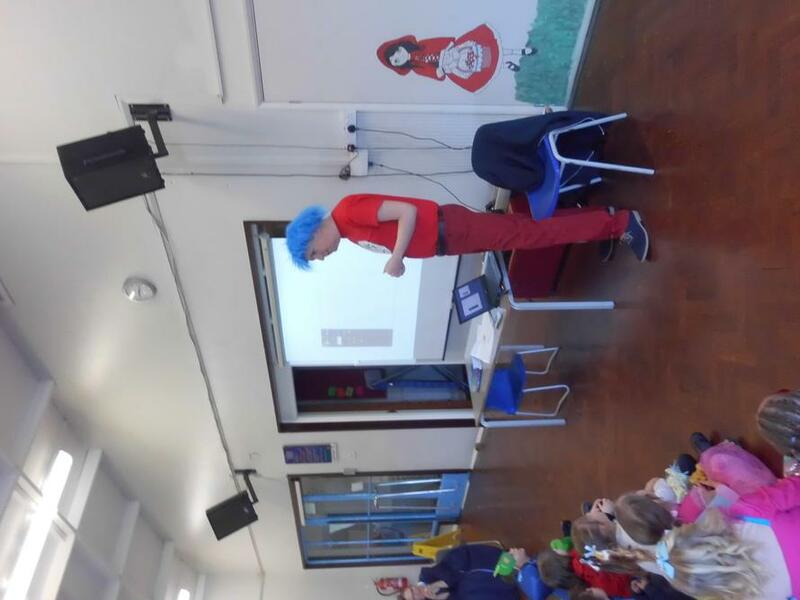 The children also had a visit from Mat Waugh, an author who writes children's books including the 'Cheeky Charlie' series. 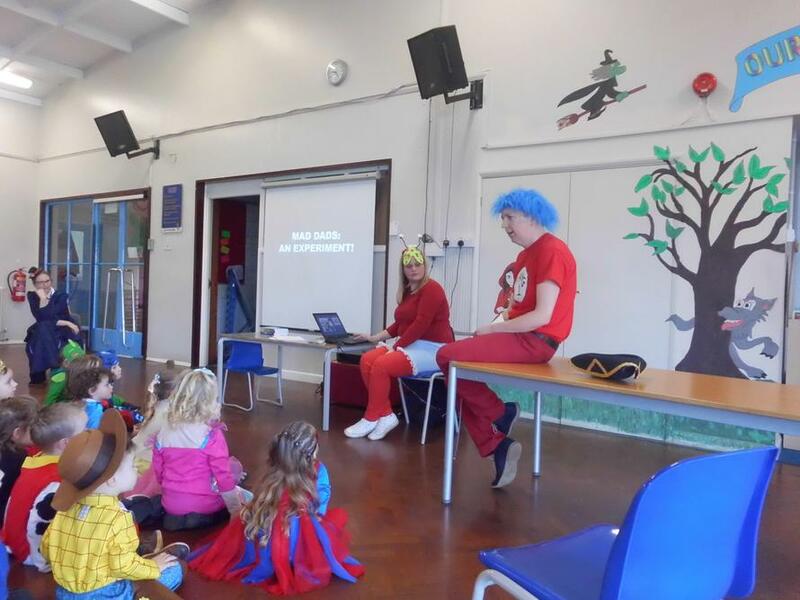 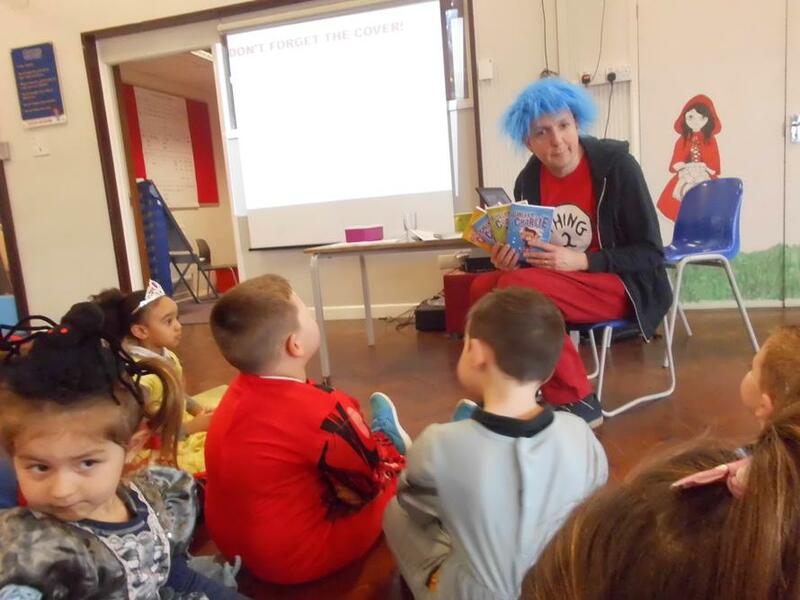 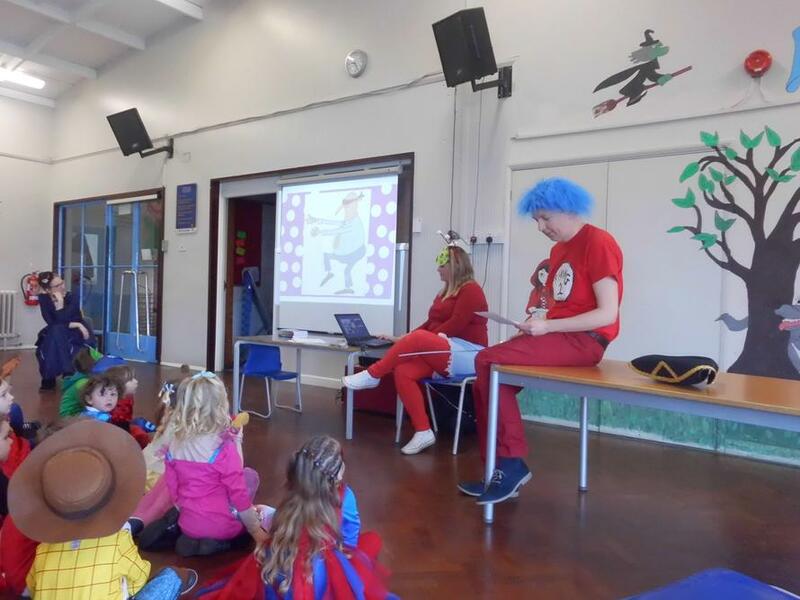 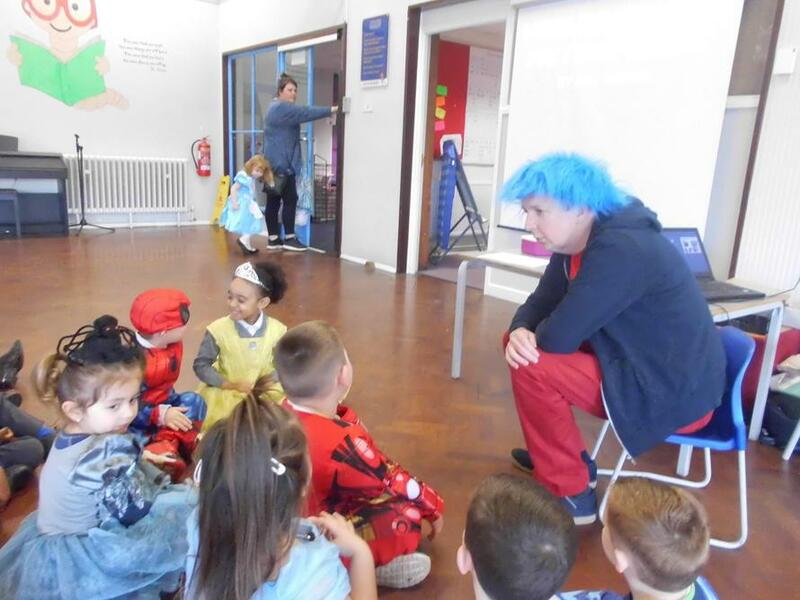 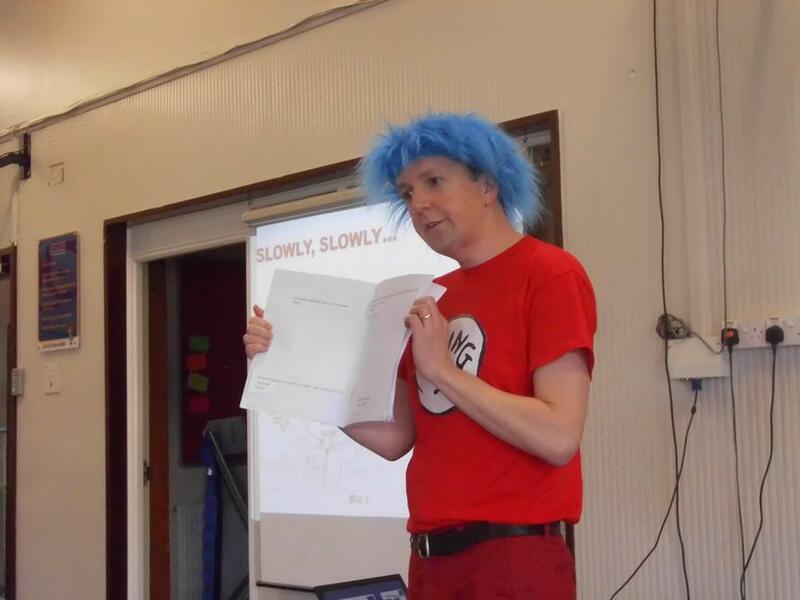 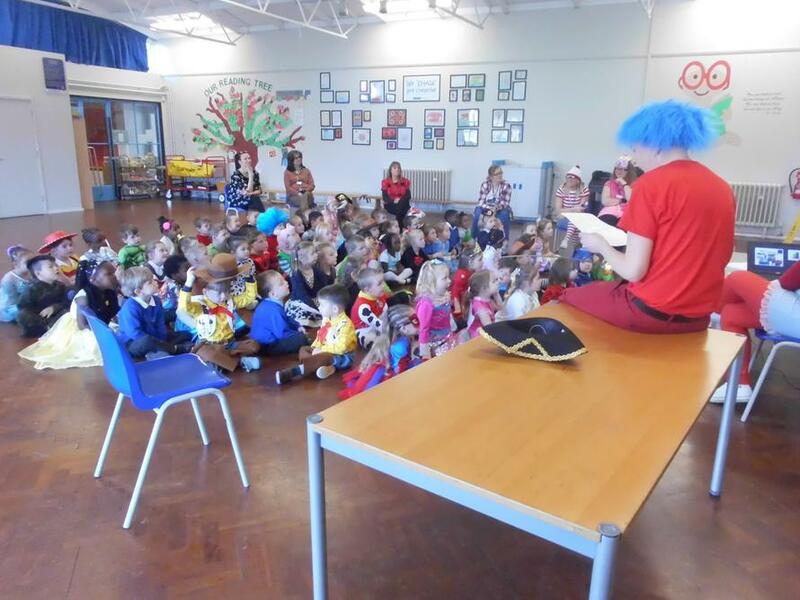 Mat talked to the children about his stories and how he made a story book, showed the children pictures from his books and even came to speak to the children dressed up in fancy dress! 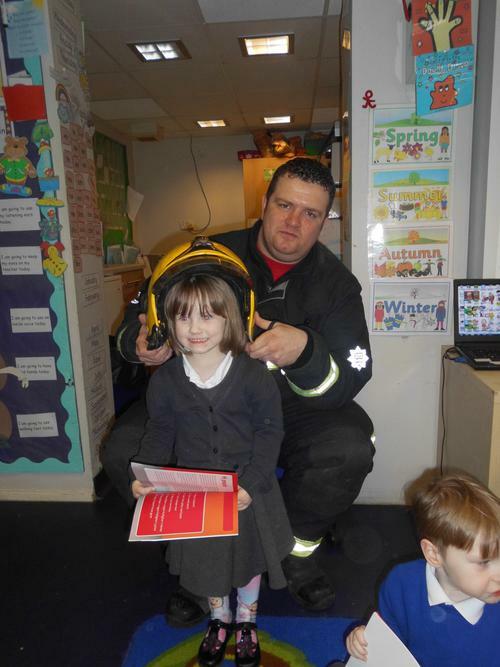 the children learnt a lot and really enjoyed the day. 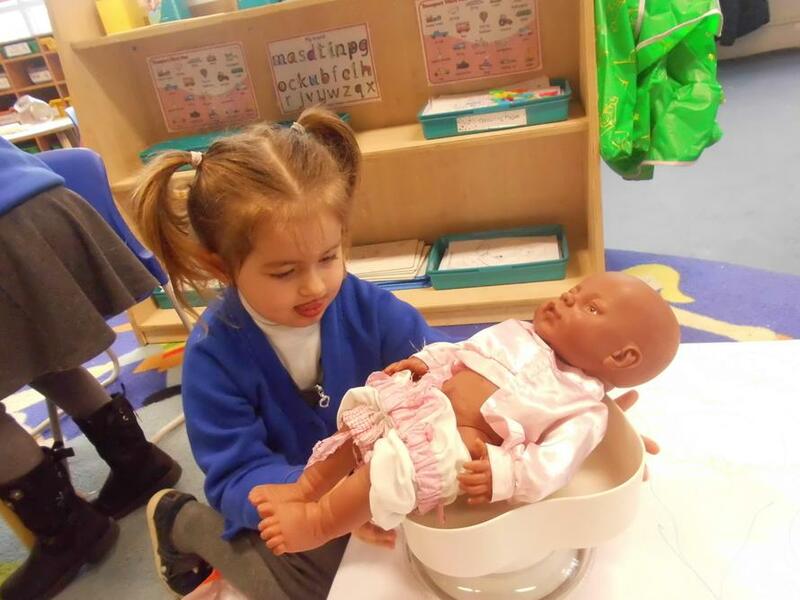 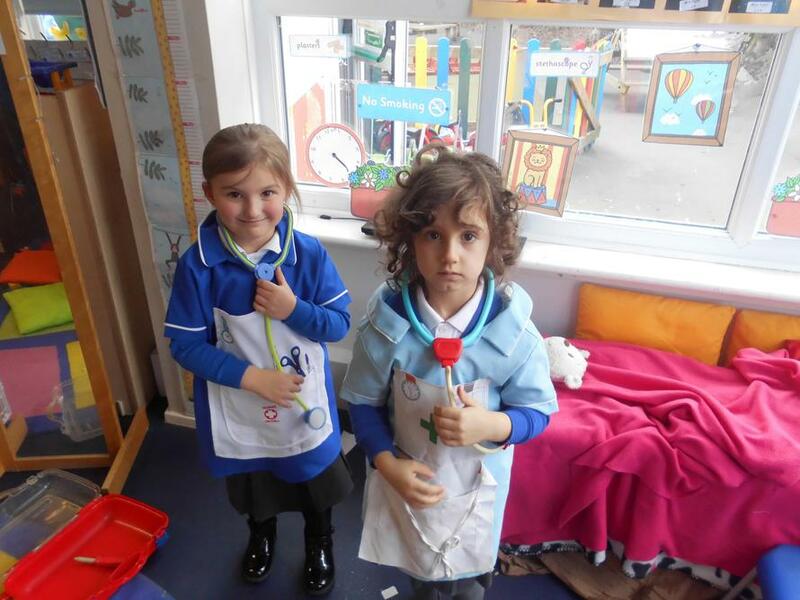 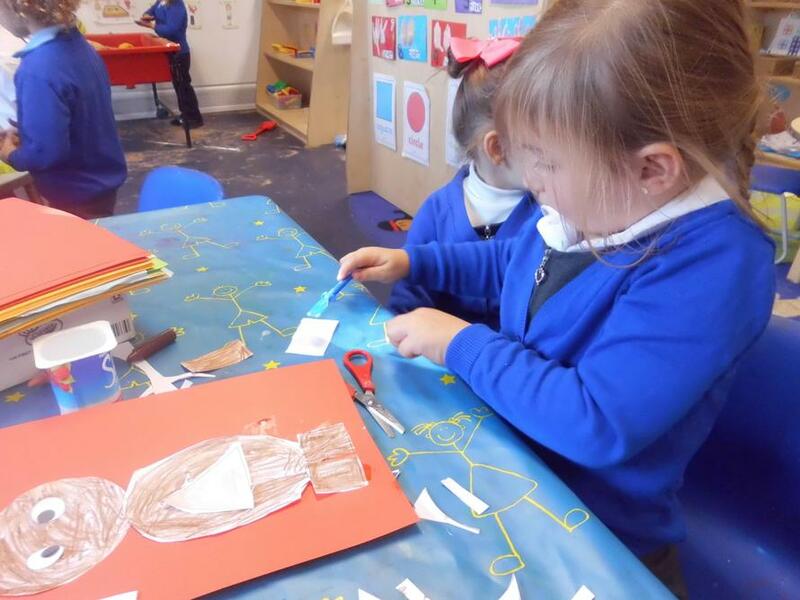 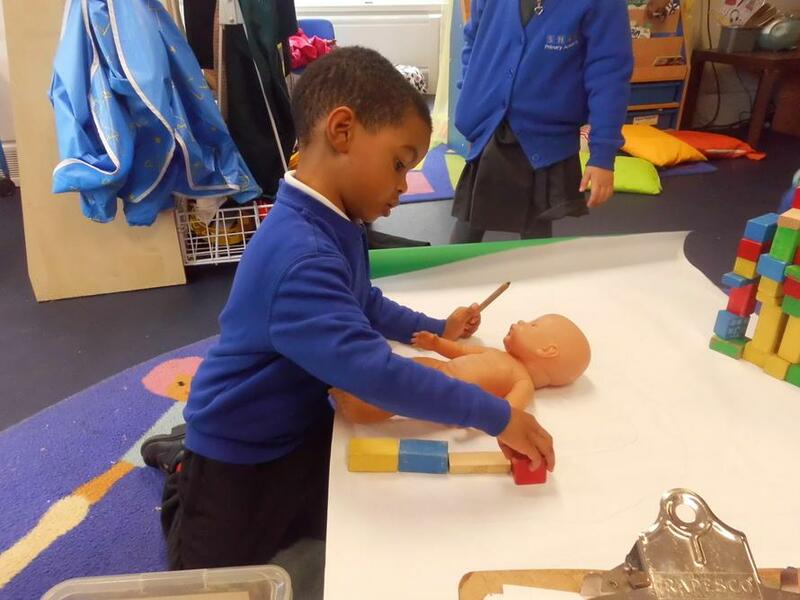 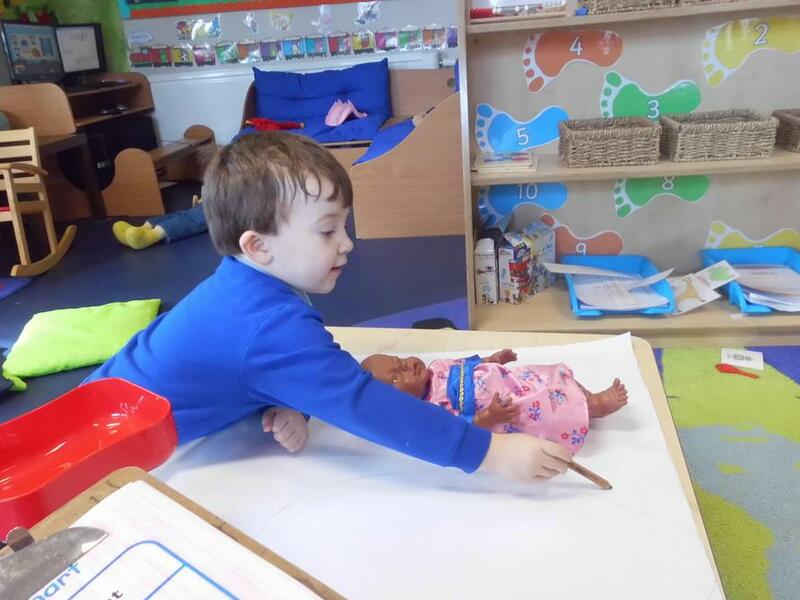 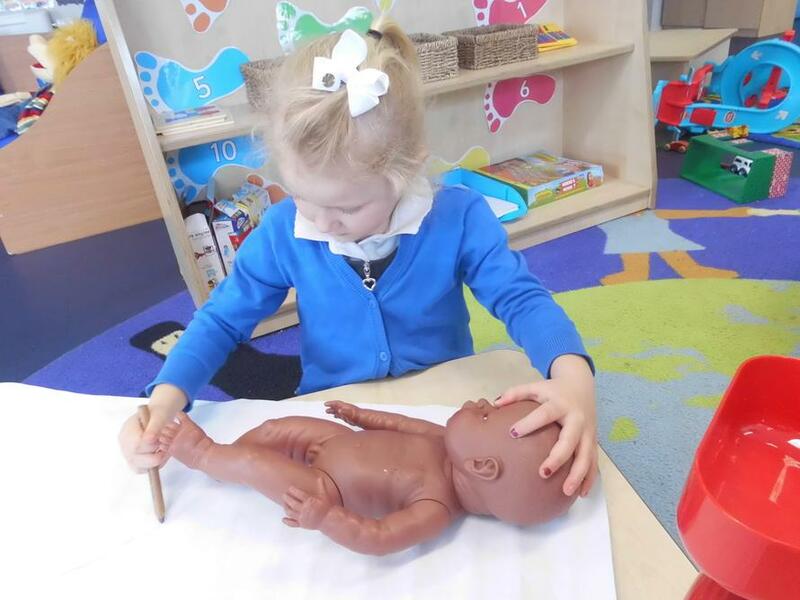 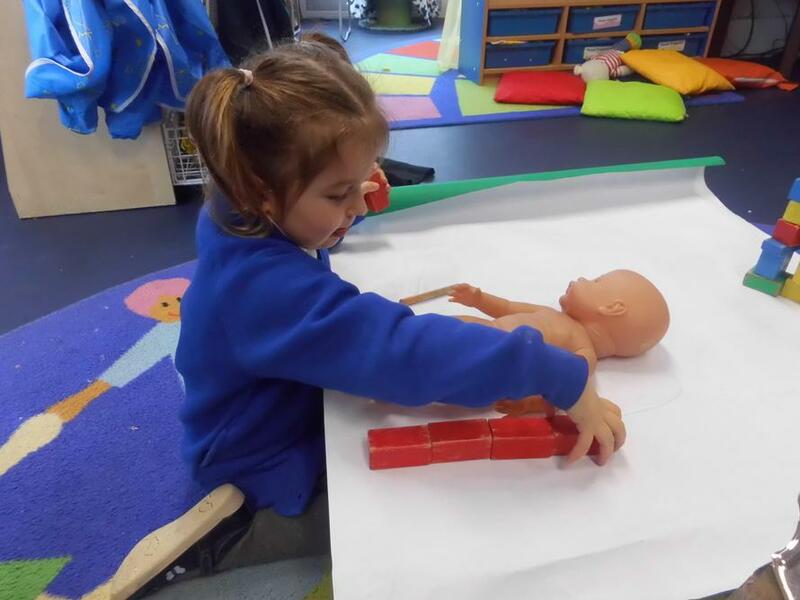 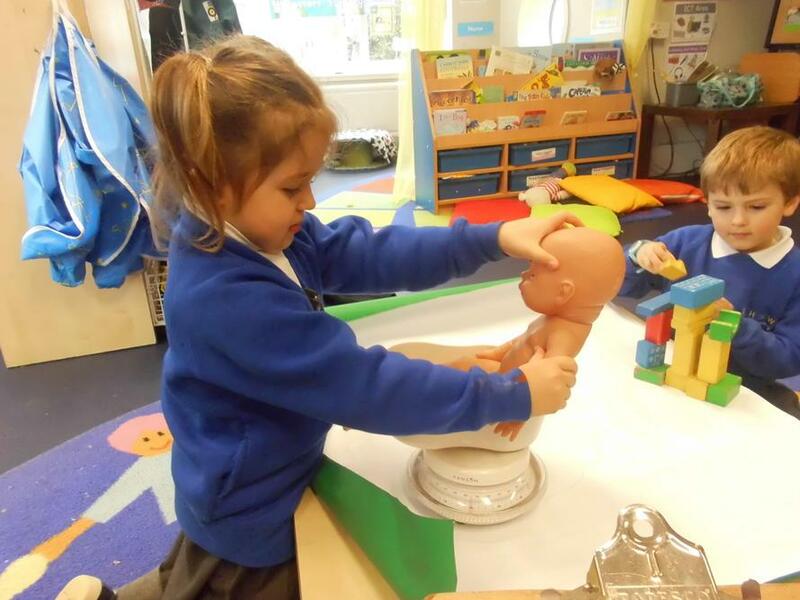 The children in Nursery have been learning this week about Doctors and Nurses. 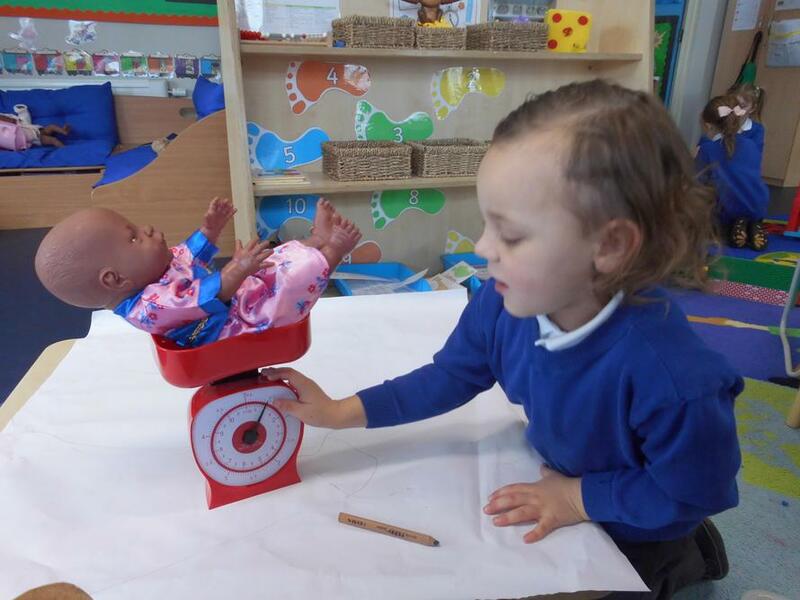 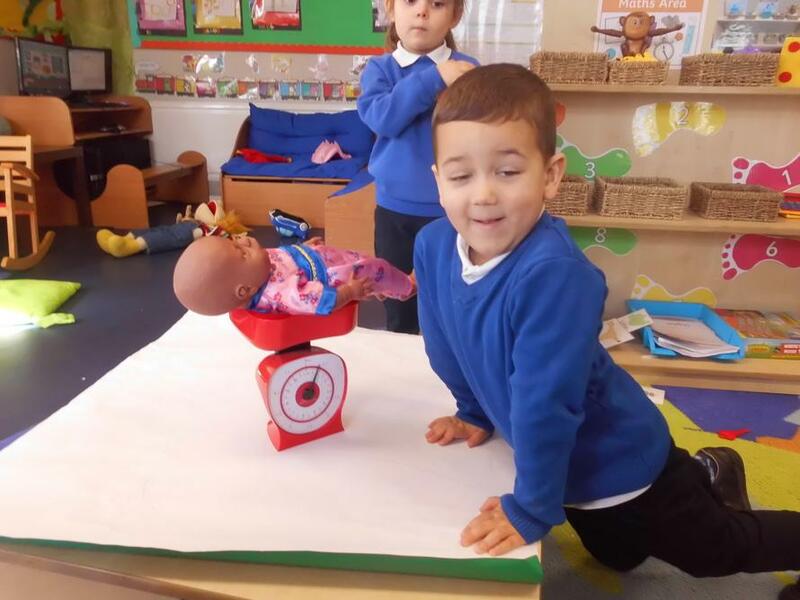 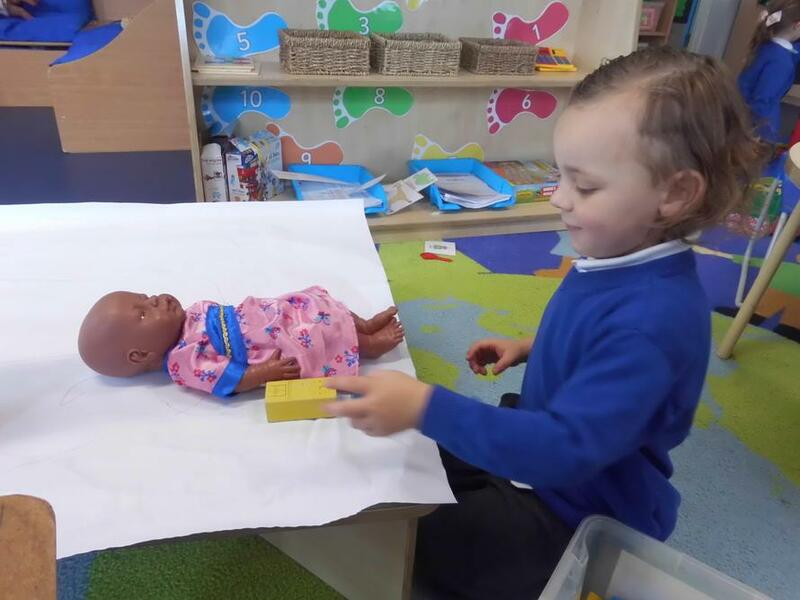 We began the week by learning the song 'Miss Polly had a dolly' and then we talked about the equipment that doctors have in their doctors bags. 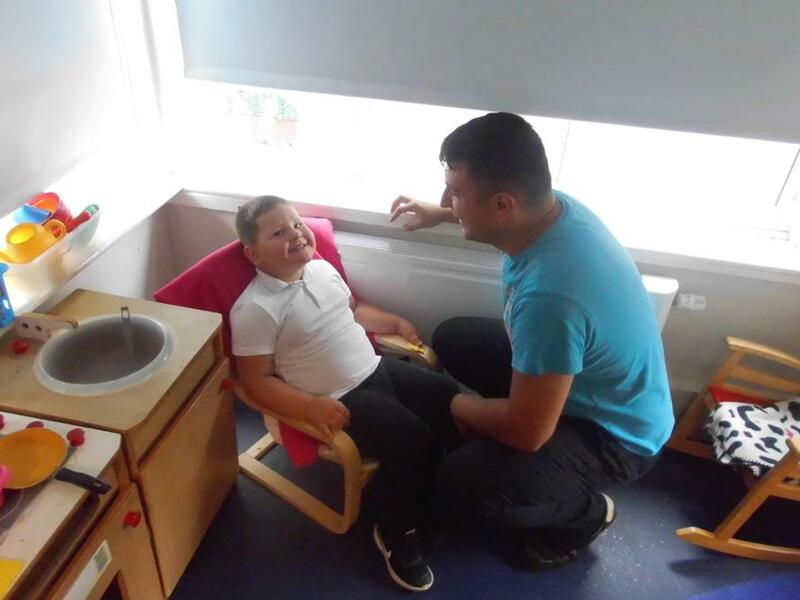 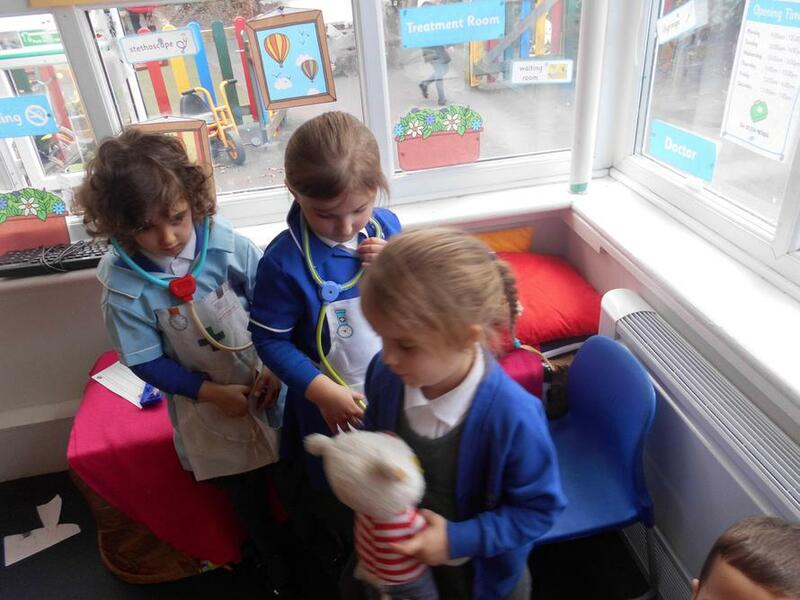 the children were very good at talking about their experiences of going to the doctors and had seen some of the equipment before! 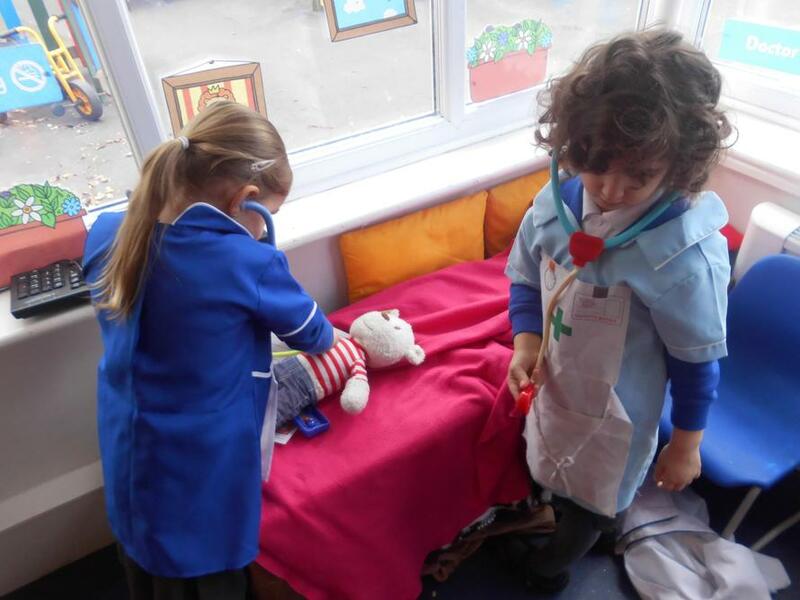 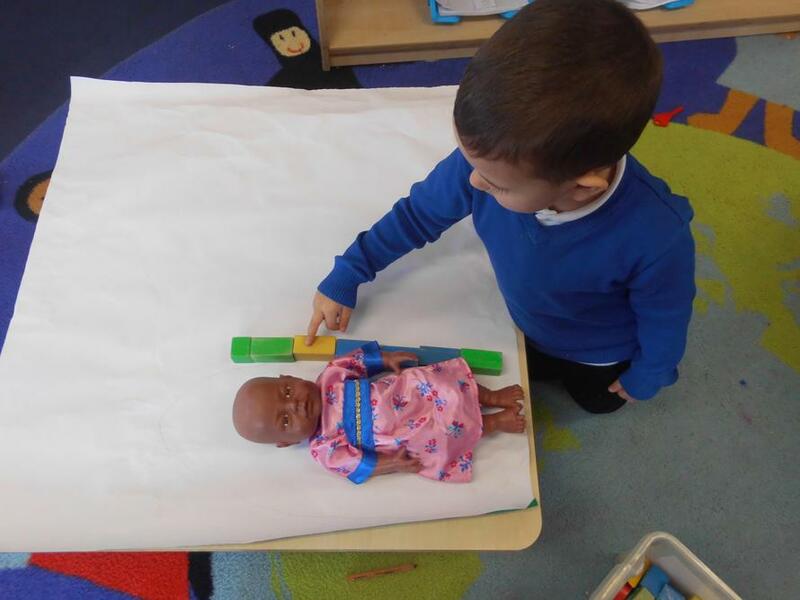 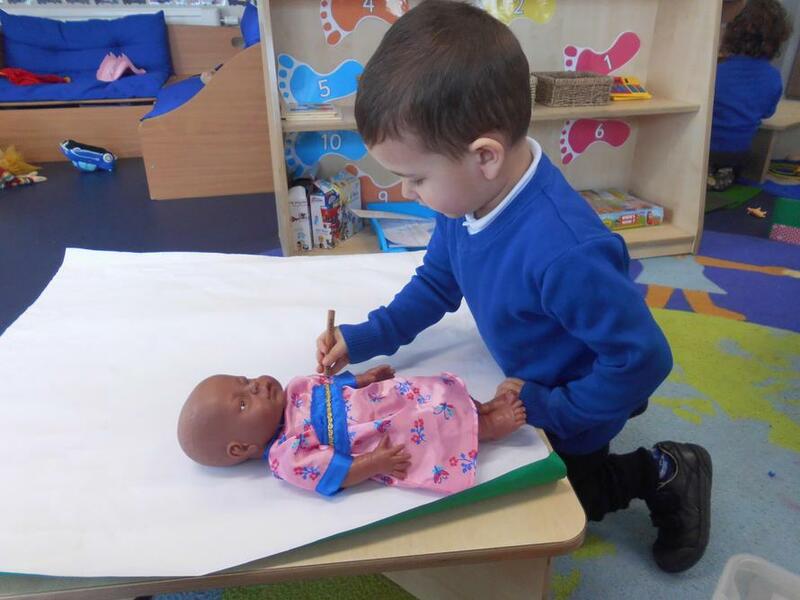 We created a role play hospital in Nursery for the children to care for the doll and teddies who were poorly in Nursery. 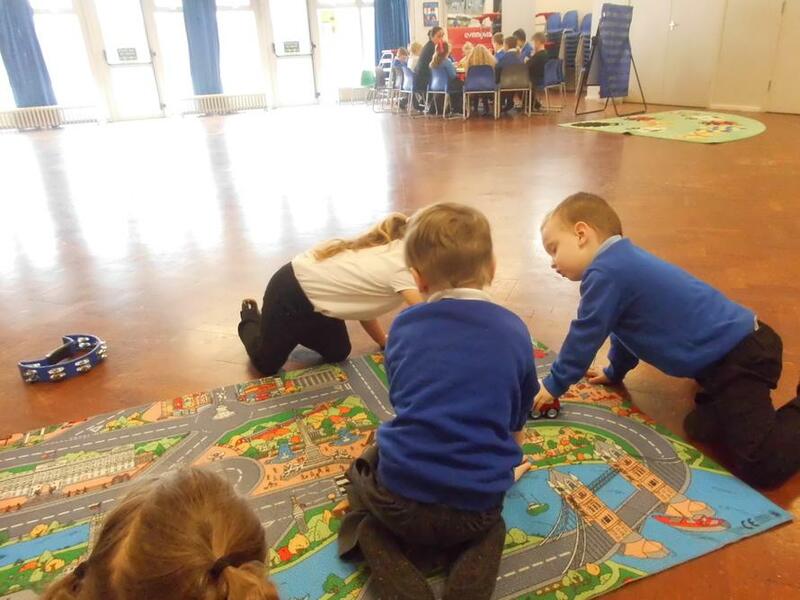 The children enjoyed playing a games called 'Ambulance, stop!' 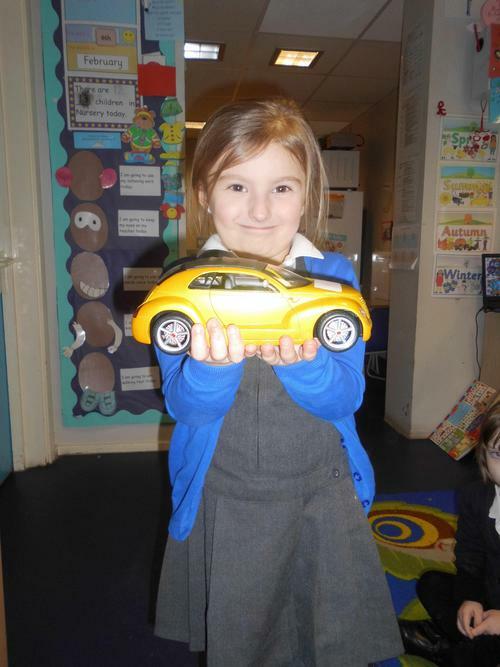 with the cars and small world car mat inside and with the bikes outside. 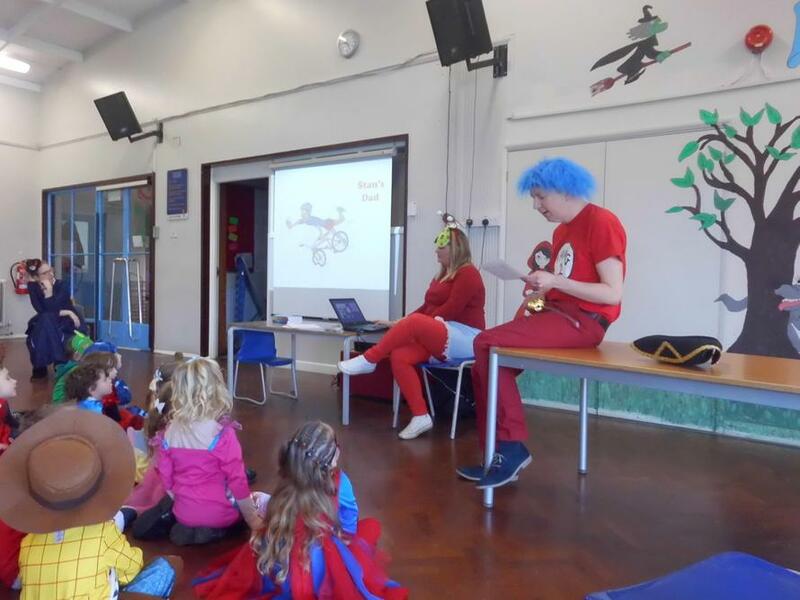 he children could move their toy car around or ride their bike and as soon as they heard the tambourine jiggling (the ambulance siren!) 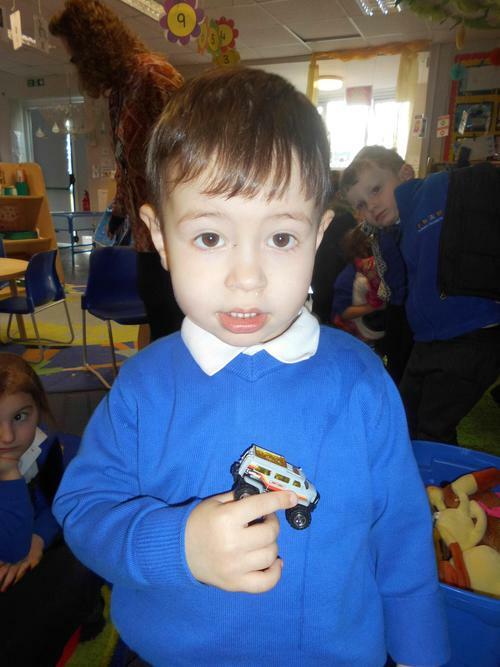 they had to stop for the ambulance! 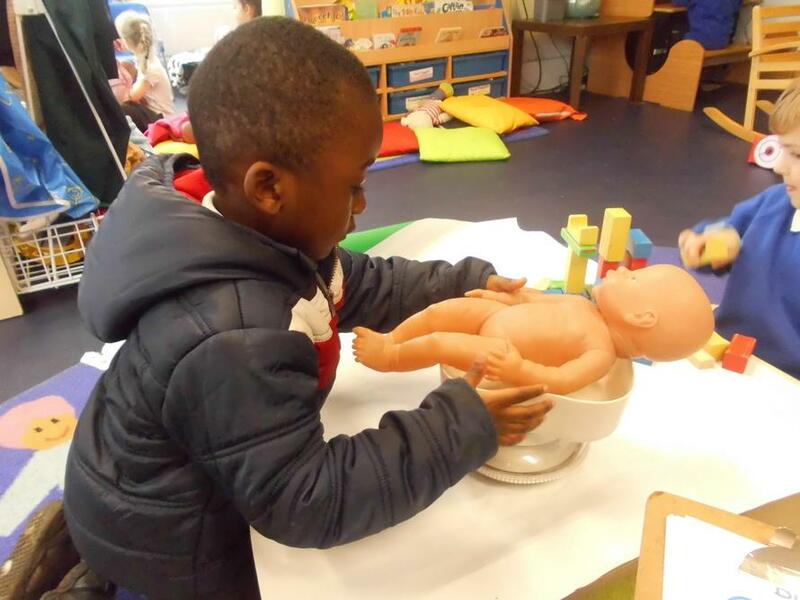 Later in the week the children saw photos and we talked about baby clinic's. 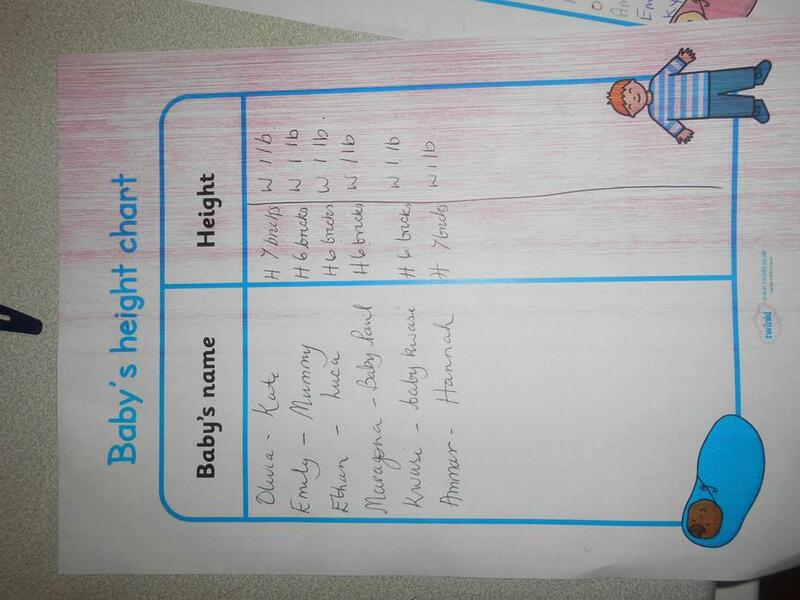 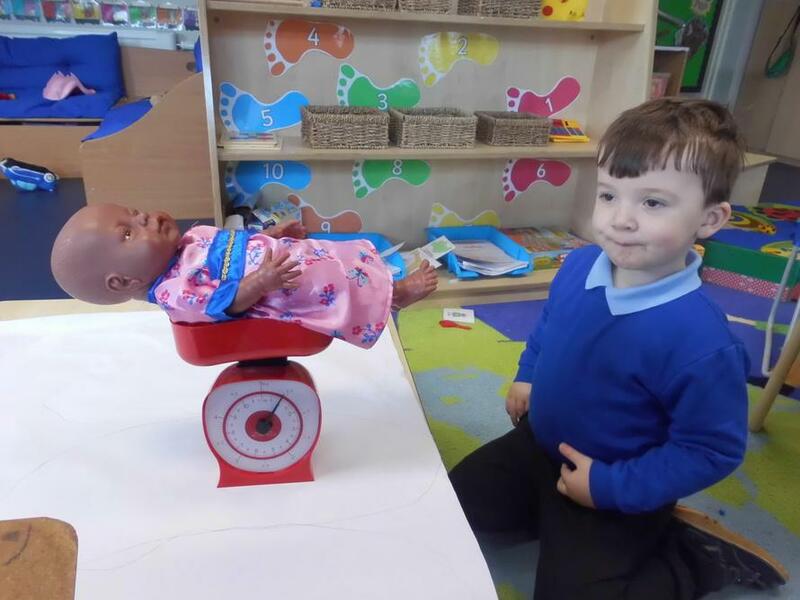 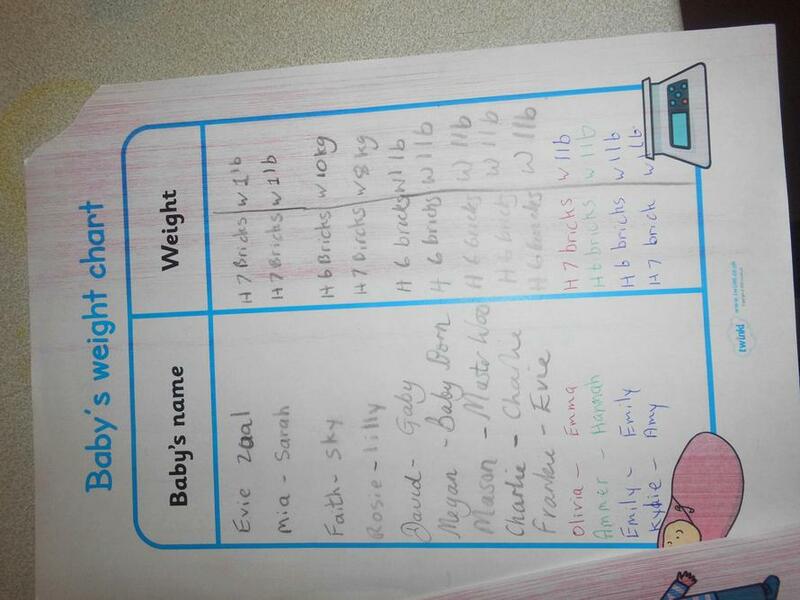 The children enjoyed weighing the babies and teddies and using the bricks to measure them! 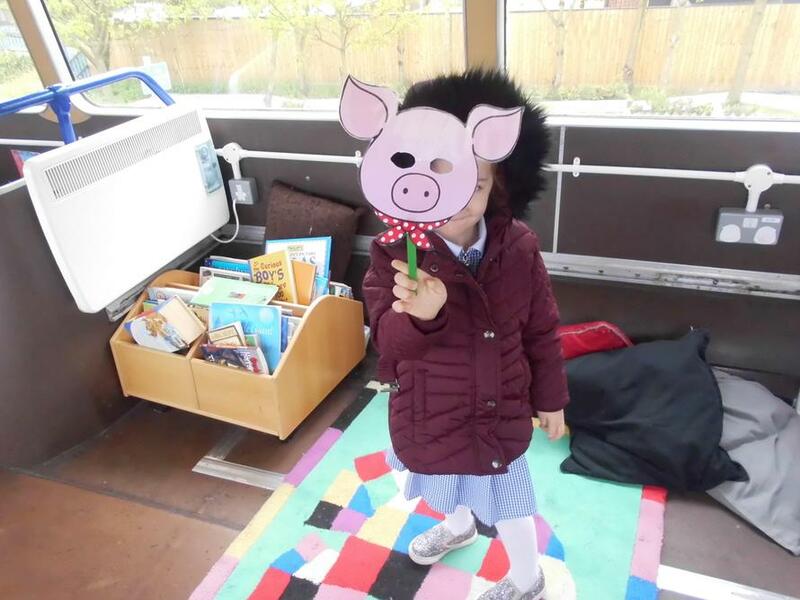 This half term our topic is all about 'Traditional Tales', including Goldilocks & the three bears, the three little pigs, the three billy goats gruff and also some tales from other countries e.g. 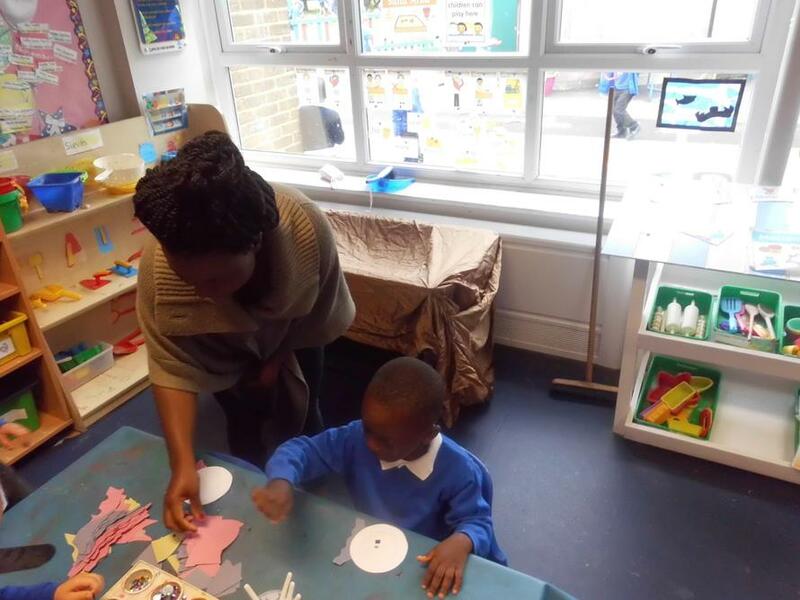 Anansi the spider stories and also African tales like 'how the zebra got his stripes', like those seen on 'Tinga Tinga' (CBeebies). 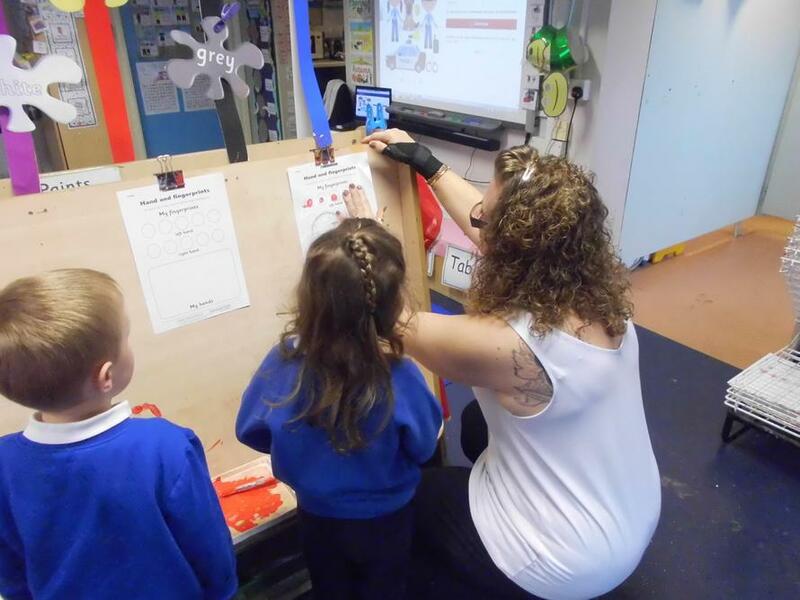 their children and looking at the work they had been doing in school. 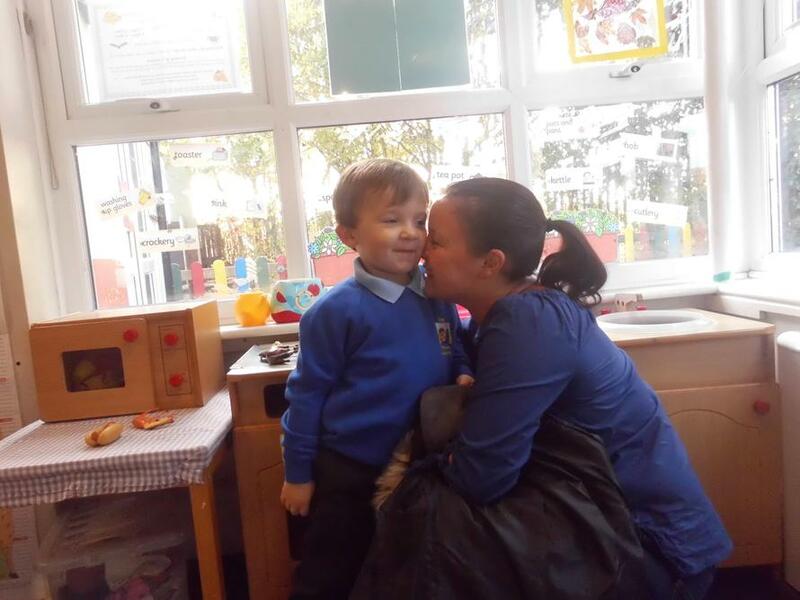 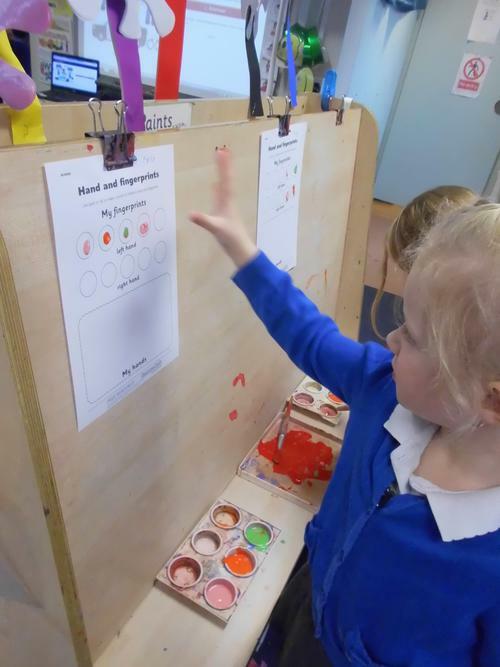 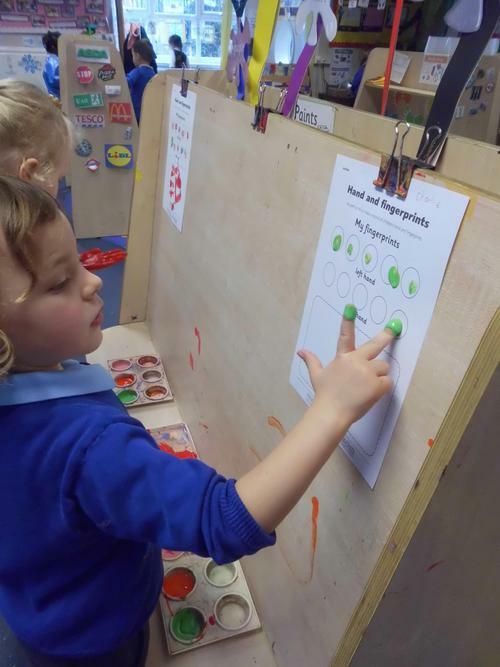 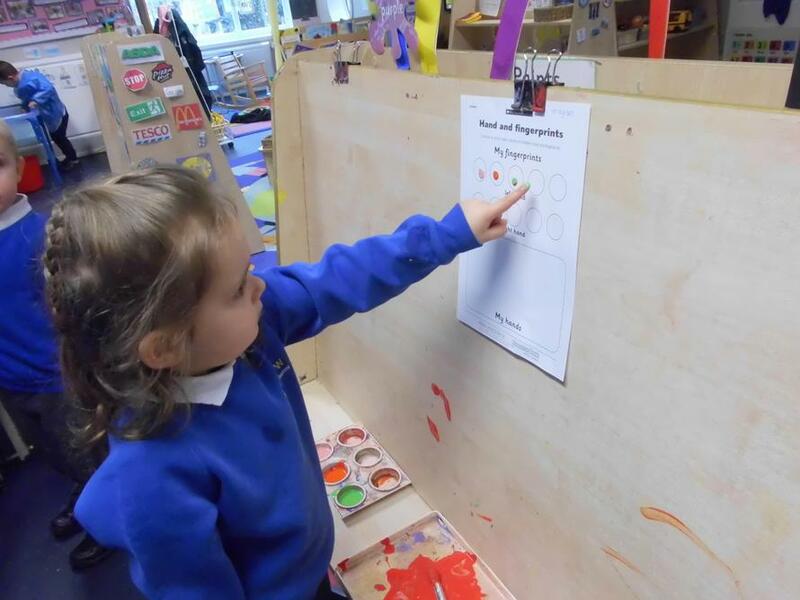 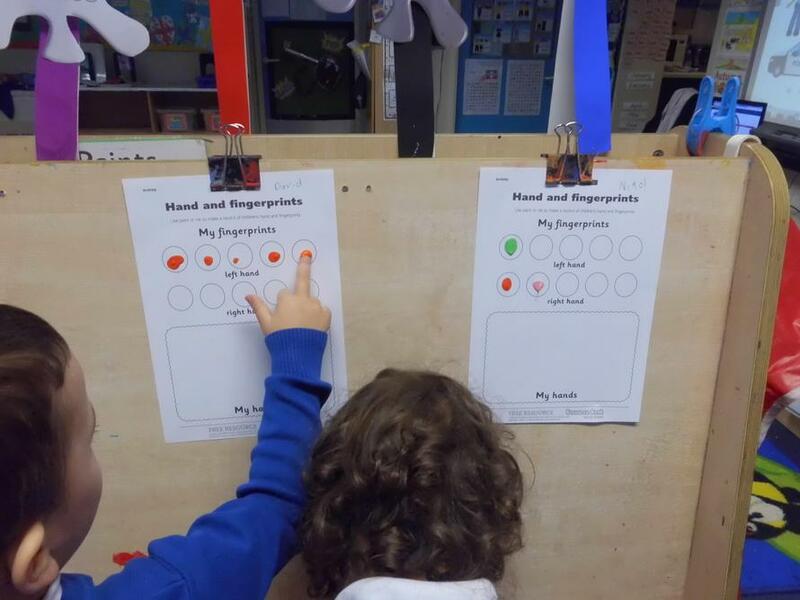 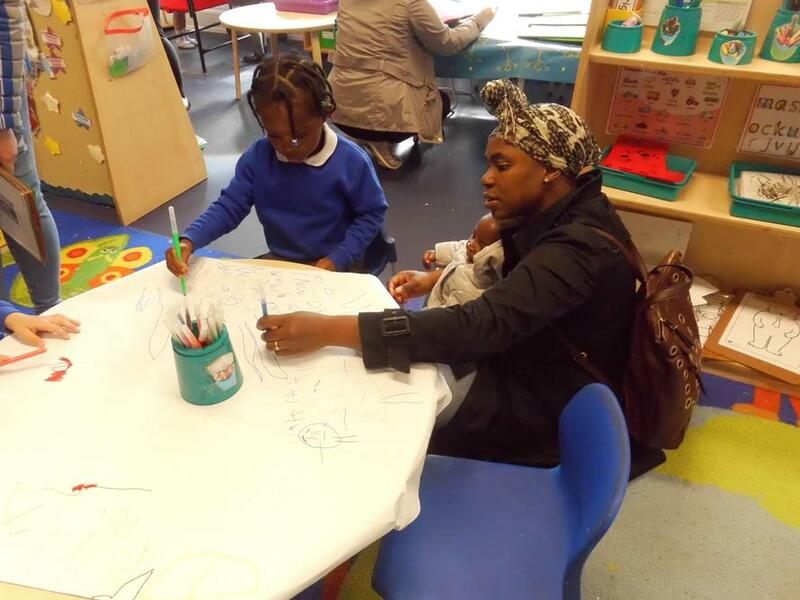 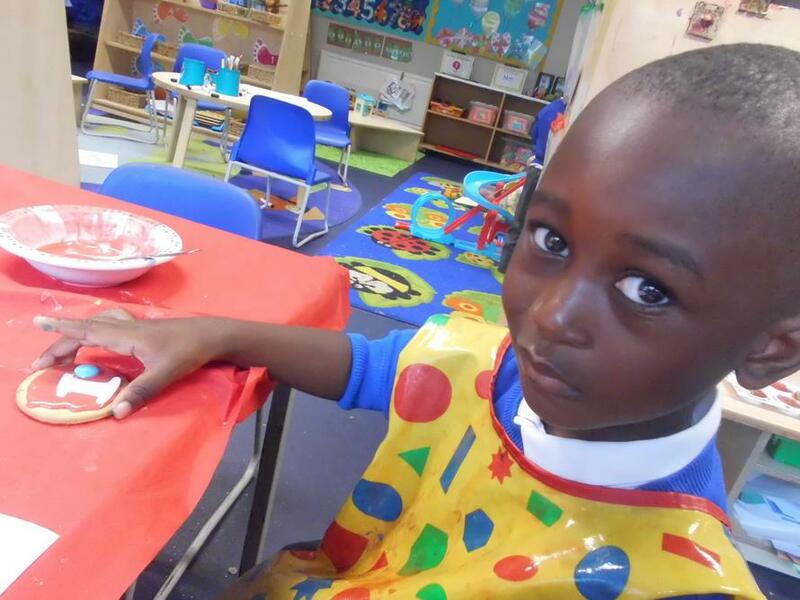 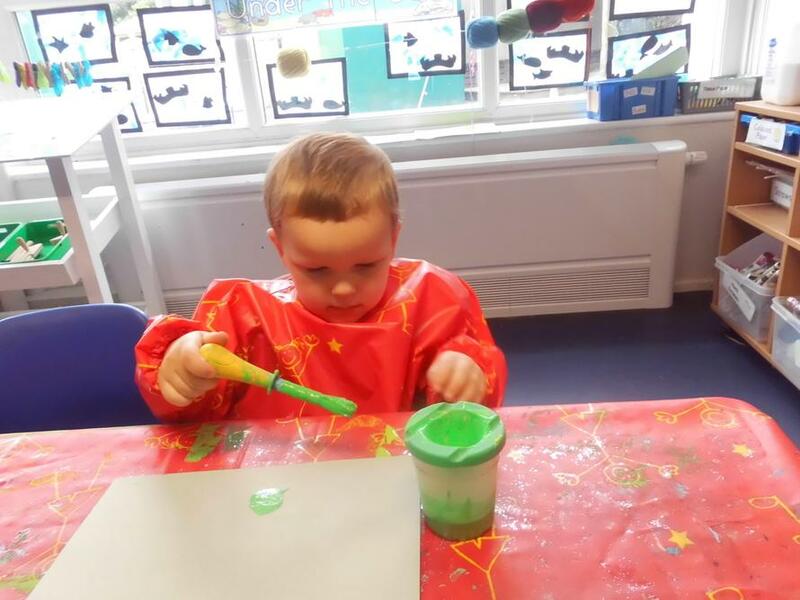 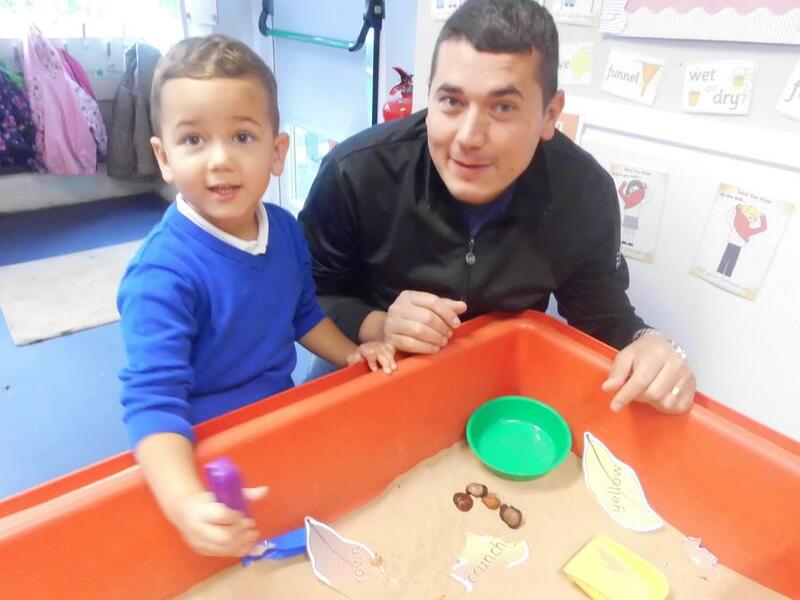 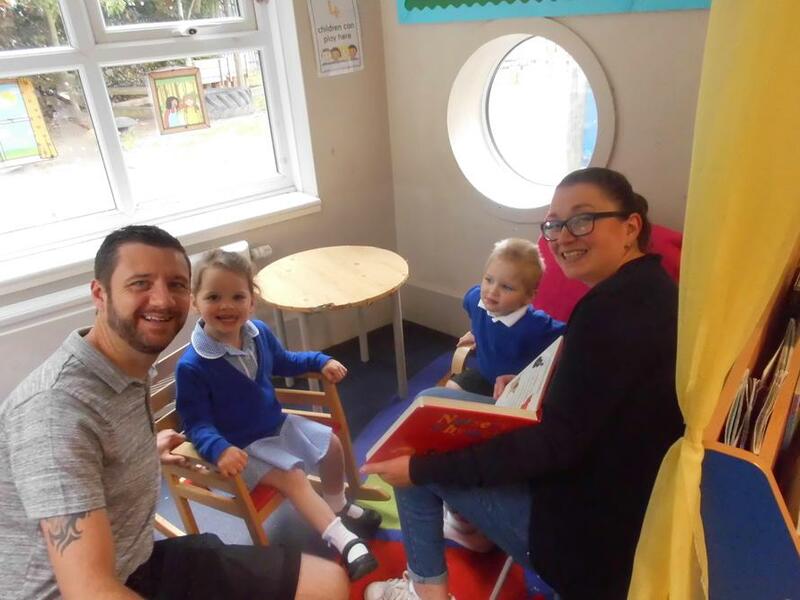 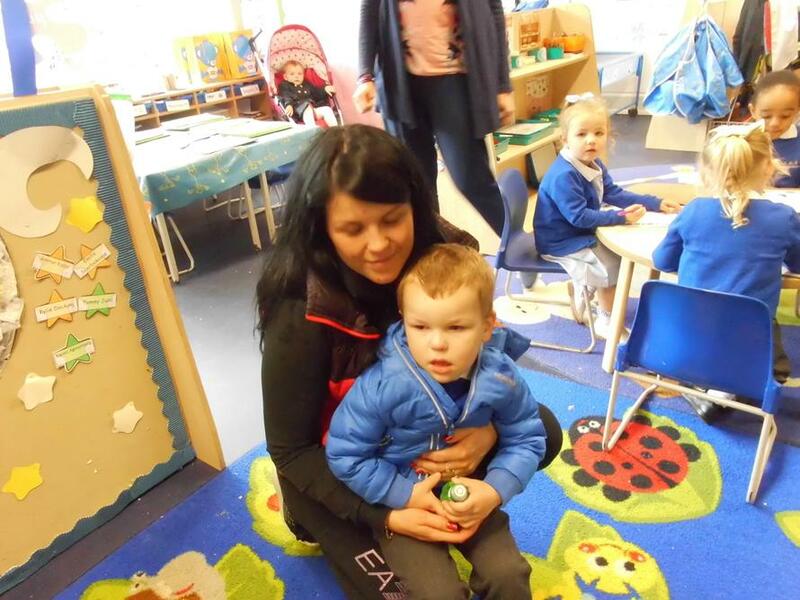 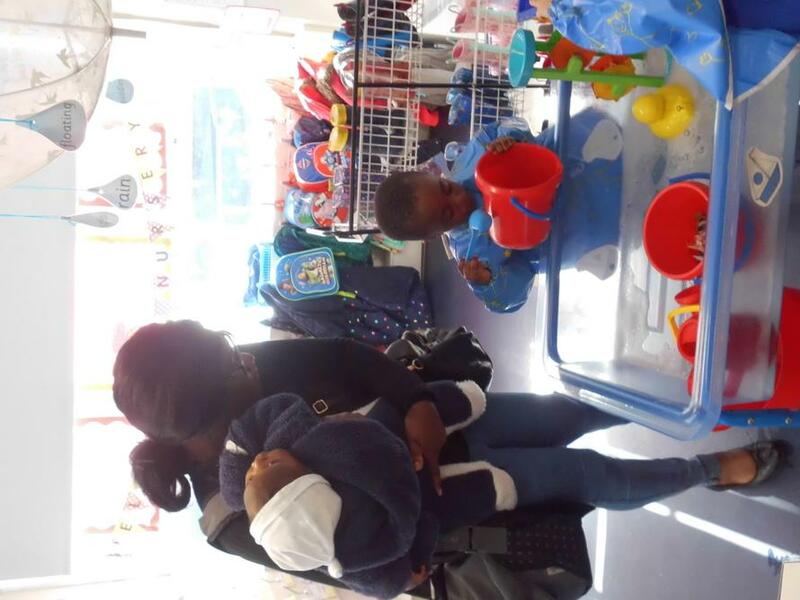 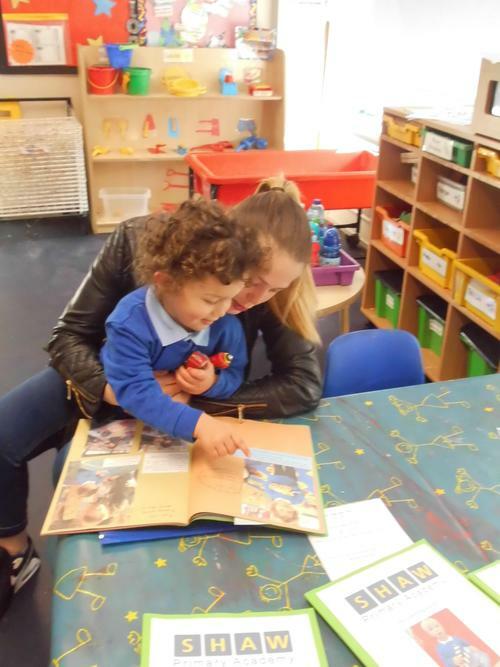 Feedback from the parents identified that they 'love to see how far their children have come since starting Nursery' and also 'like to see the activities they do each day'. 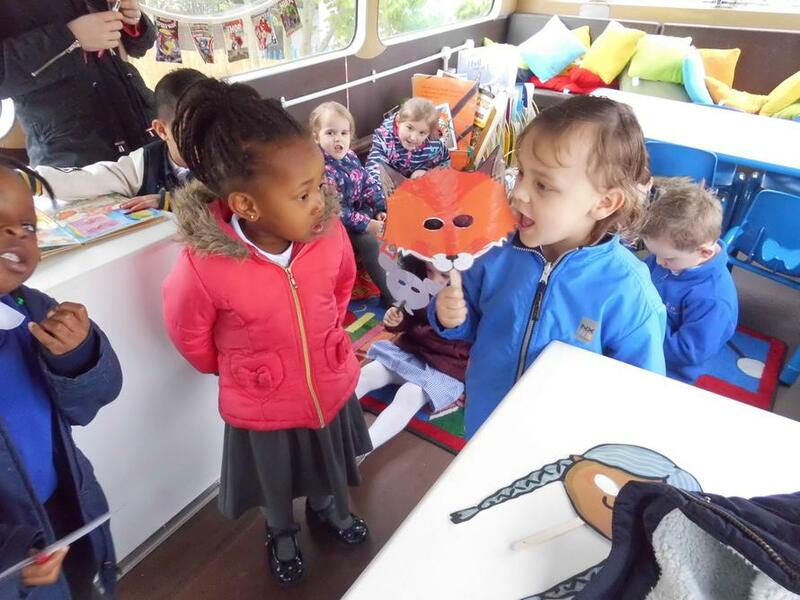 The children have loved the stories that we have read during our traditional tales topic and all of the activities planned around them. 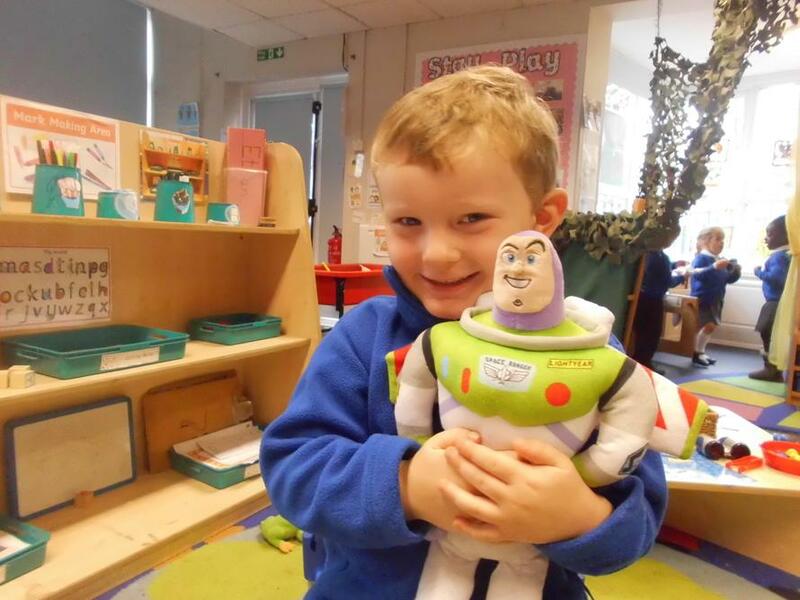 Welcome back to our final half term of the academic year! 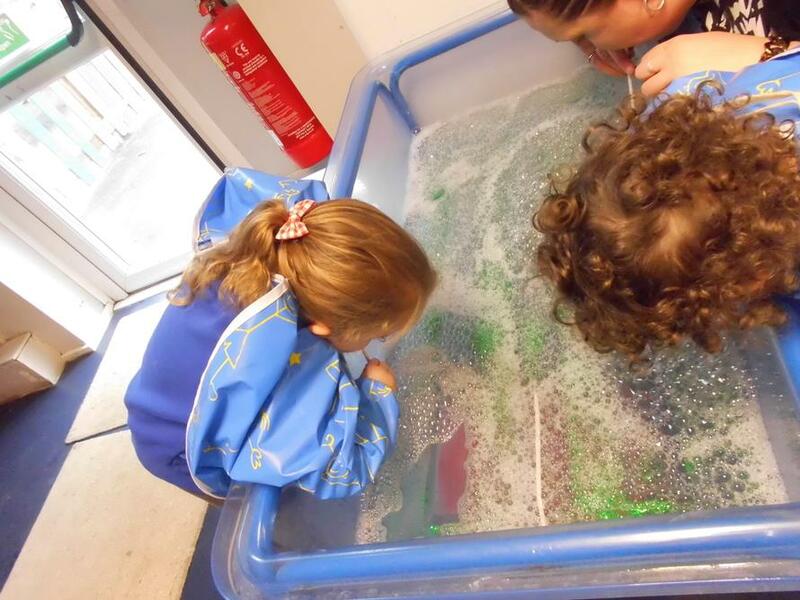 This half term our topic is 'Under the sea'! 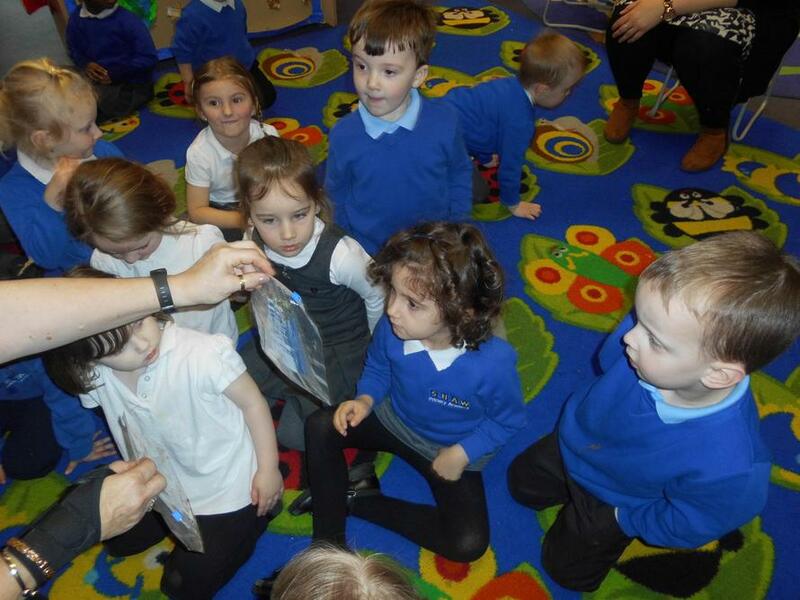 We will be learning about lots of different sea creatures and reading lots of books to help us find out more about them! 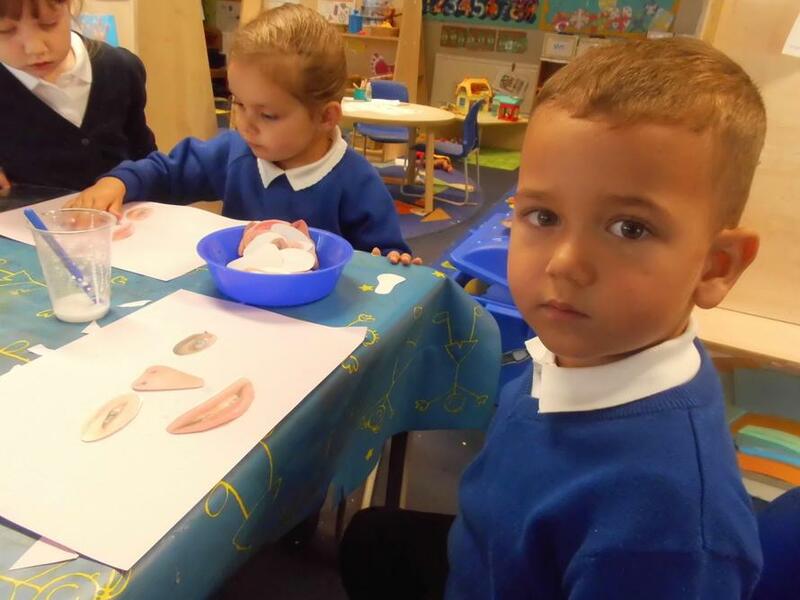 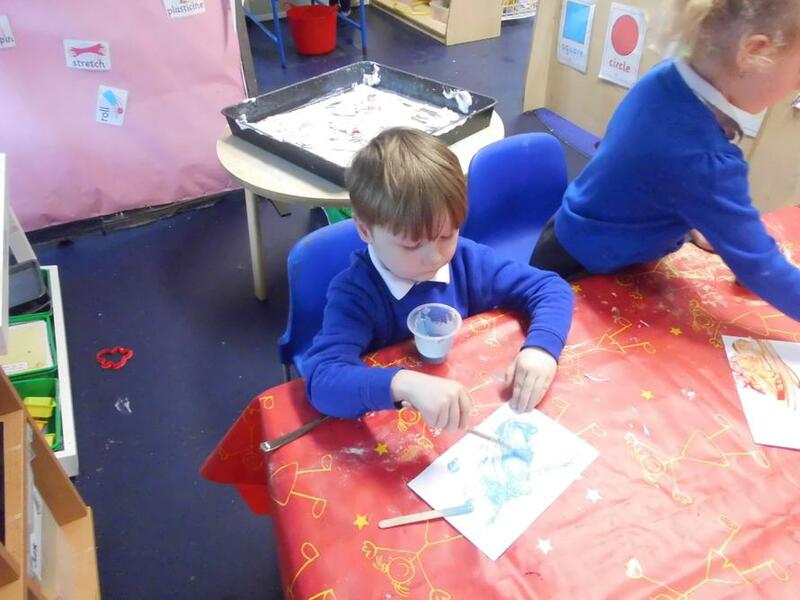 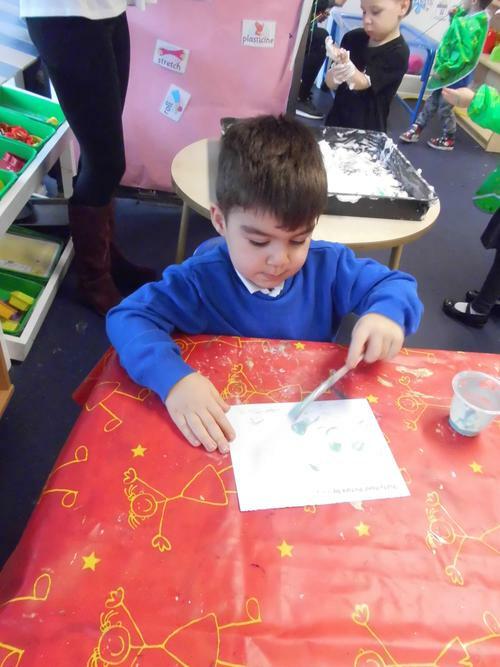 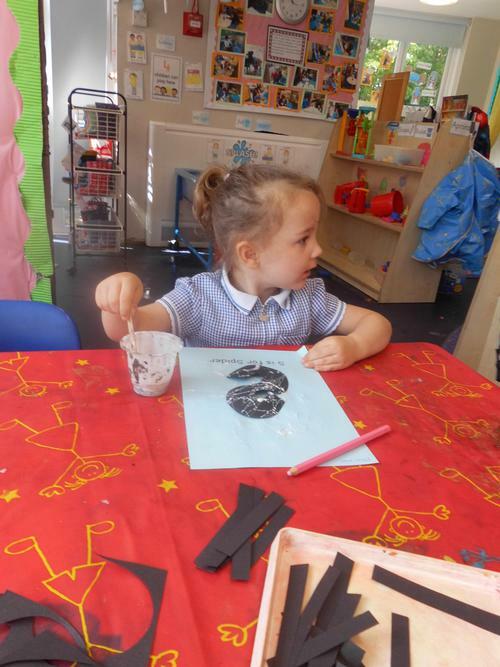 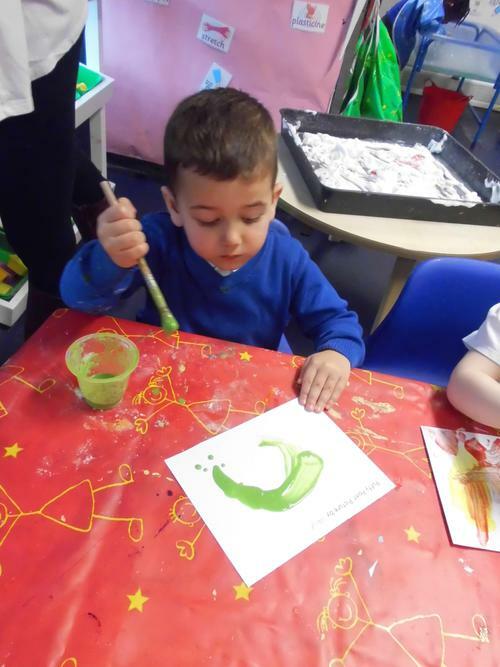 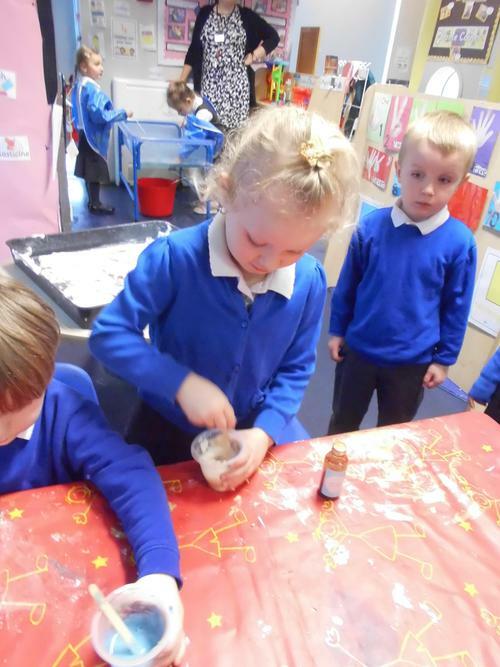 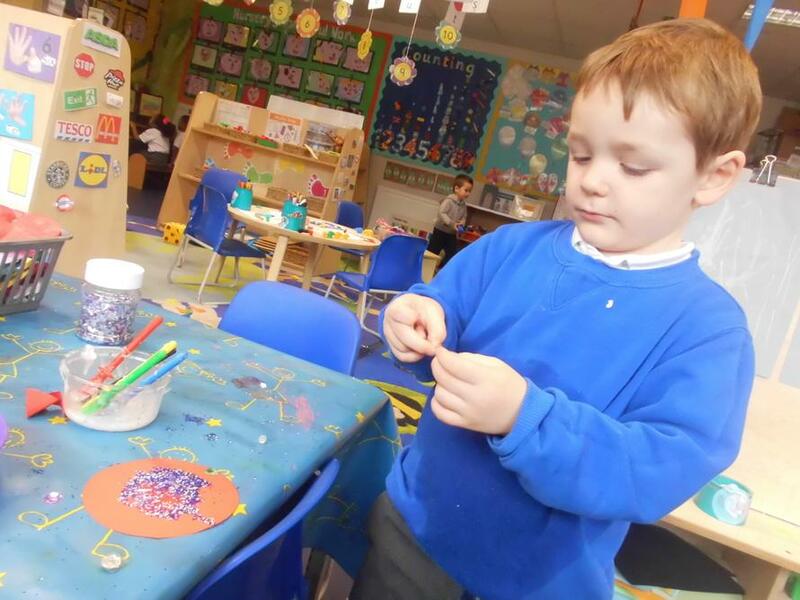 We have lots of creative activities planned for the children to use different media and materials to make sea creatures and experiment with different textures and patterns. 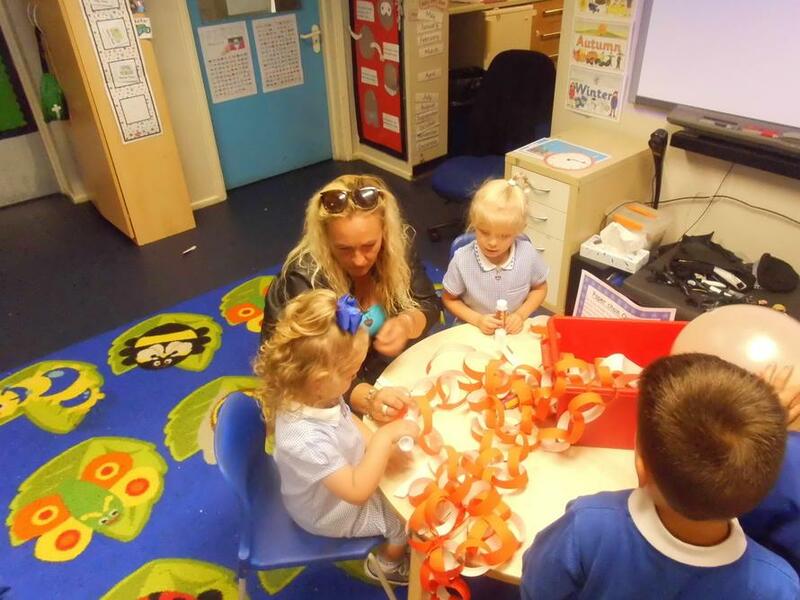 On Thursday 14th June the Nursery had their sports day! 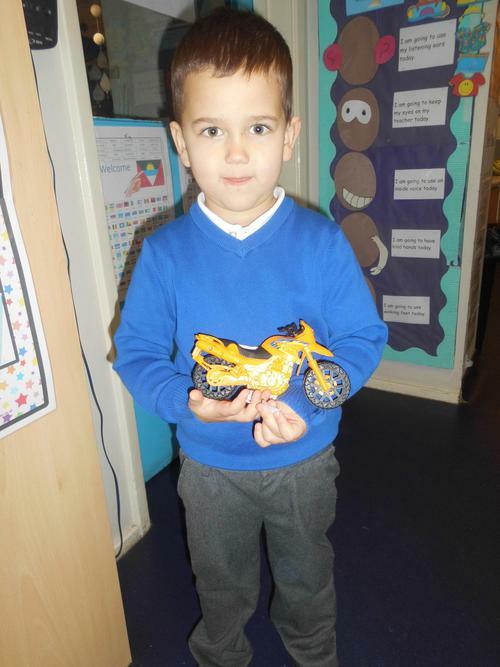 It was a very busy day but all of the children had lots of fun taking part in the different races! 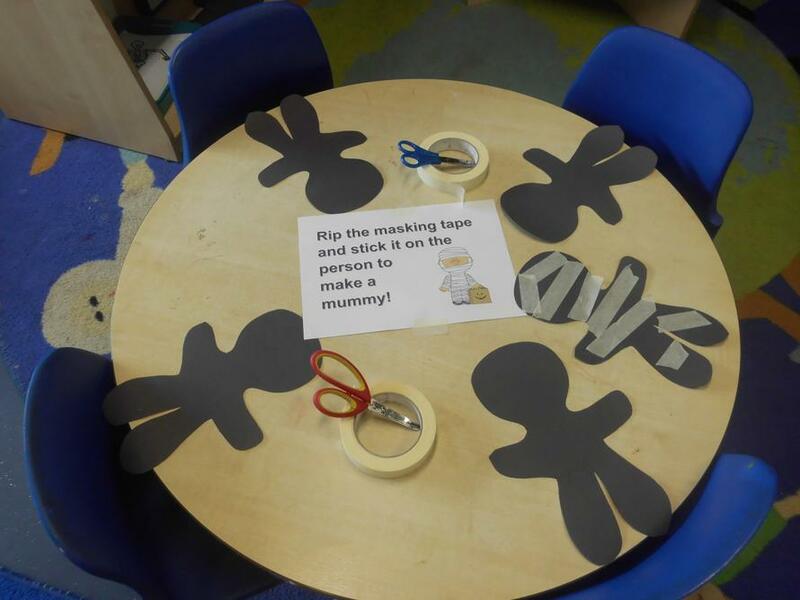 We had an egg and spoon race, a hula hoop relay race and a spiders leg race! 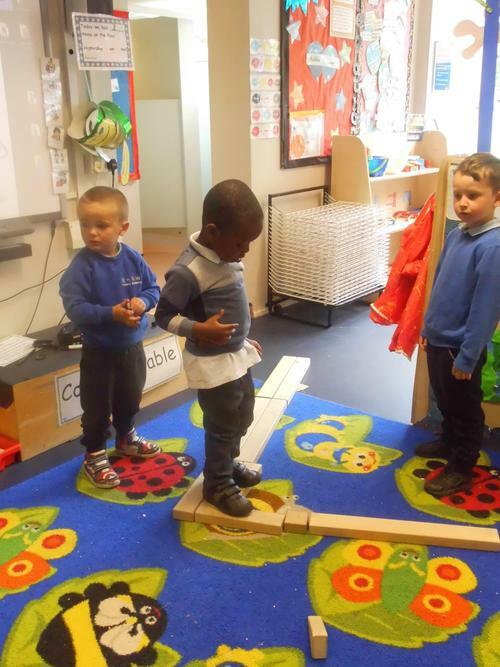 We saved the best race until last...the obstacle race! 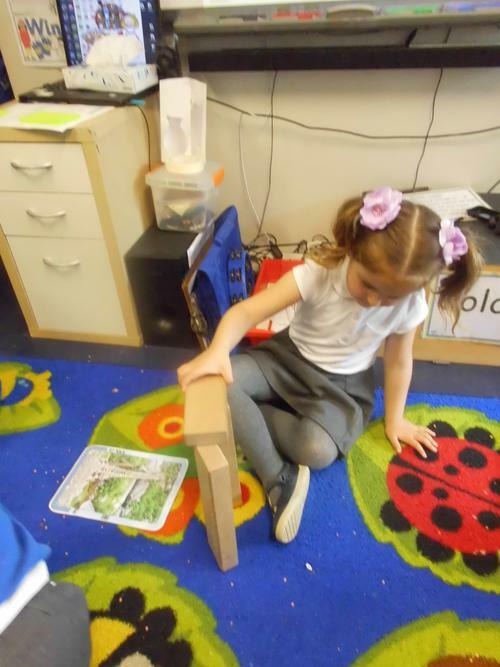 We had to balance over the bench, collect the bug and put it into the bucket and then crawl through the tunnel. 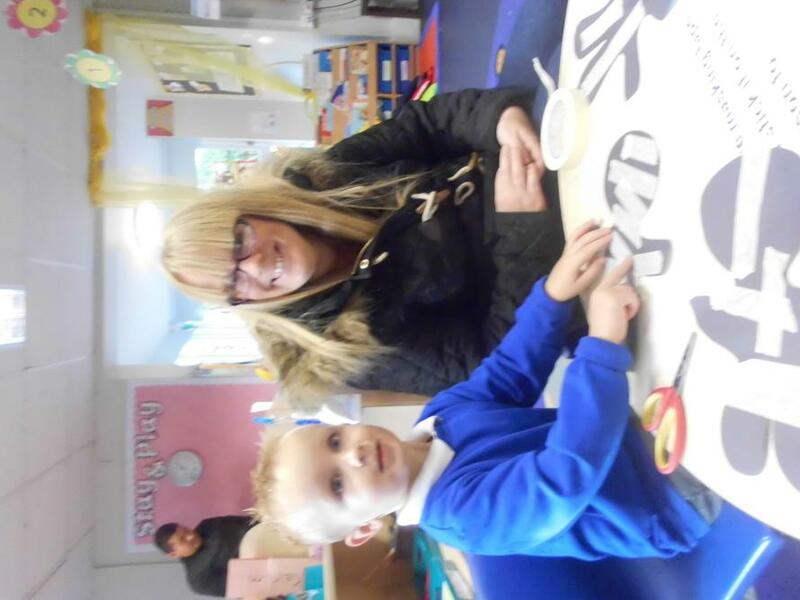 The parent had a go too, it was such fun to watch! 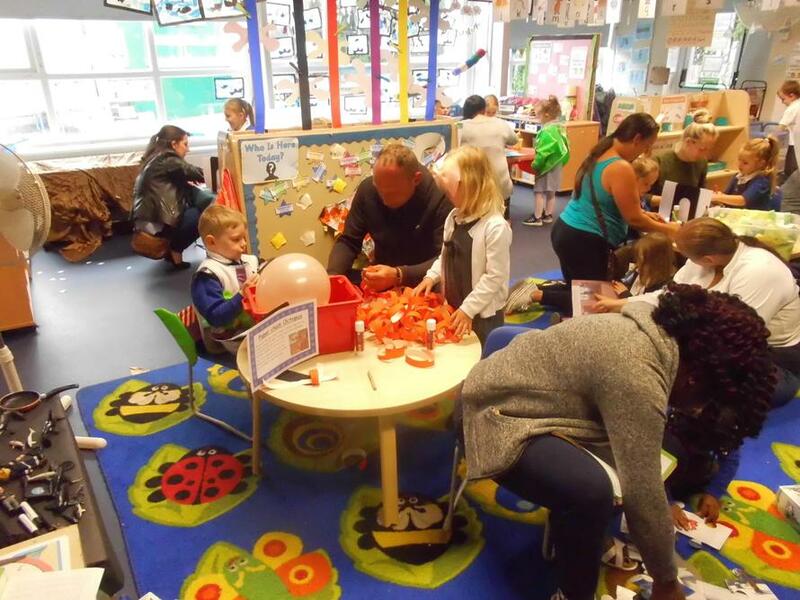 and everyone god a sticker and certificate for taking part, including the parents! 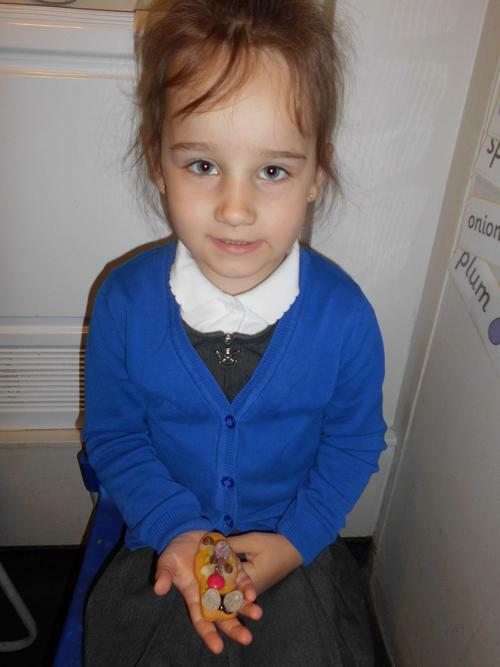 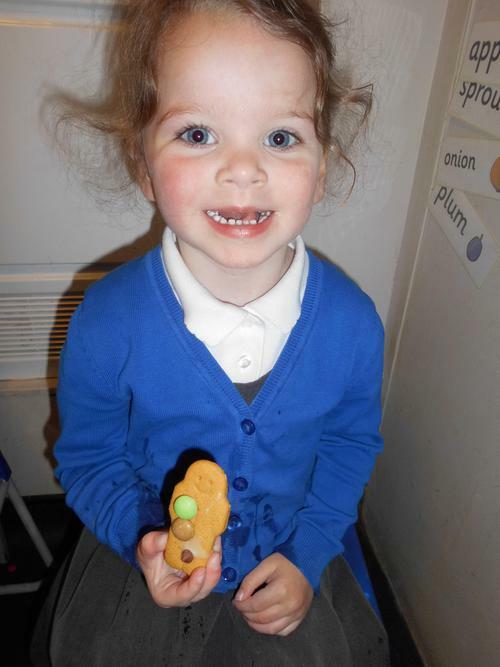 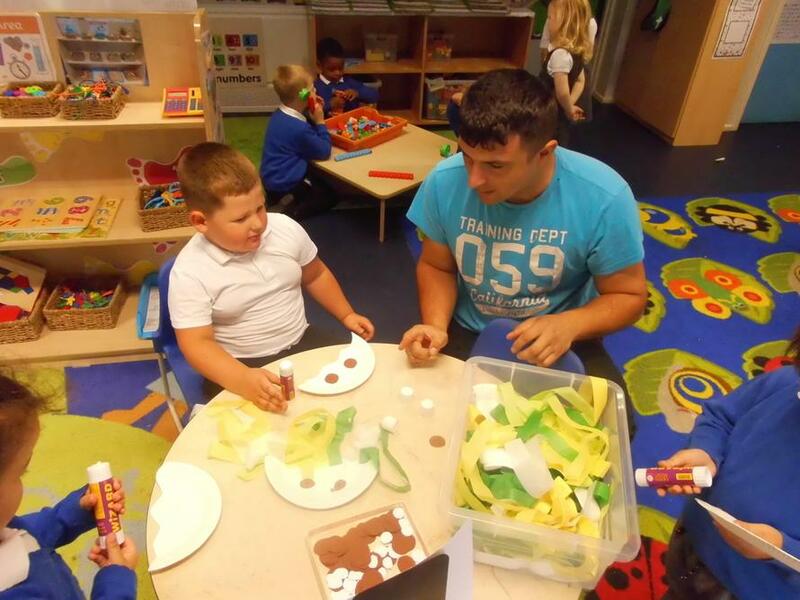 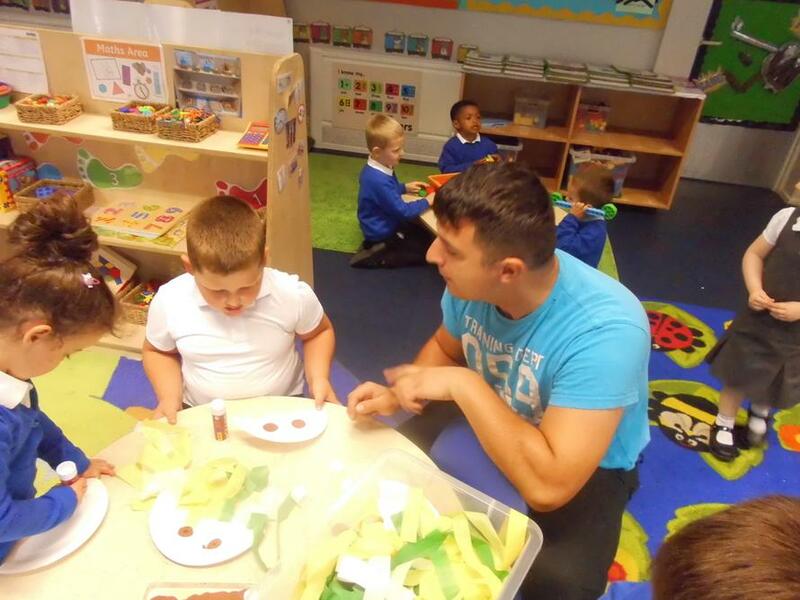 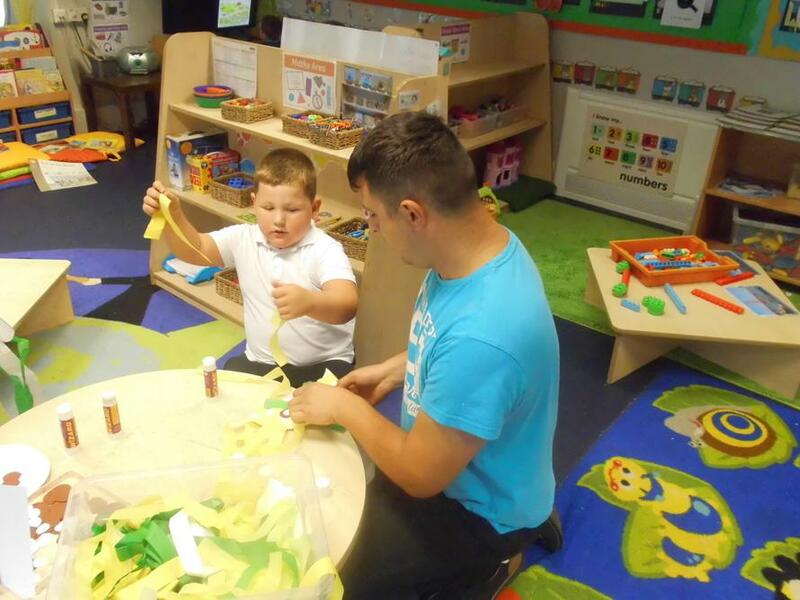 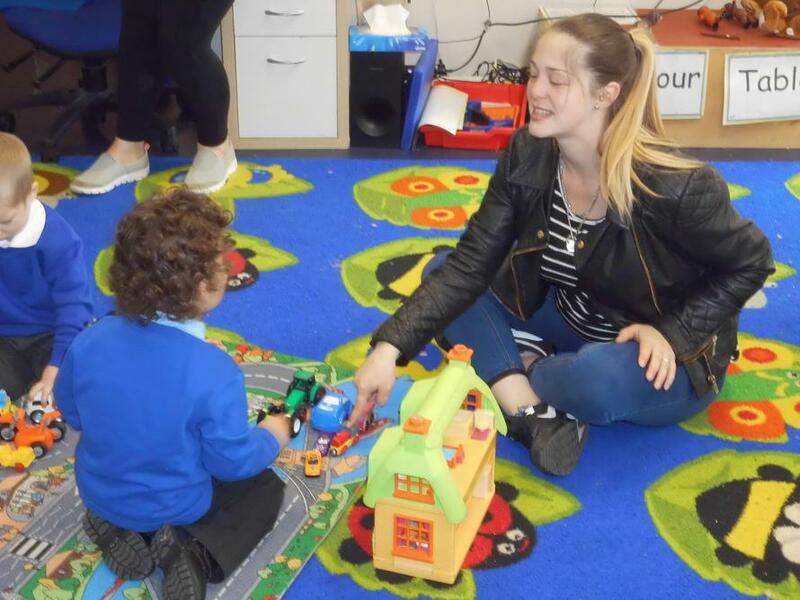 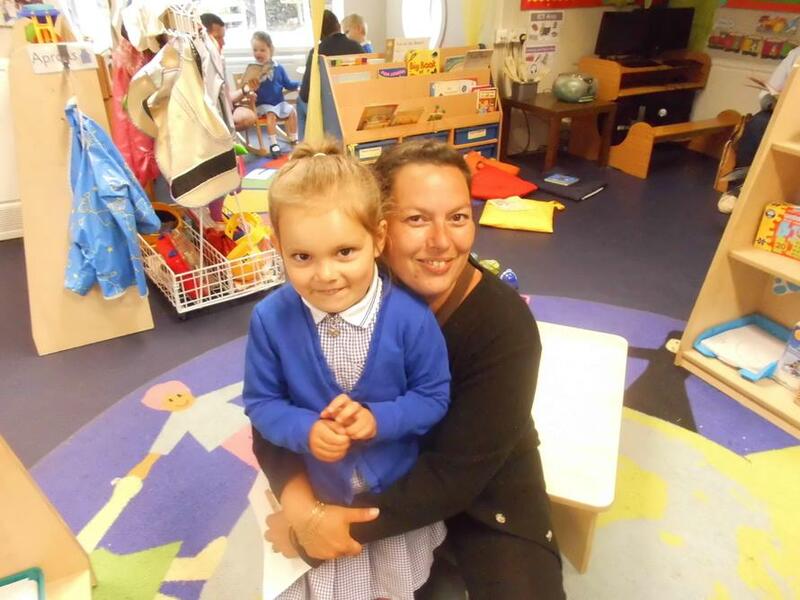 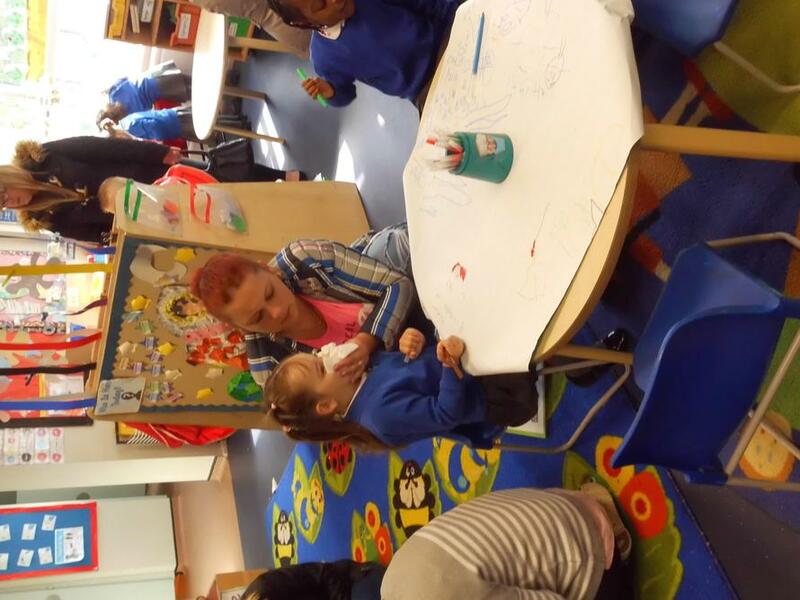 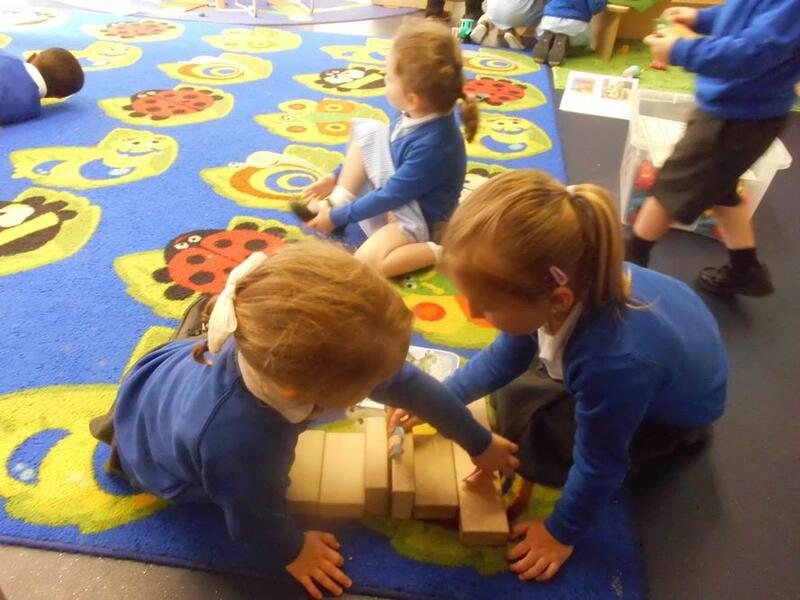 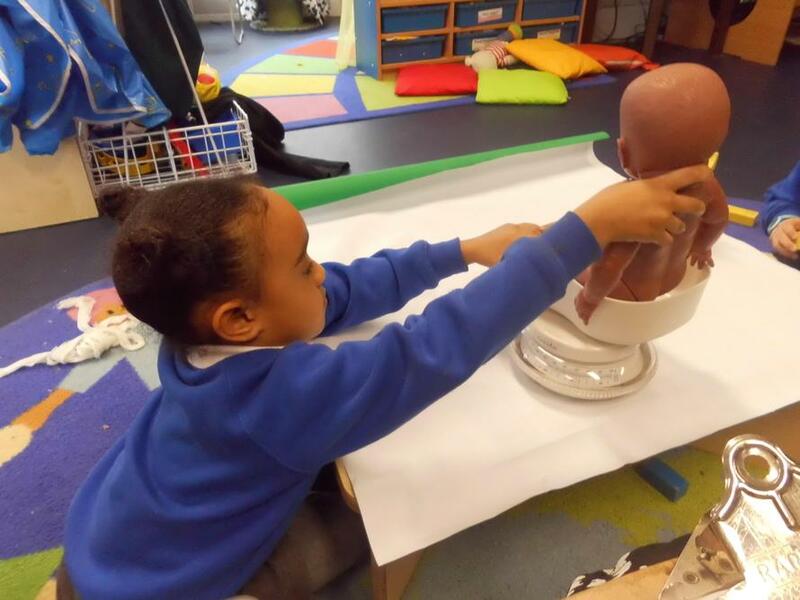 On Tuesday 12th June, EYFS had a 'stay and Play session. 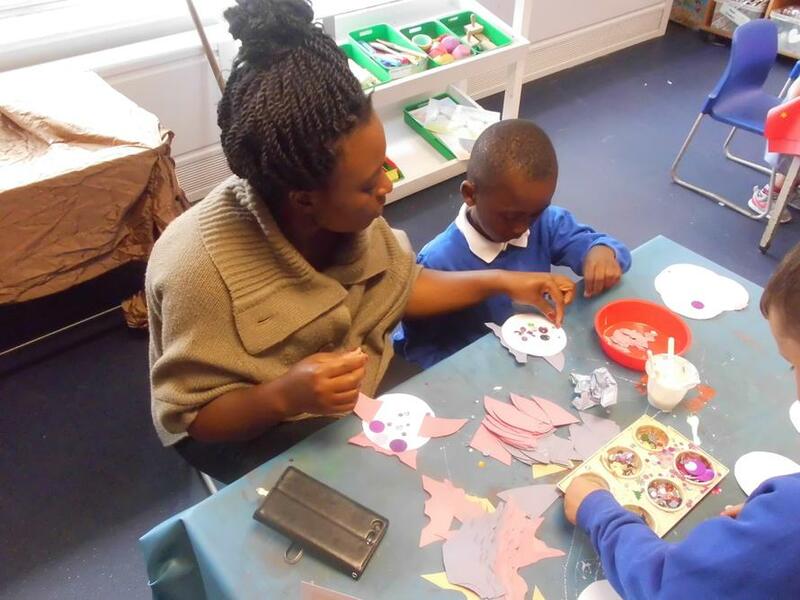 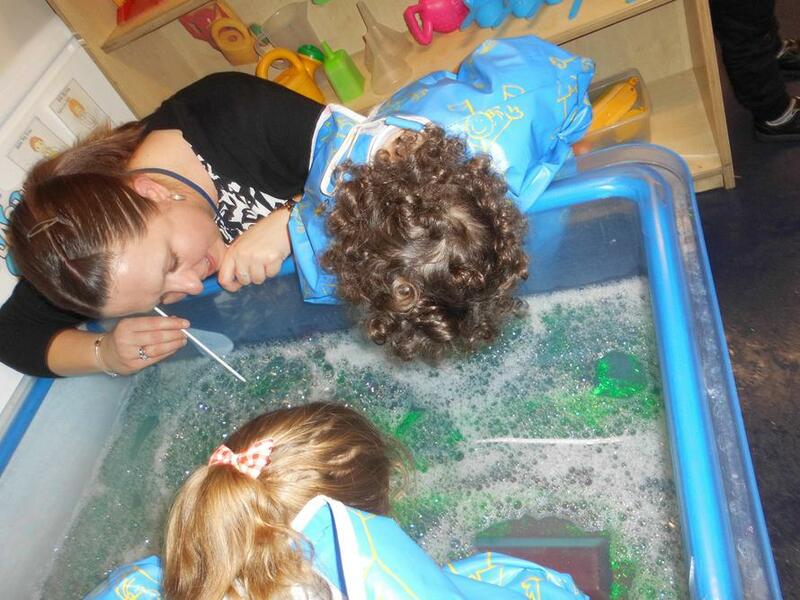 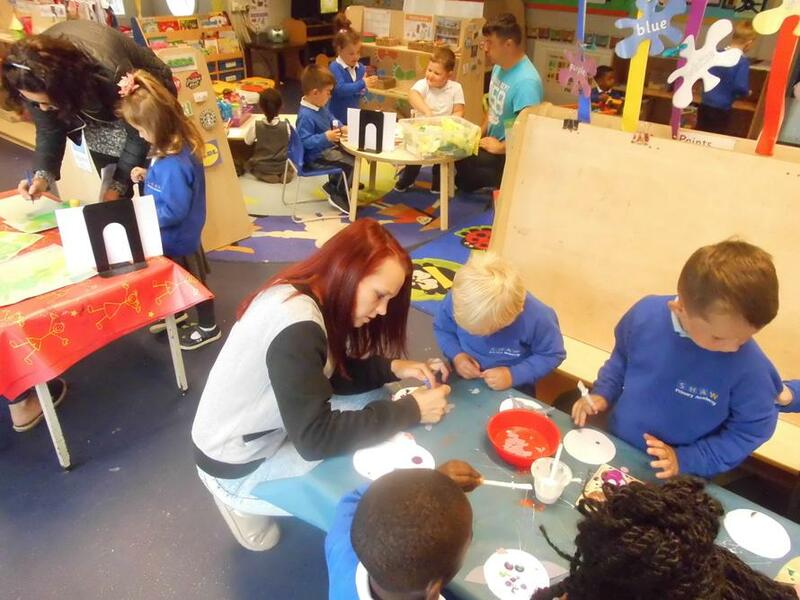 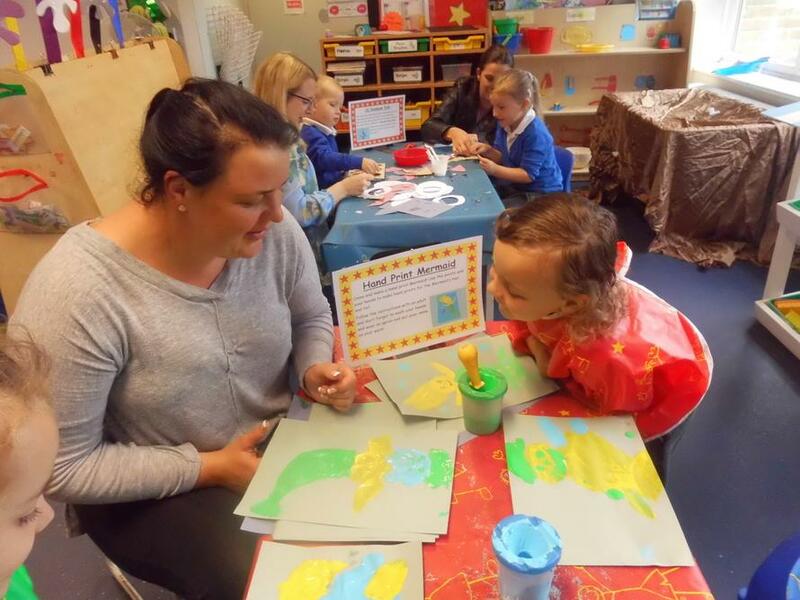 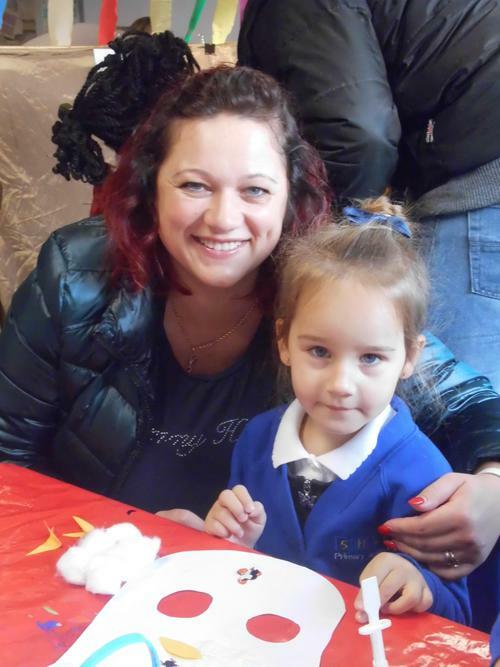 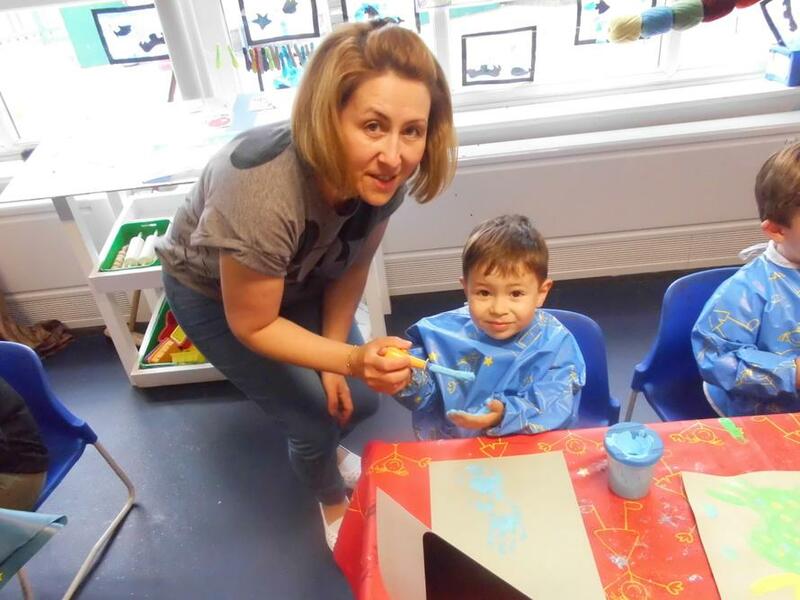 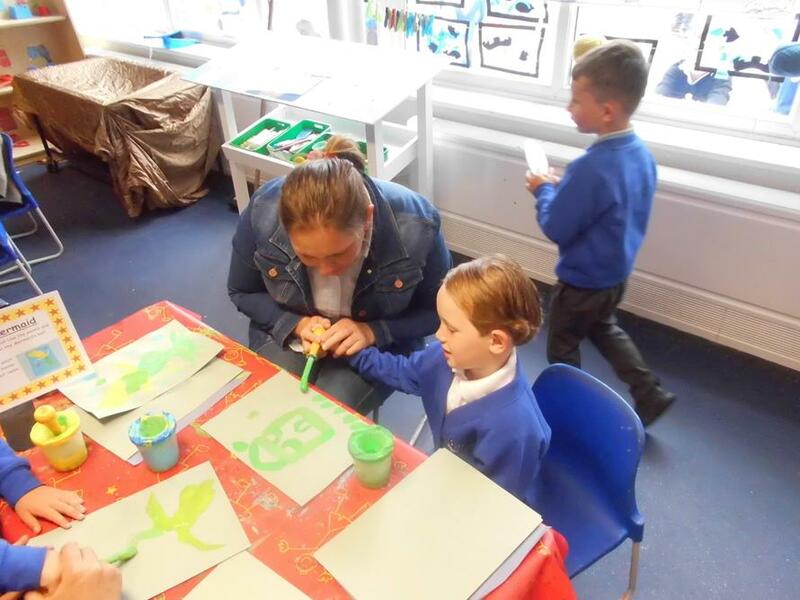 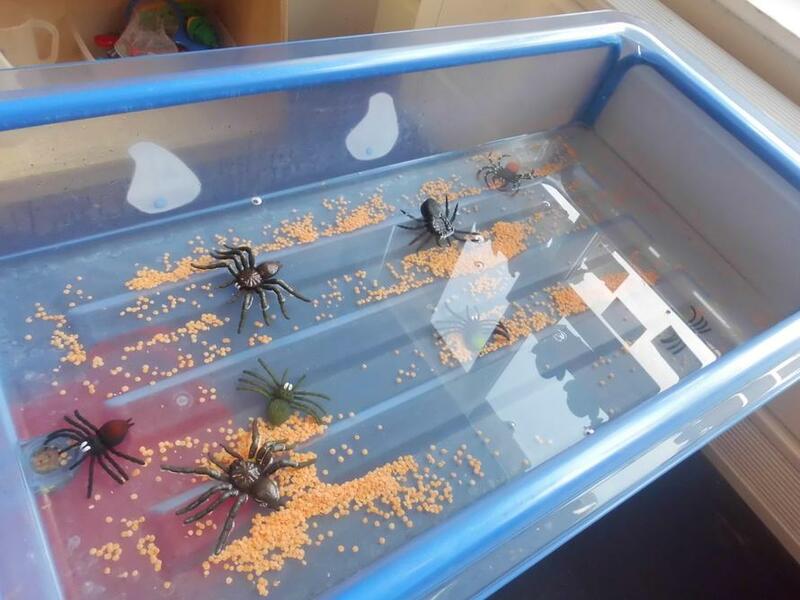 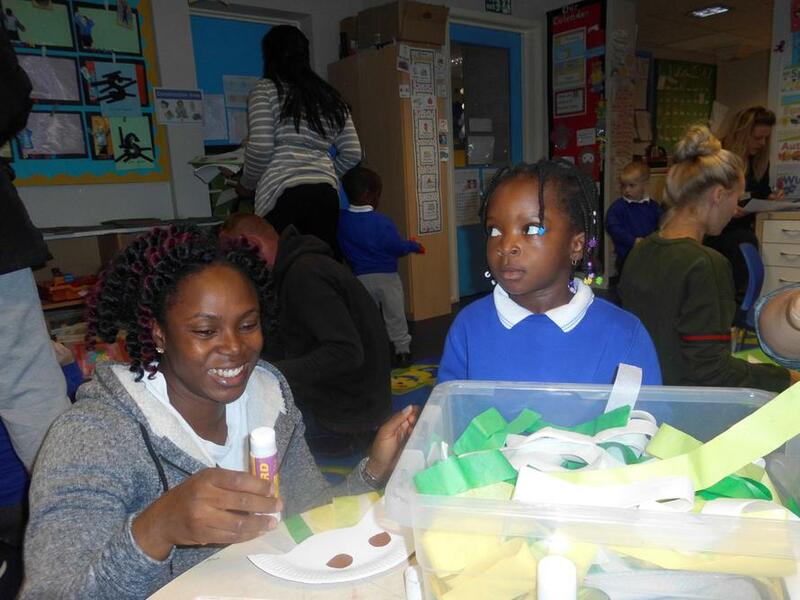 The children's parents were invited in to take part in lots of sea creature themed activities. 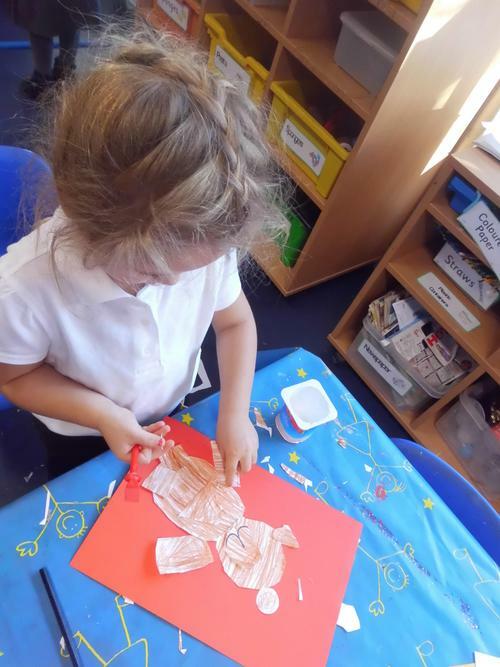 We were making paper chains for our Octopus legs, paper plate jelly fish with tissue paper and other materials, mermaid hand printing and Rainbow fish with jewels and other shiny resources!